Hands variously employed storing Lyddite, cleaning ship, etc. 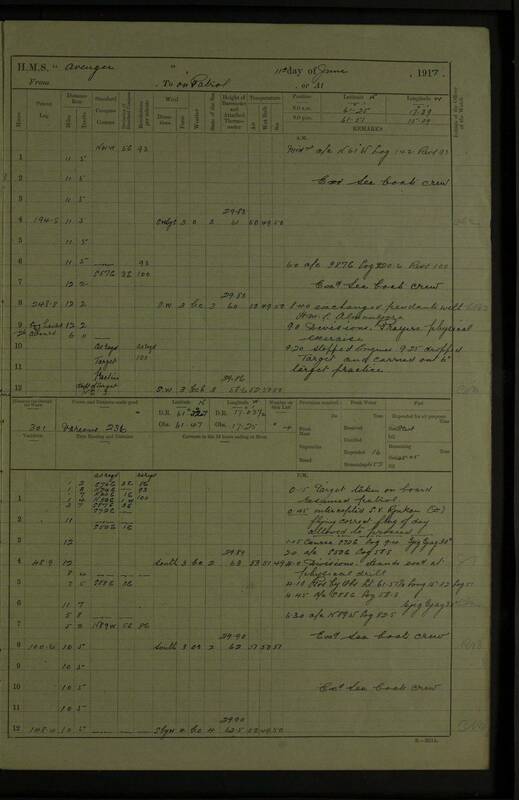 Hands cleaning ship, testing torpedoes, etc. 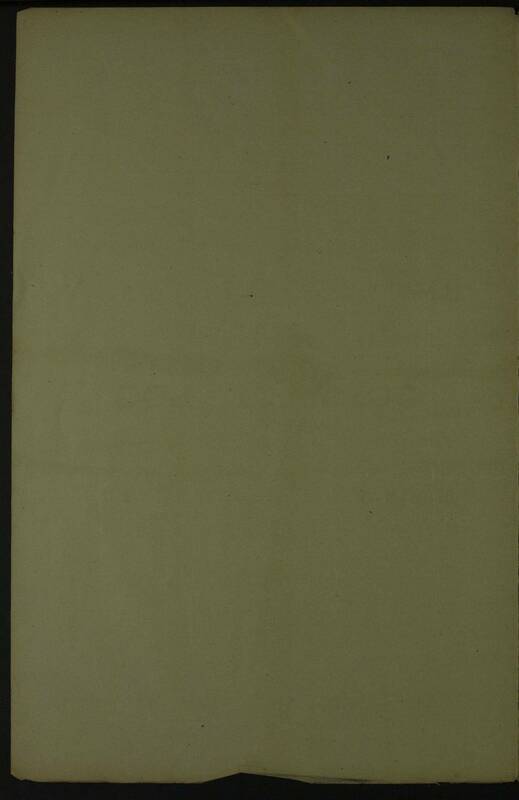 Mordeiro Bay Sal Isd. 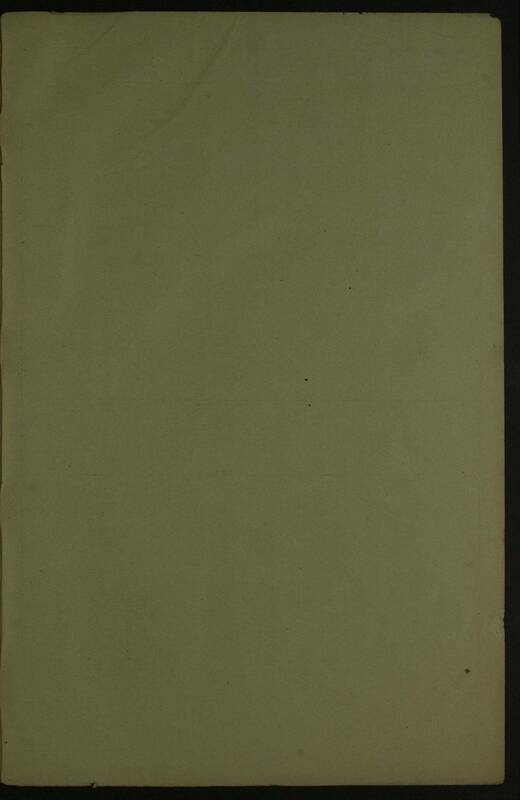 C.V.
Mordeiro Bay. Sal Isd. C.V.
5.0pm Bridge steering gear out of order, steered from aft. 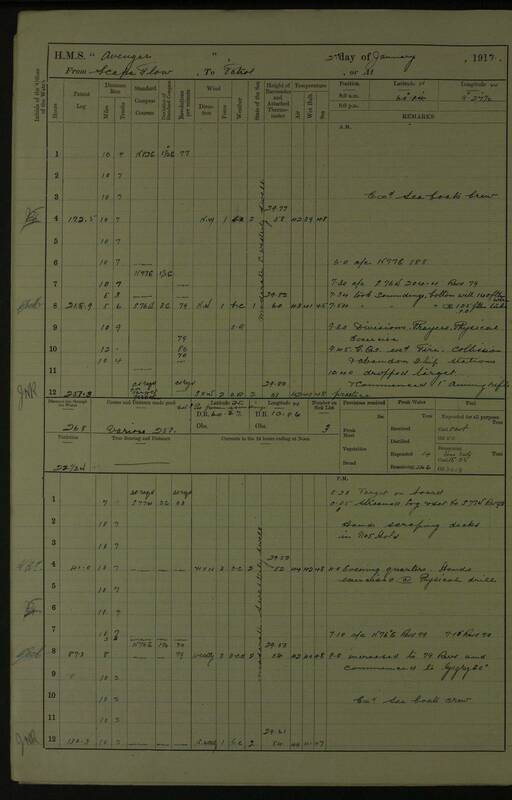 4.0pm Landed armed search party of R.M. 12.0am Signalled SS “Amicus” Savona to Portland, M.
1.45pm Signalled Spanish SS “Geronimo” Aviles to Norfolk V.A. 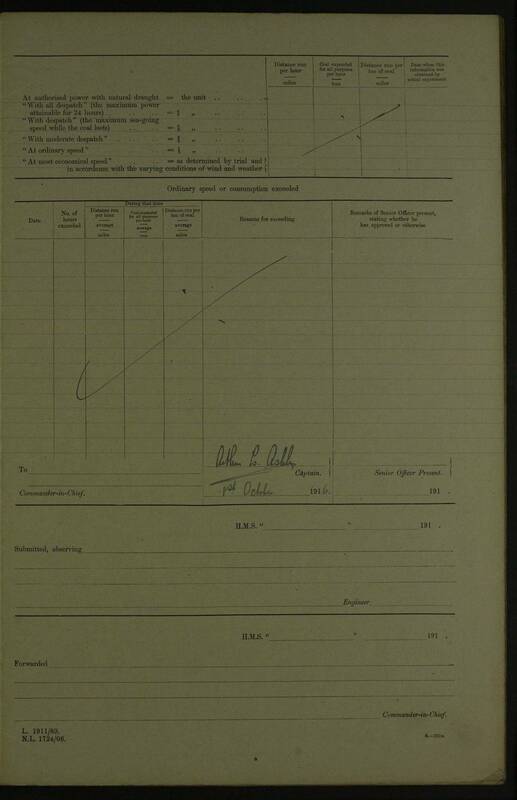 3.10pm Port Engine running 120 Revs. 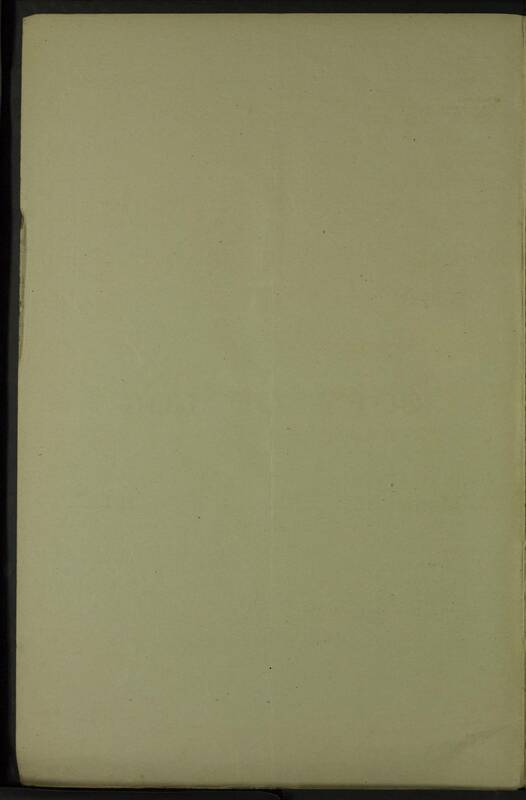 Hands washing and paining and cleaning out magazines and shell rooms, etc. 9:30am Captain’s inspection of lower decks etc. 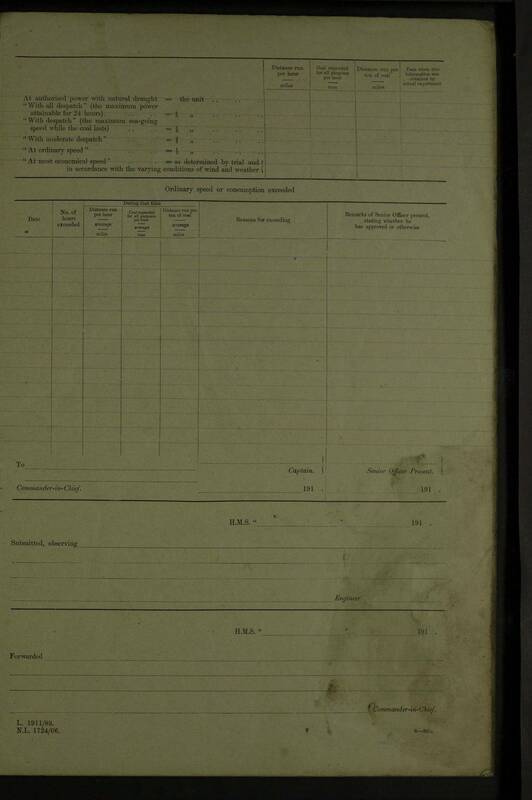 Boys instructed 6” gun dismounting, etc. 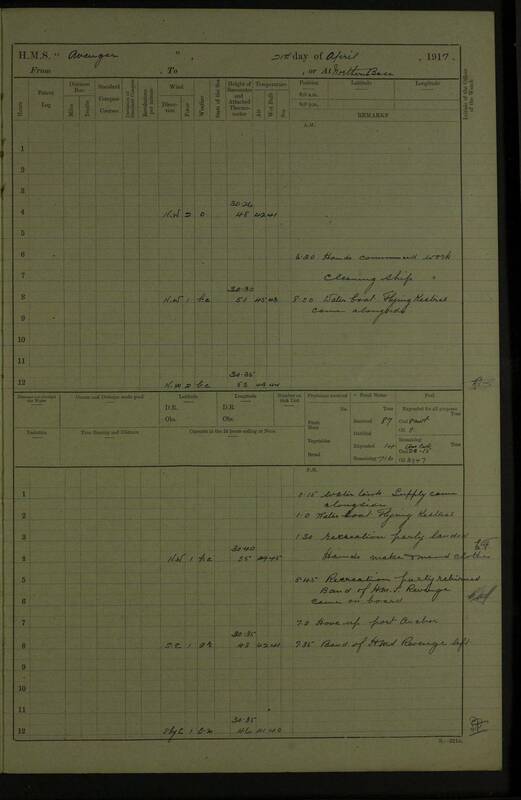 Hands employed for cleaning and painting of shell rooms and gun covers etc. 9.0am Hands cleaning guns, making boat fenders, blacking rigging, cleaning boat davit screws, etc. 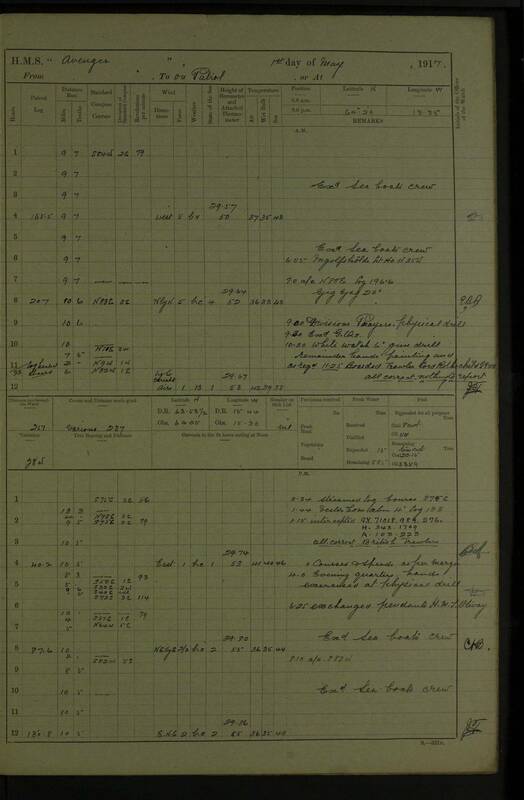 9.30am Inspection of ship’s company lower decks, etc. 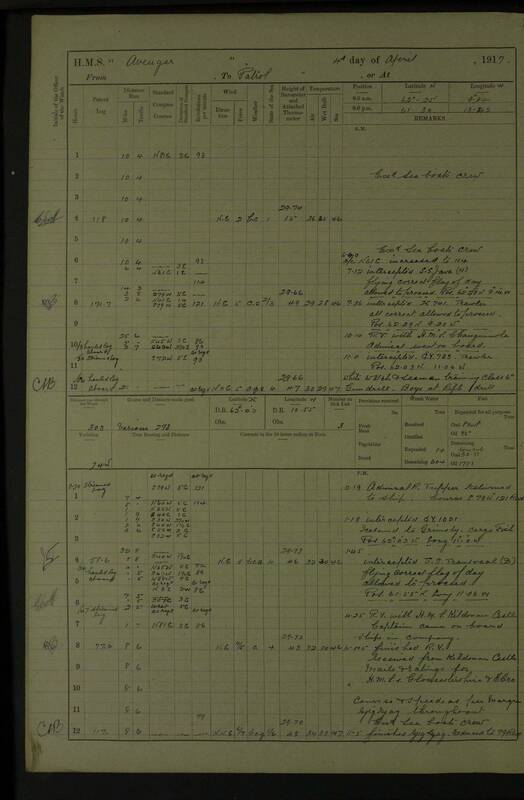 Hands refitting, painting holds, etc. 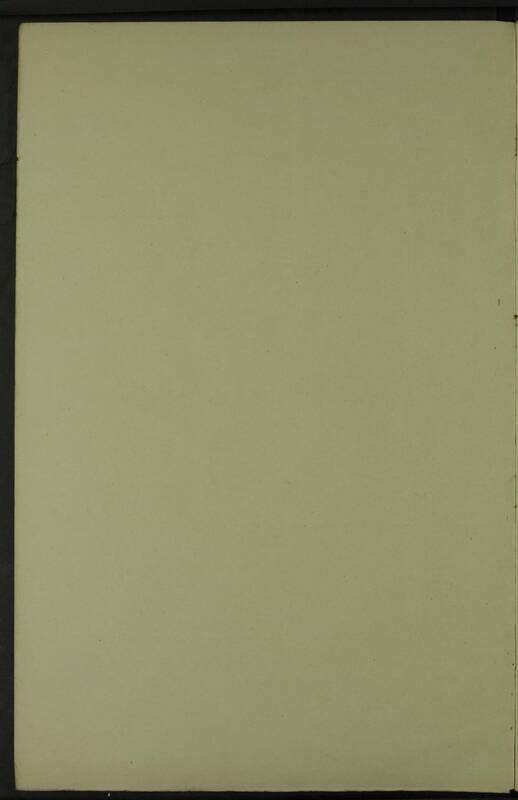 The following items of stores were surveyed and found condemned as unfit for consumption: 134 lbs. 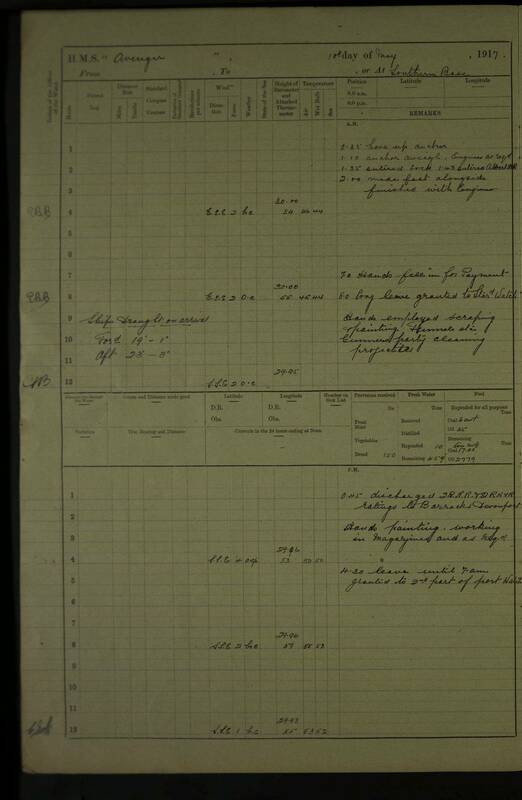 sausages; 224 lbs. 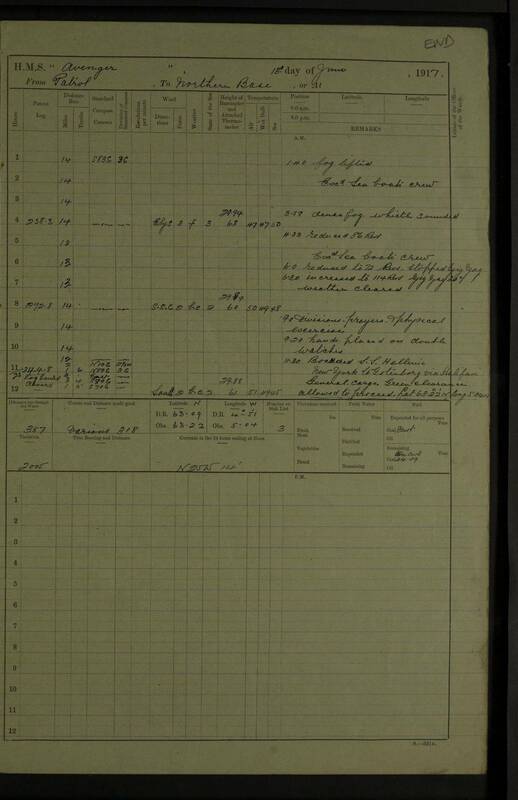 Biscuits (ship); 24 lbs. 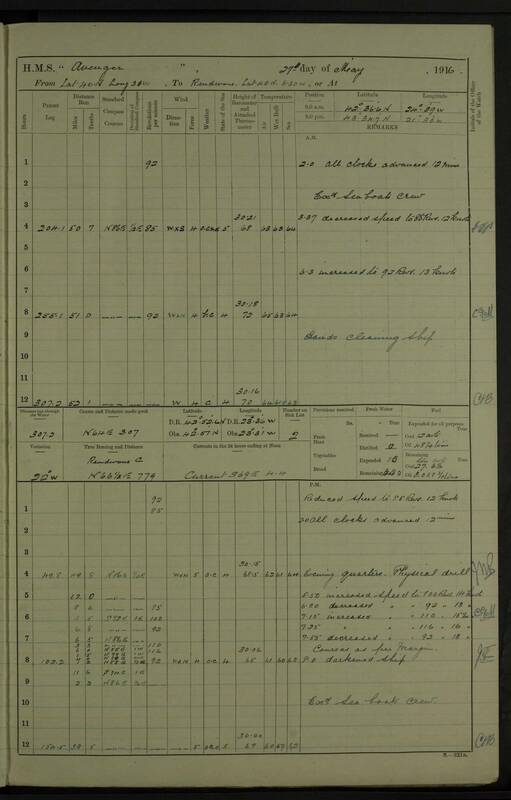 Corned beef; 8 tins milk (condensed). 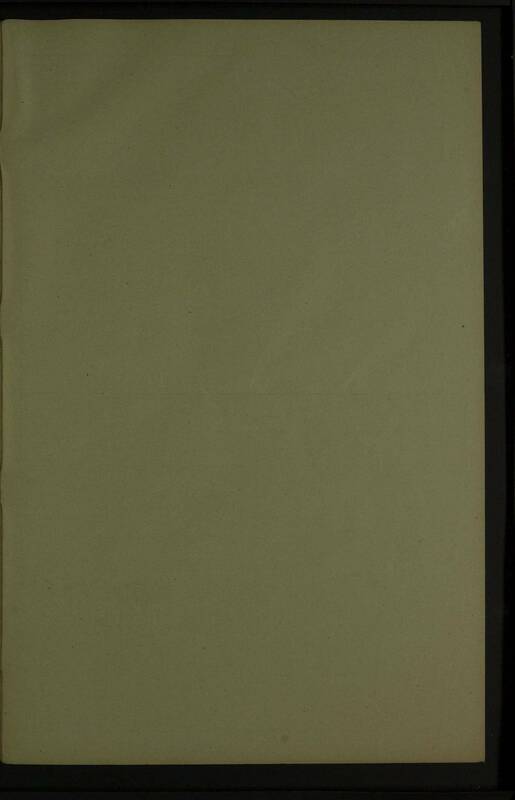 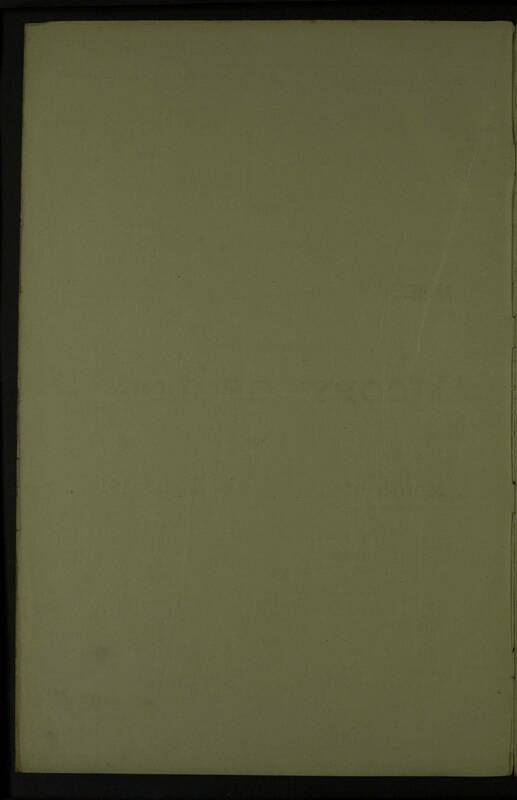 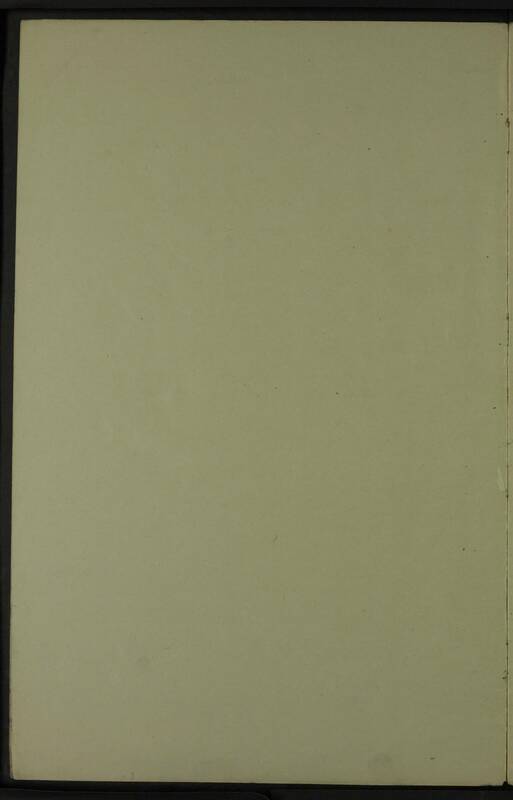 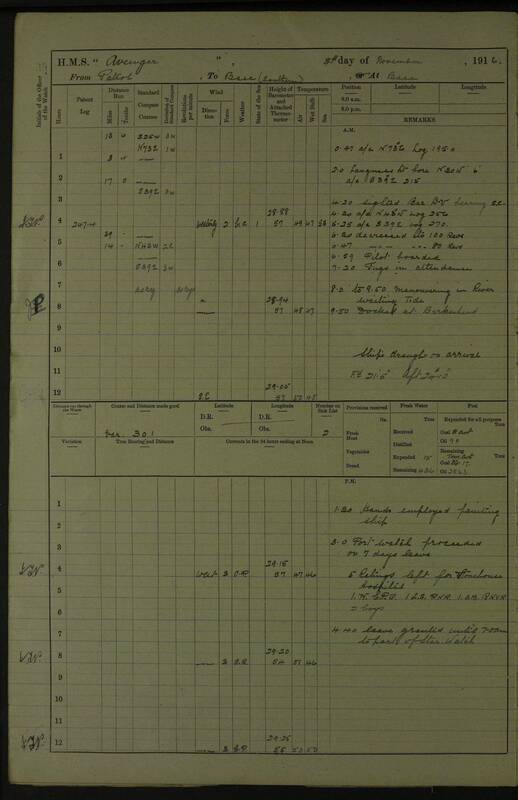 10.40am Boarded SV “Lawily” (N) Iceland to Barcelona; cargo, fish; sent to Stornoway with armed guard; Midshipman James. 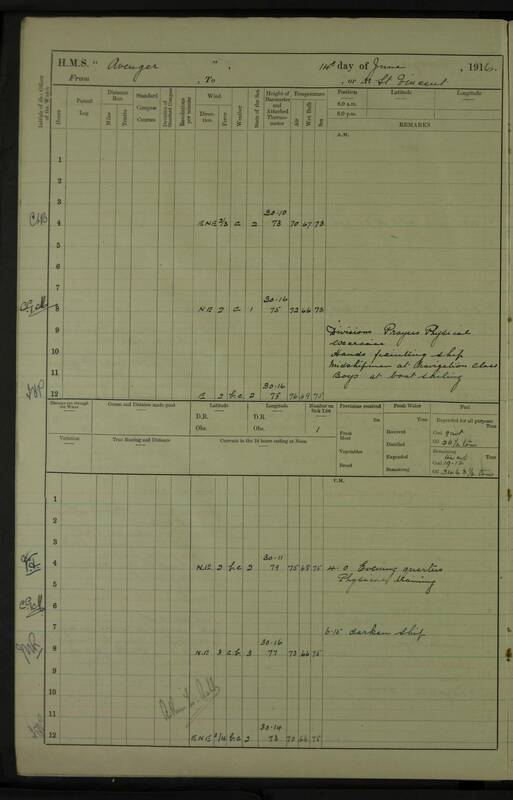 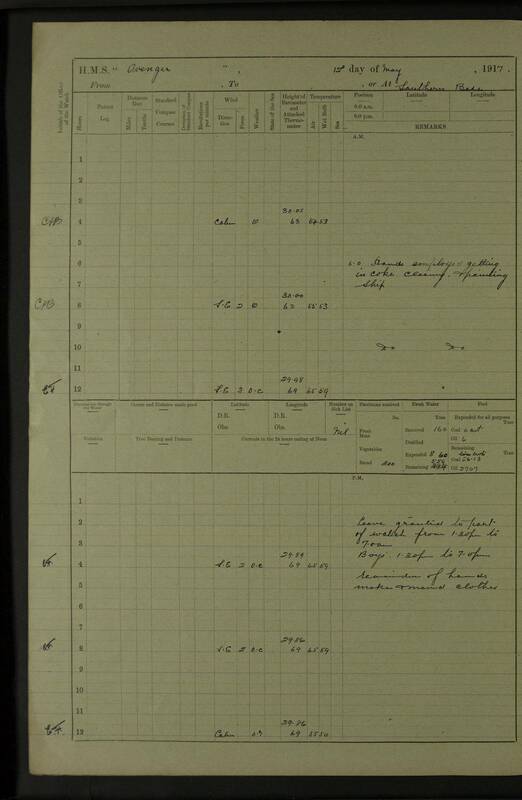 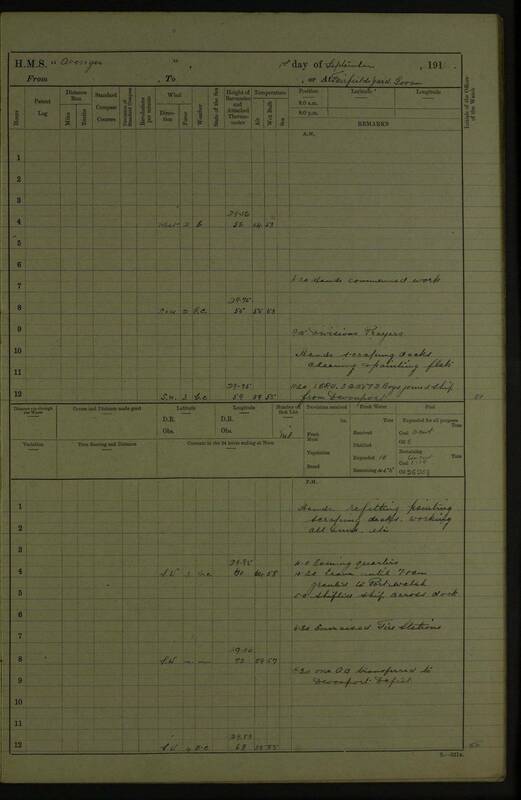 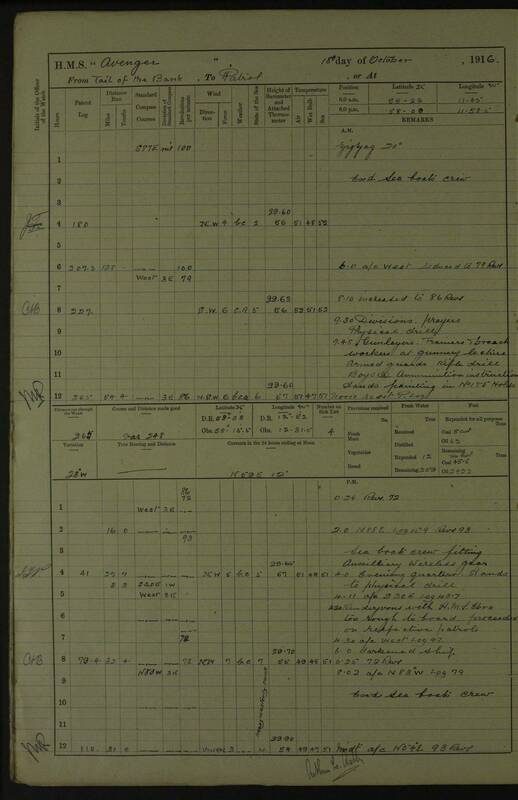 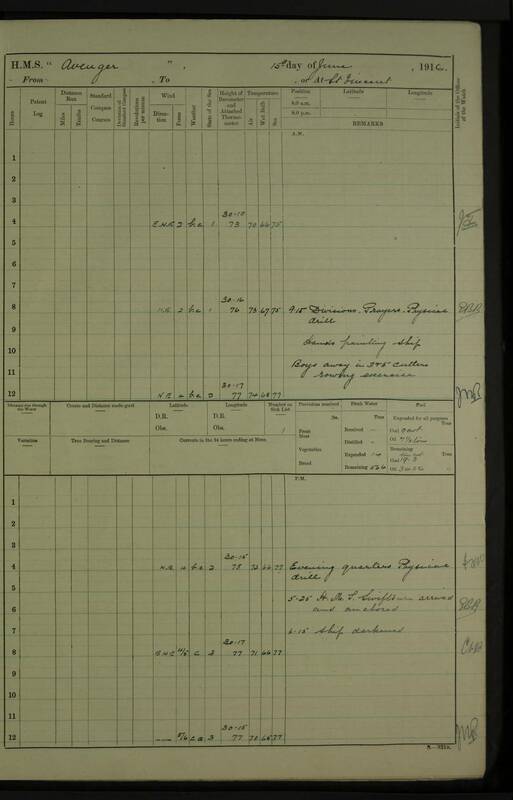 Noon at position of rendezvous with HMS “Orcoma”, not in sight, circled round position, turning 8 pts every 15 mins. 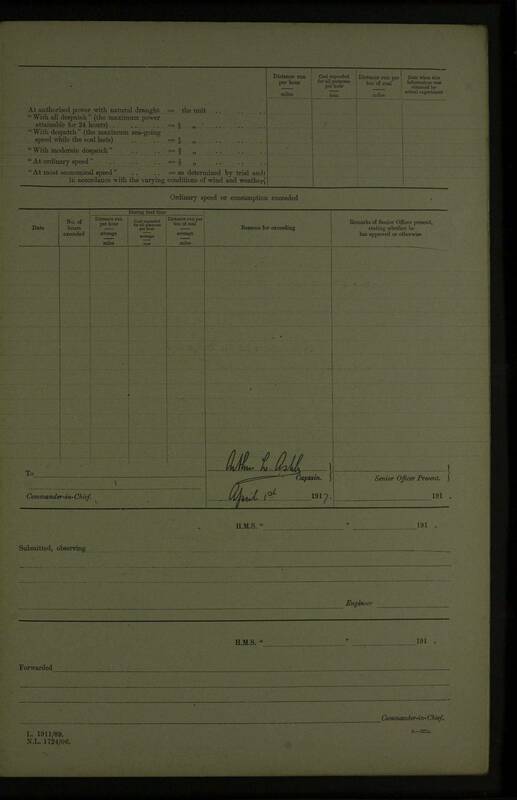 10.45am 1 Sub Lt RNR & 1 Midshipman RNR joined ship. 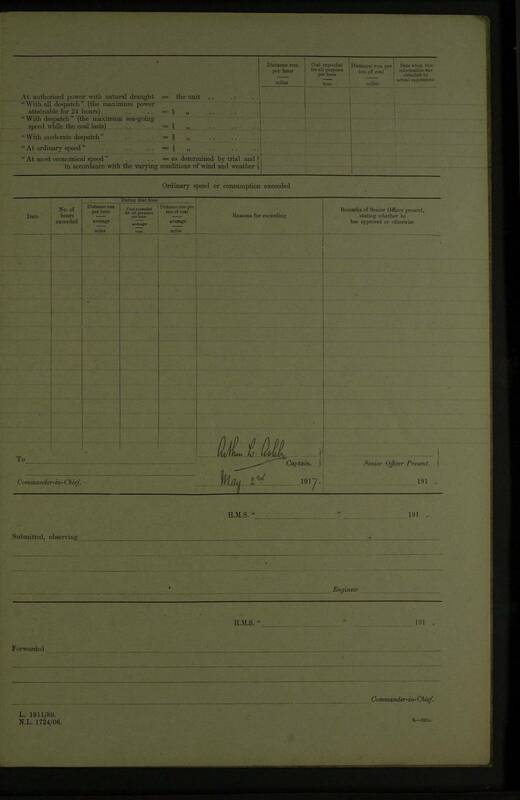 3 Officers & armed guard rejoined. 4.45pm Challenged by HMS “Andes” waiting at R.V. 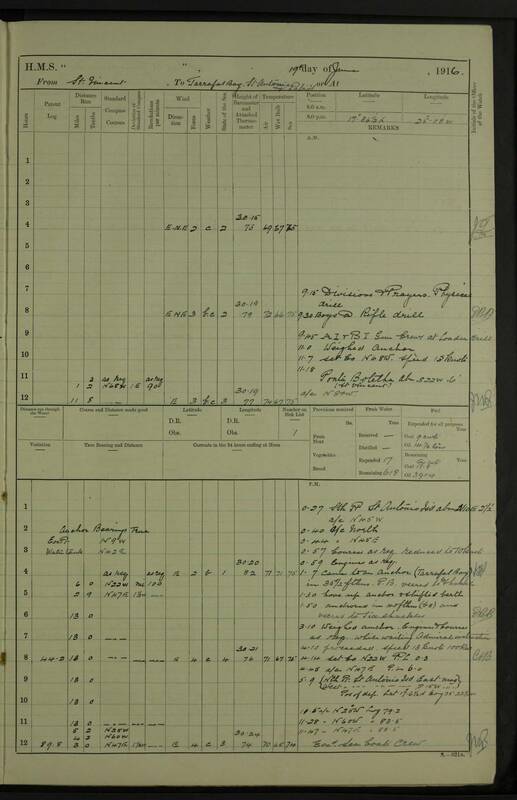 Boys at Rifle drill, etc. 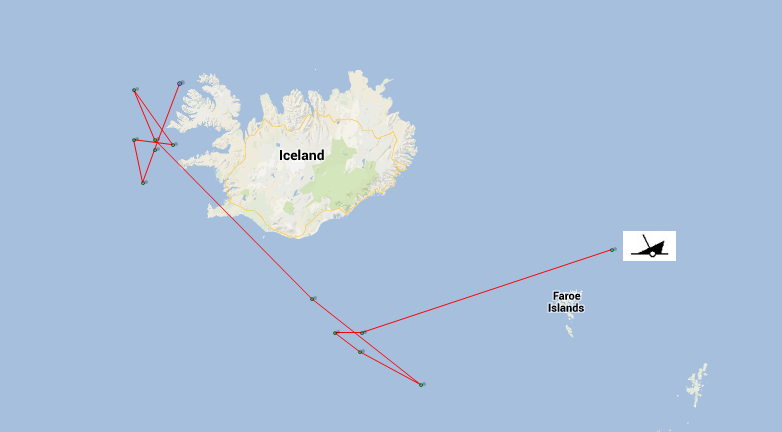 2.0pm Hauled ship clear of wharf to allow floating crane to get inside. 6.0pm Fire hoses rigged etc. 9.30am Inspection of Lower decks, etc. 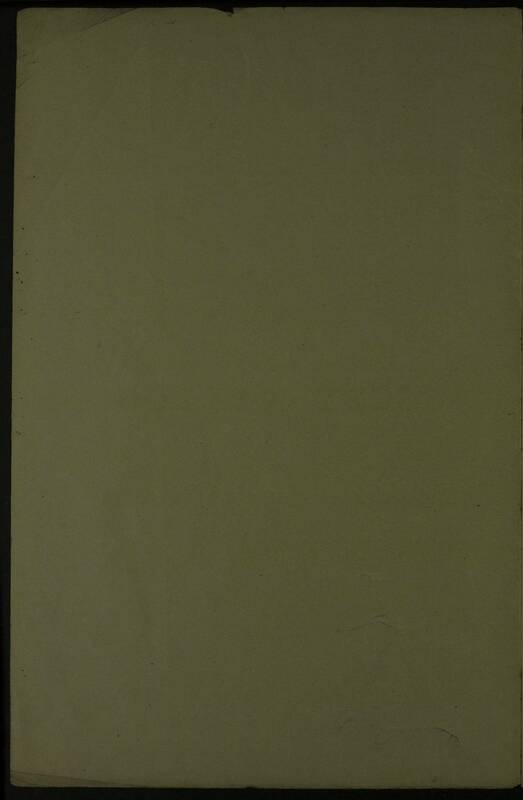 9.30am Hands painting ship overside etc. 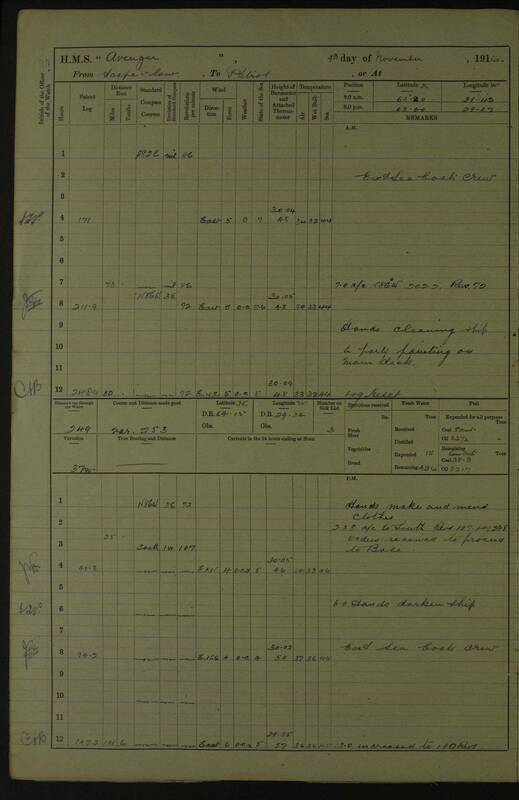 1.10pm Hands painting ship, drawing stores. 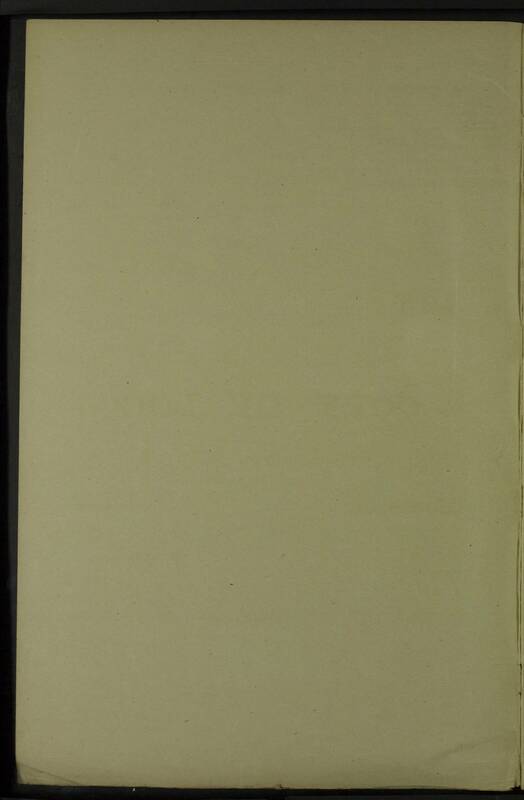 Hands employed painting funnels, bridge, etc. 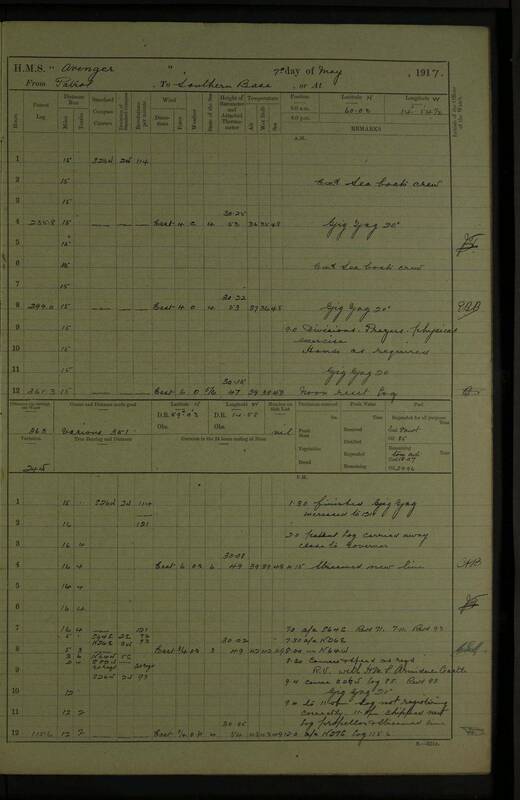 0.17pm Sent boat to “Hilary” and received back signals, etc. 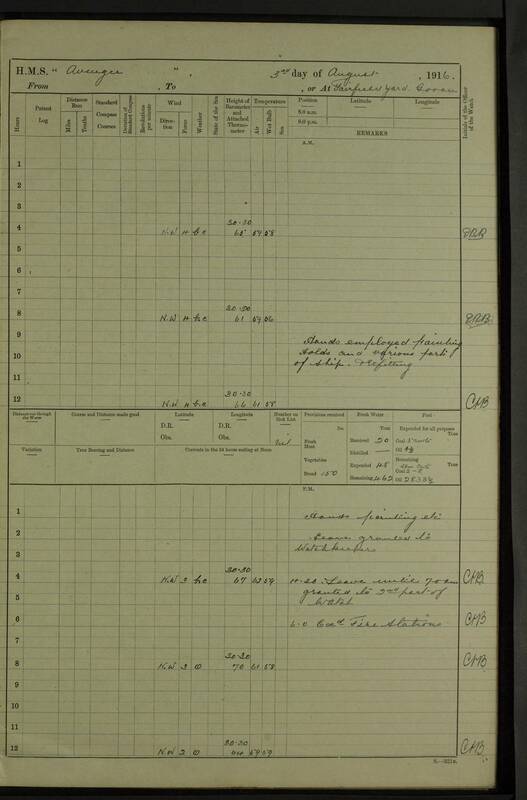 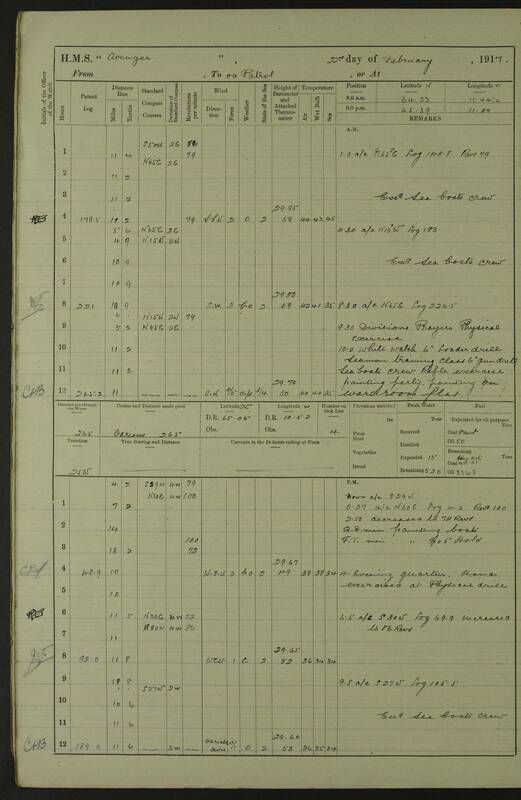 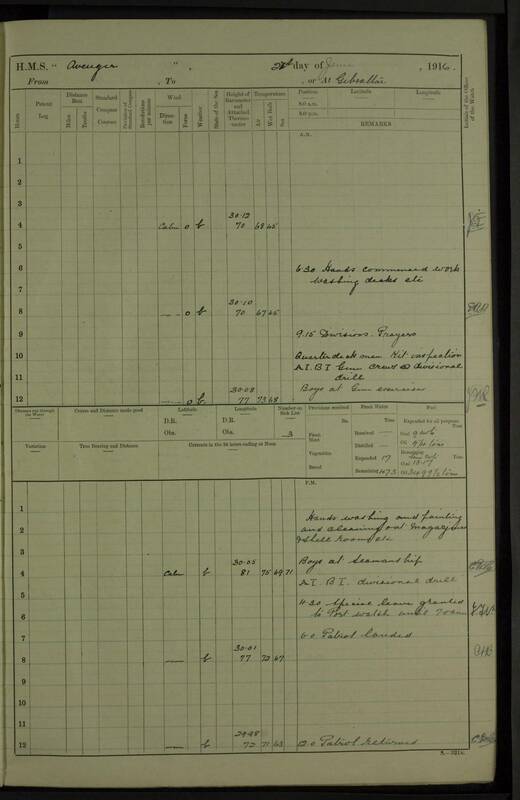 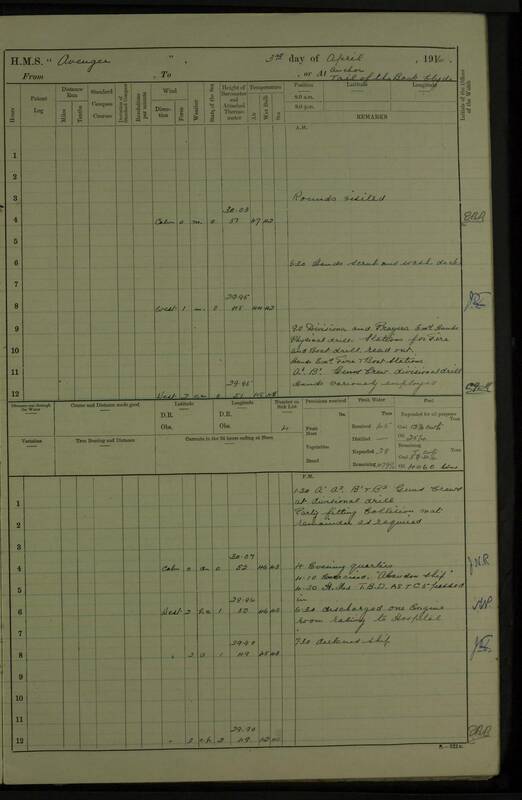 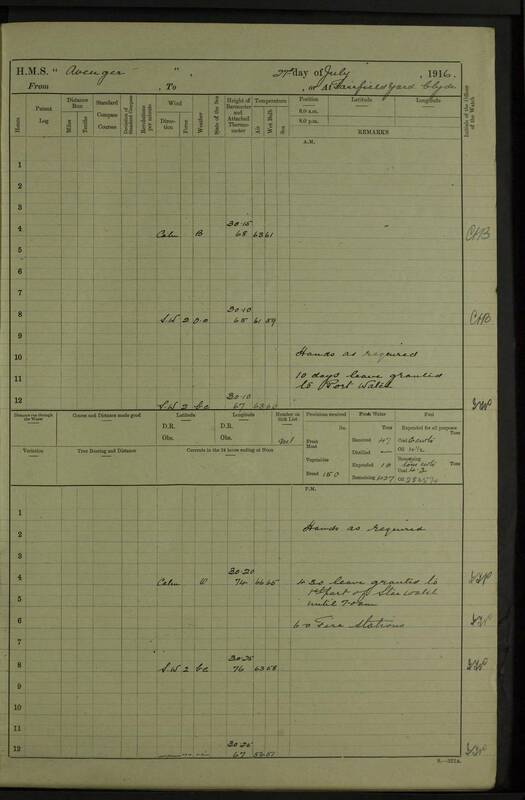 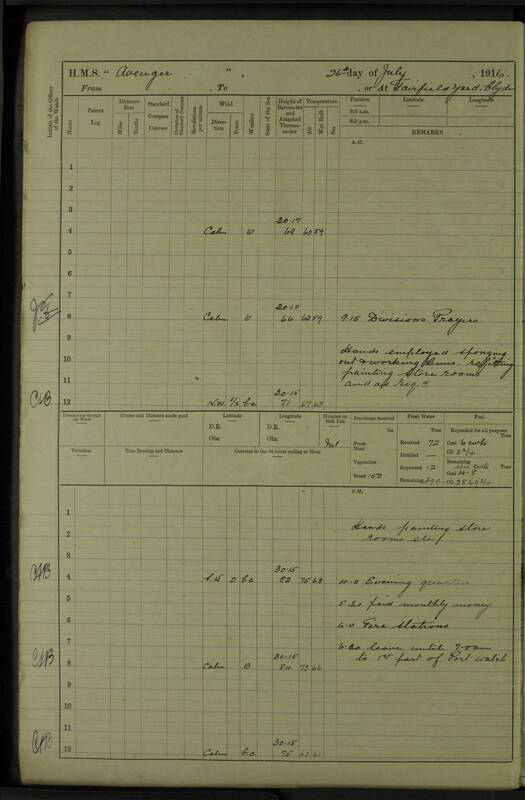 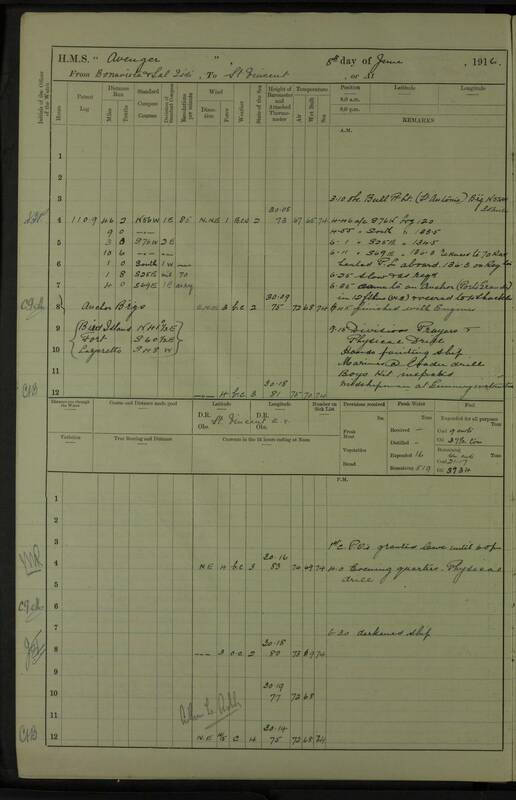 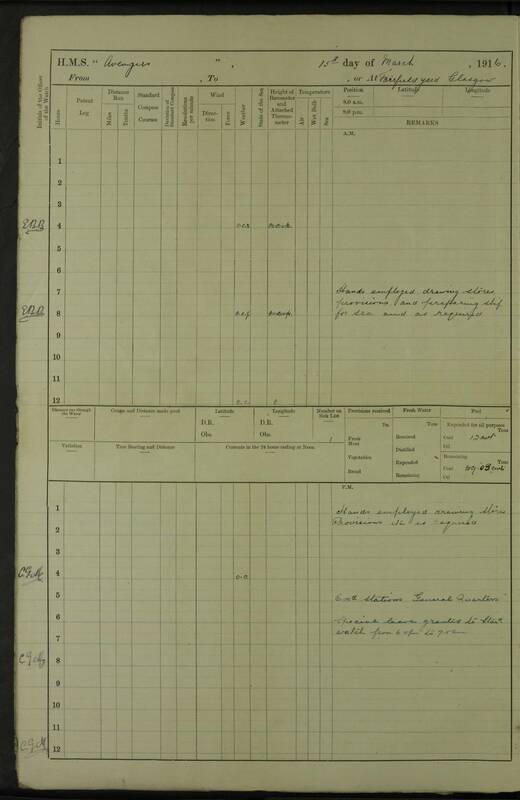 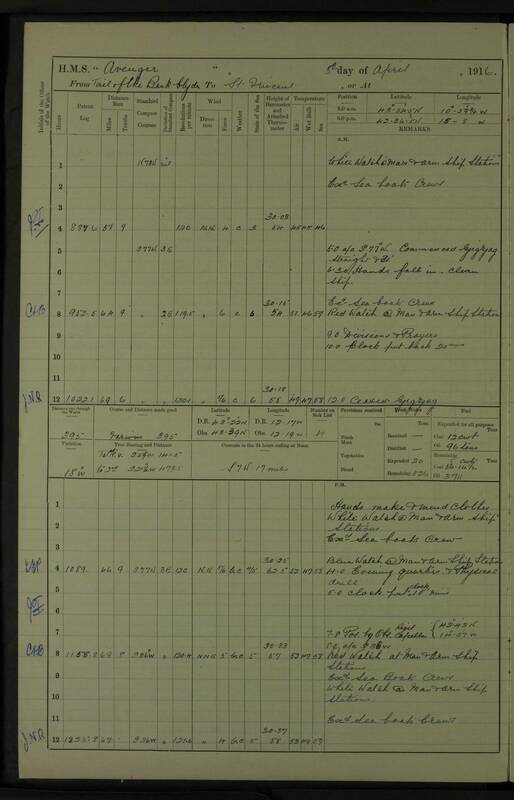 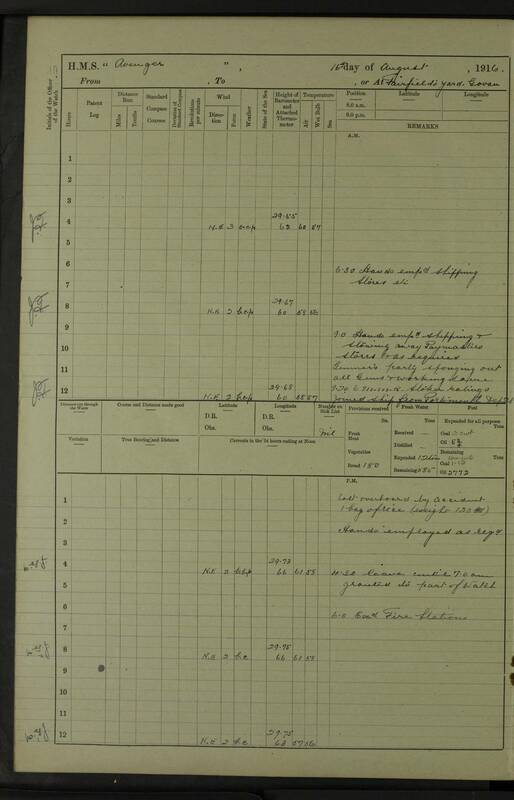 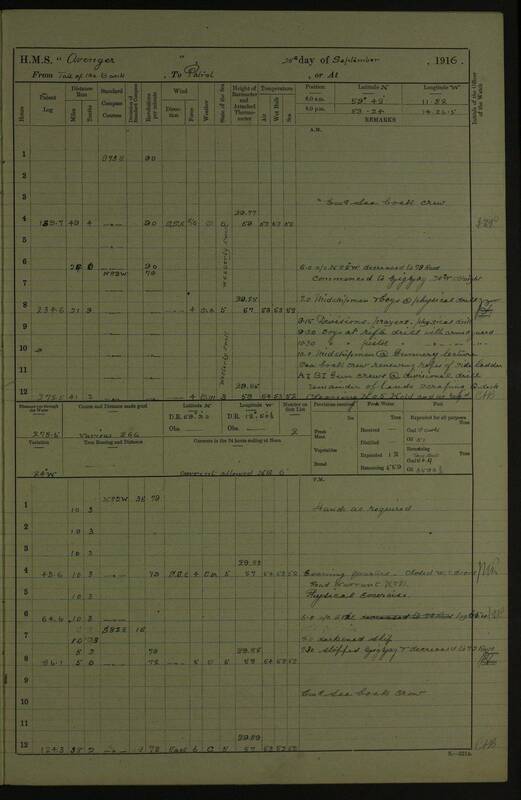 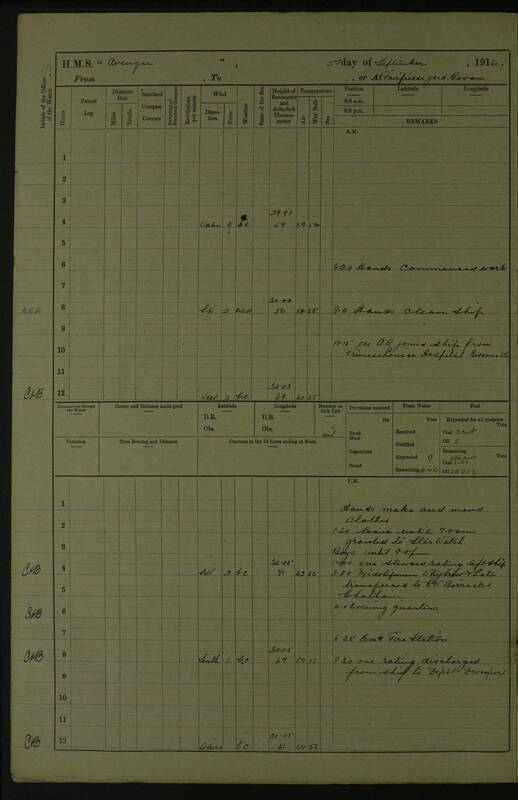 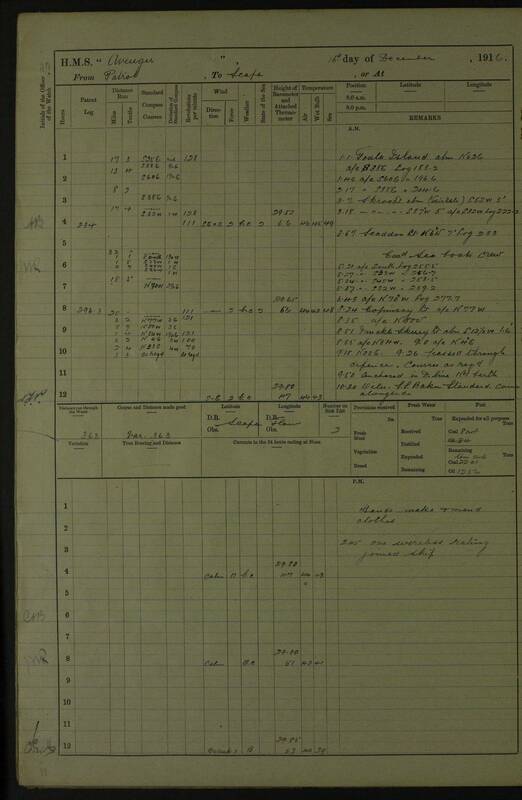 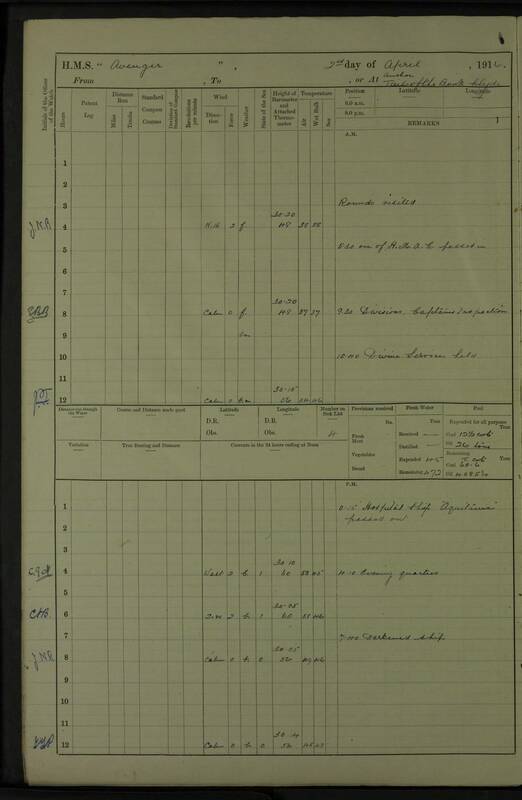 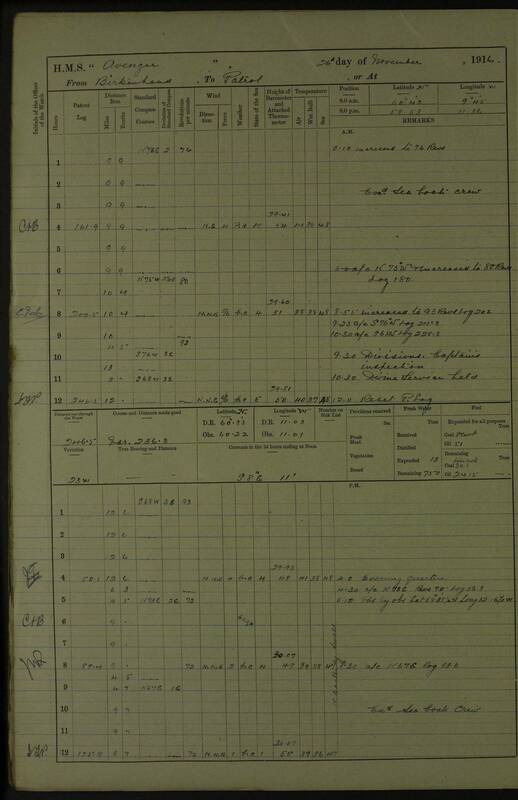 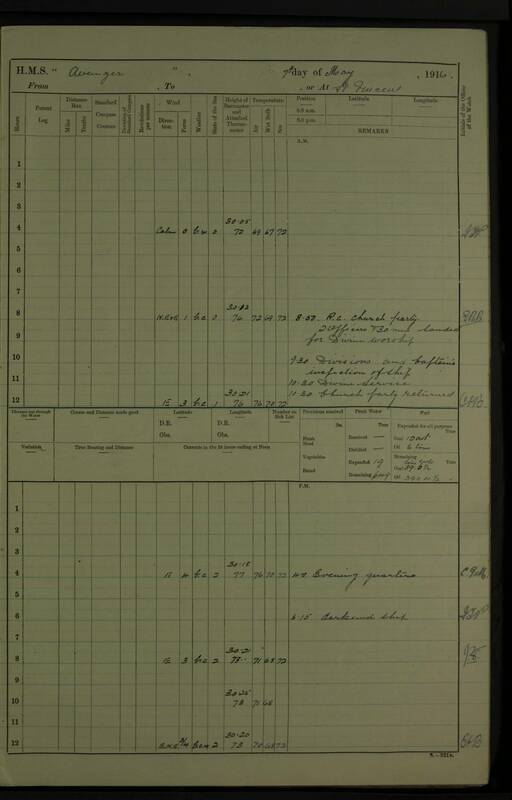 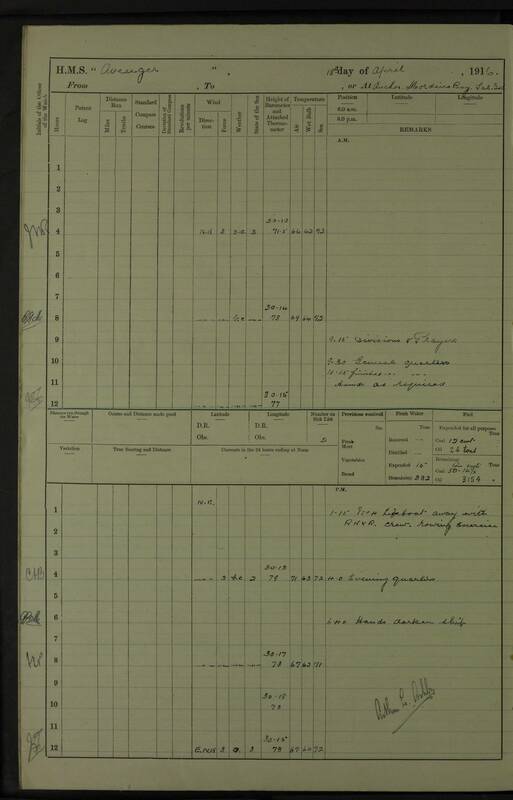 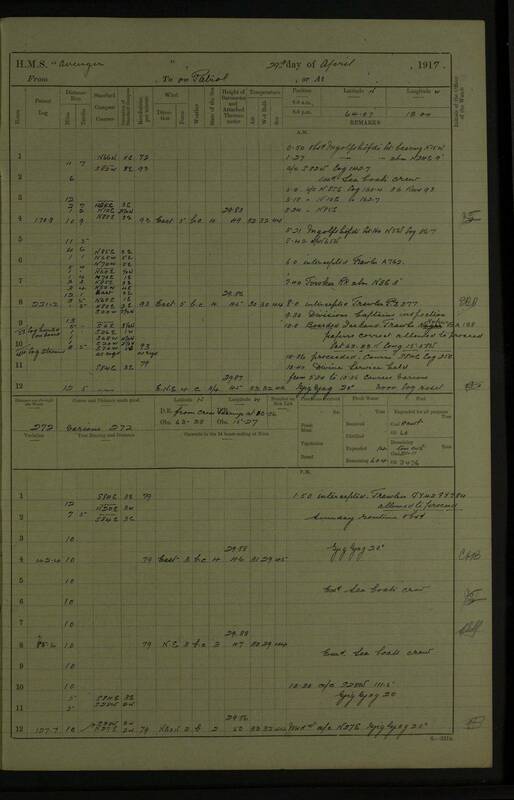 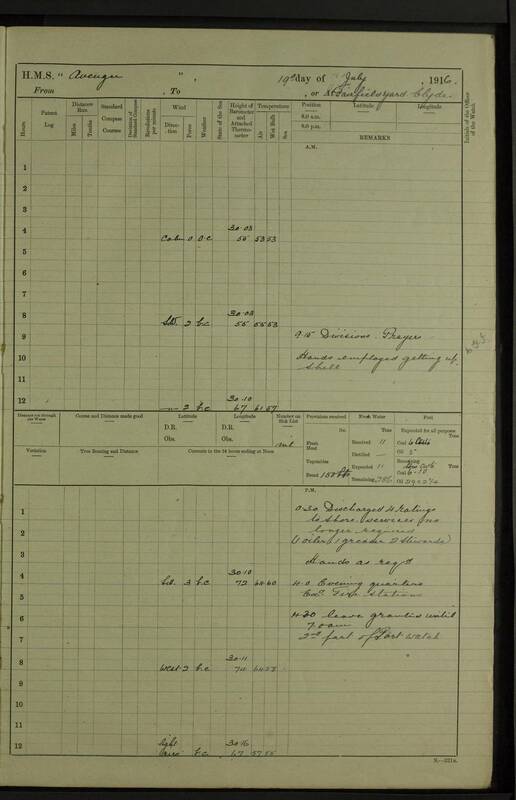 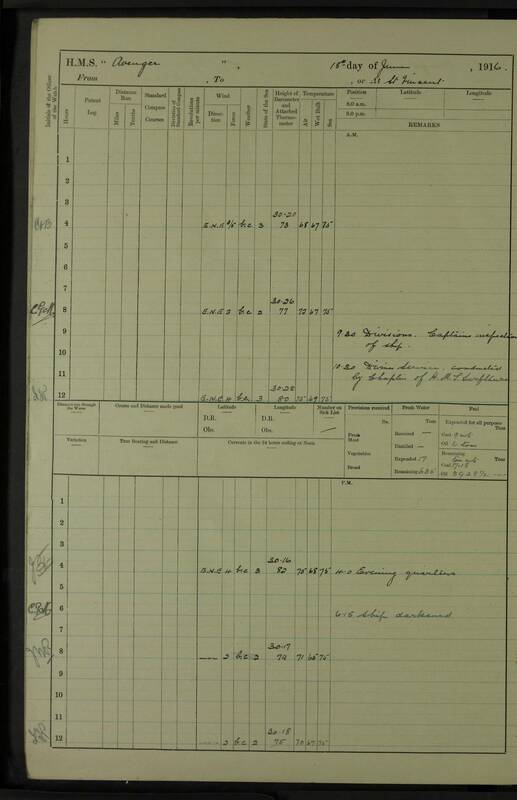 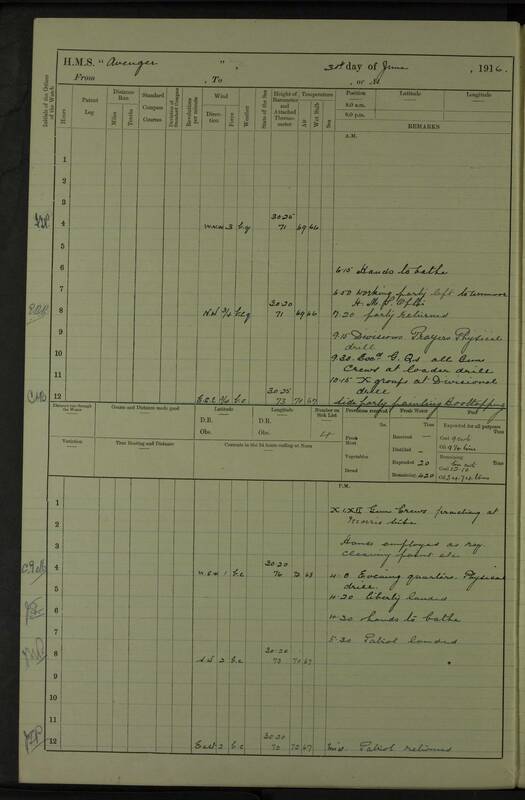 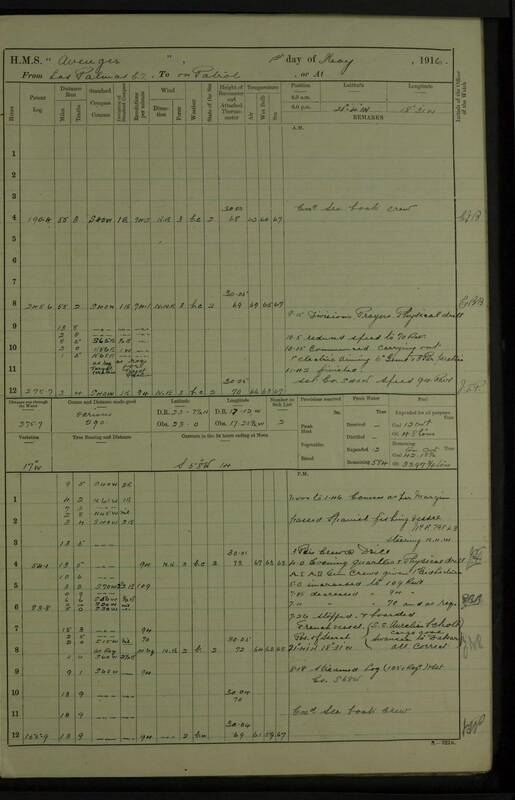 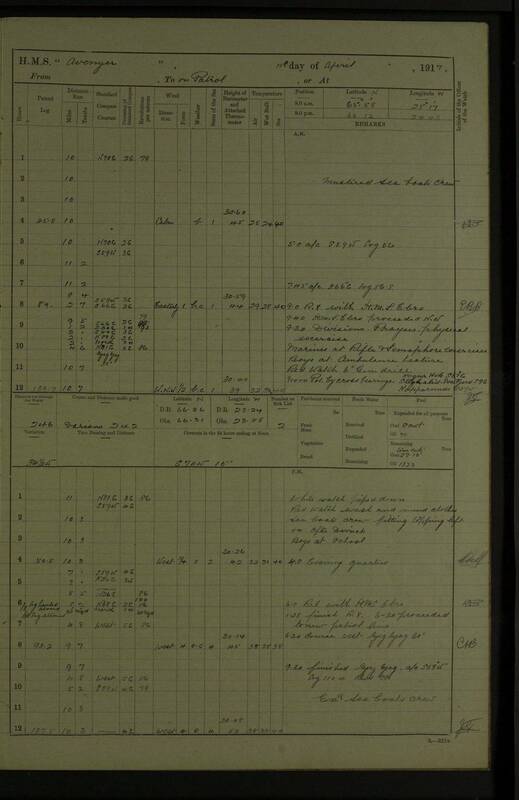 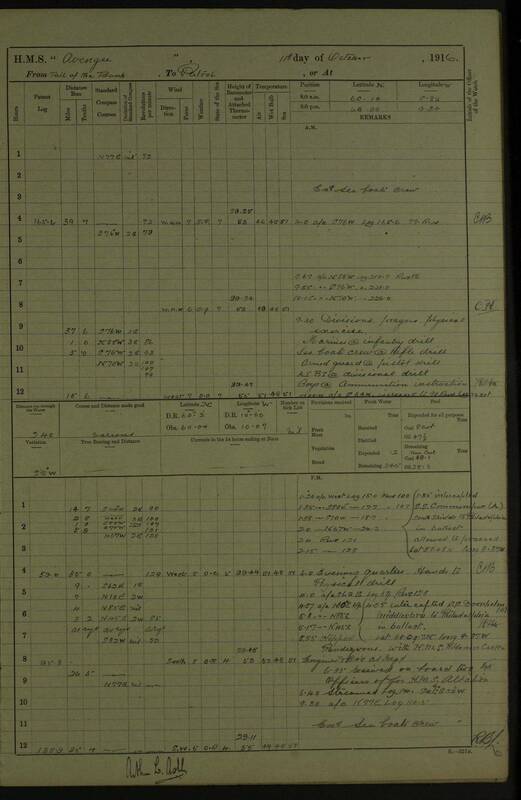 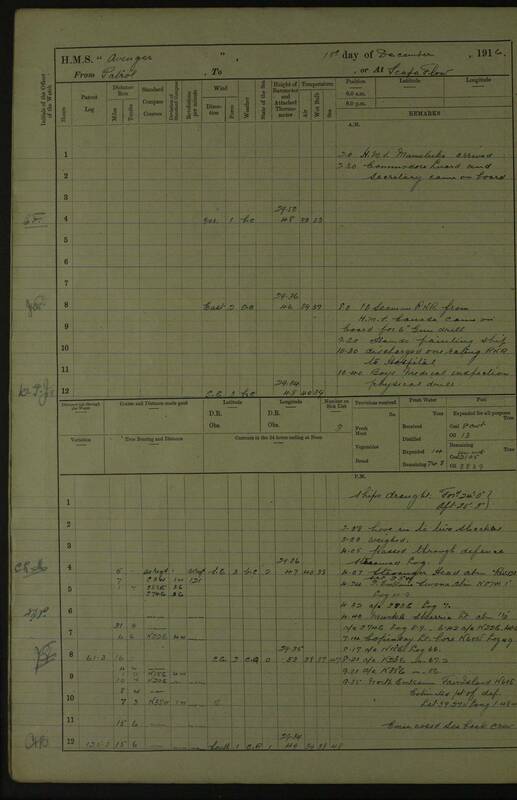 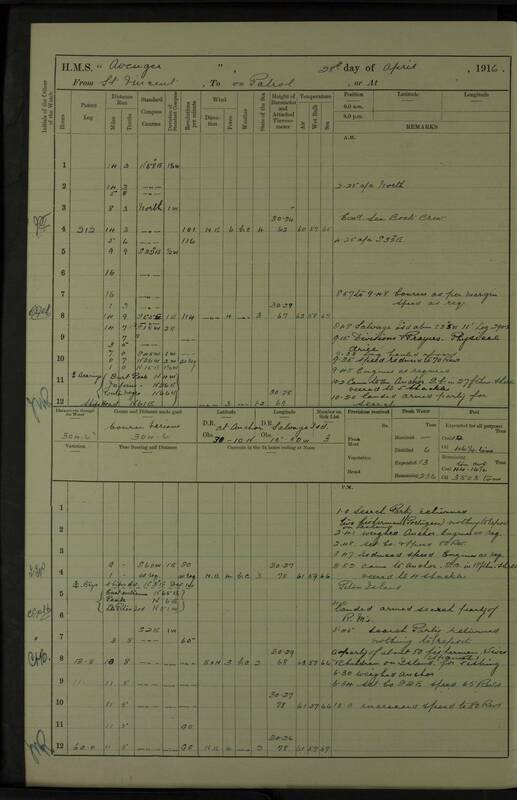 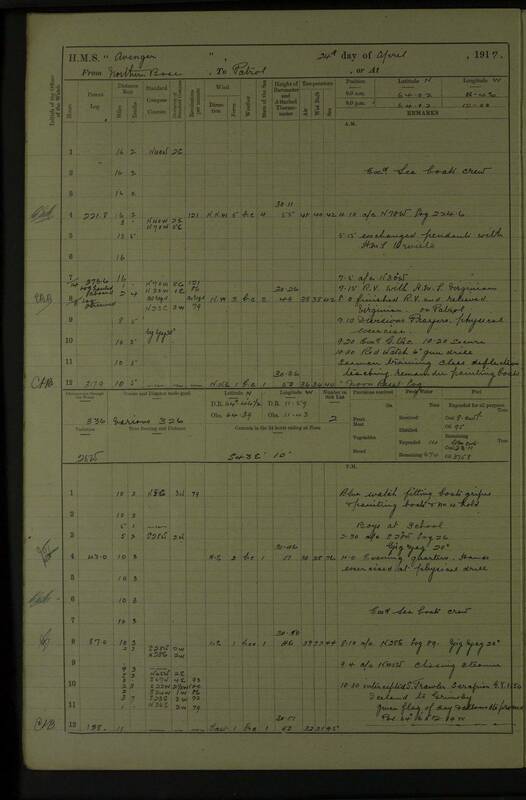 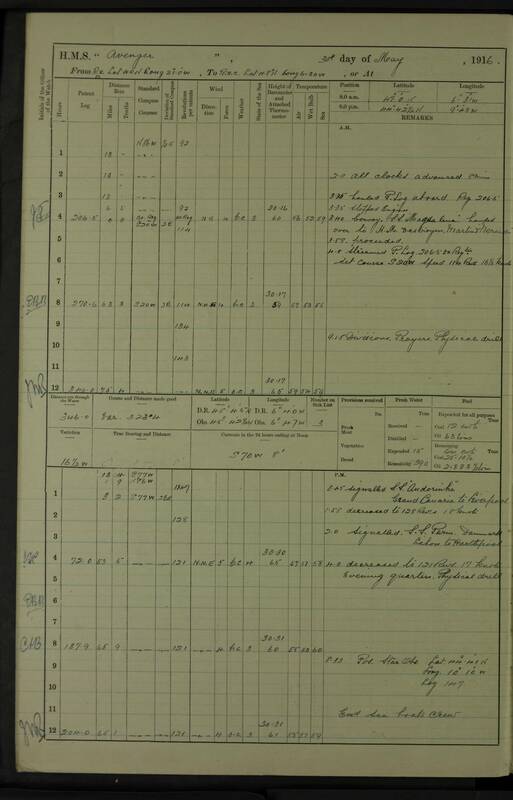 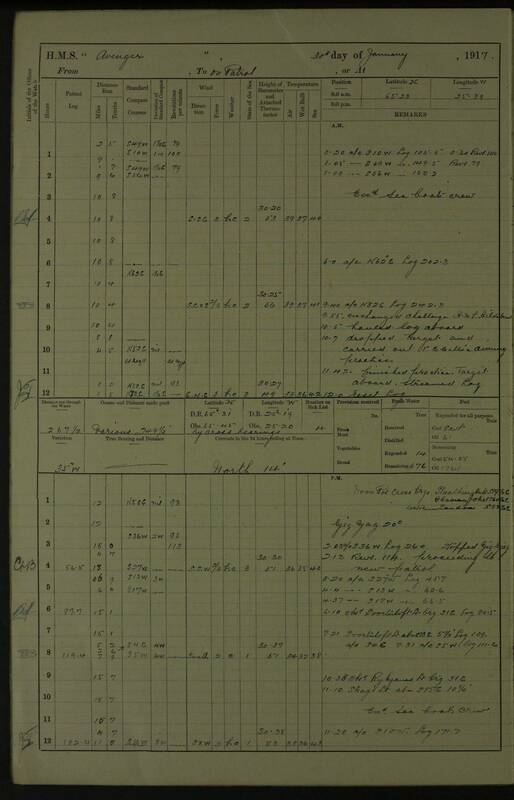 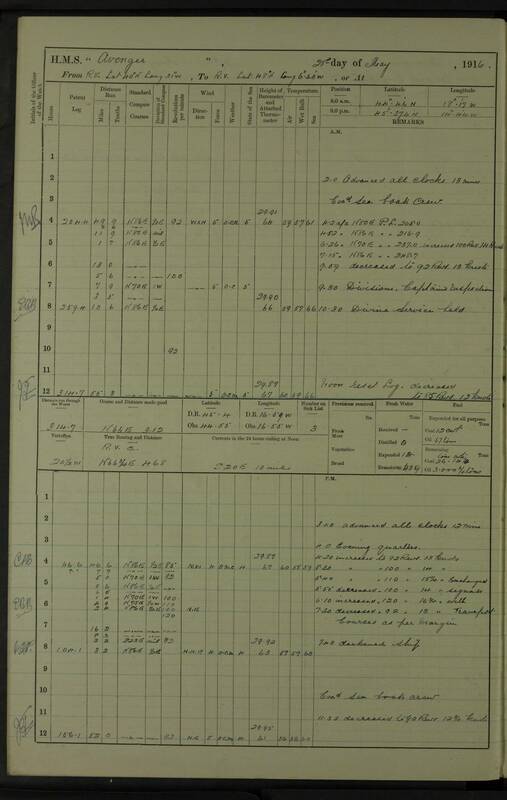 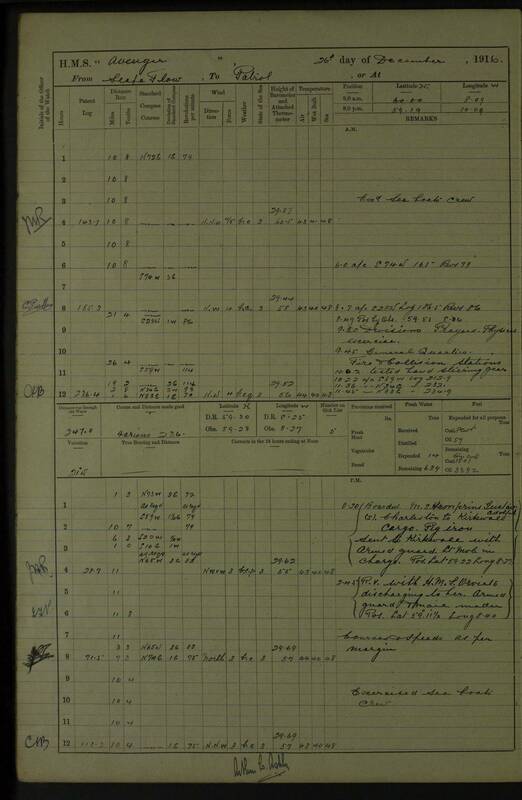 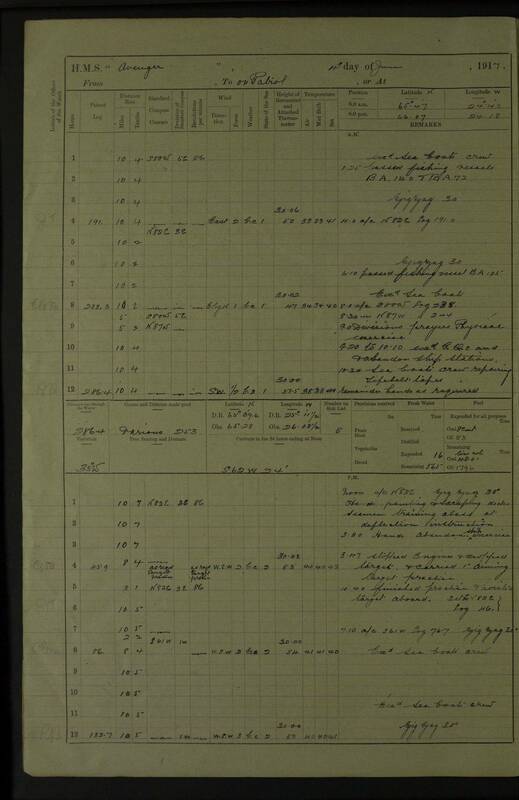 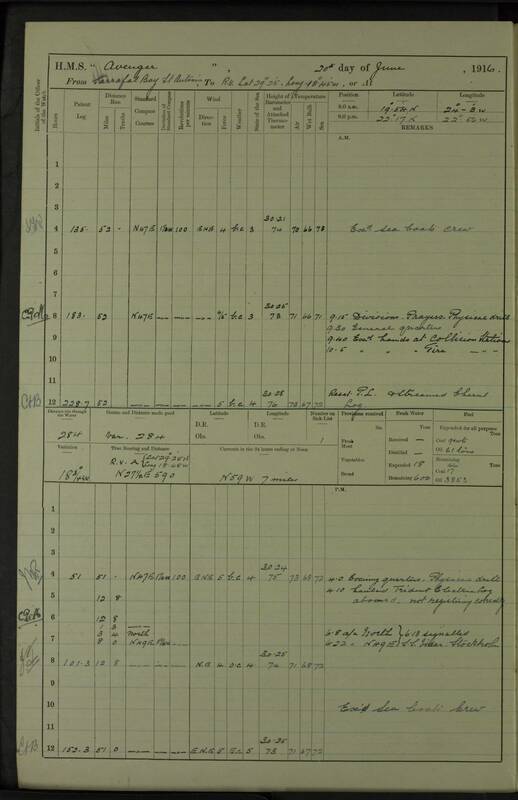 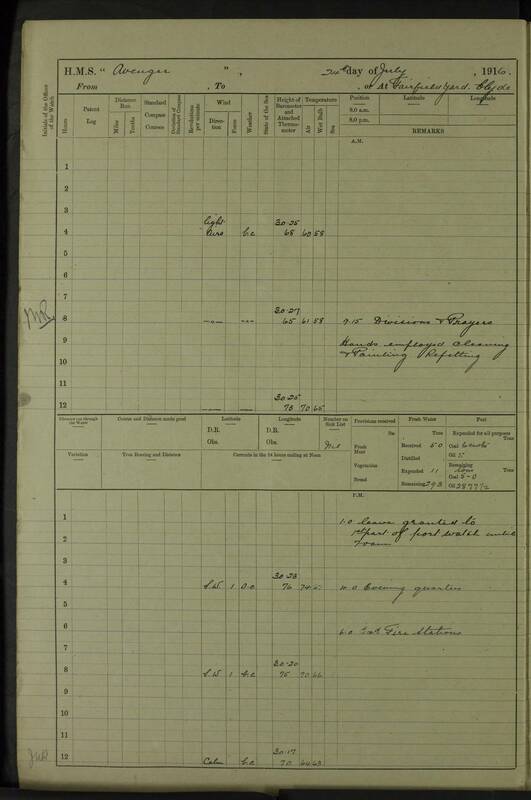 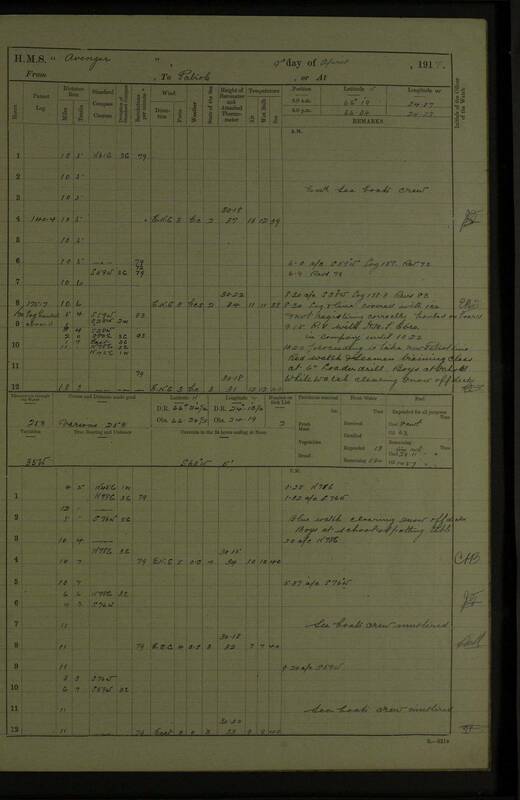 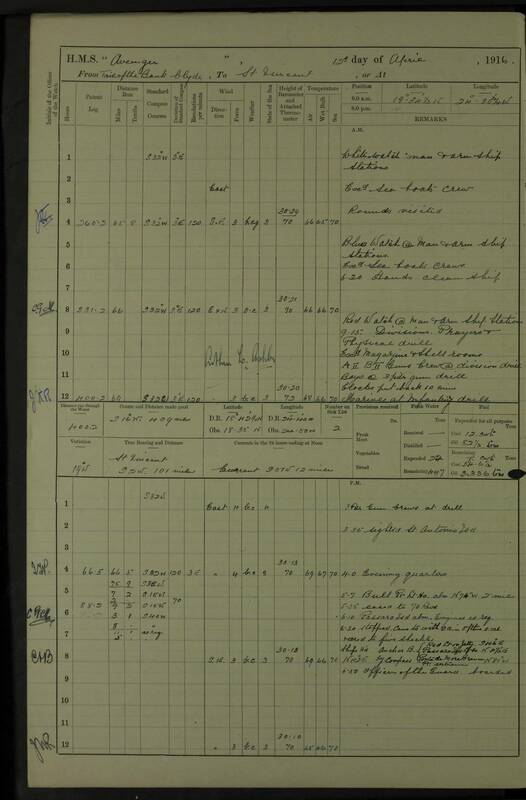 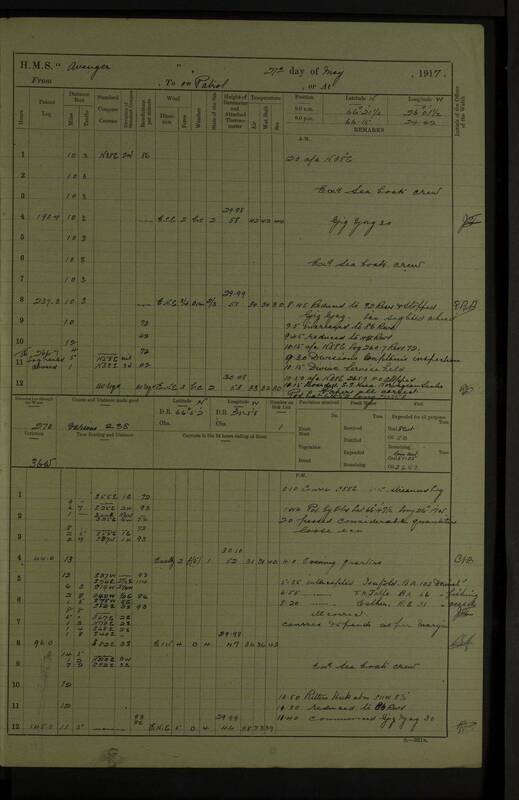 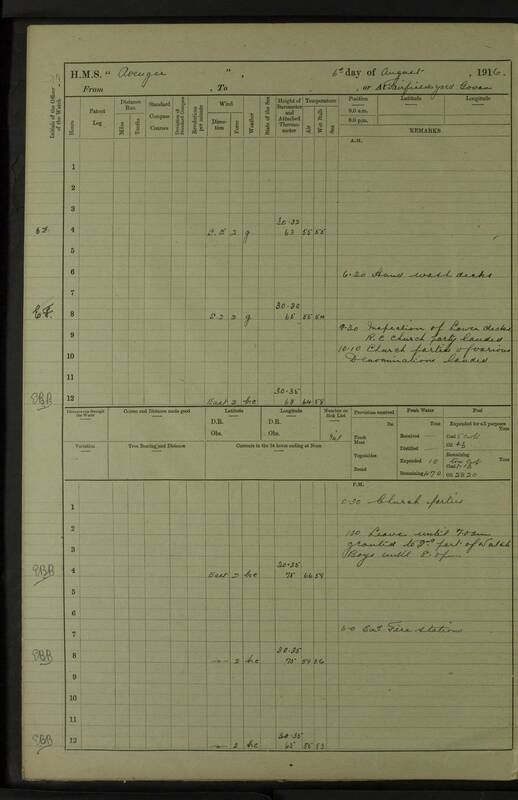 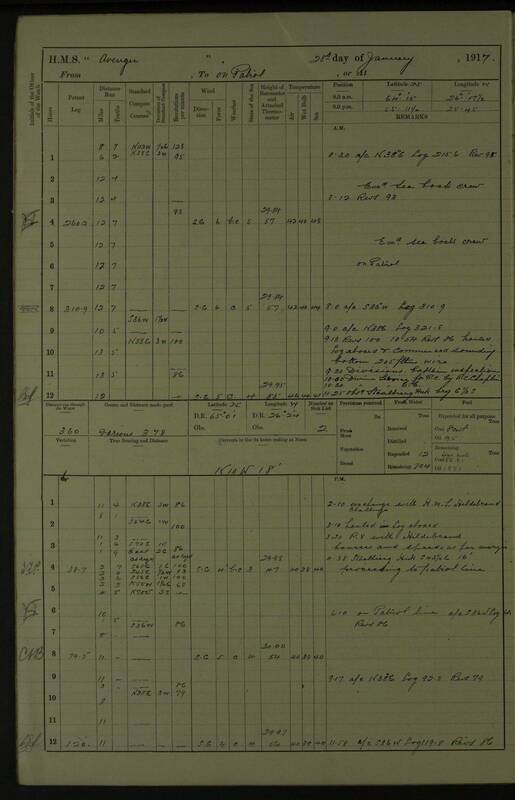 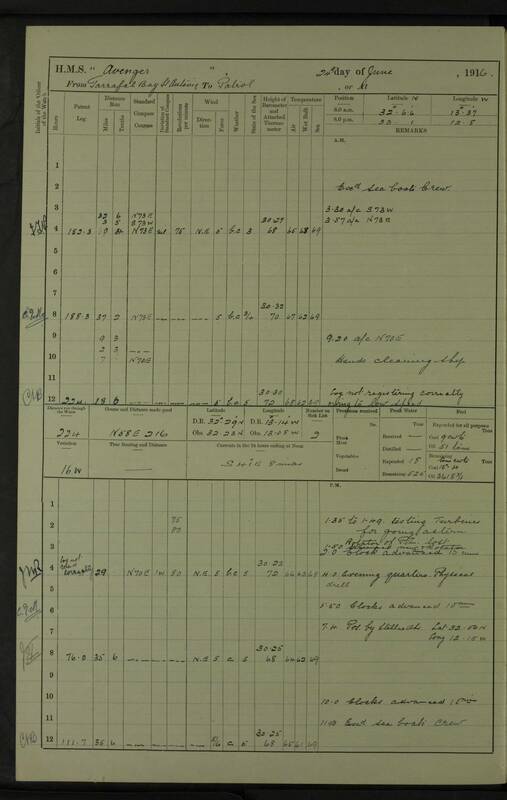 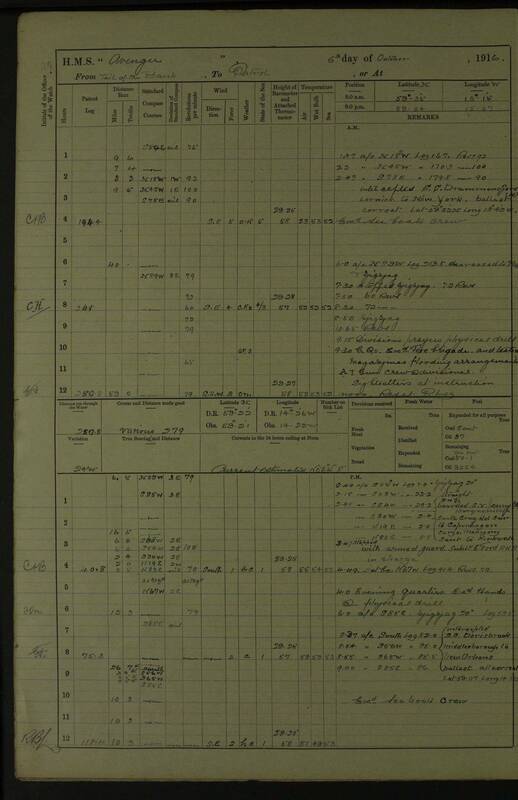 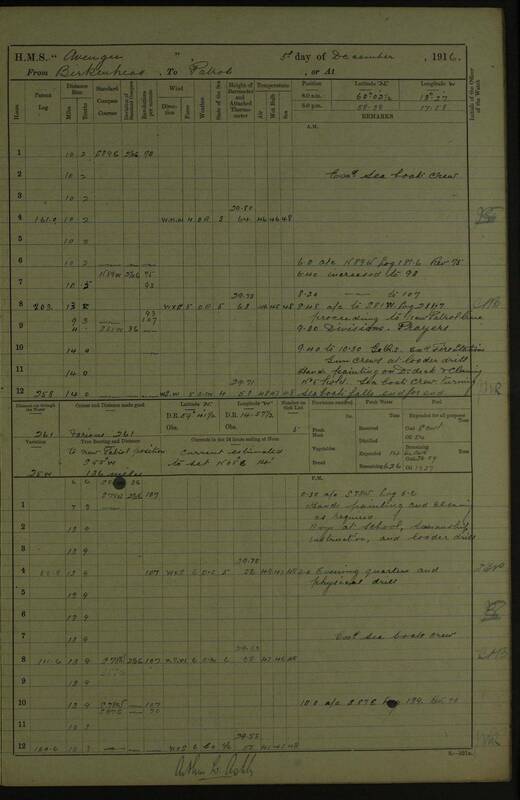 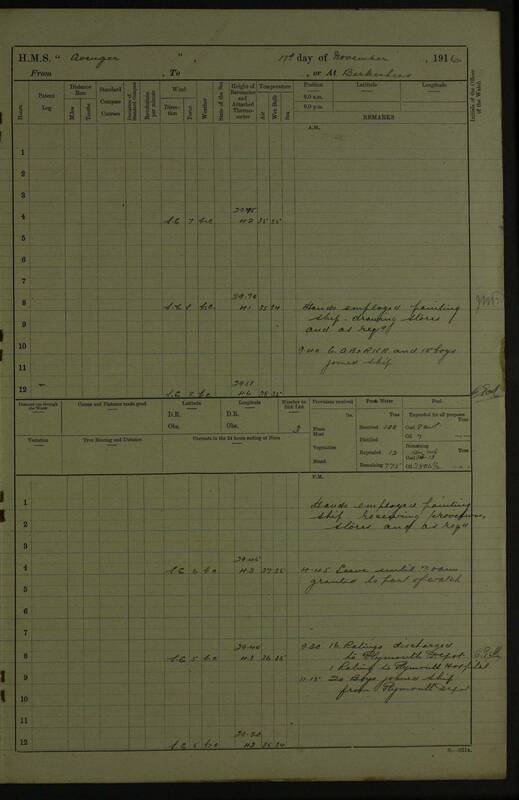 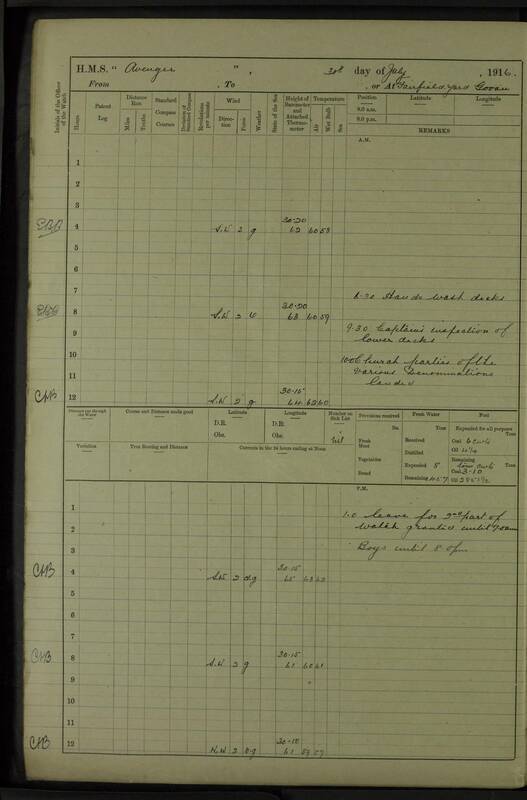 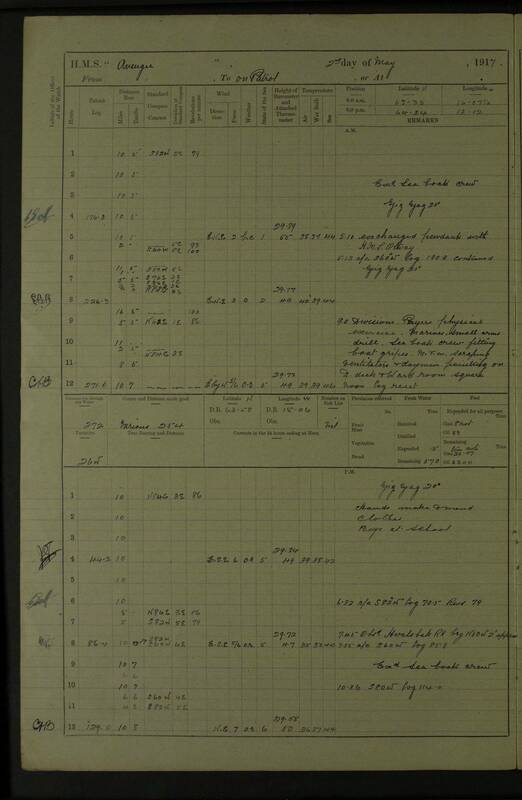 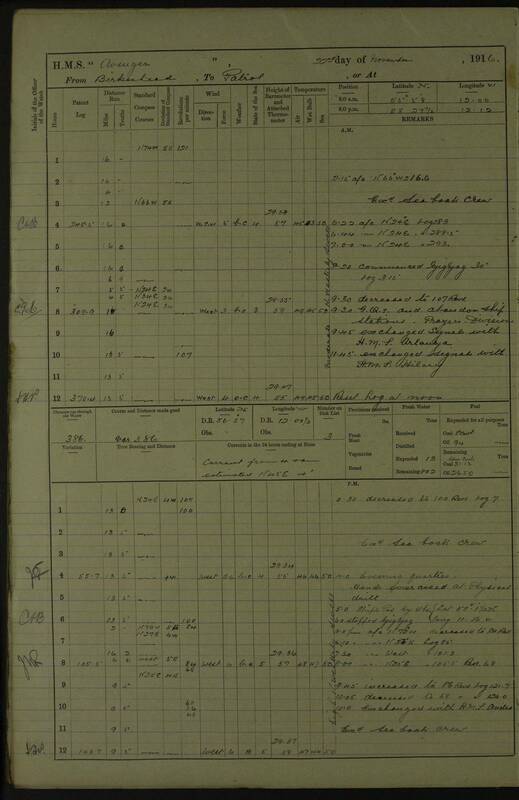 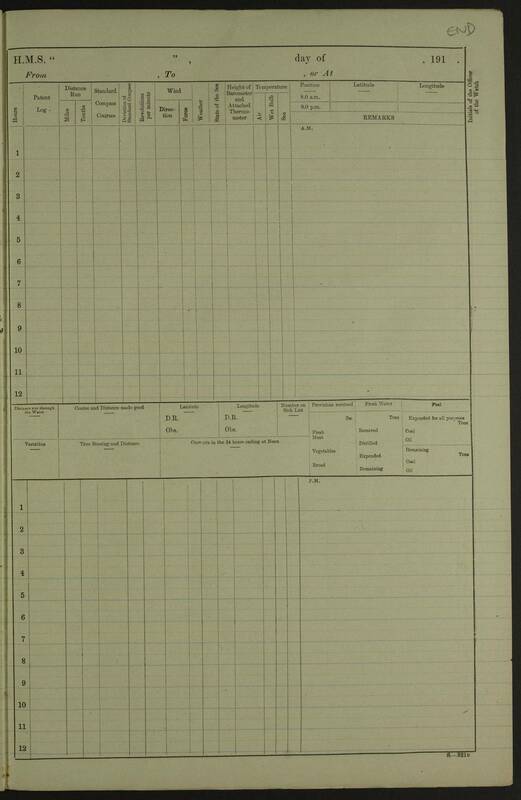 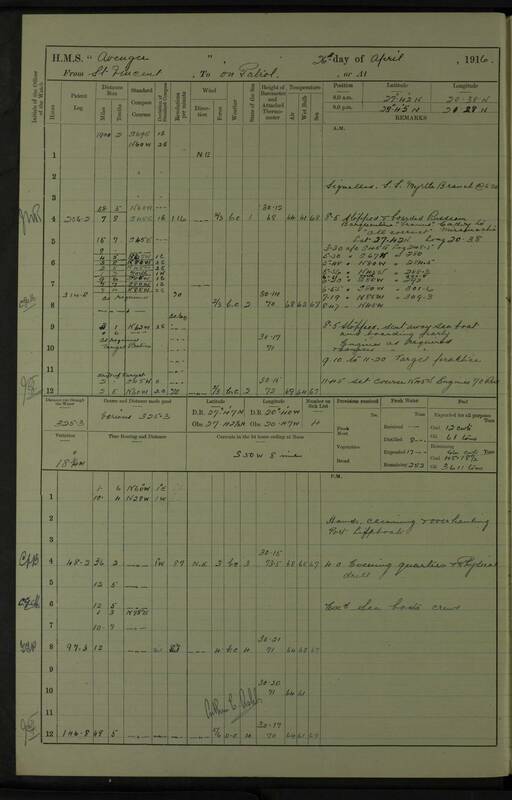 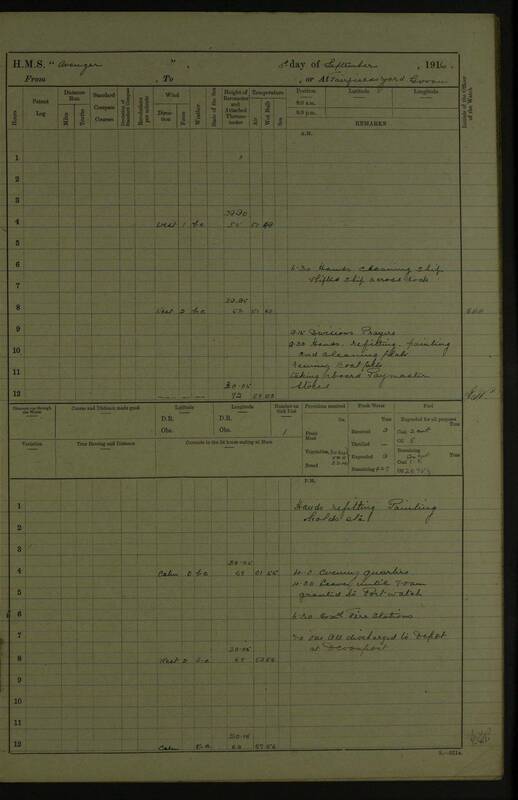 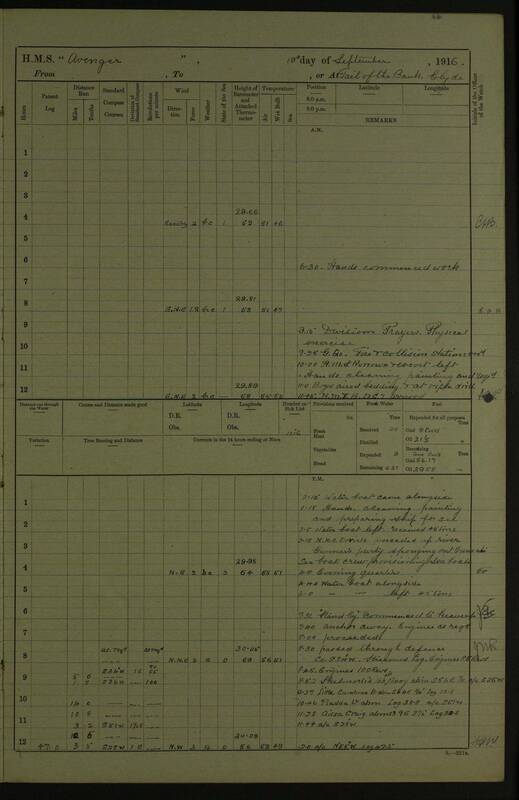 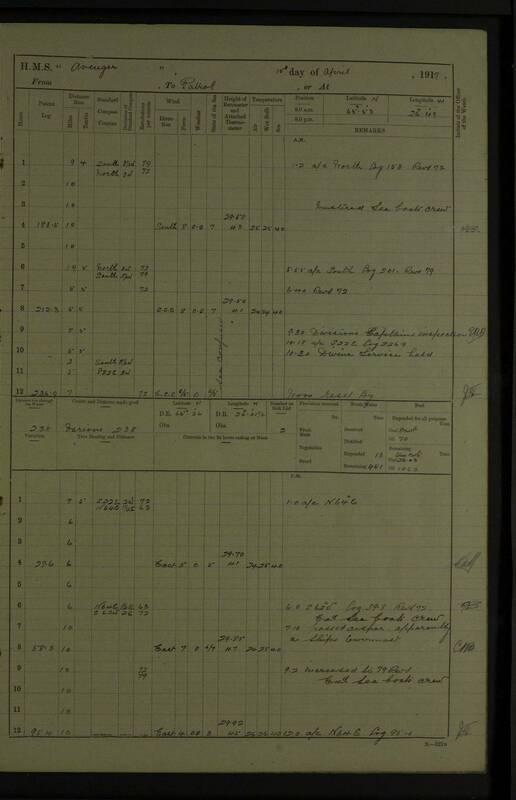 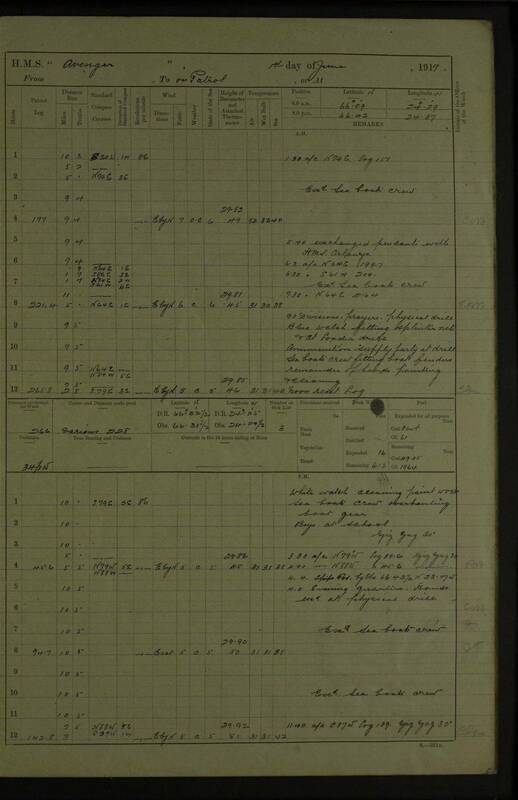 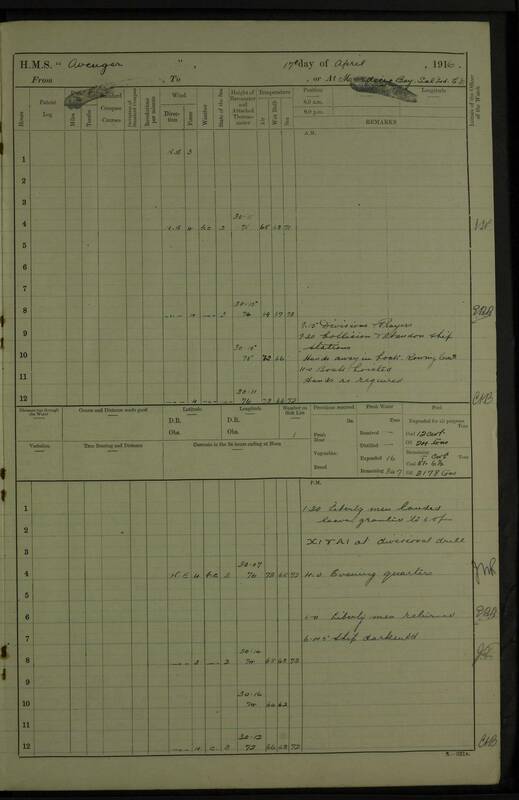 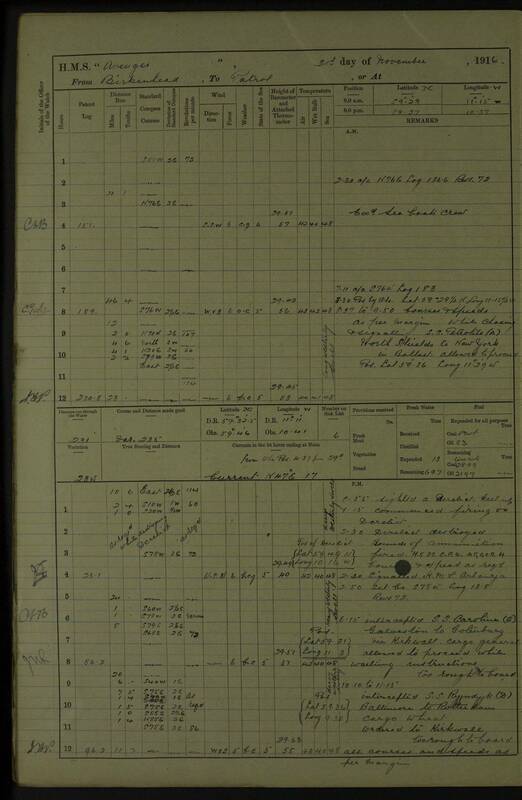 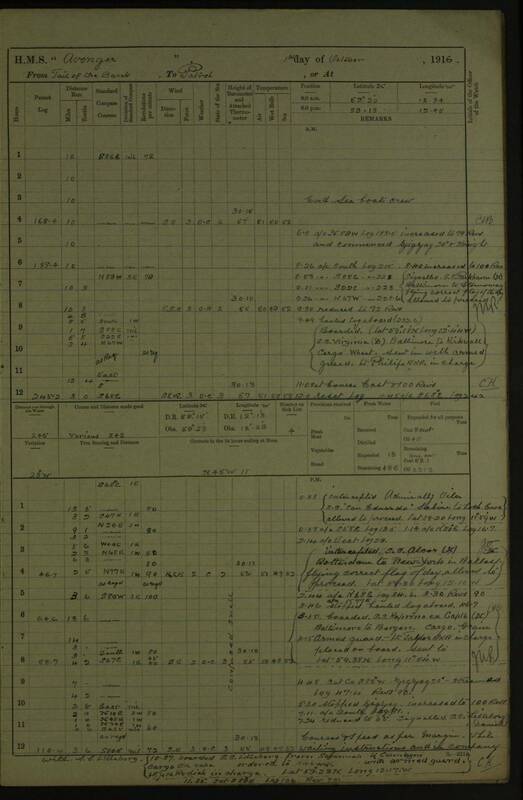 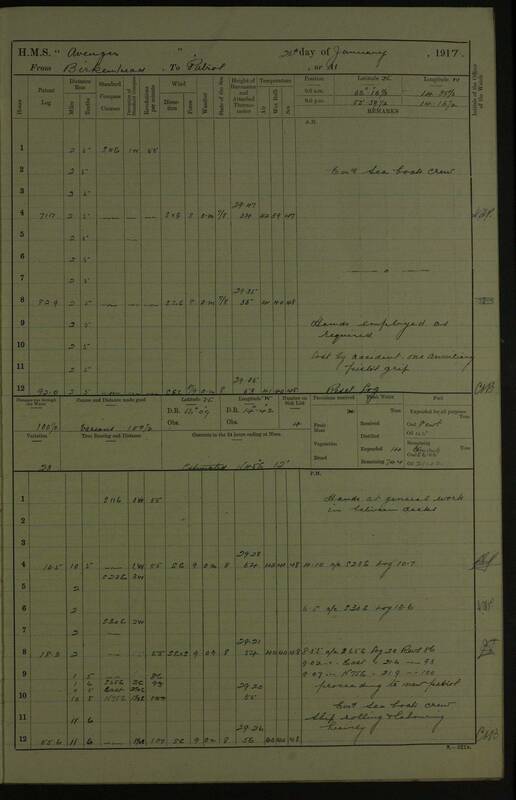 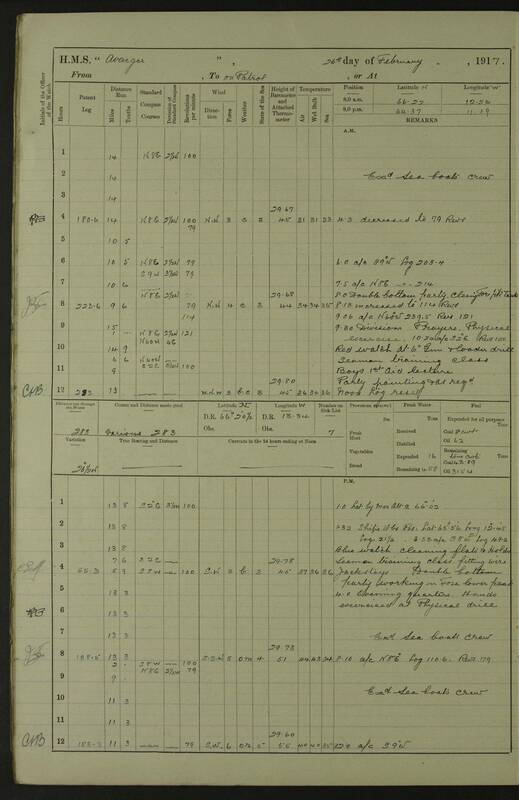 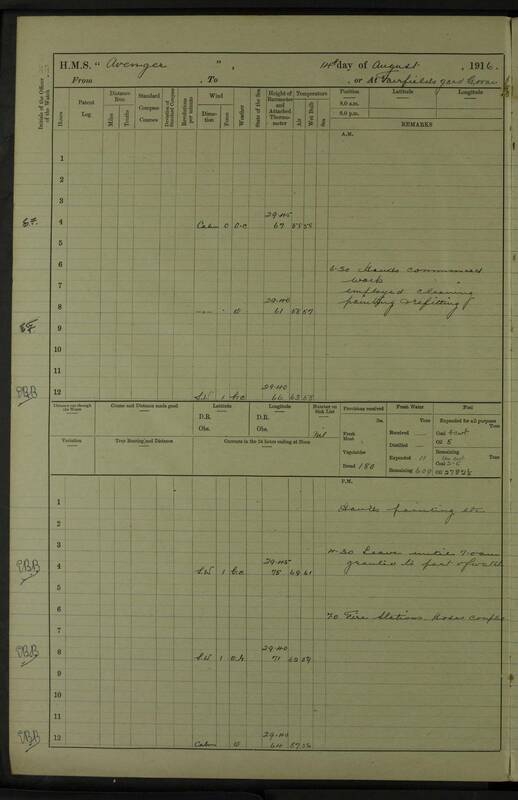 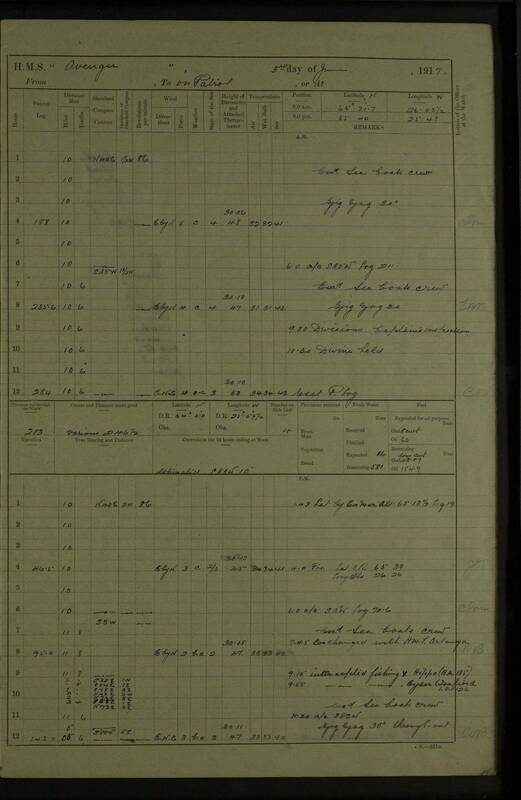 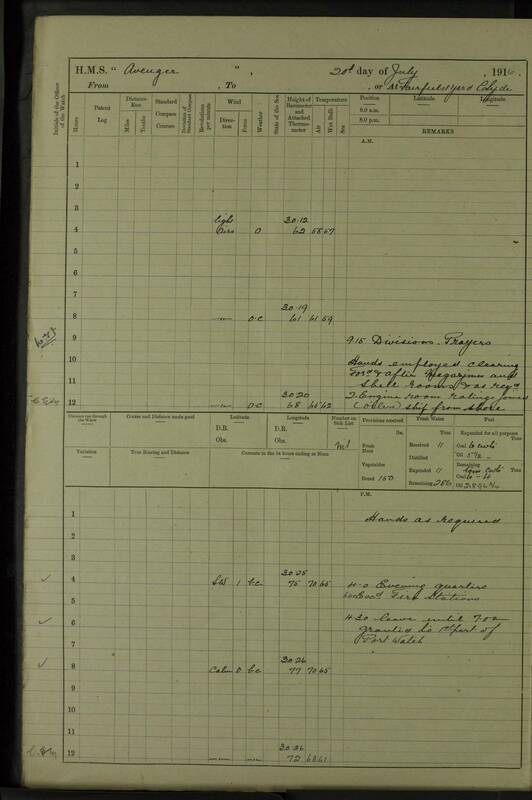 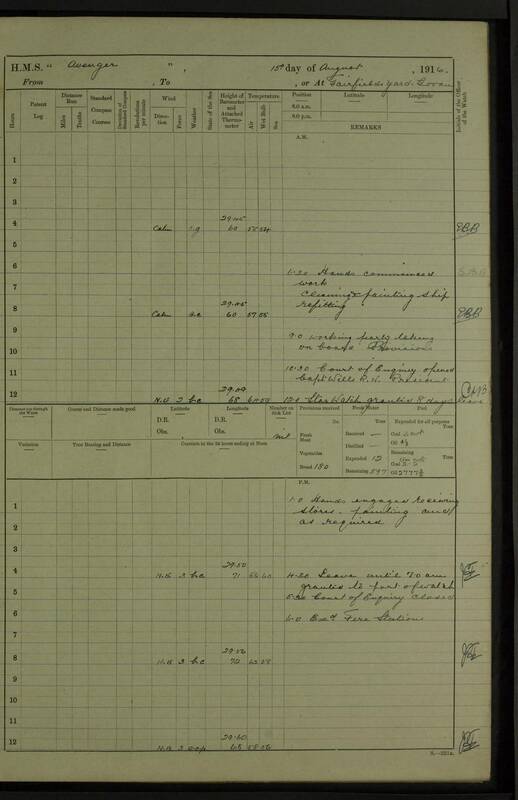 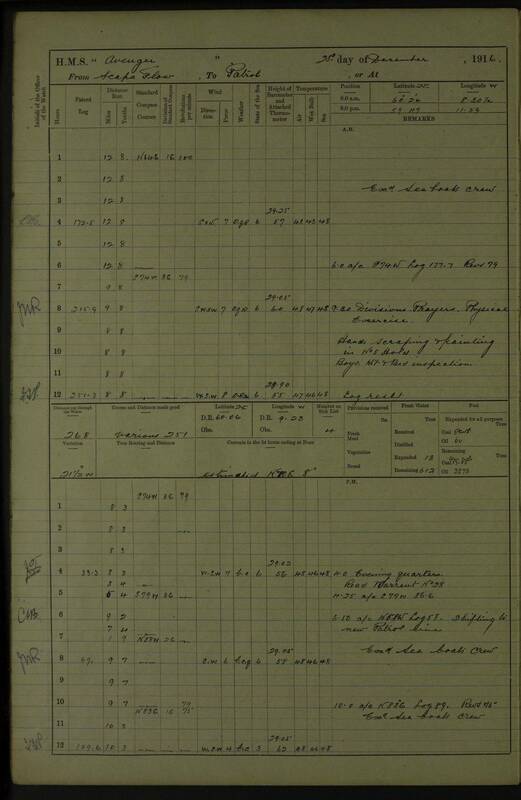 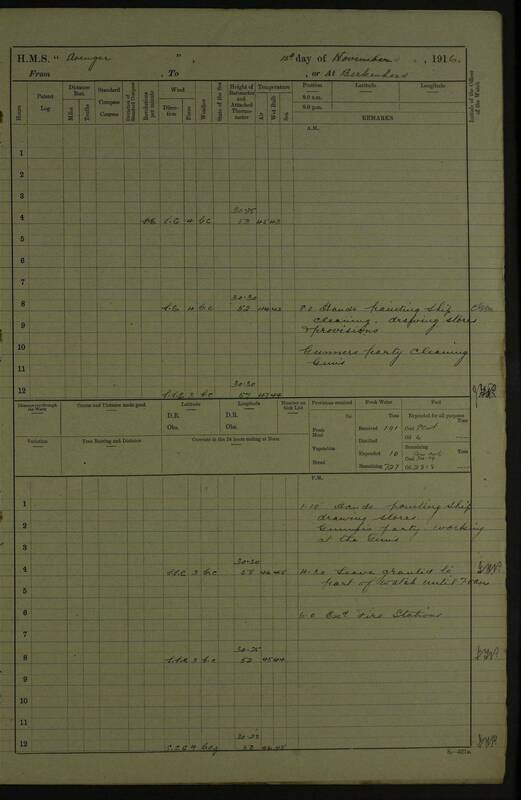 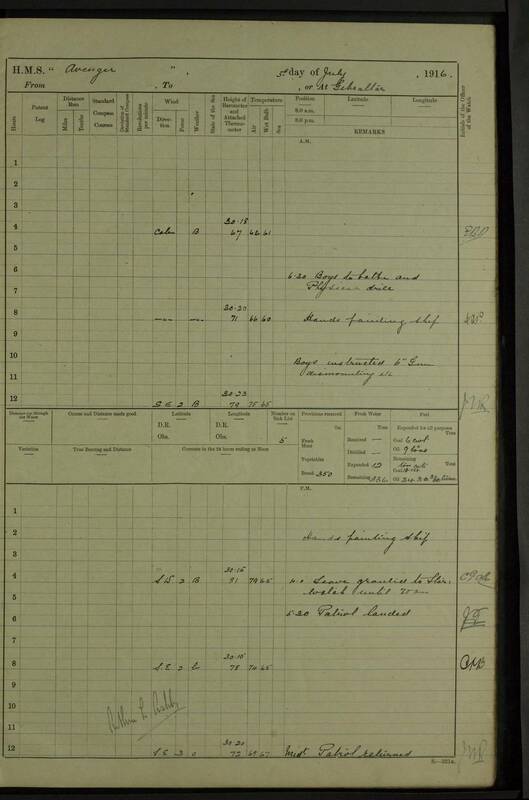 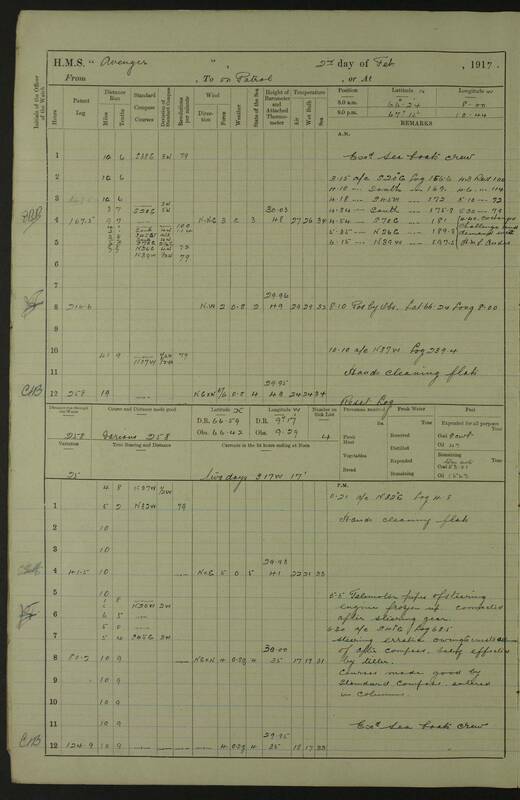 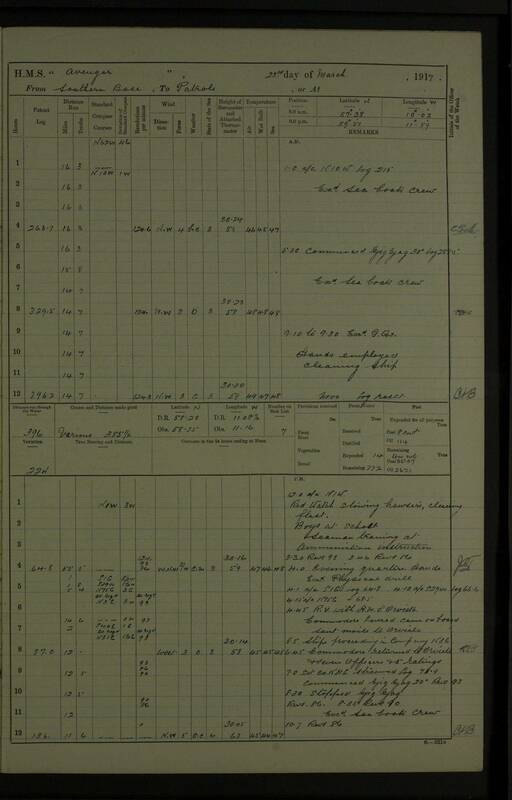 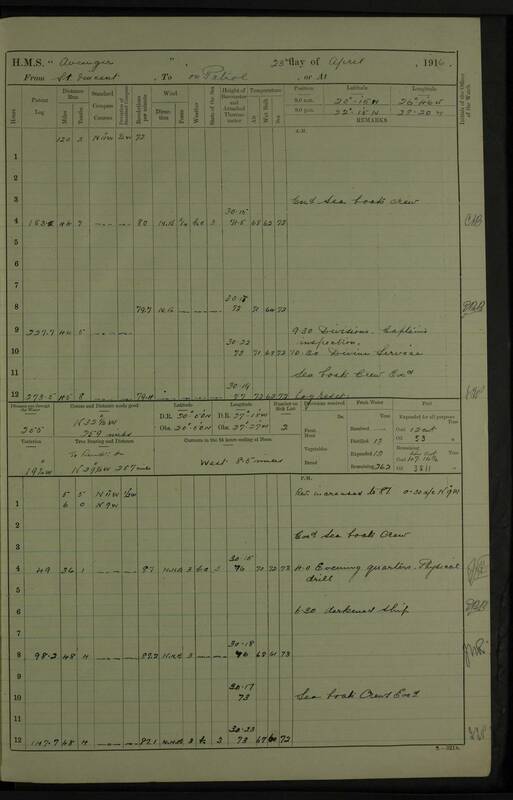 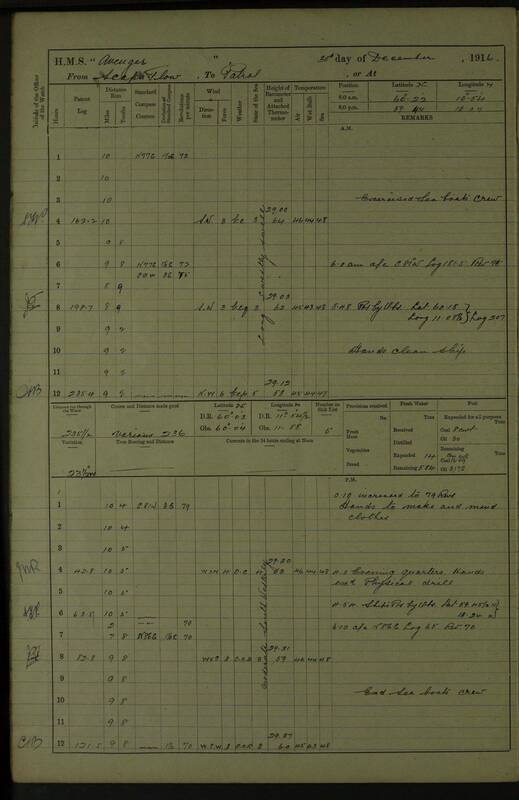 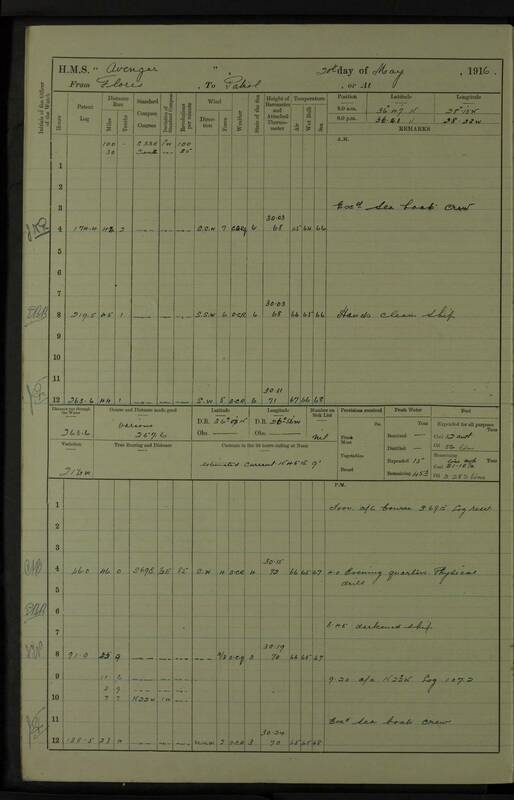 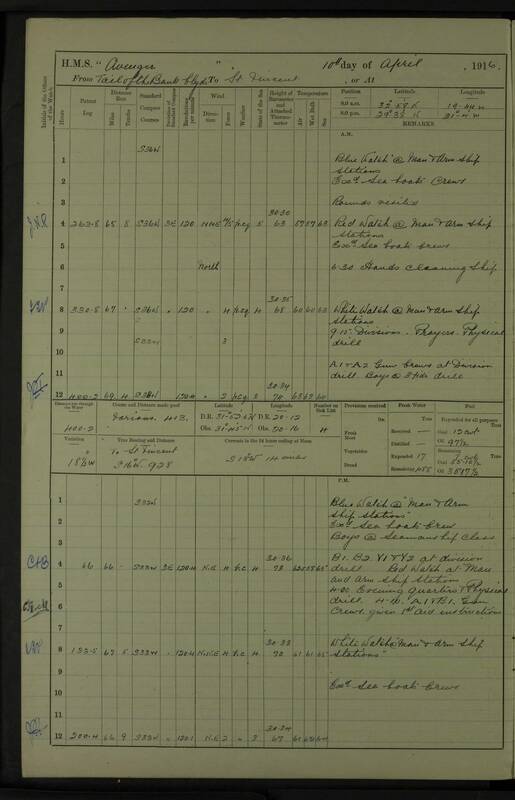 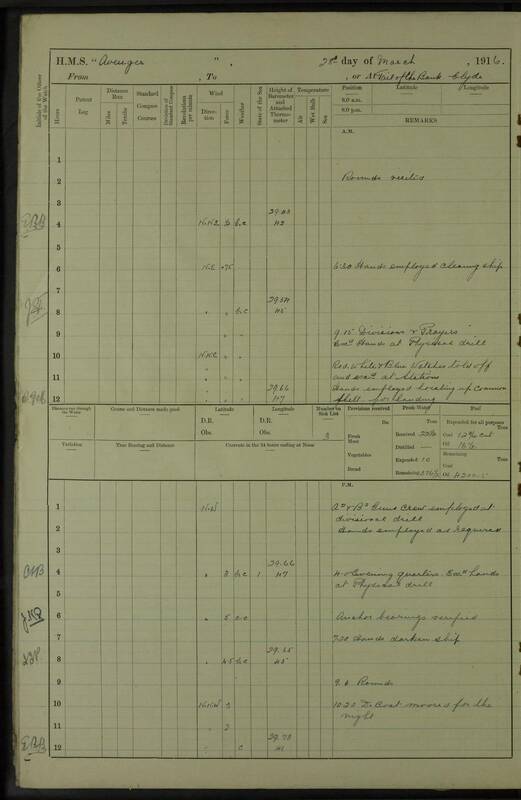 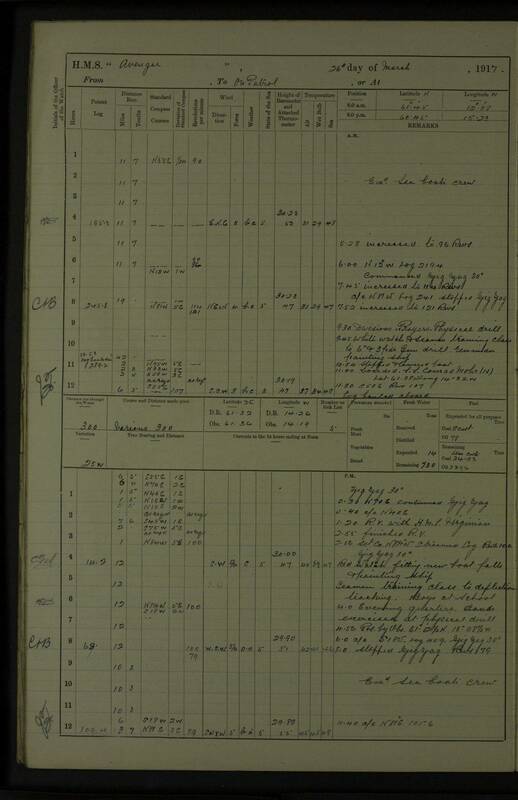 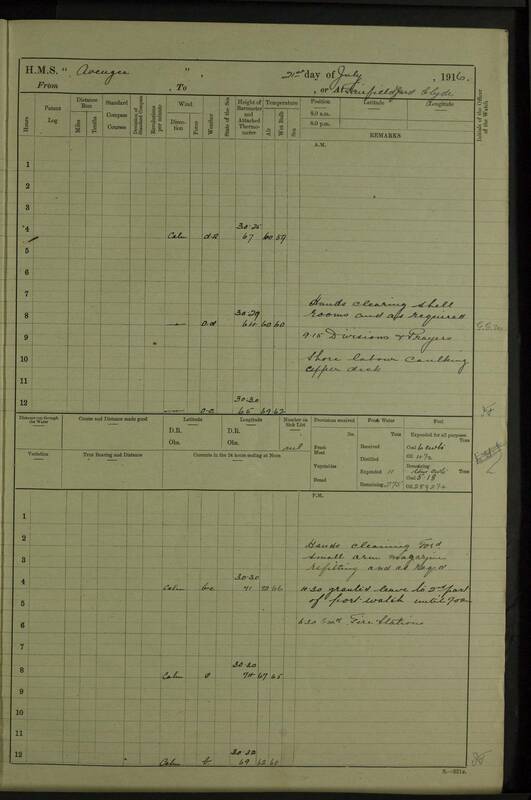 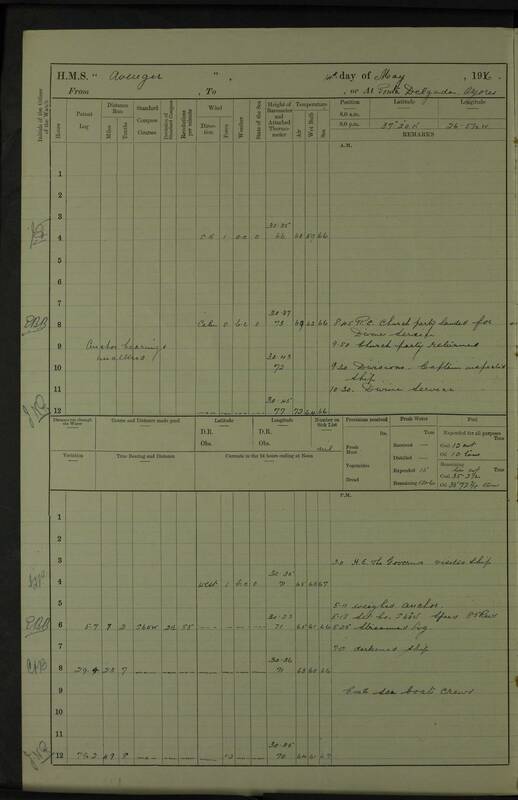 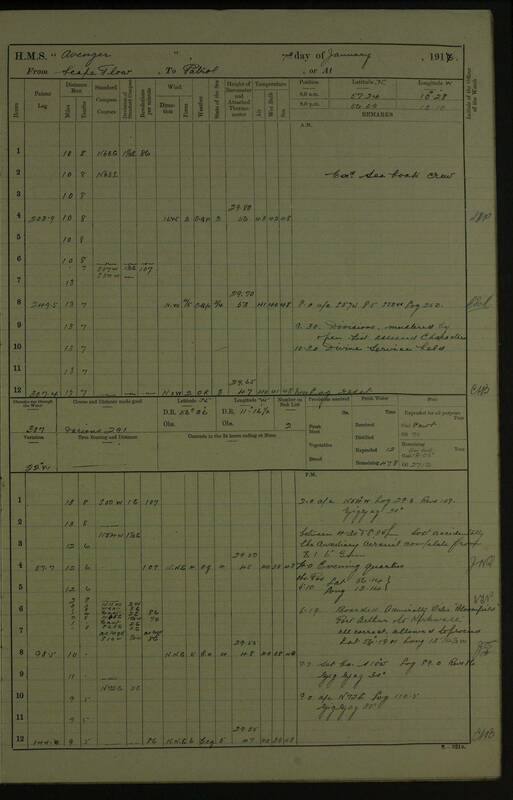 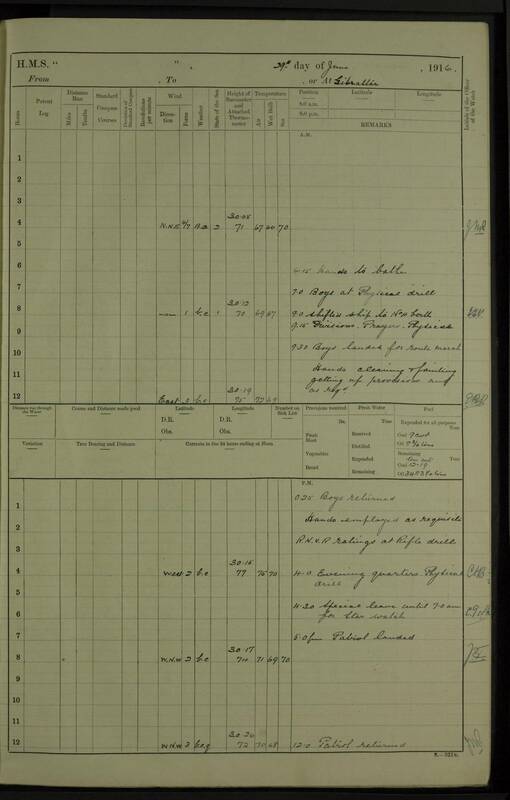 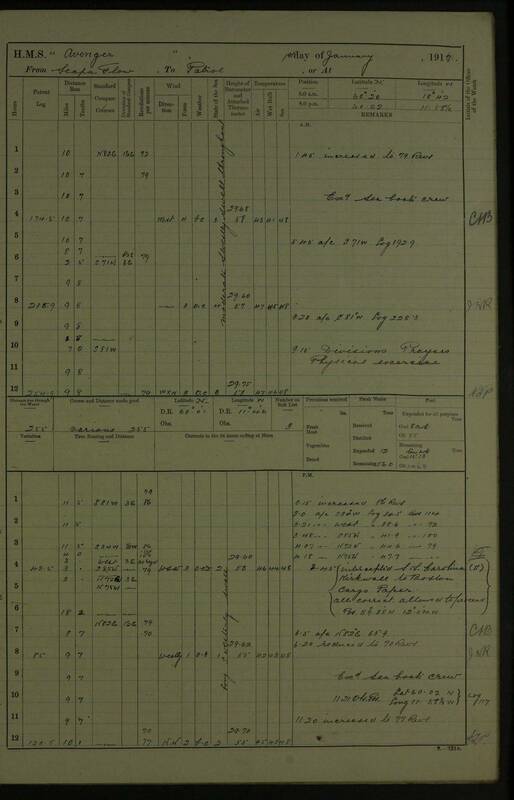 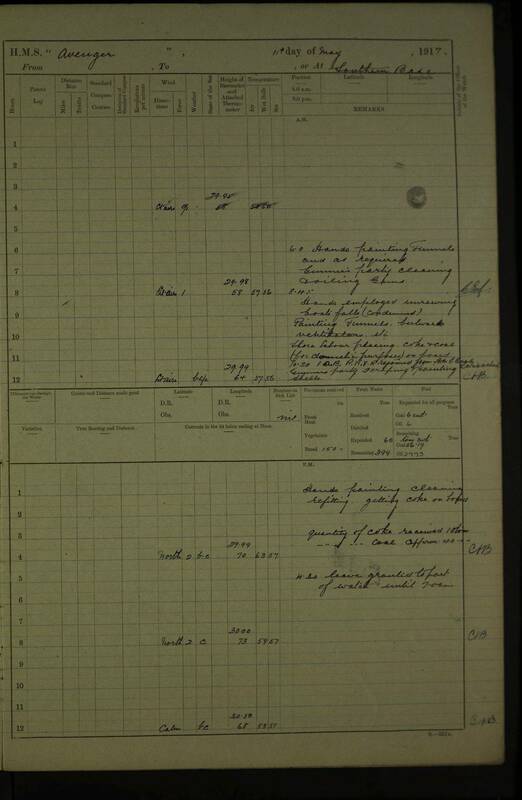 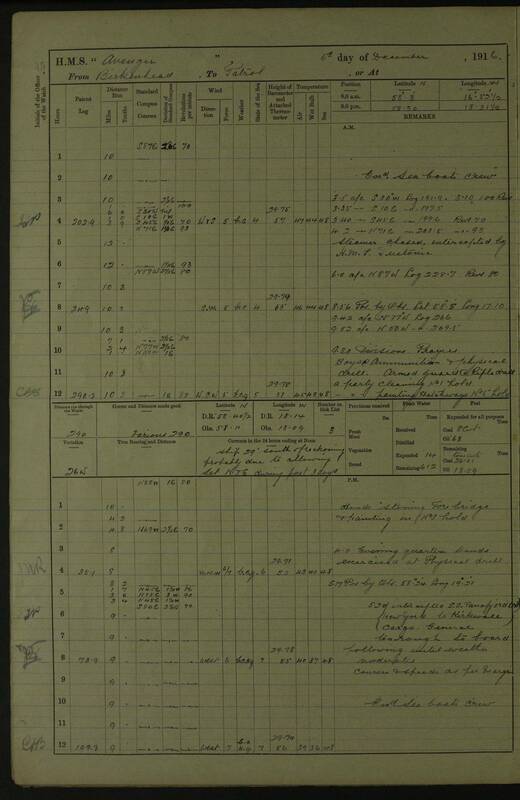 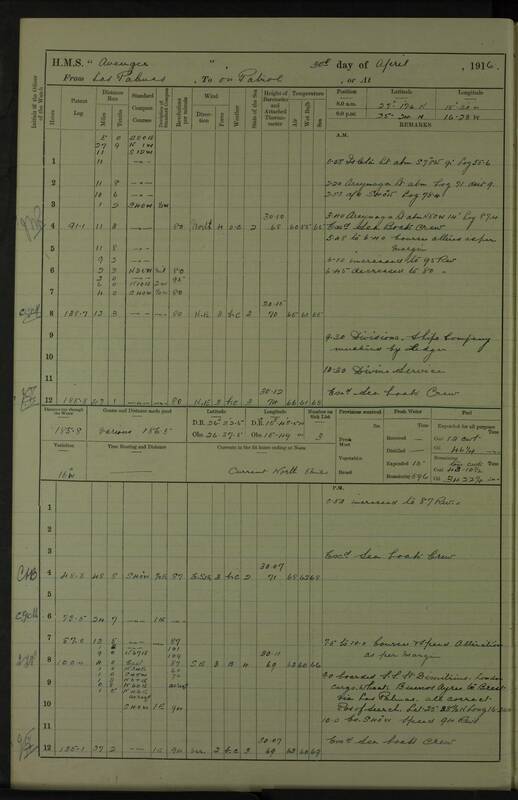 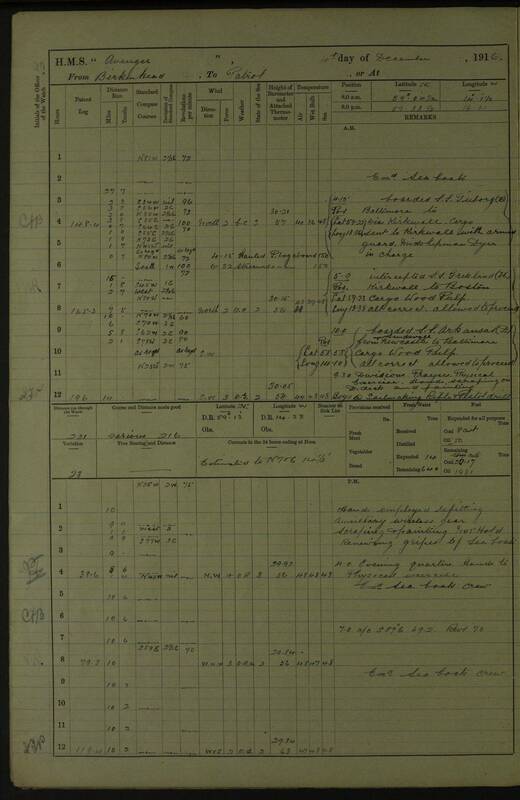 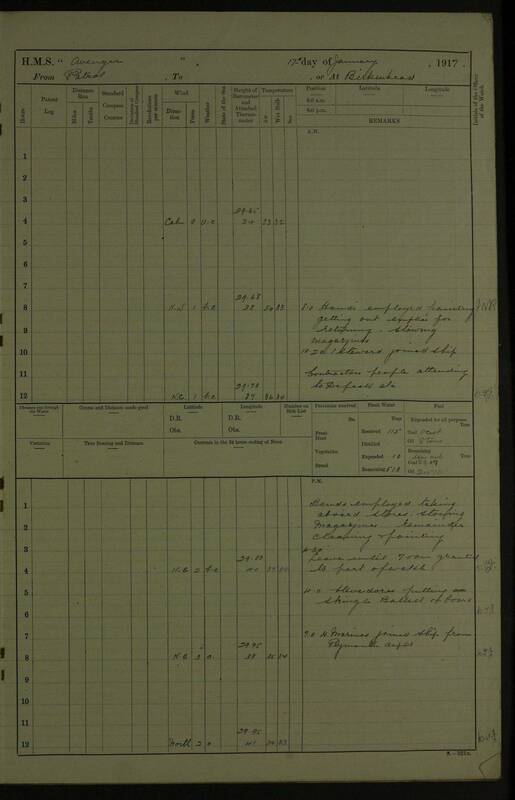 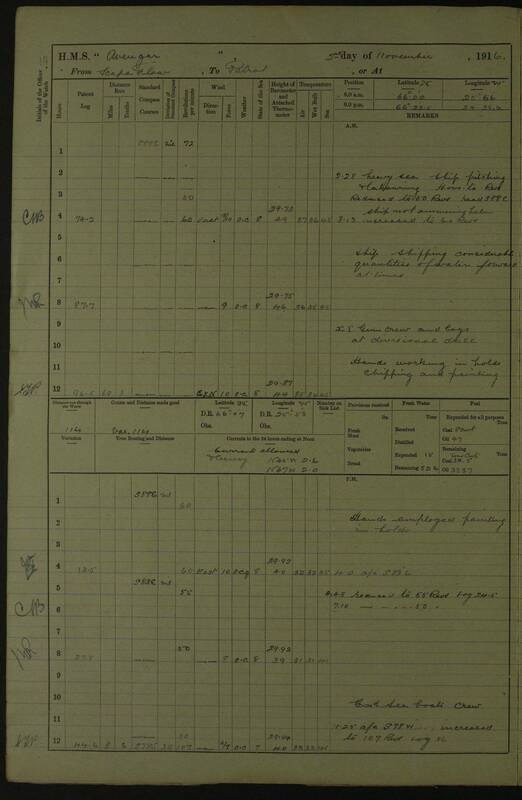 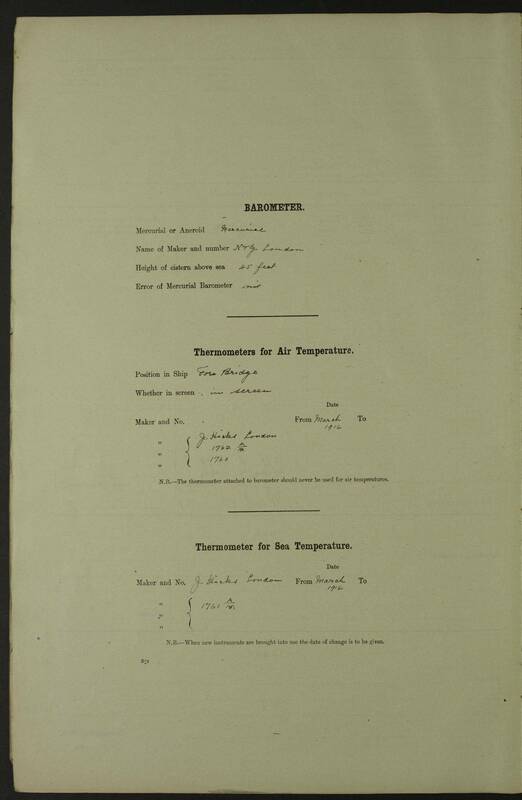 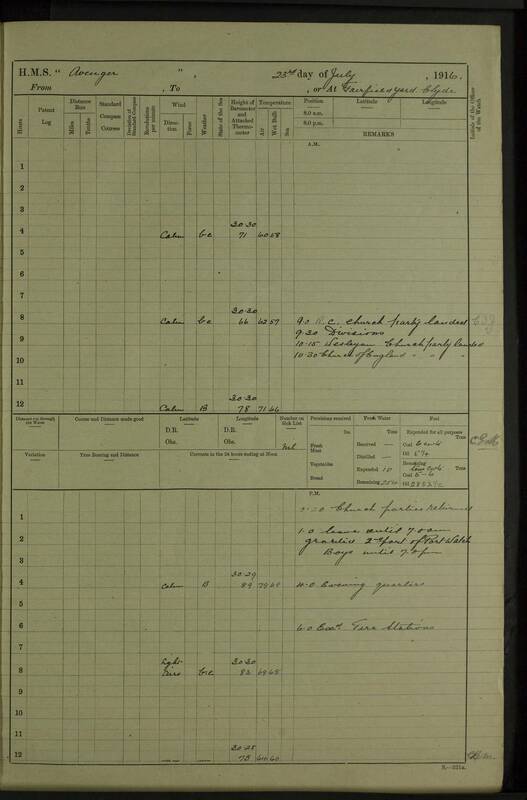 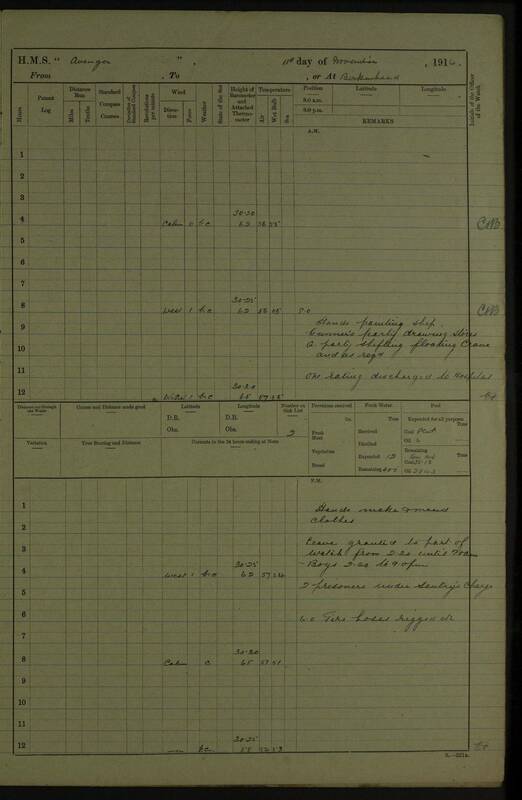 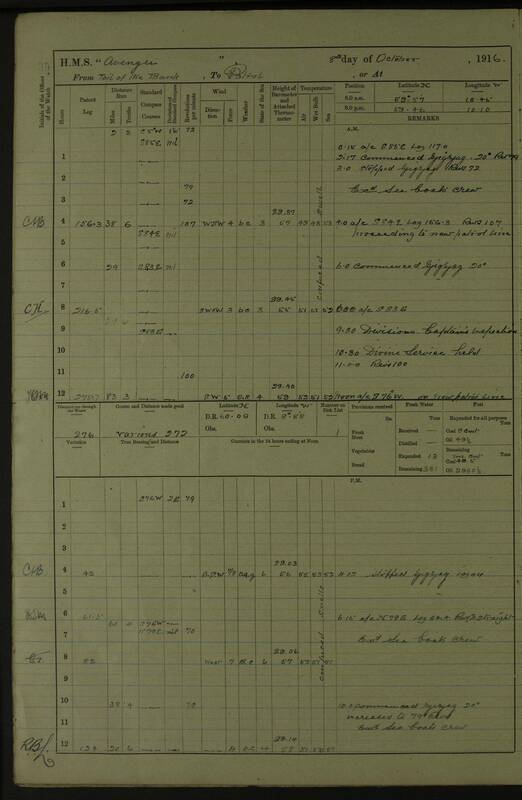 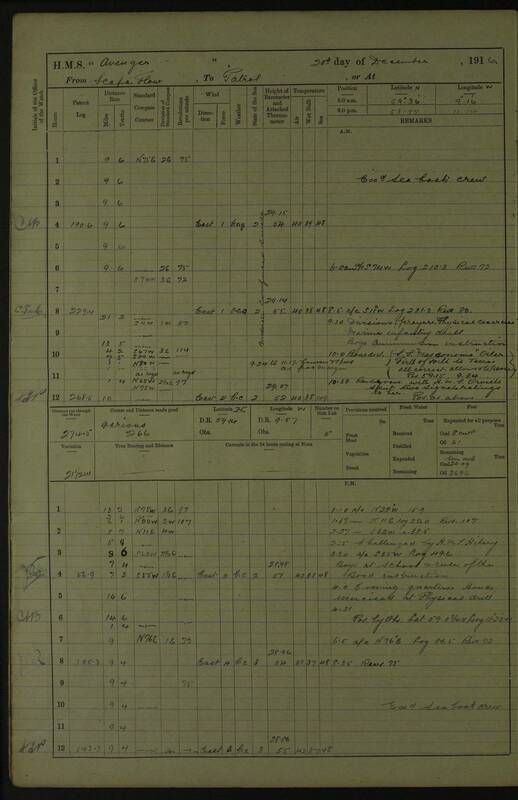 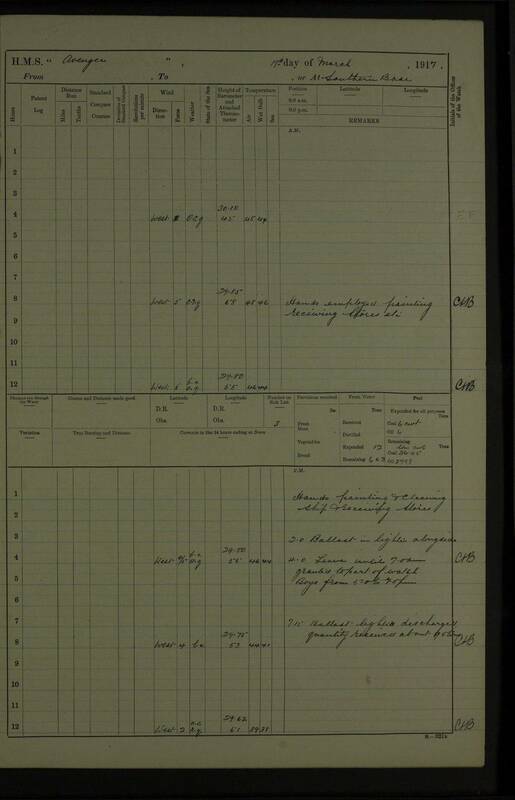 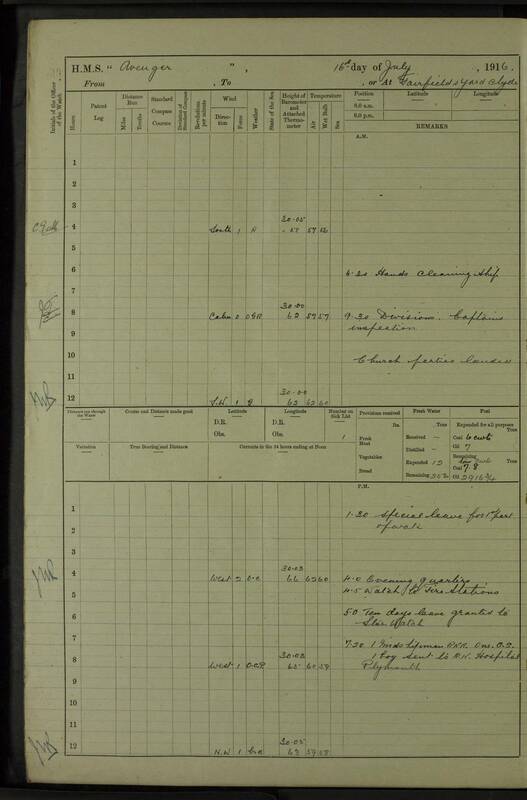 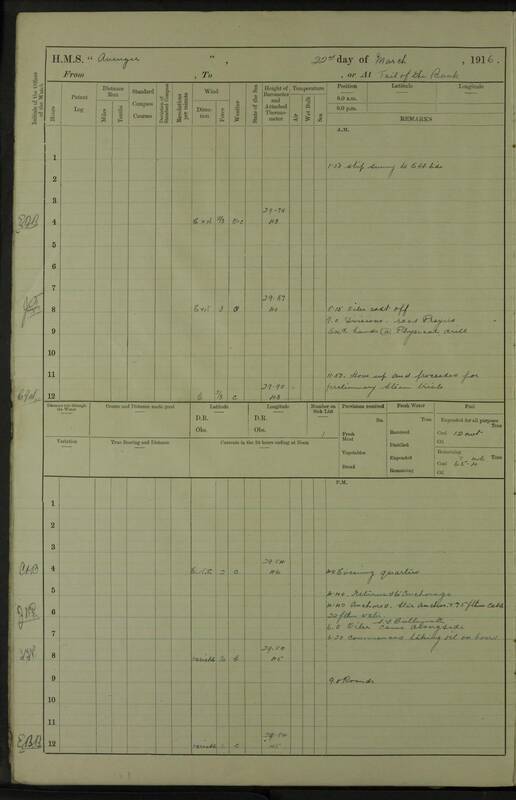 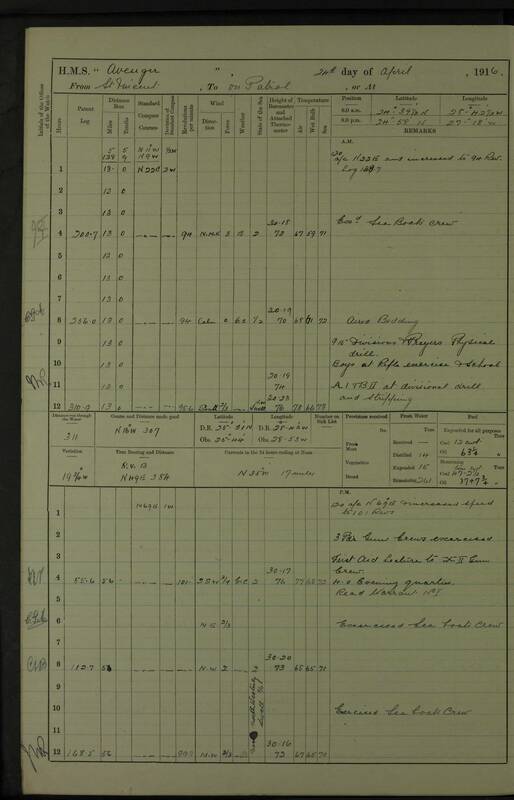 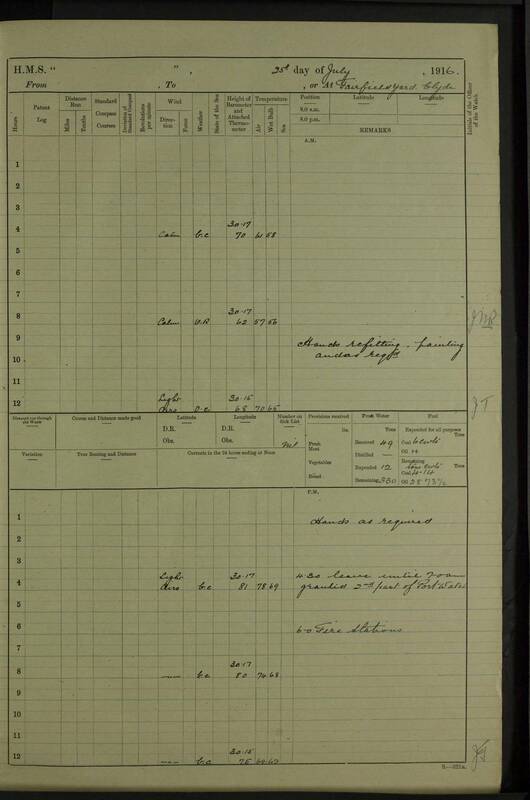 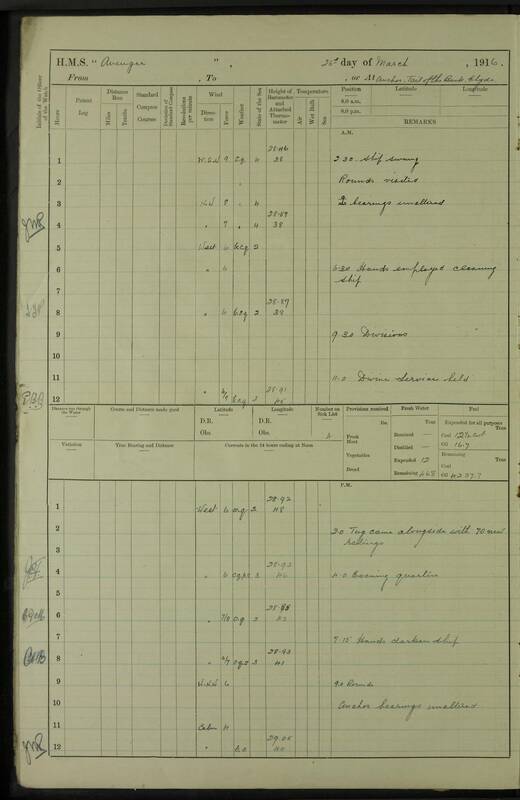 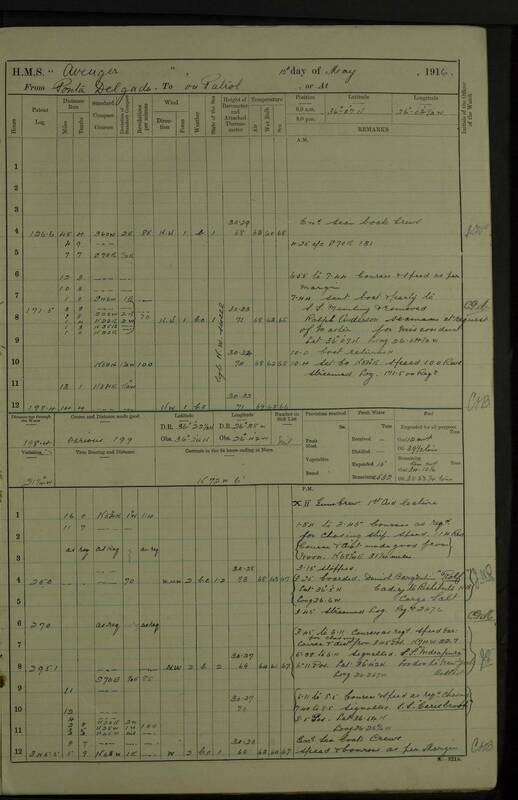 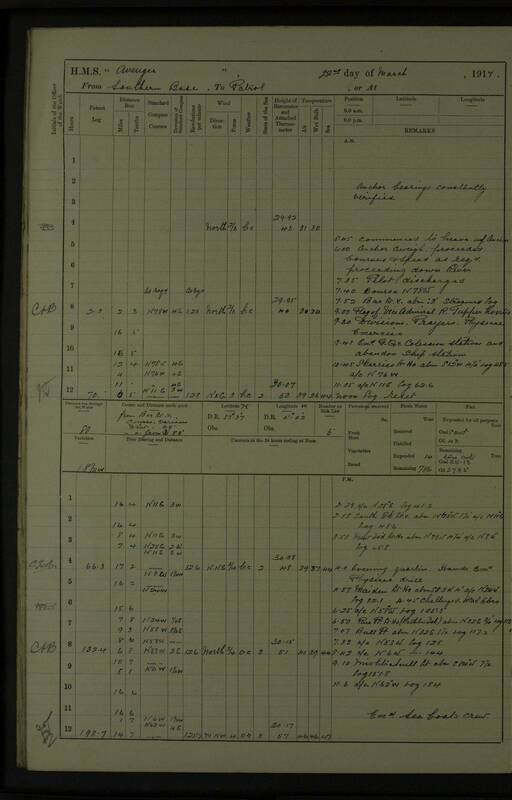 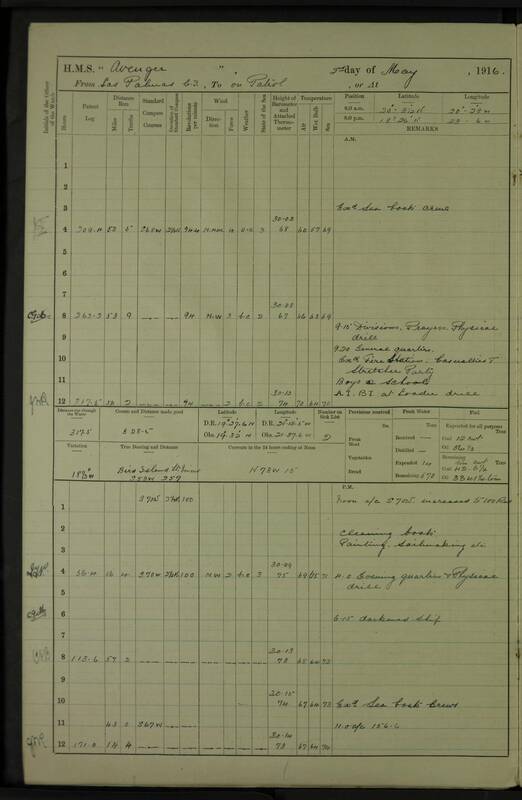 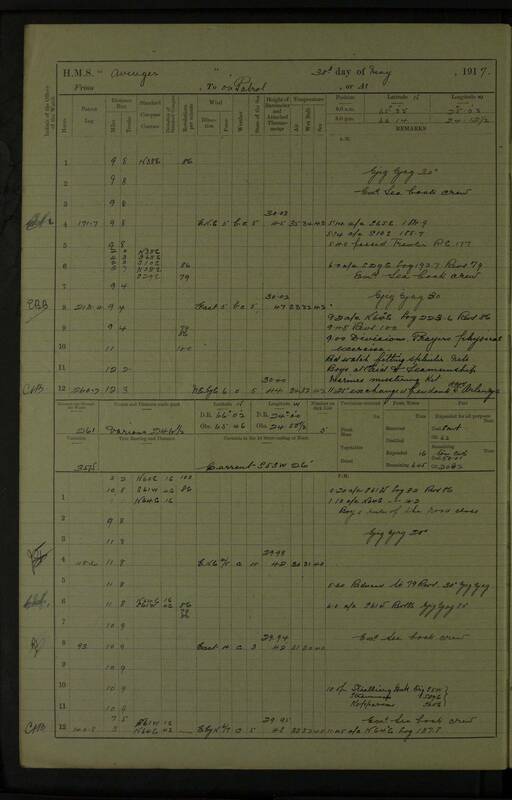 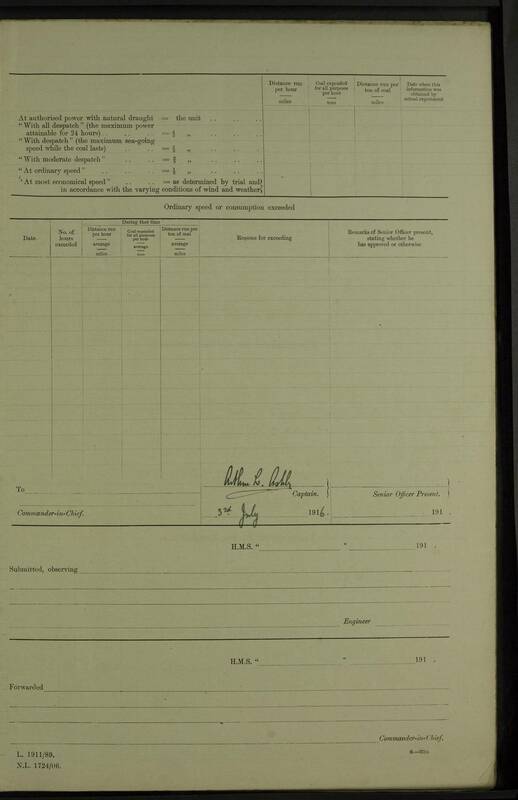 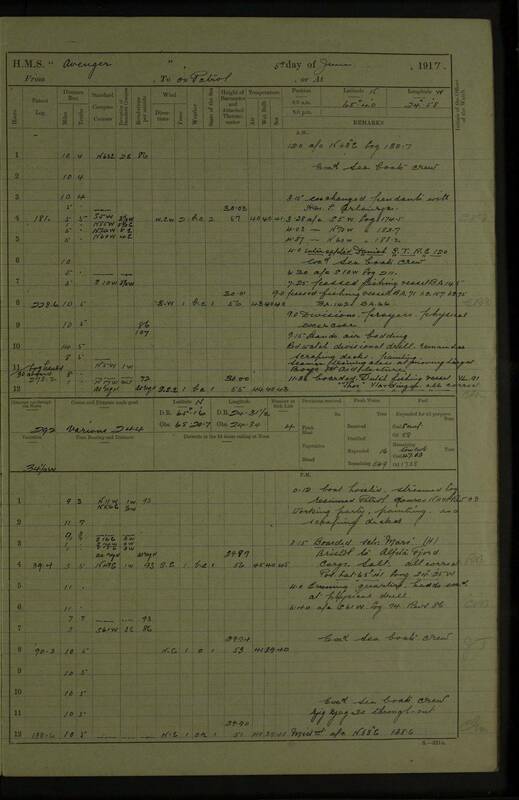 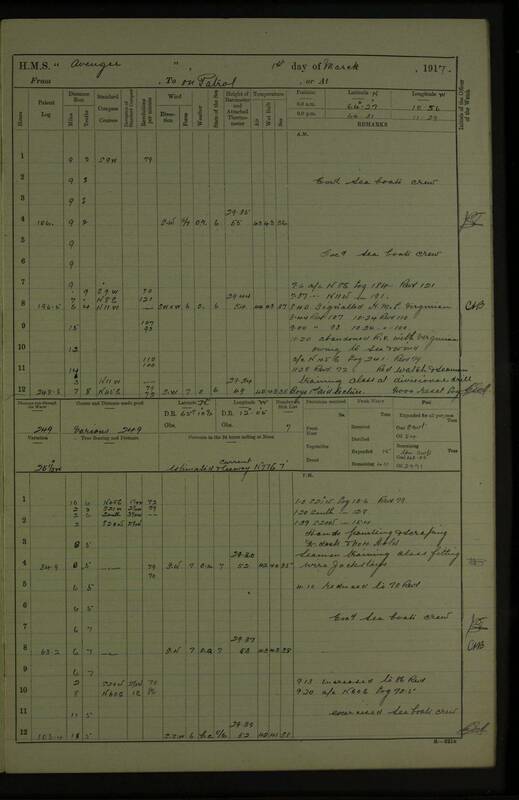 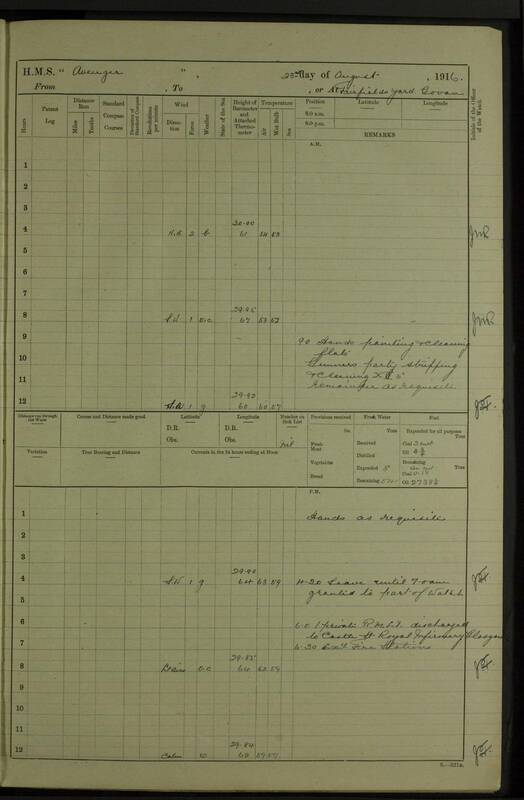 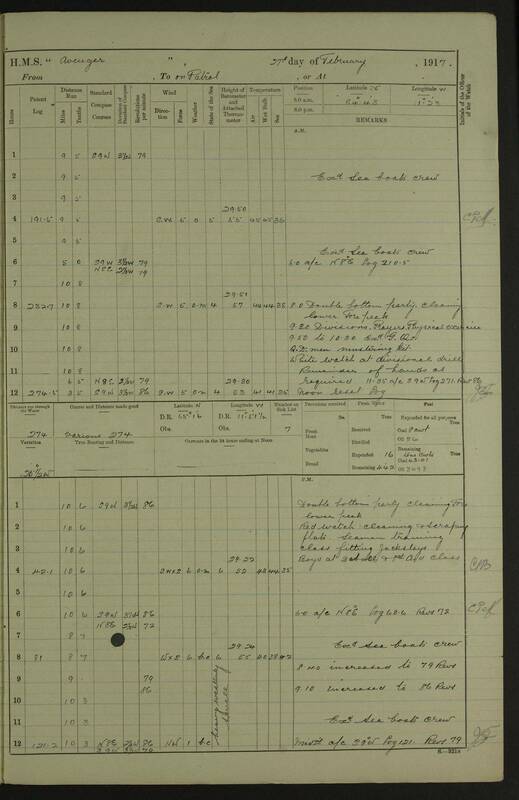 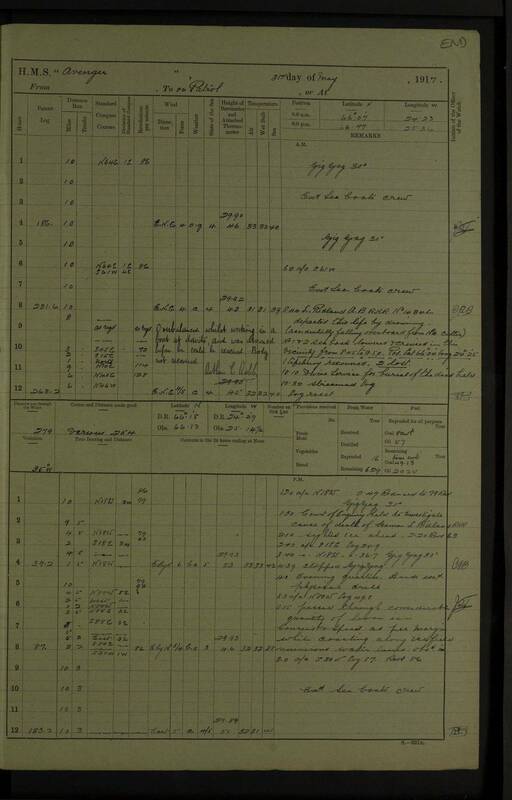 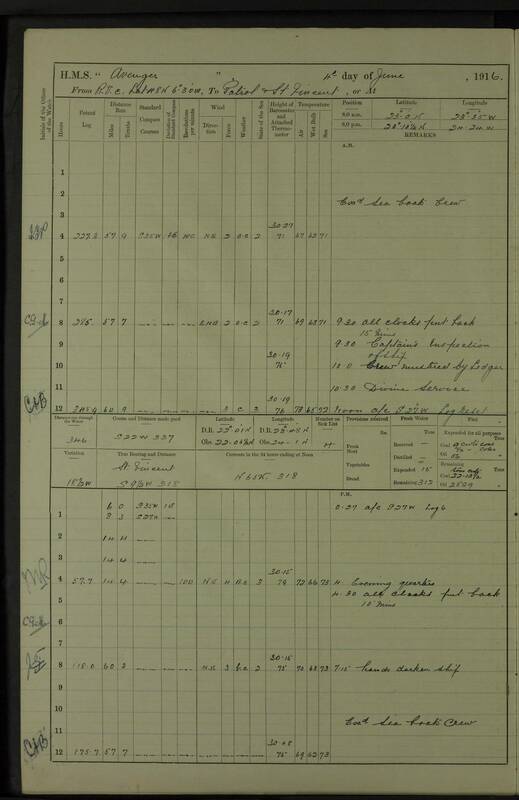 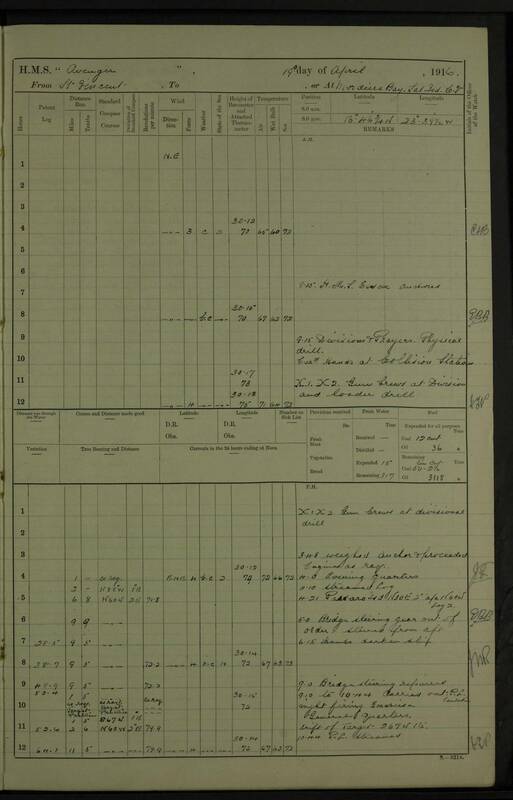 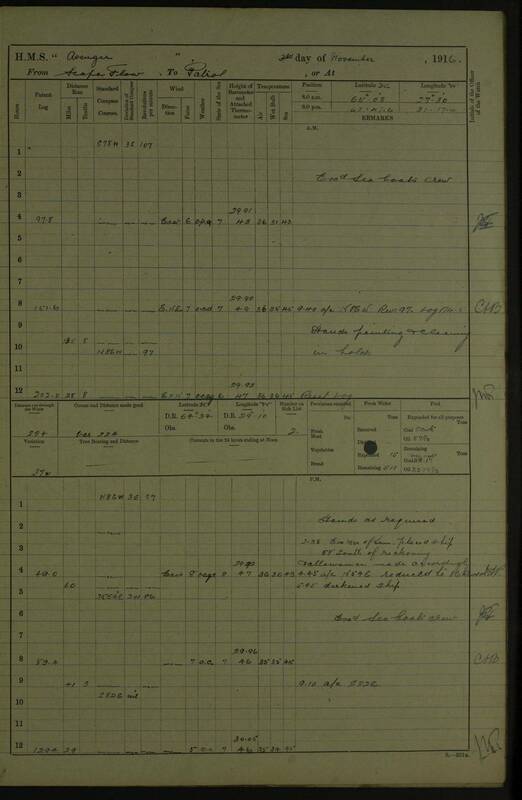 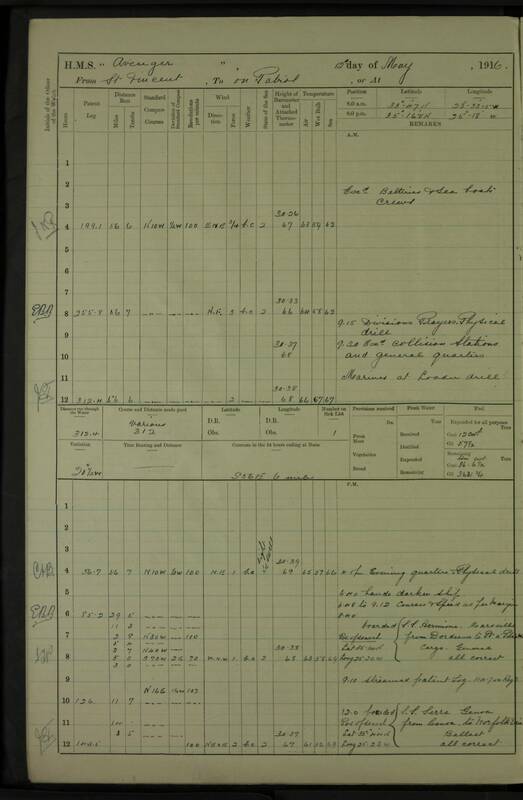 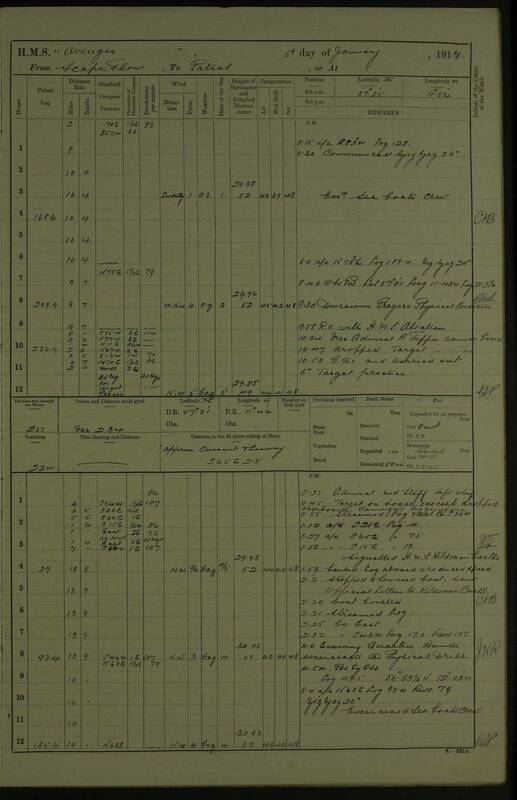 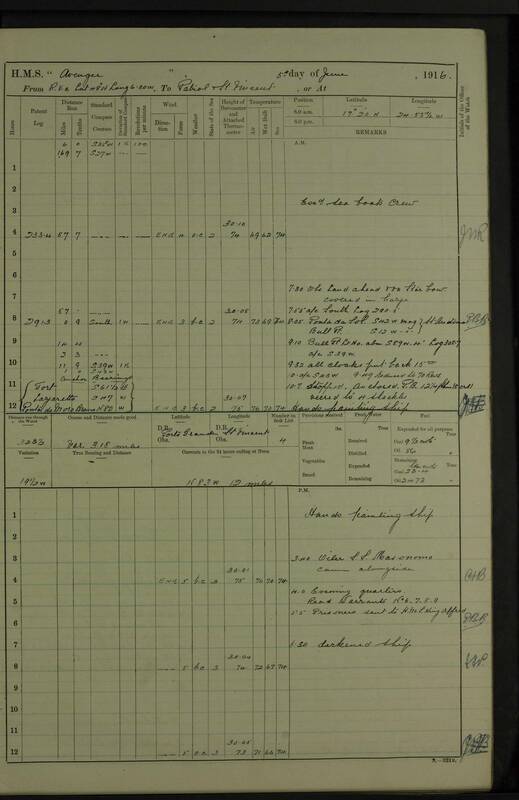 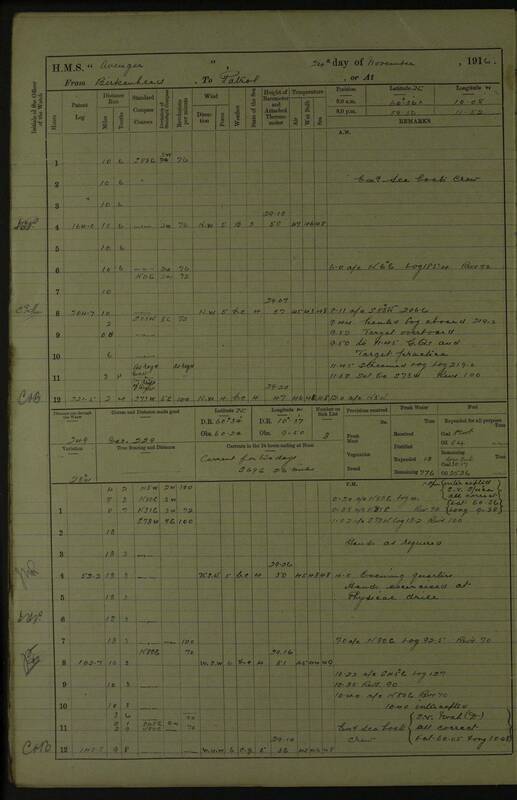 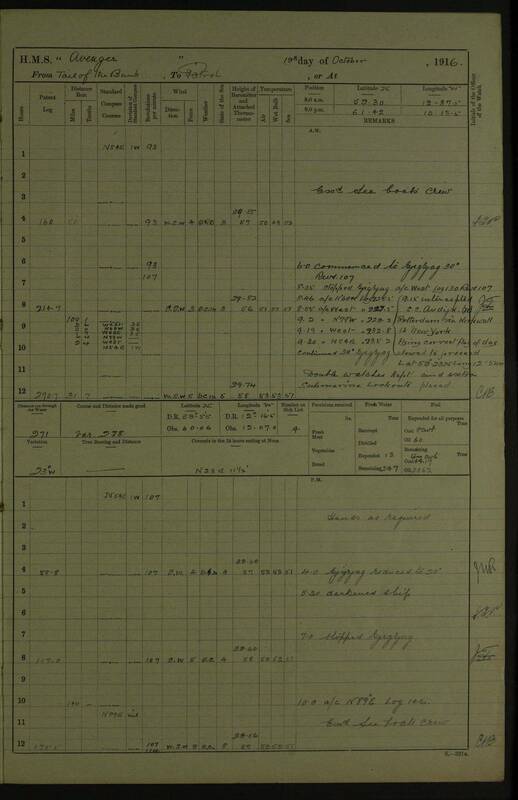 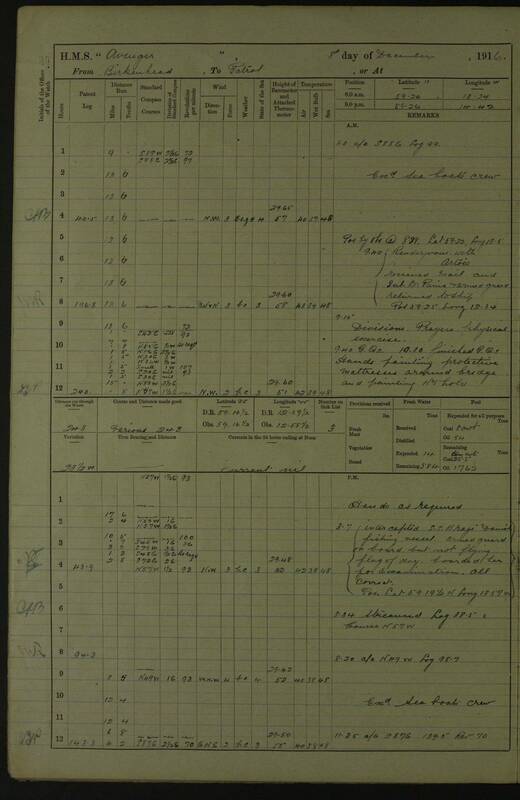 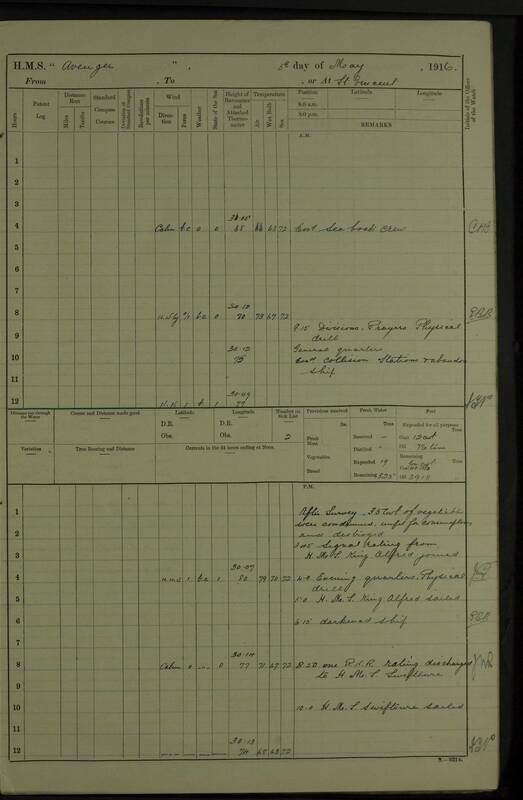 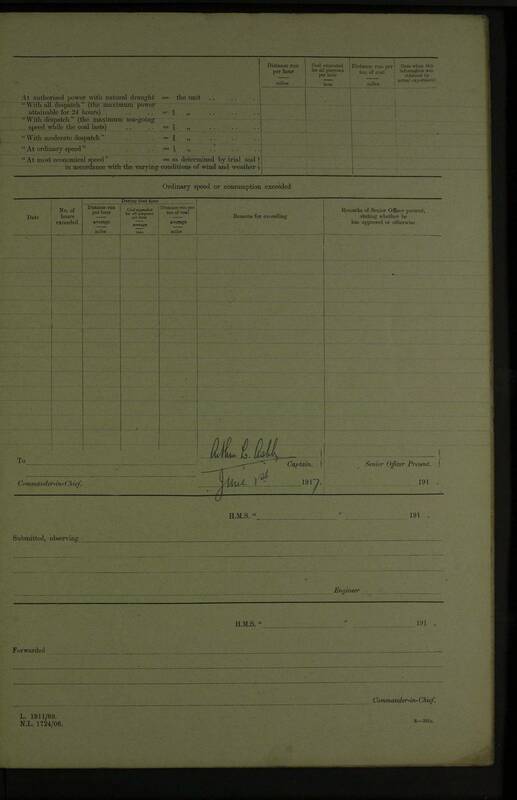 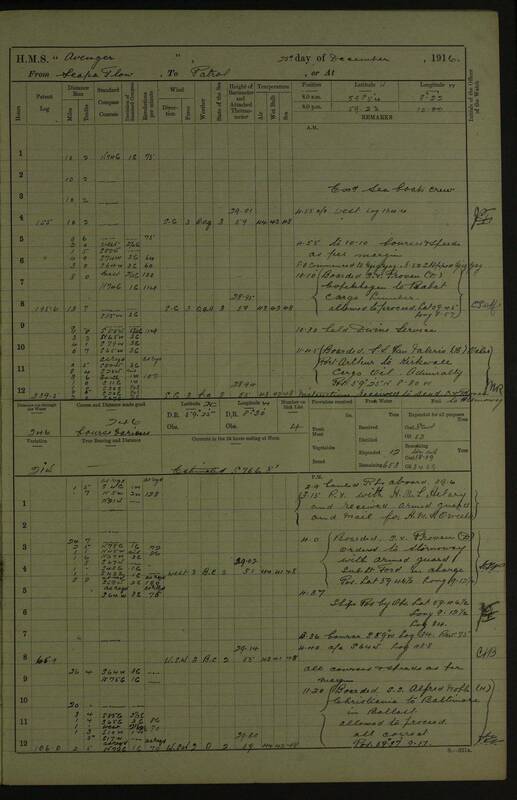 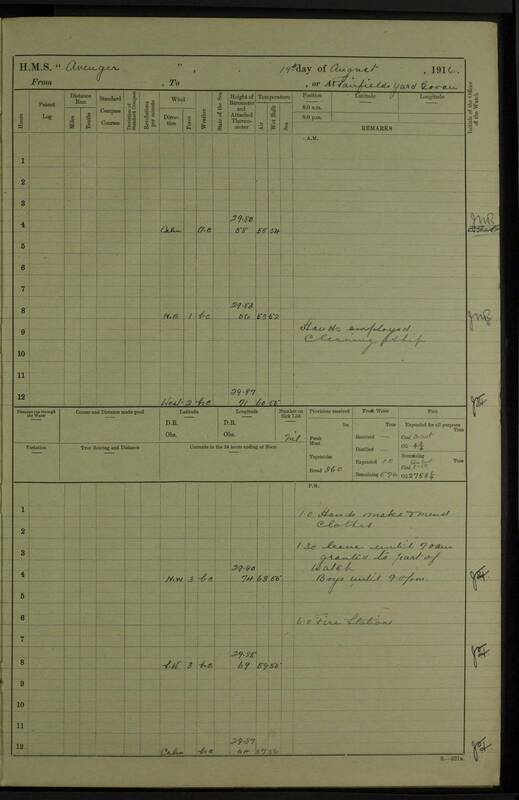 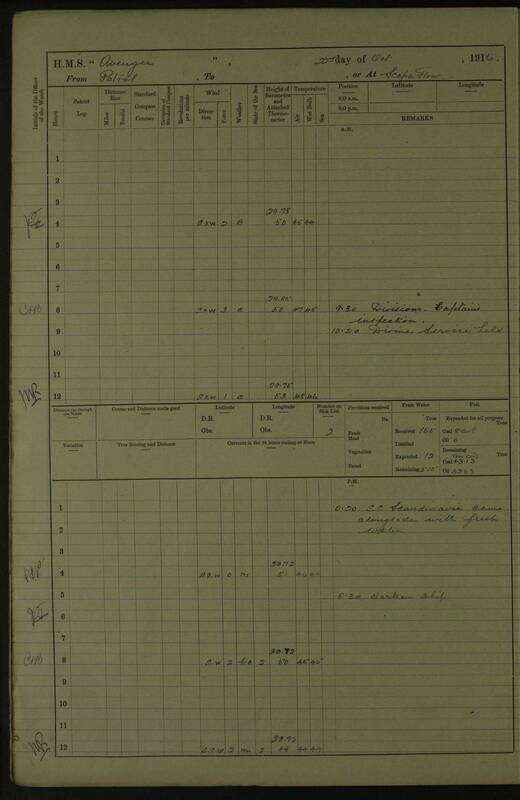 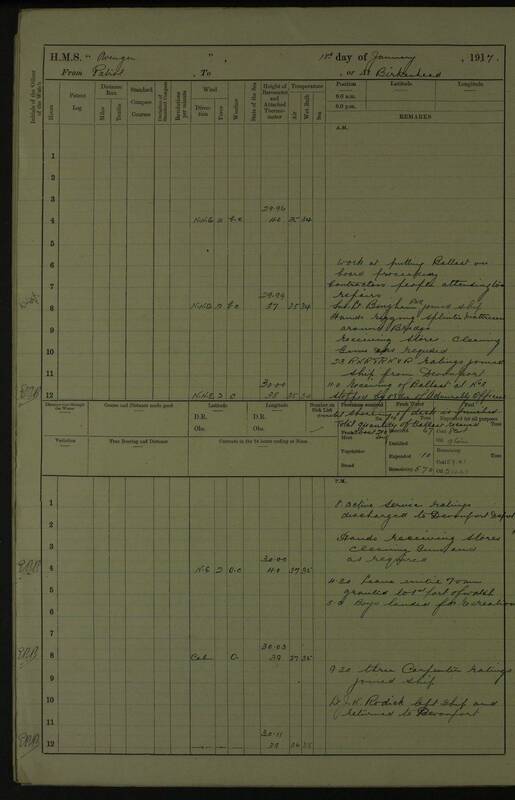 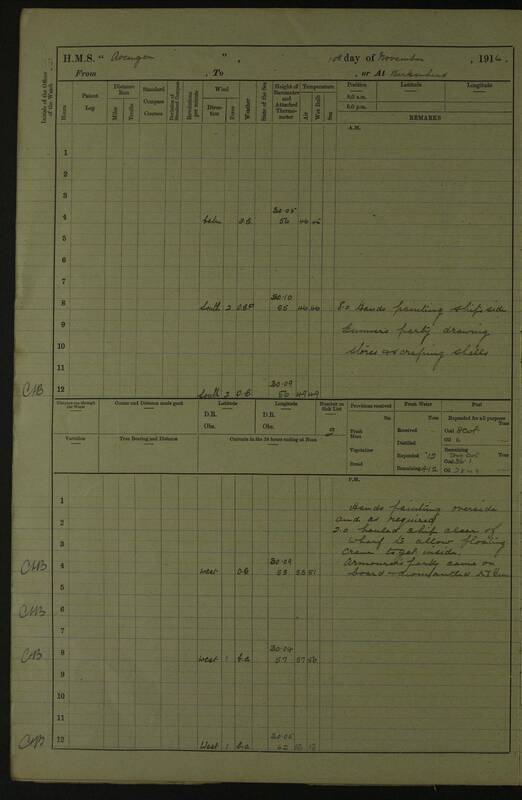 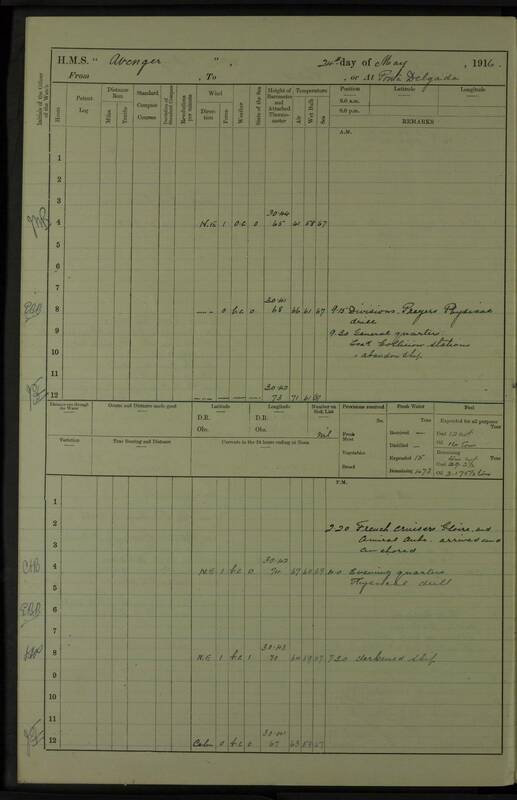 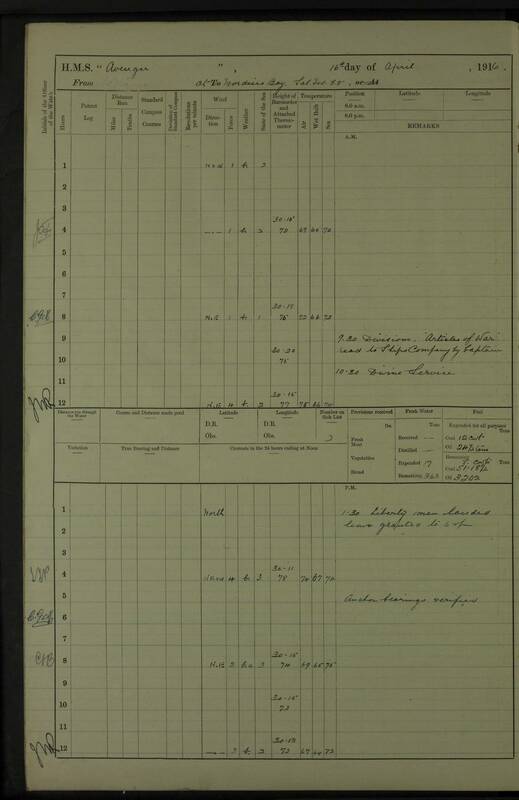 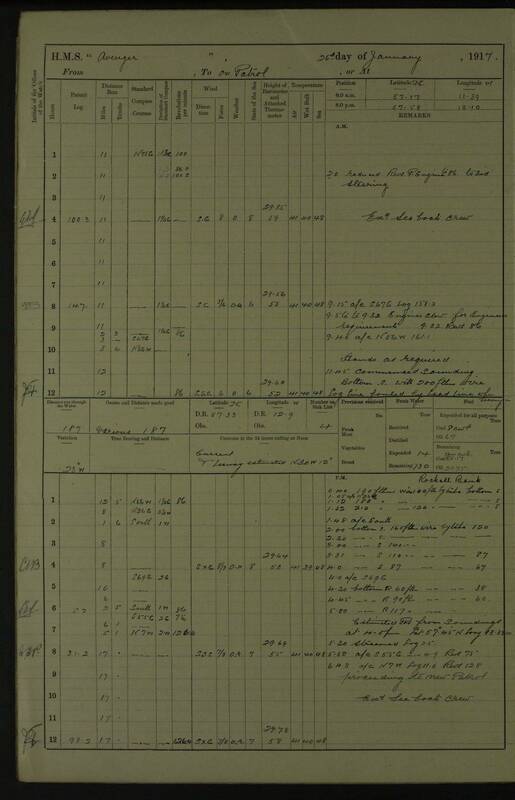 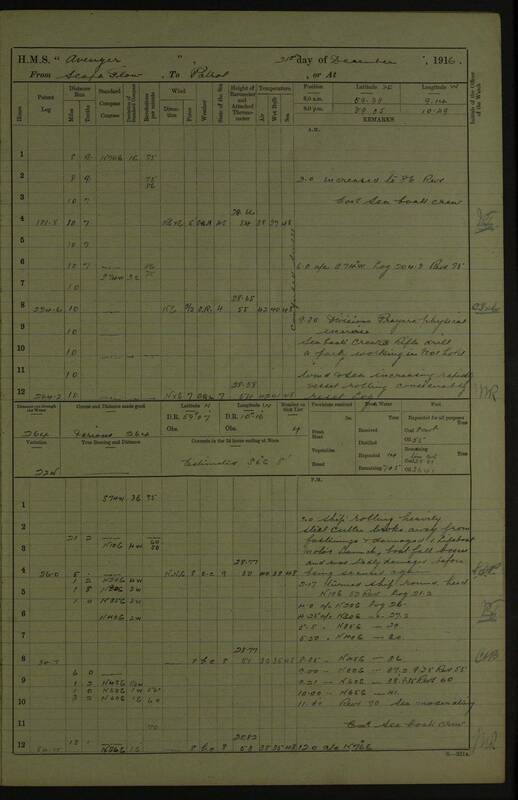 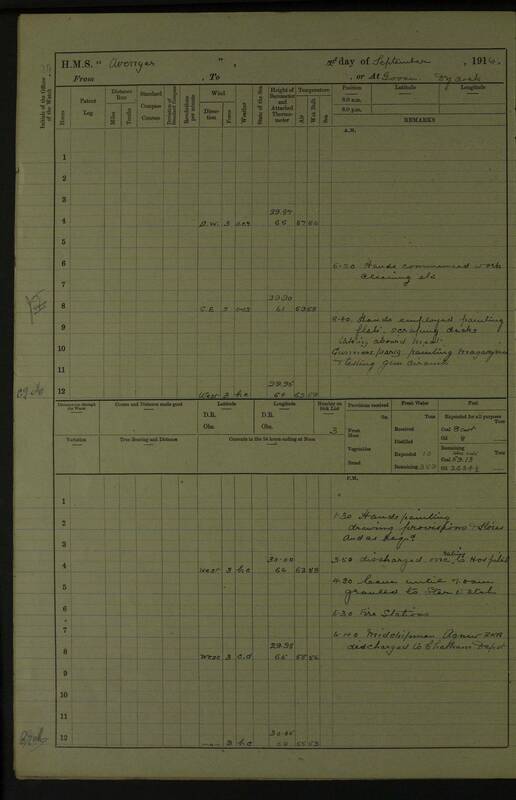 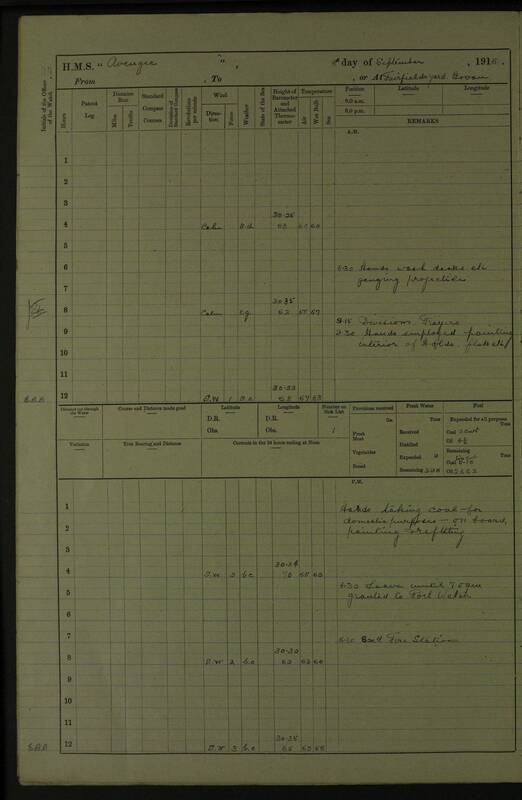 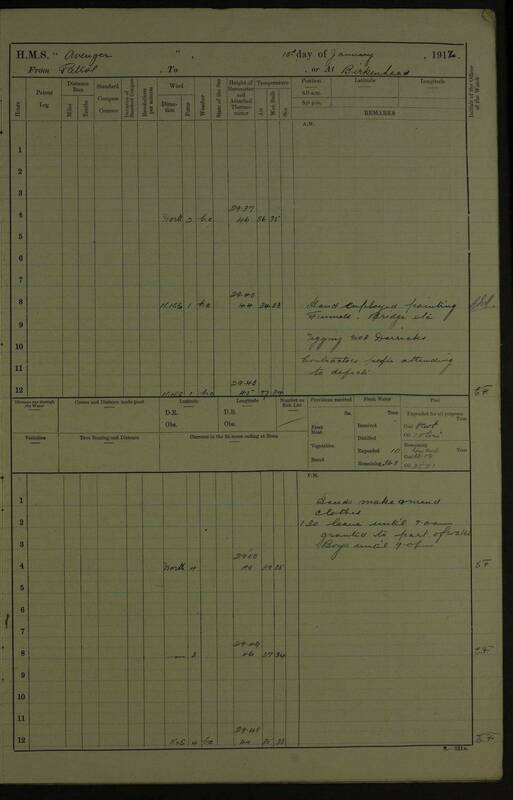 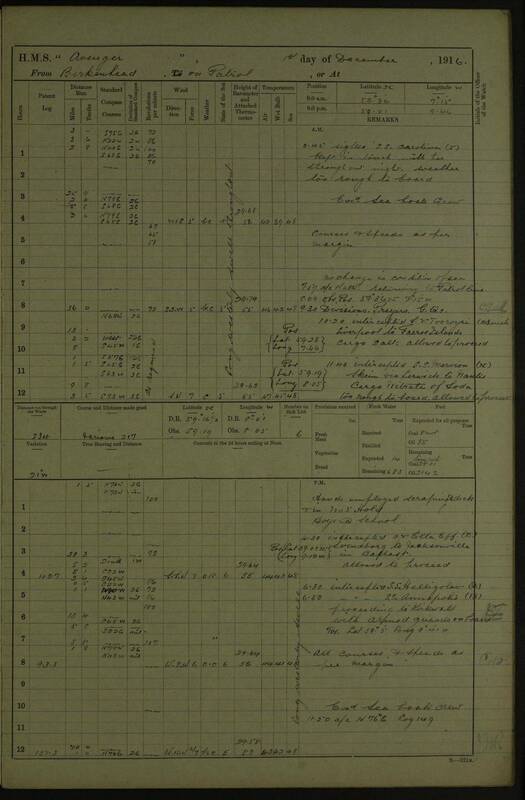 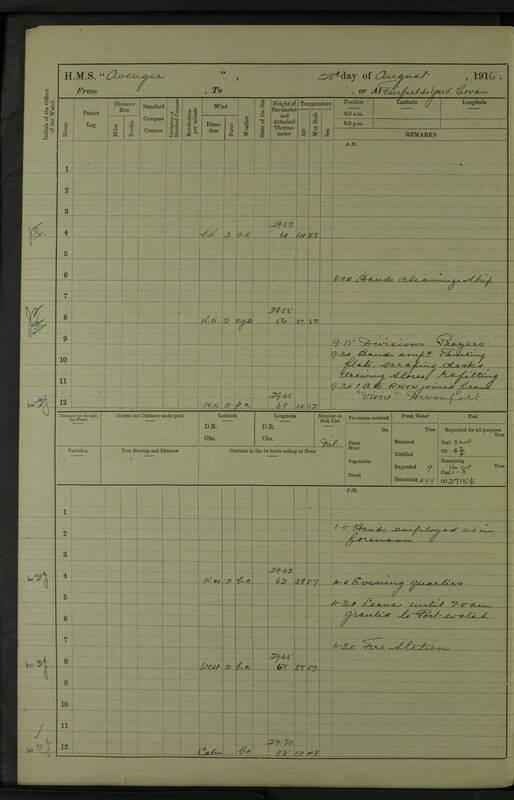 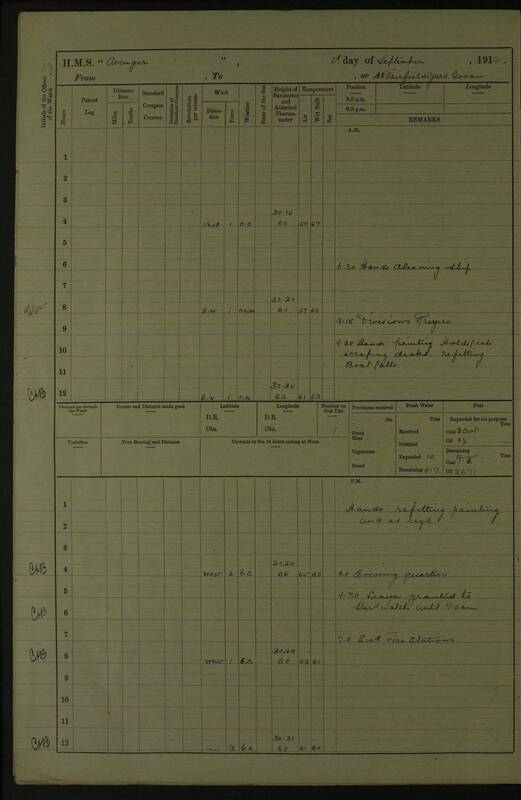 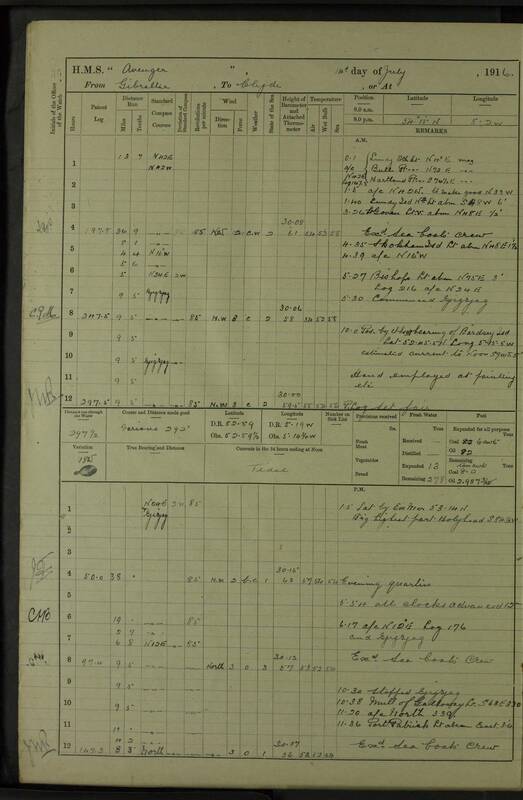 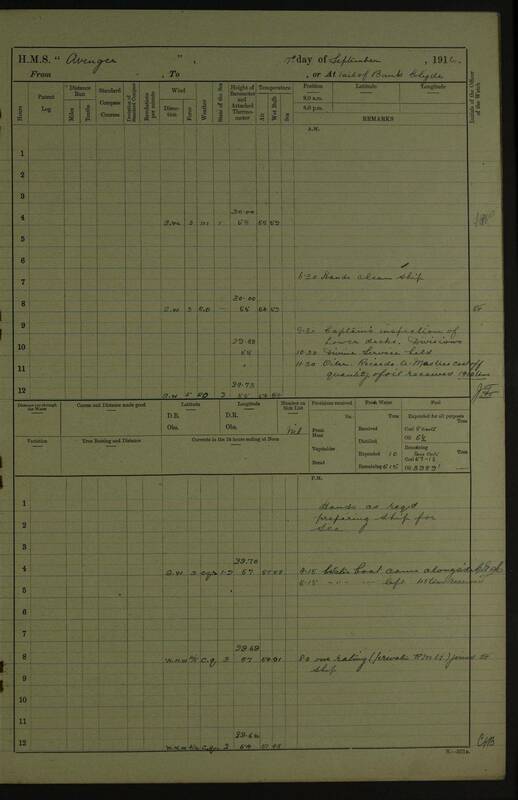 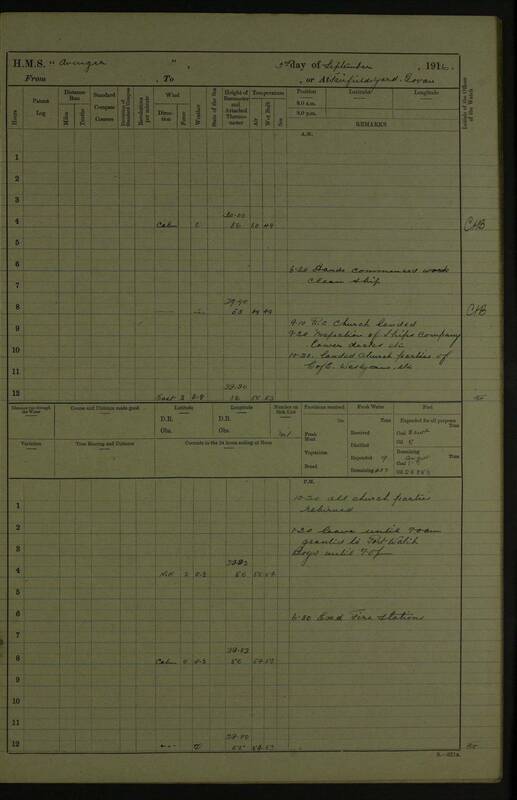 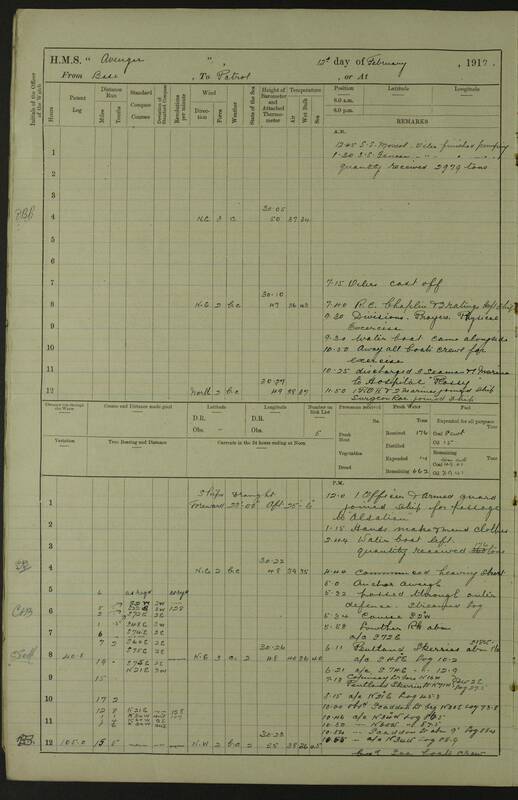 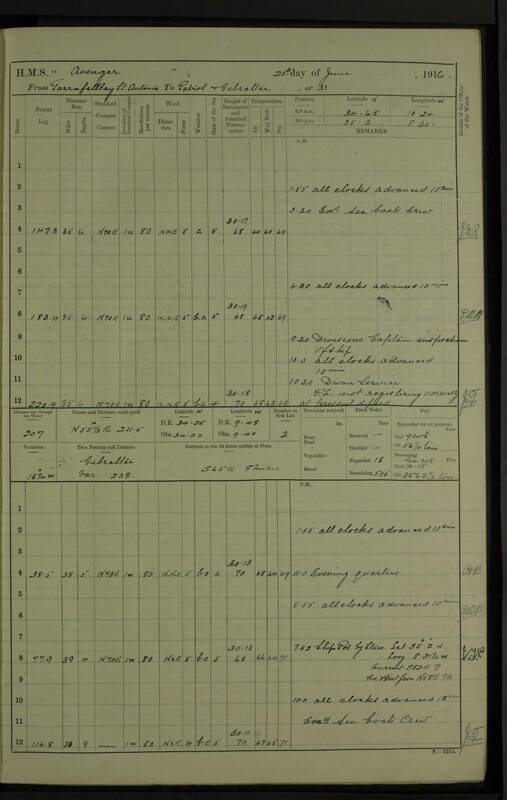 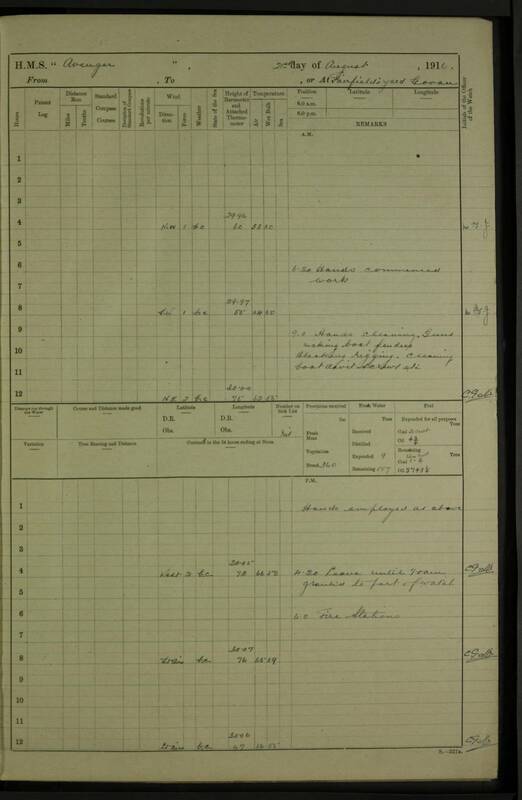 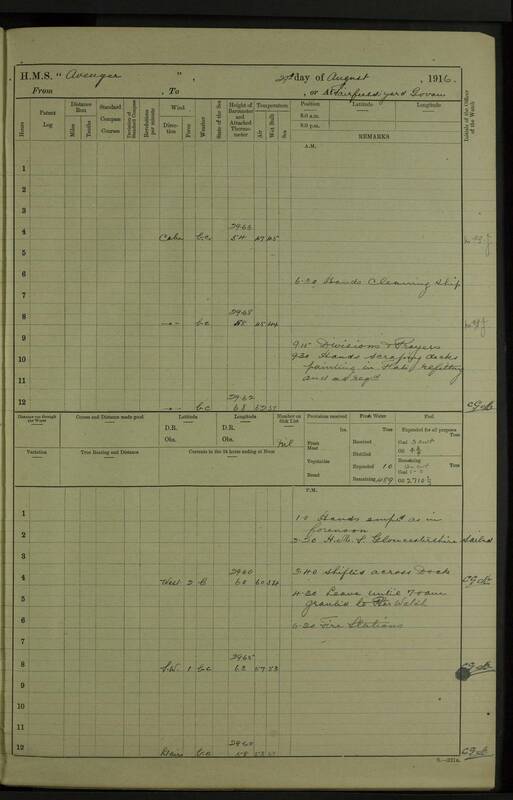 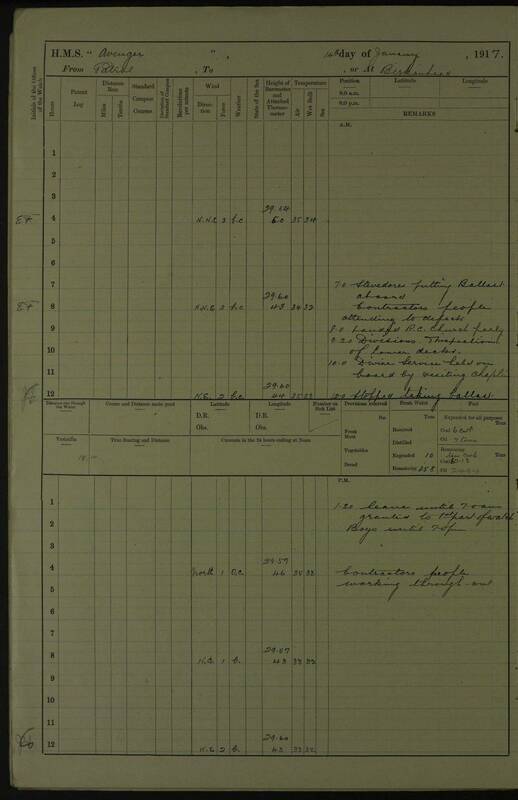 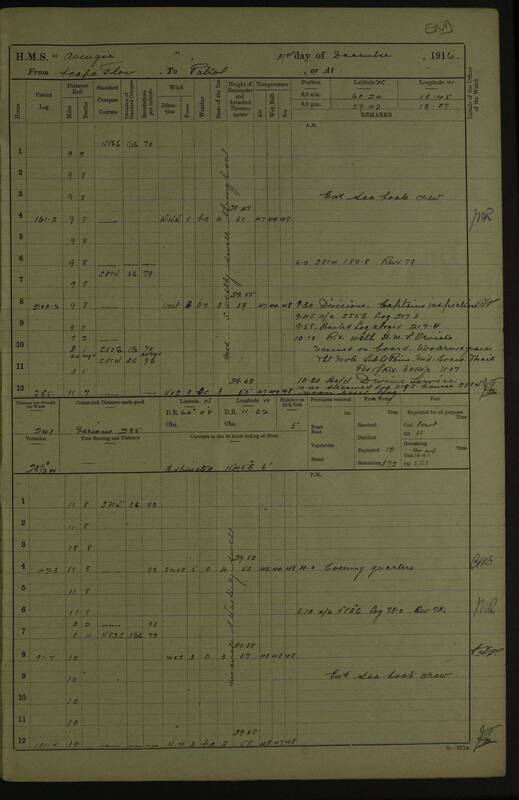 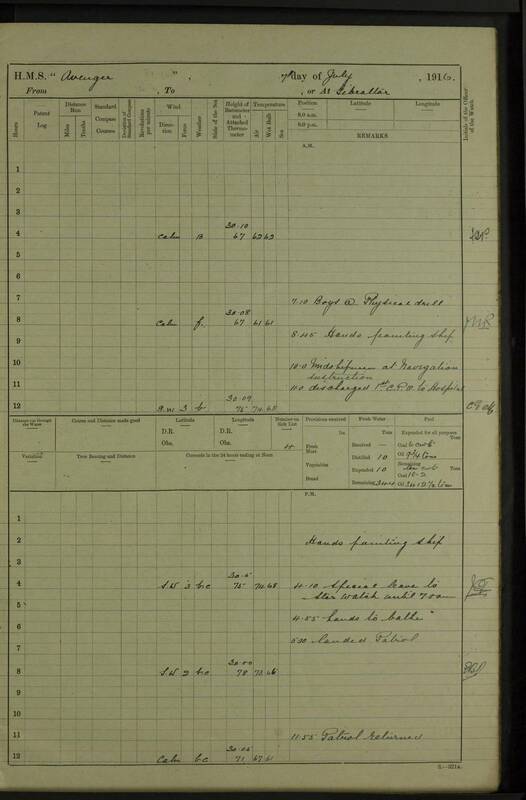 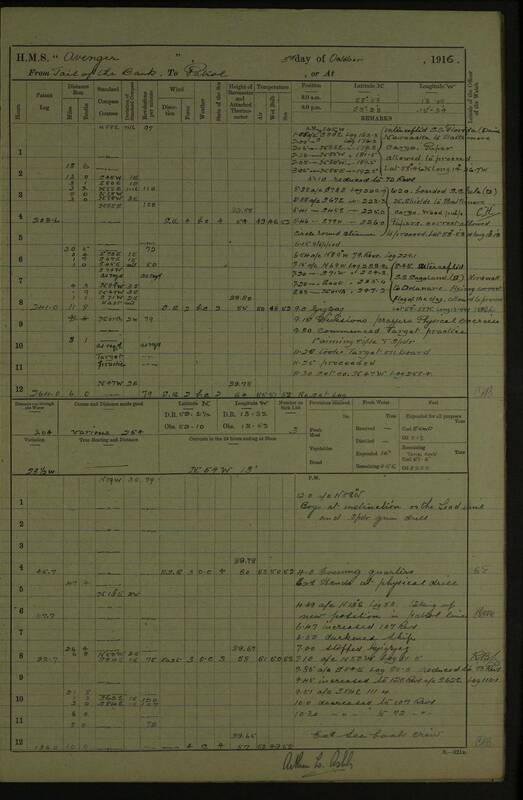 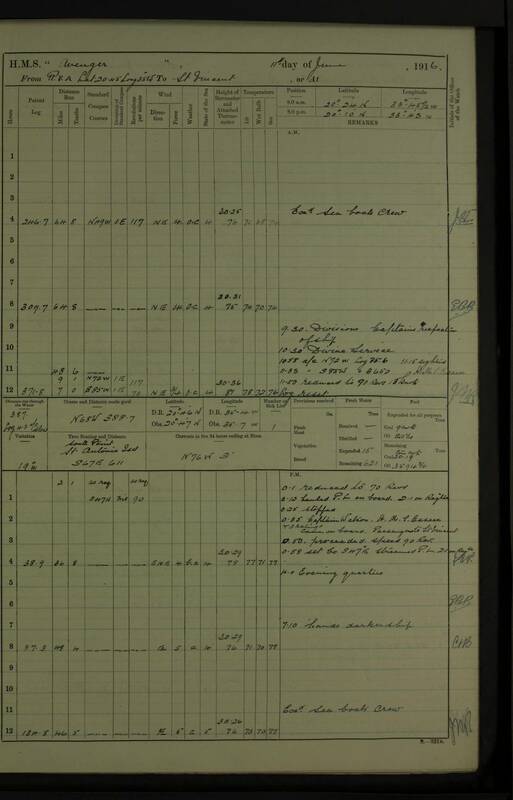 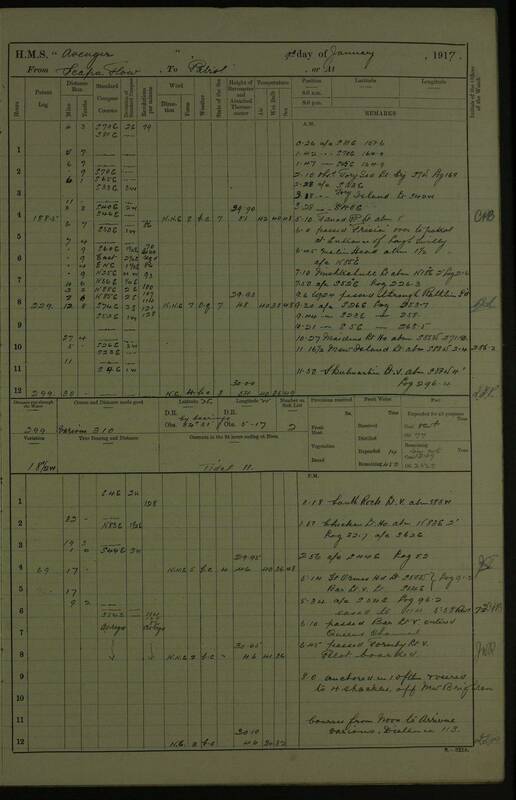 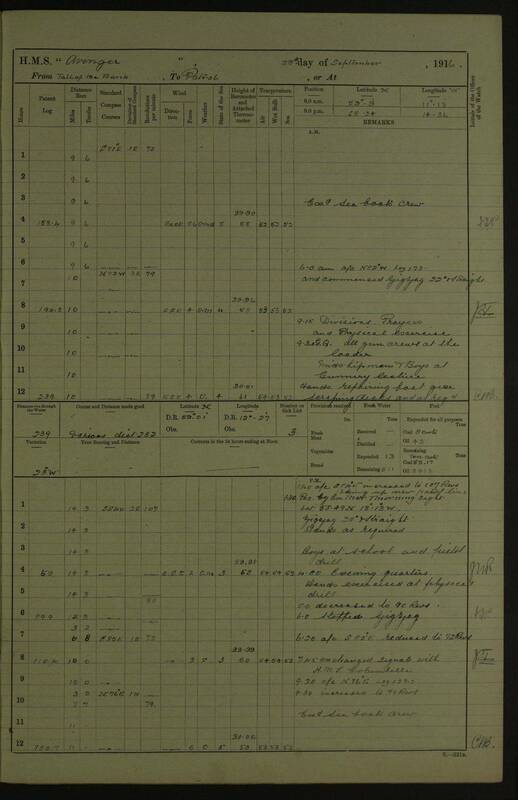 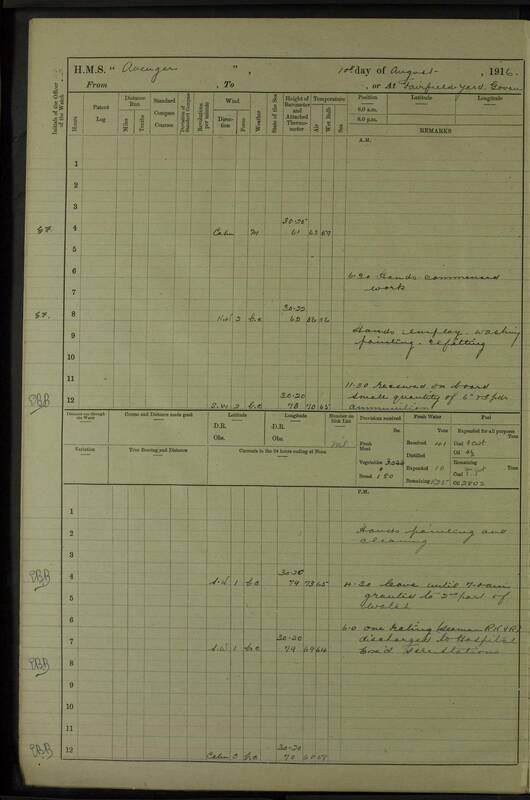 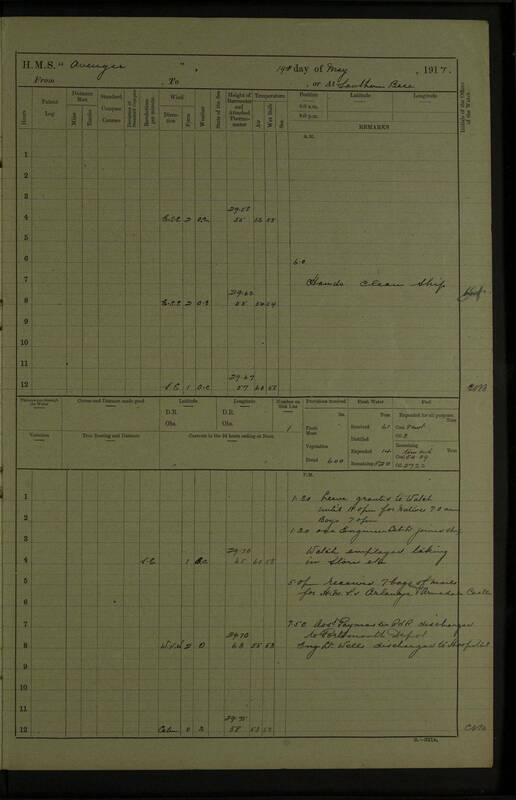 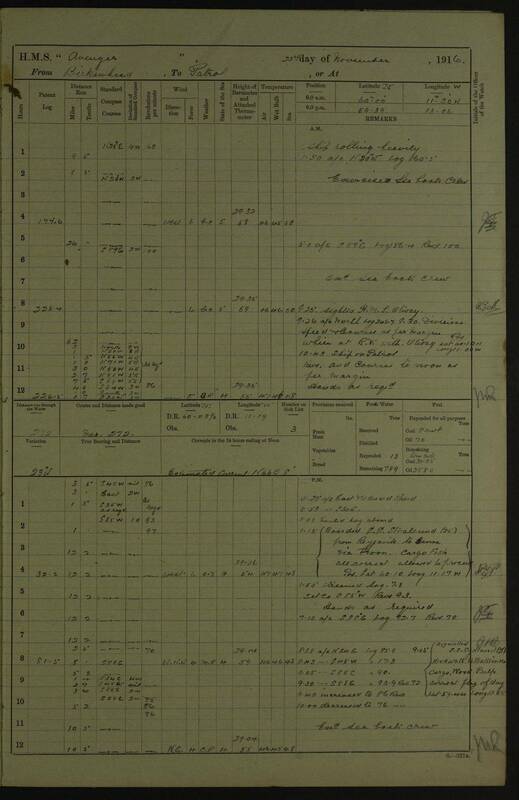 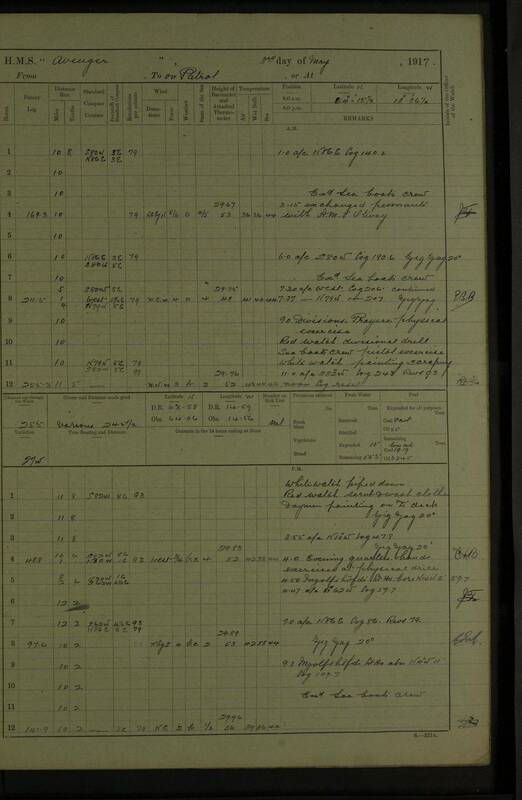 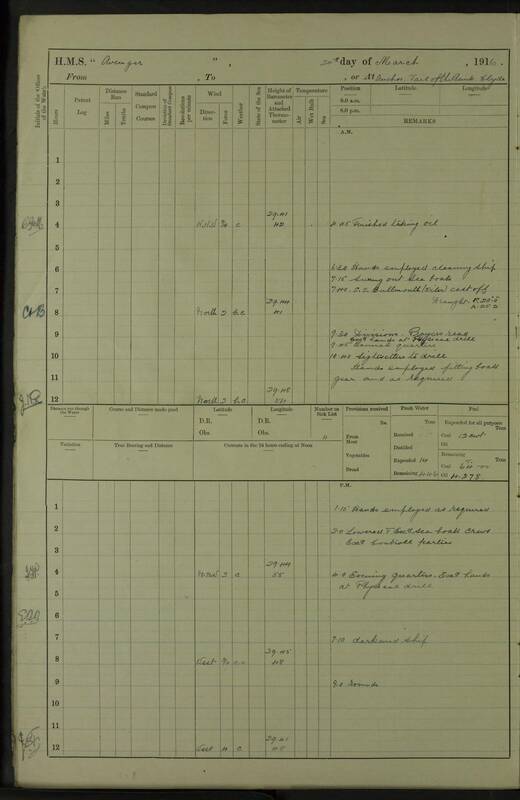 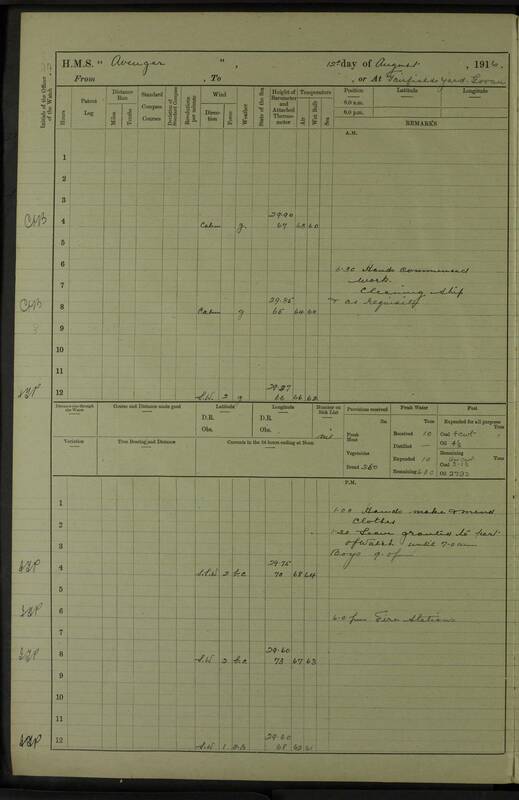 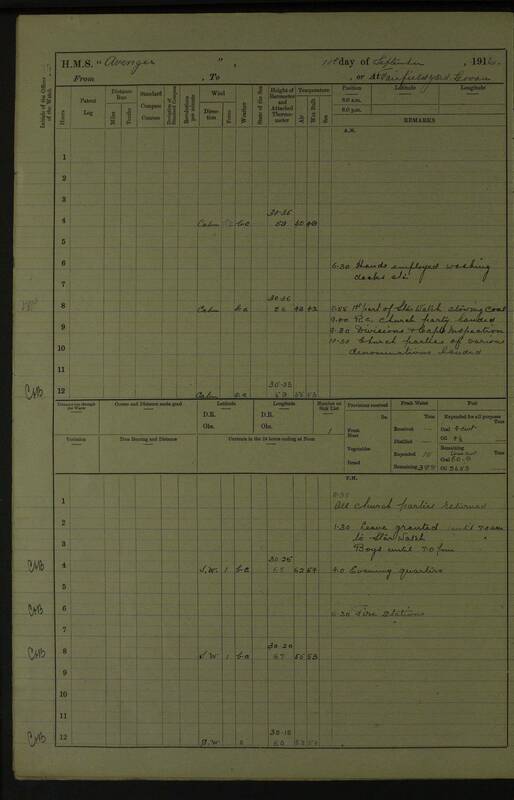 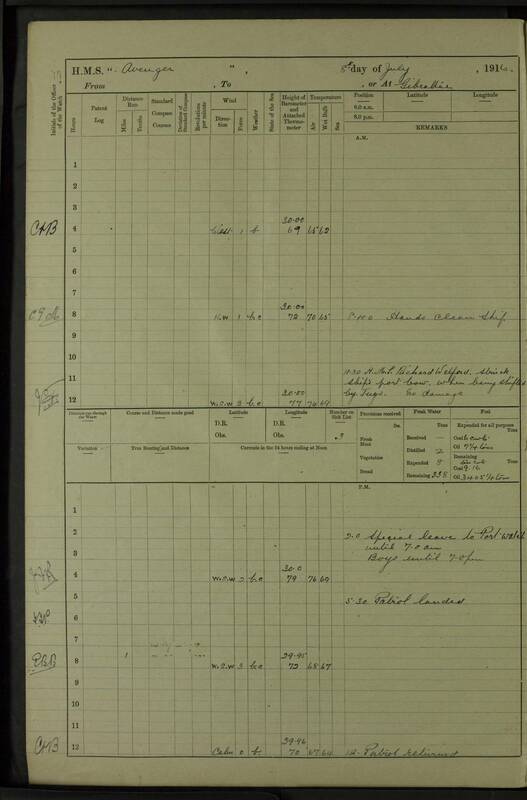 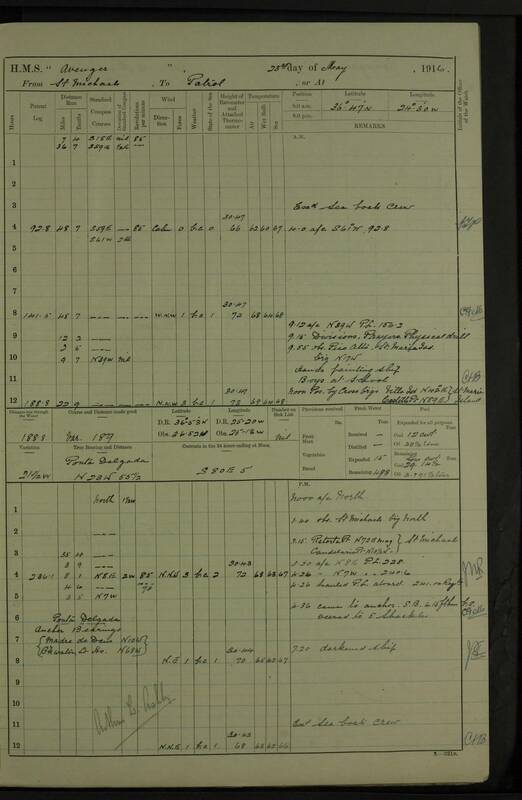 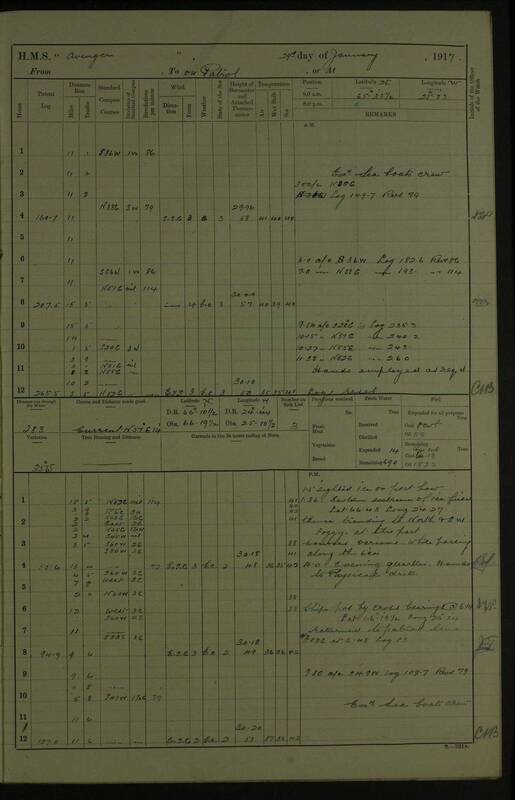 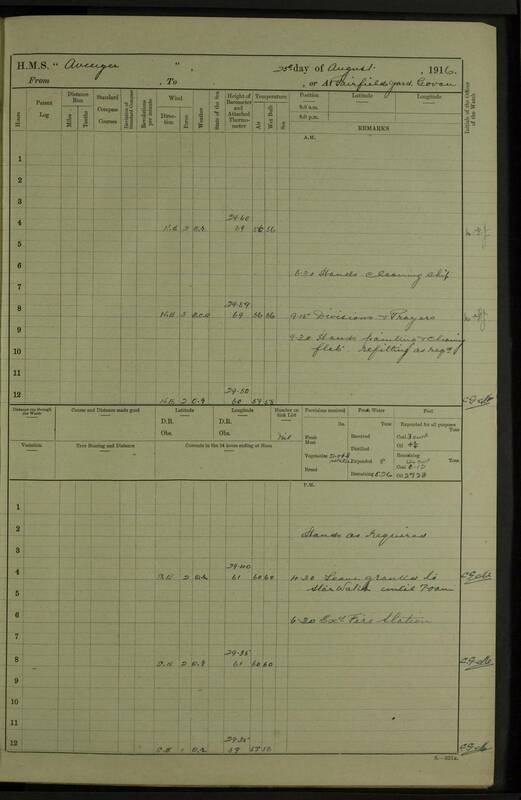 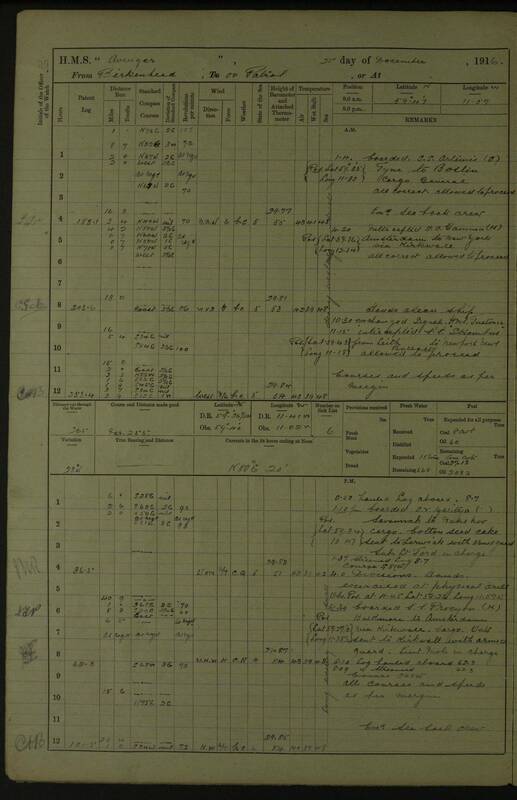 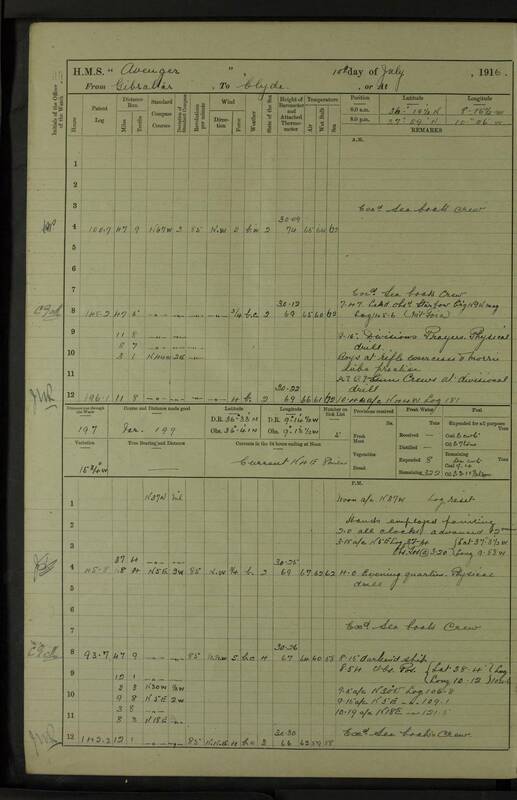 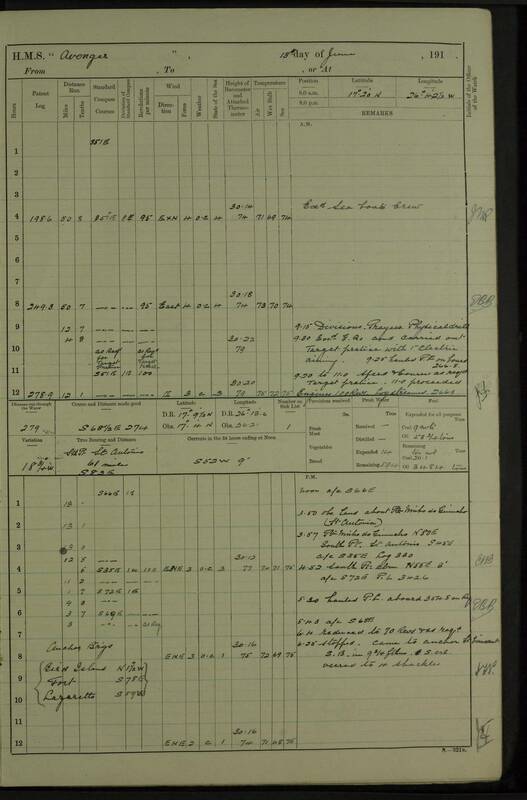 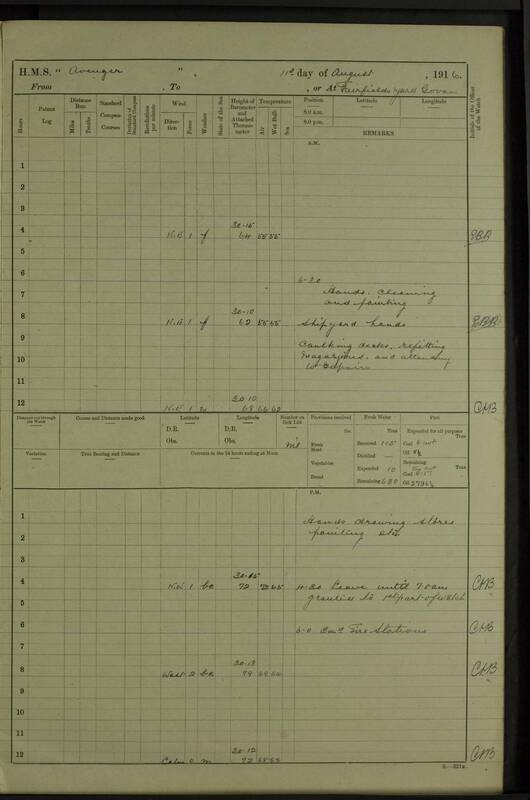 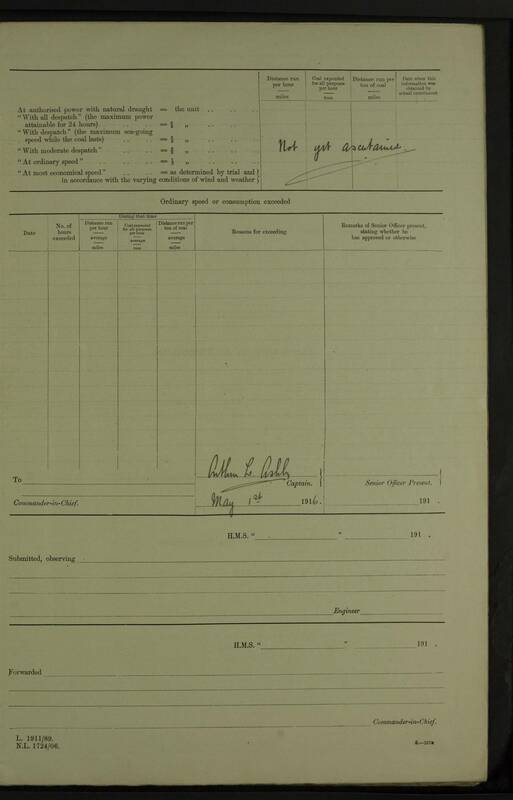 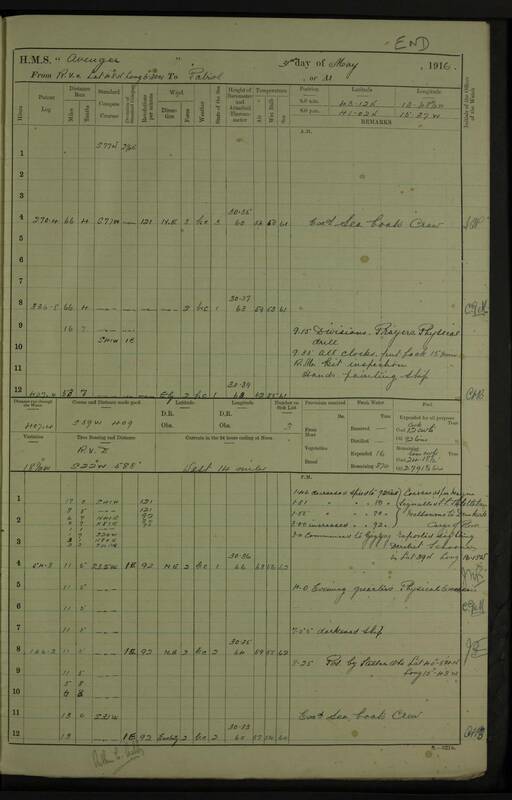 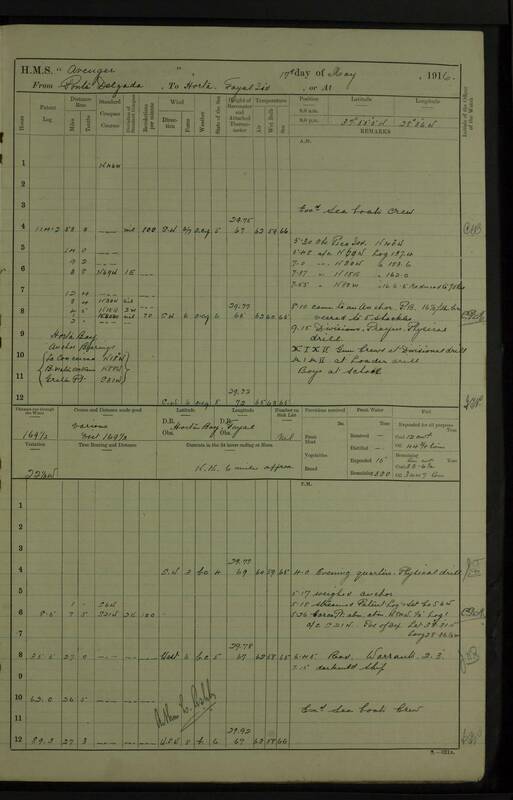 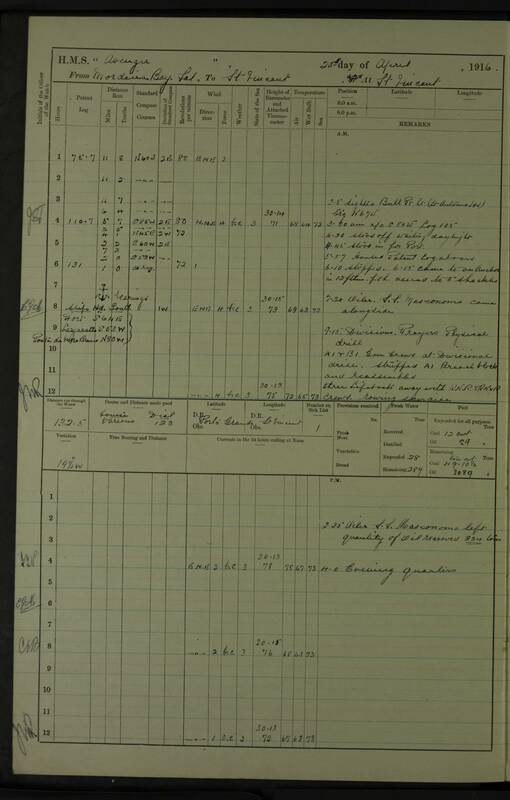 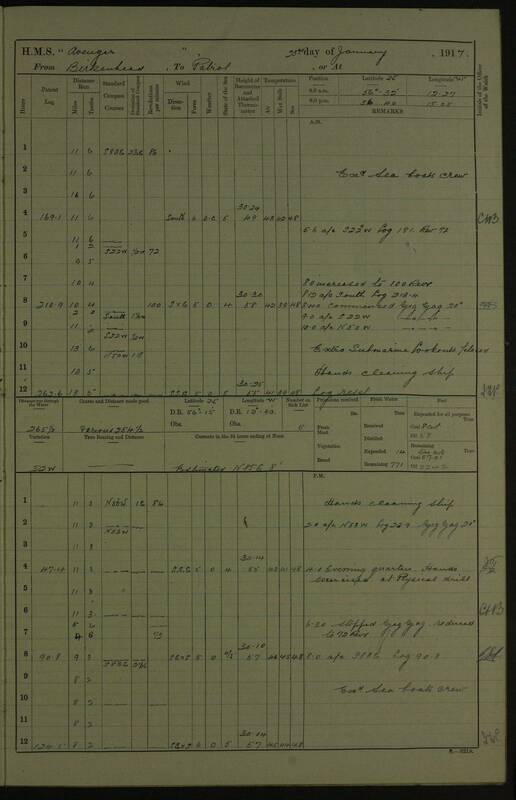 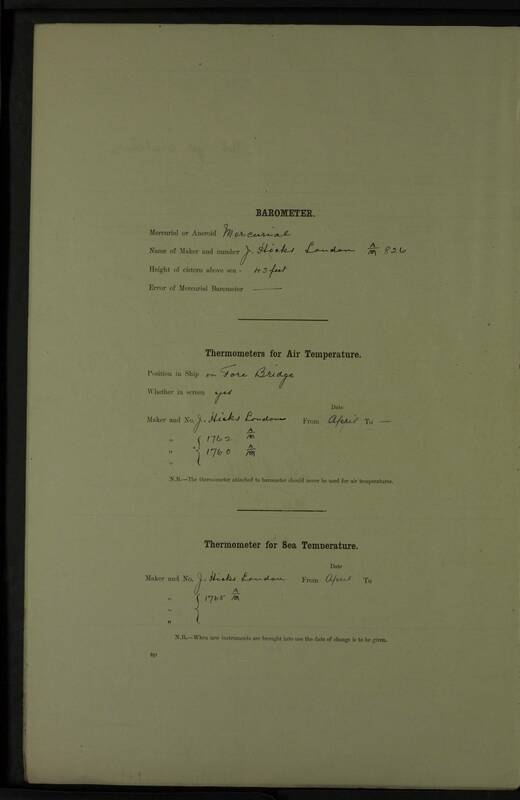 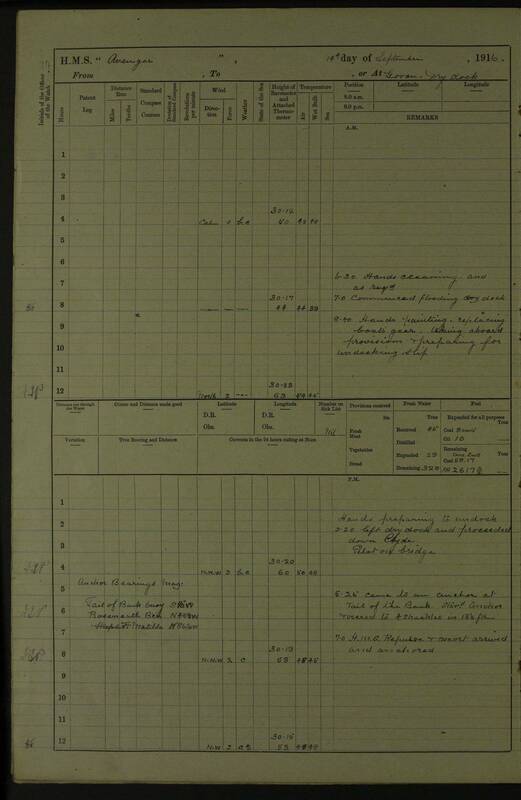 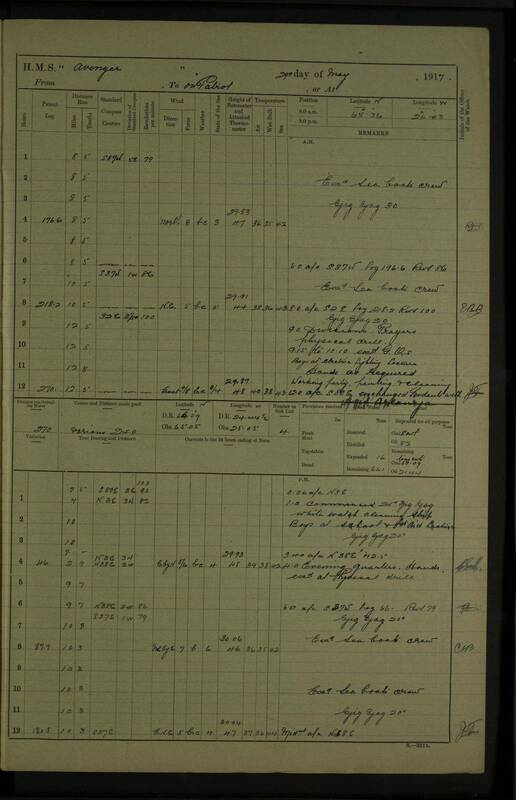 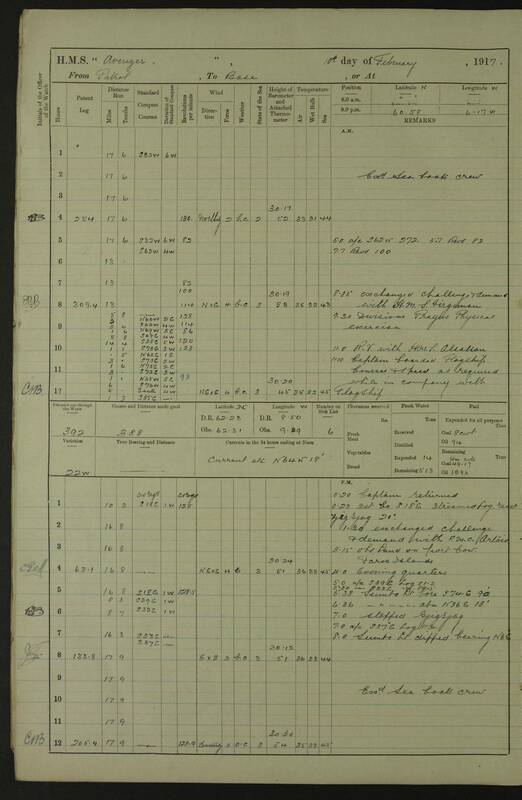 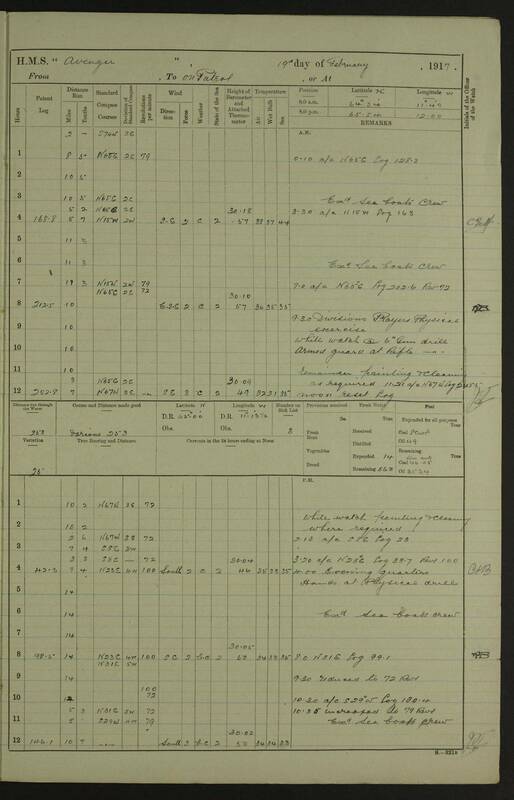 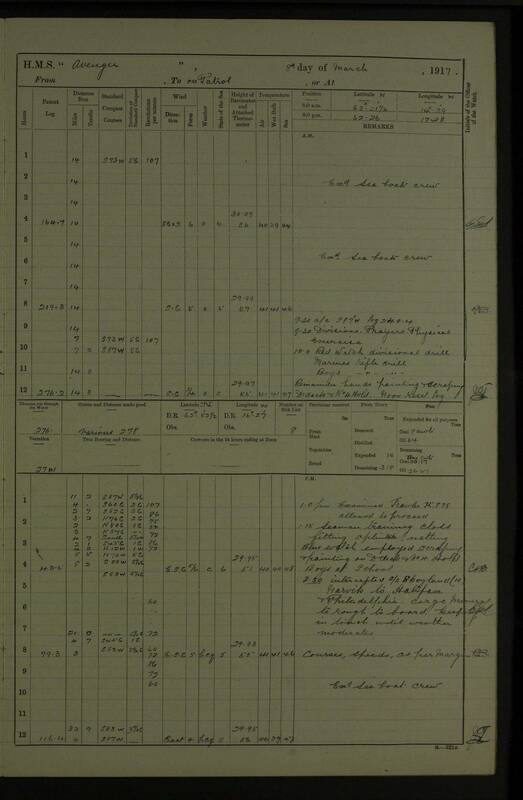 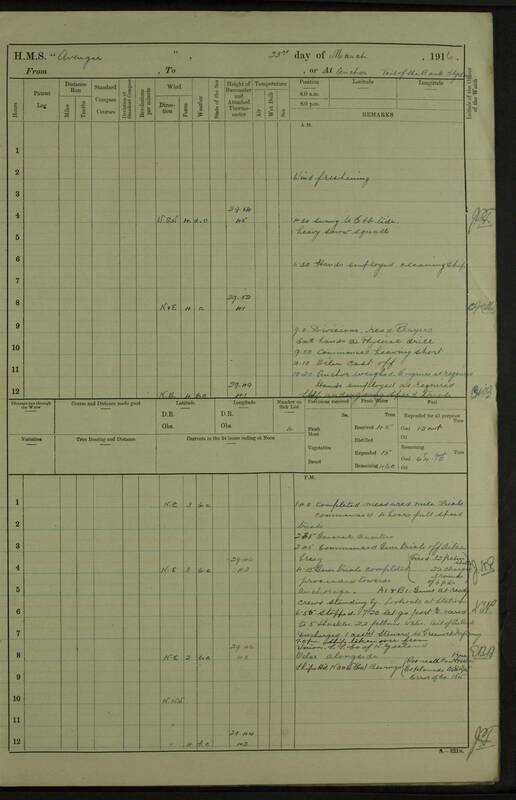 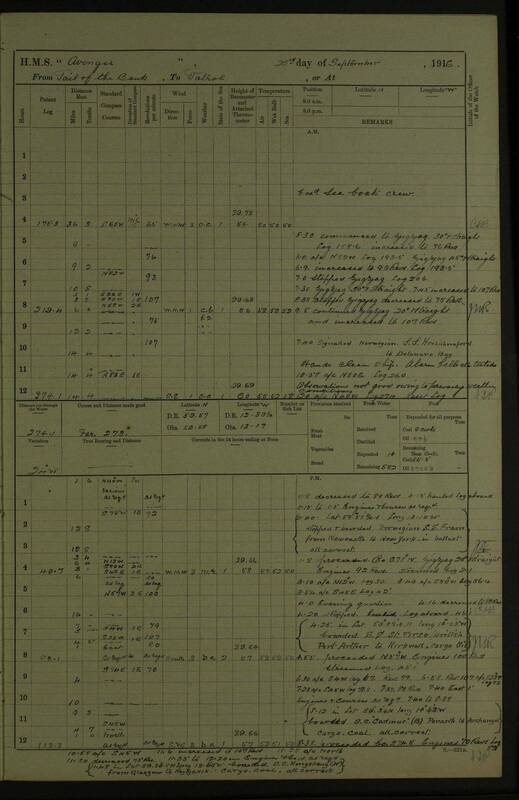 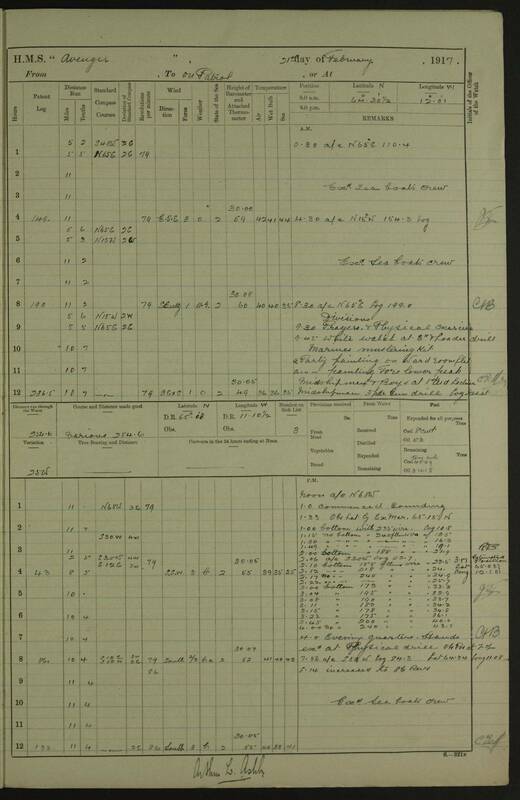 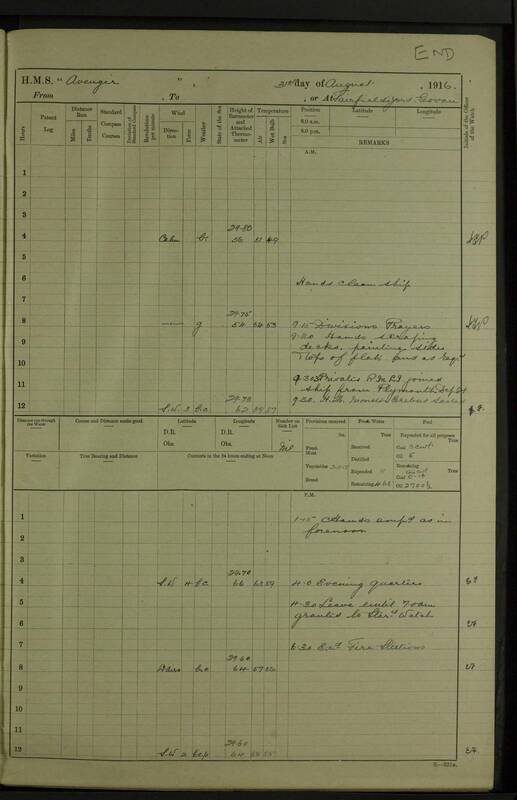 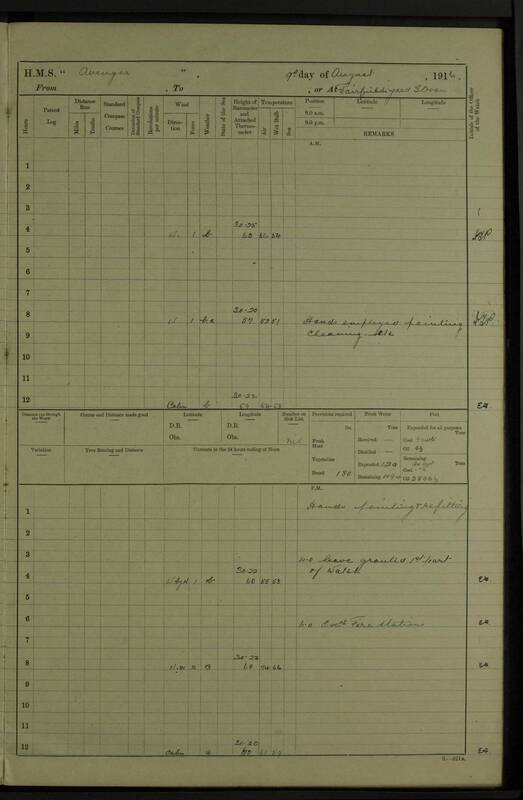 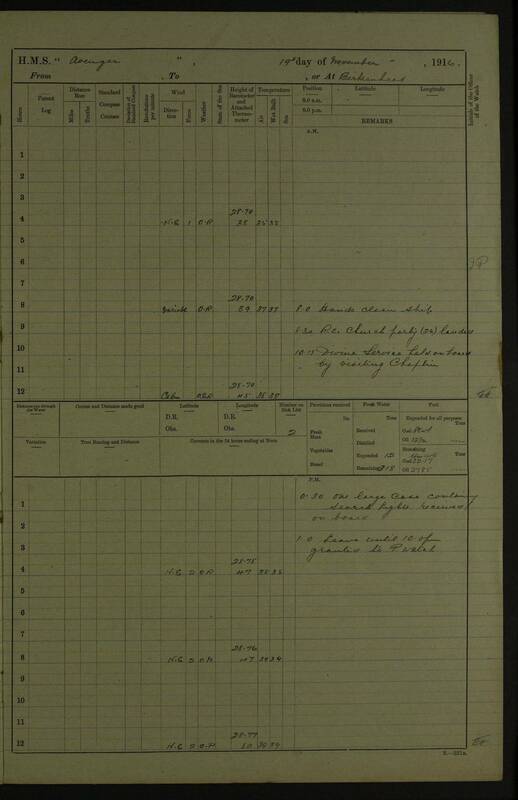 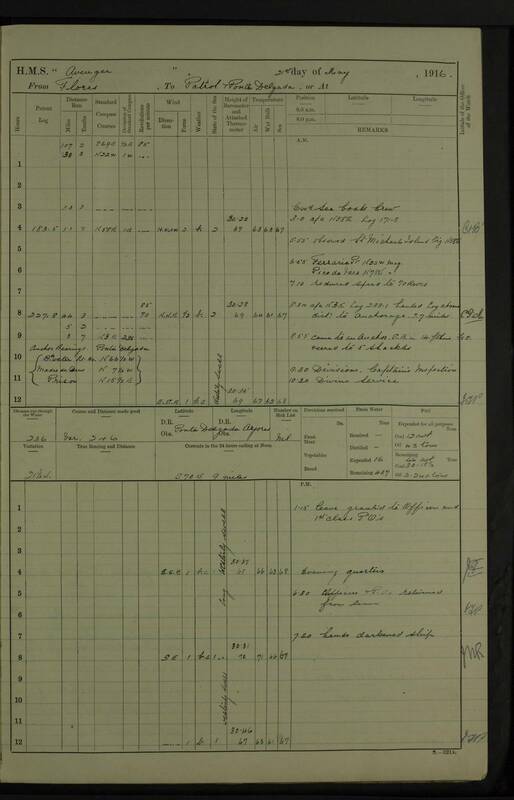 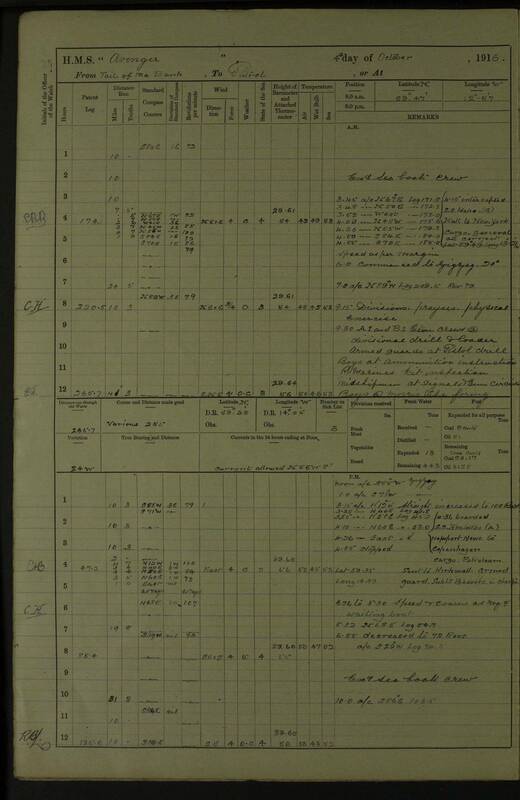 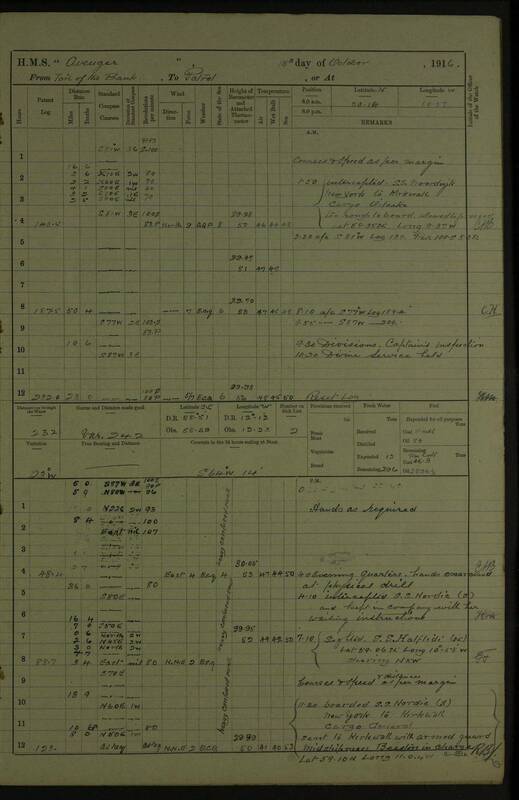 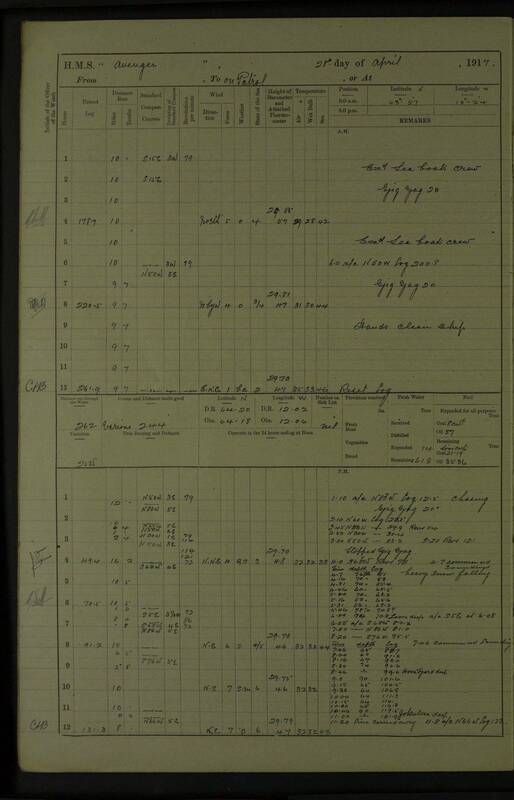 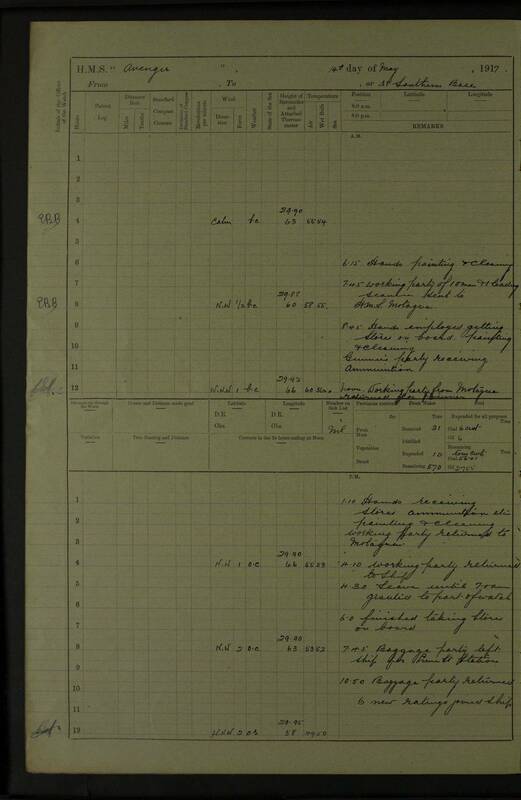 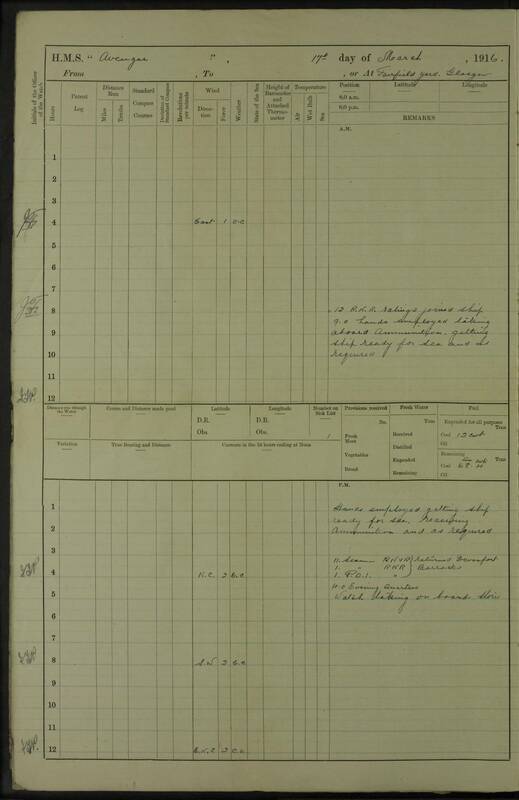 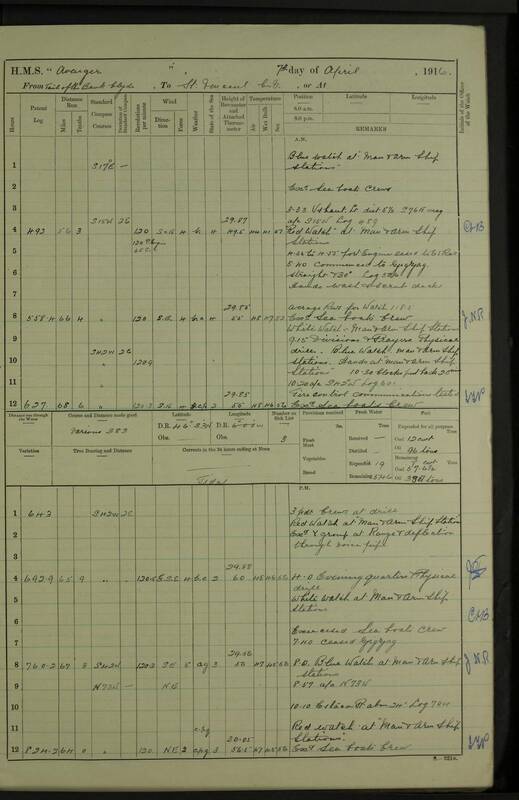 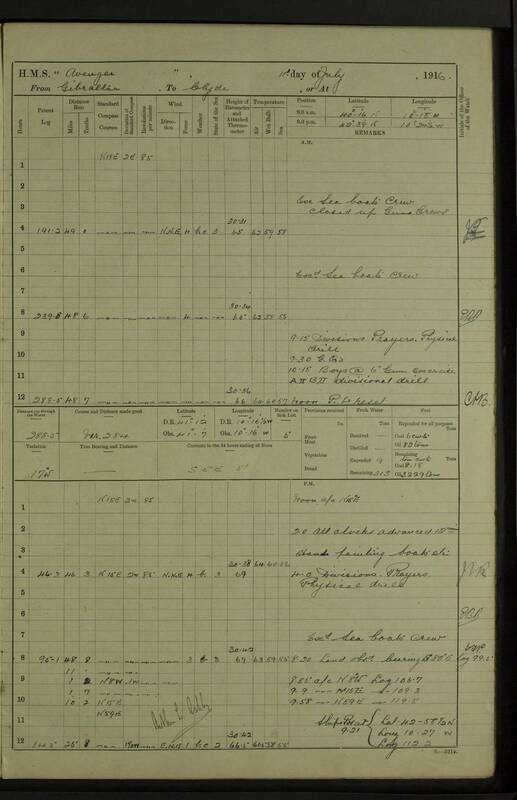 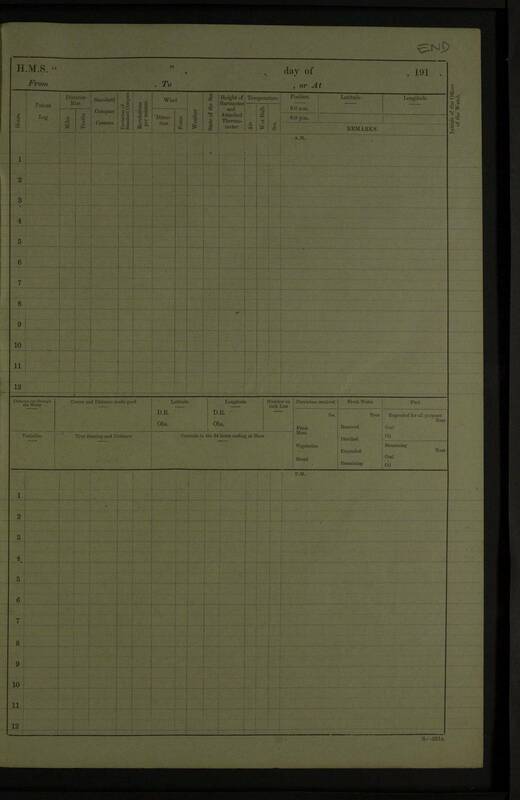 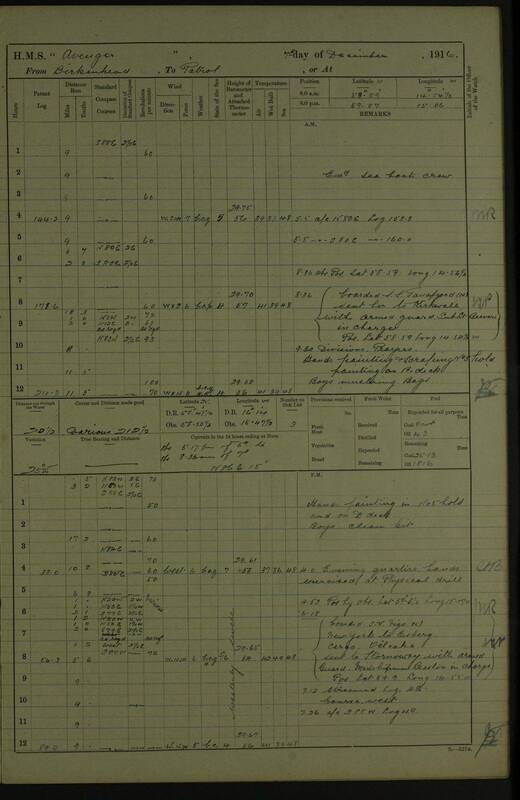 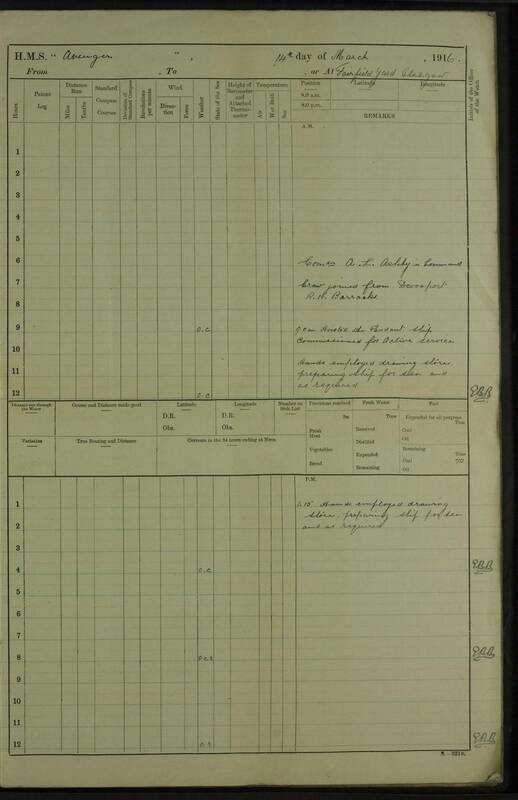 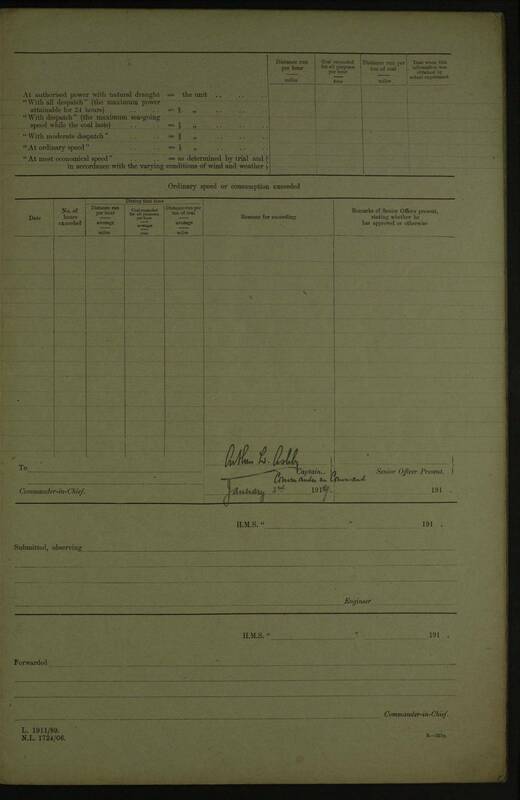 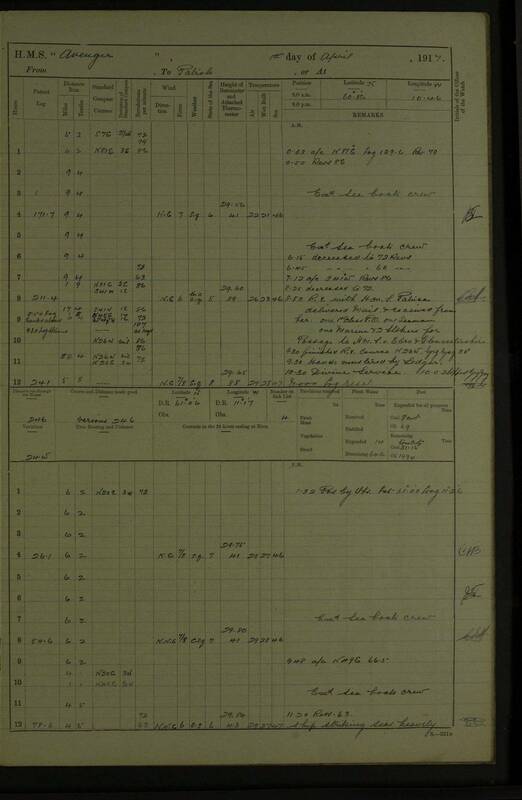 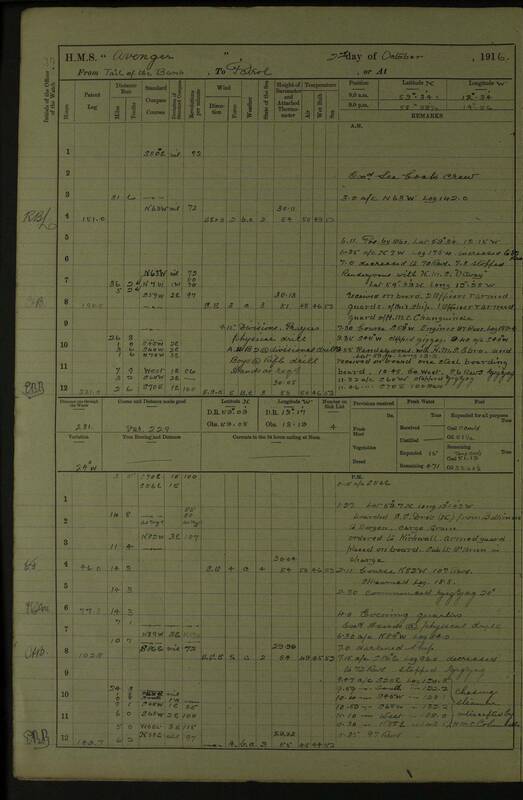 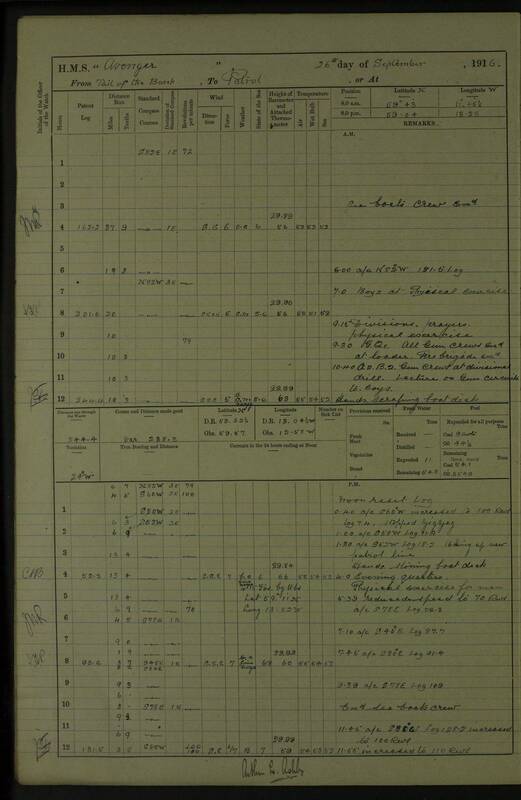 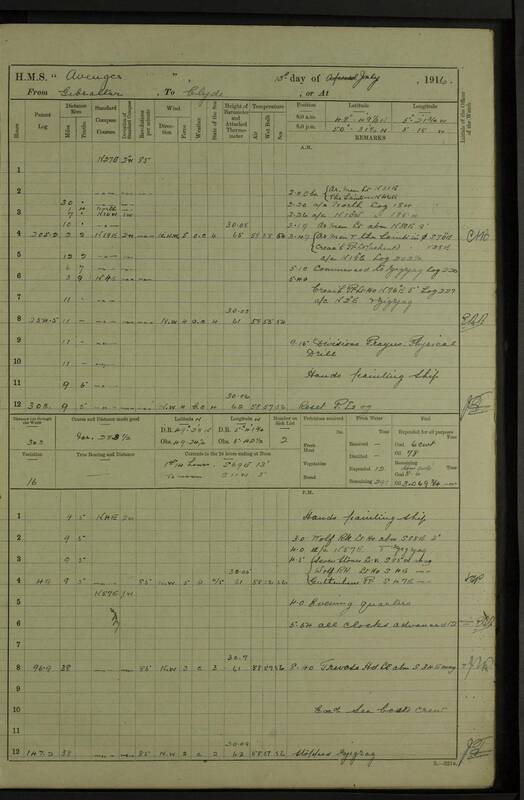 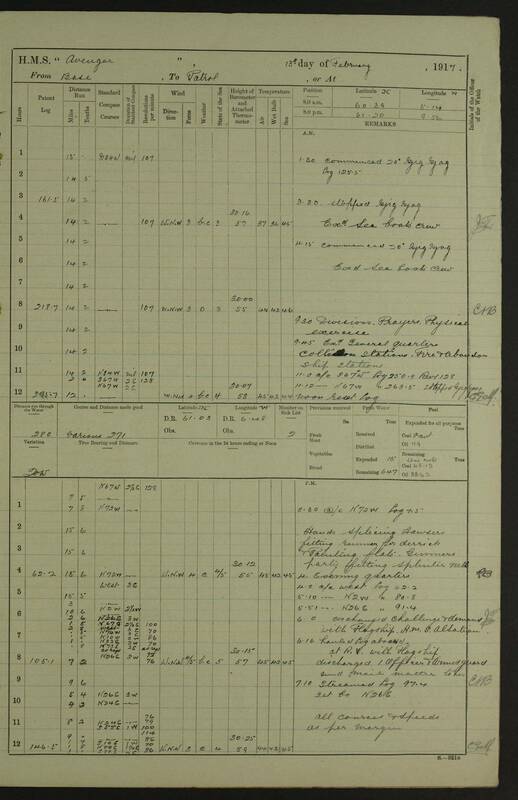 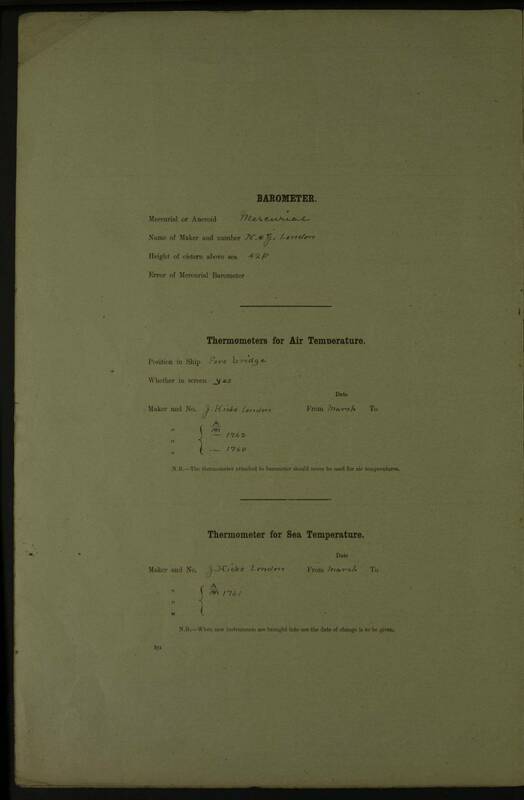 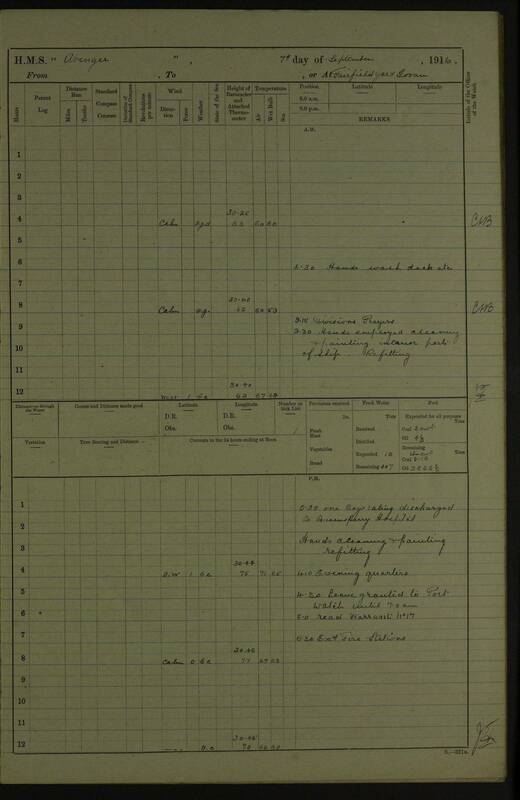 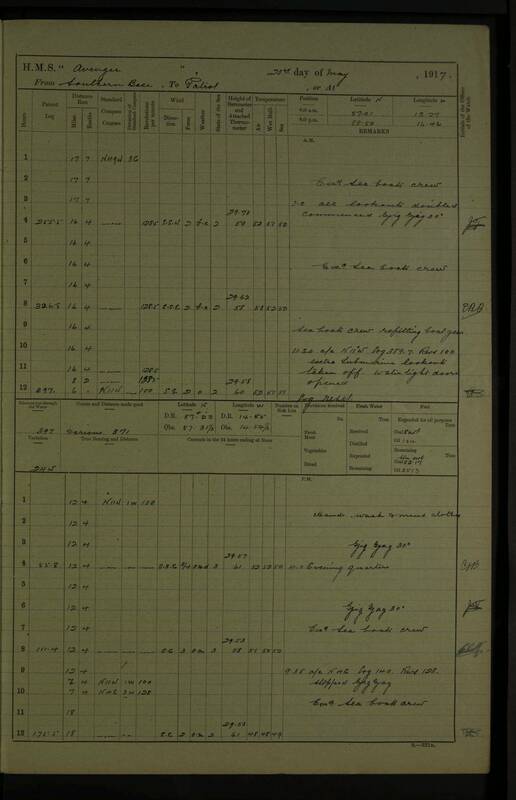 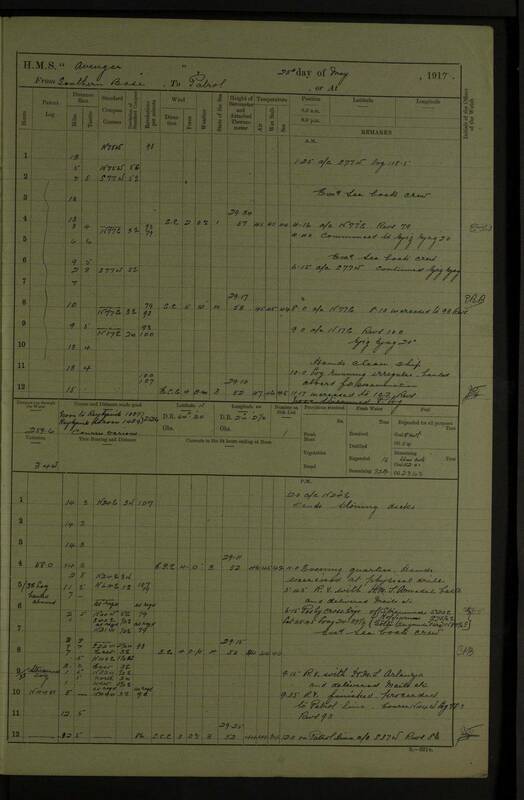 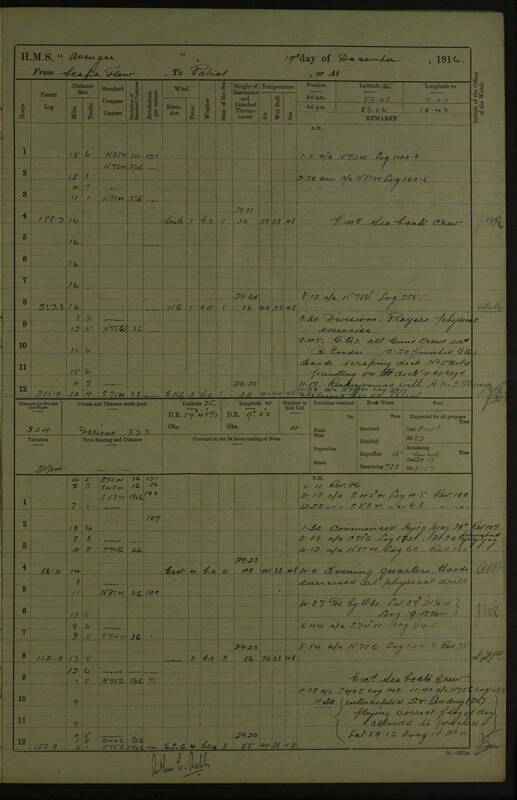 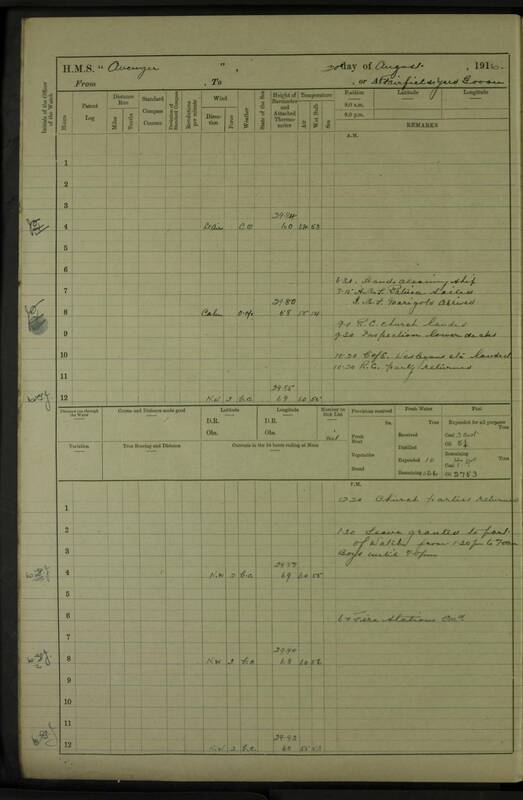 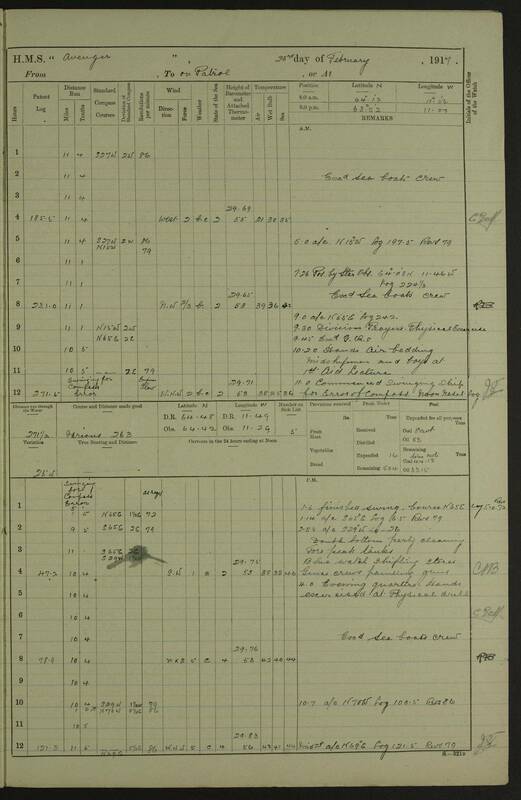 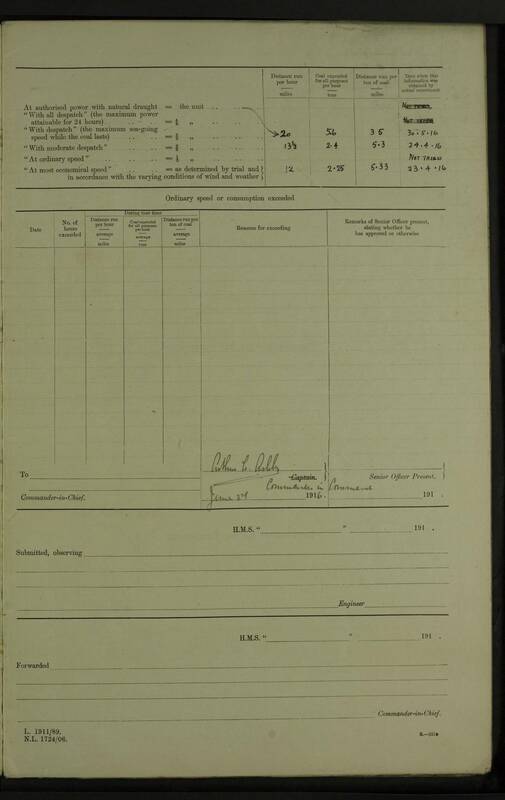 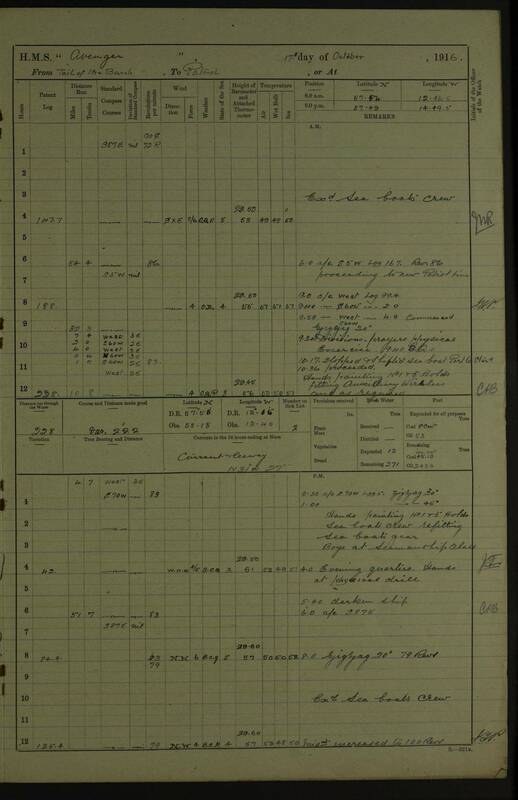 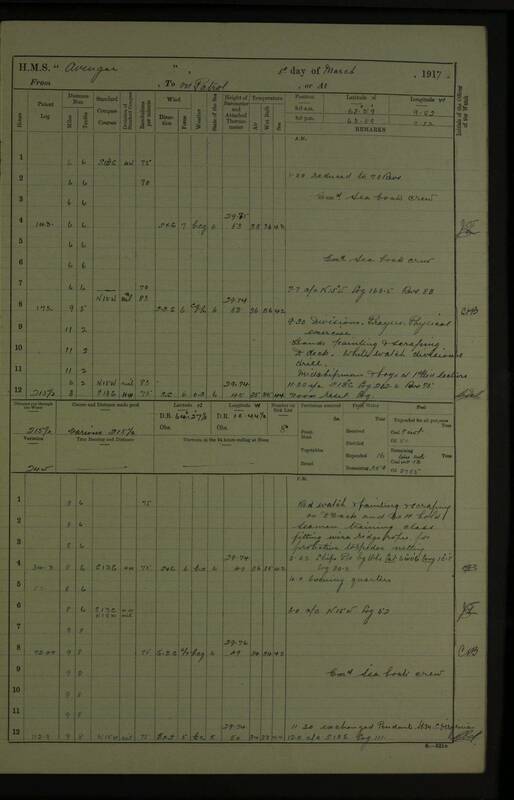 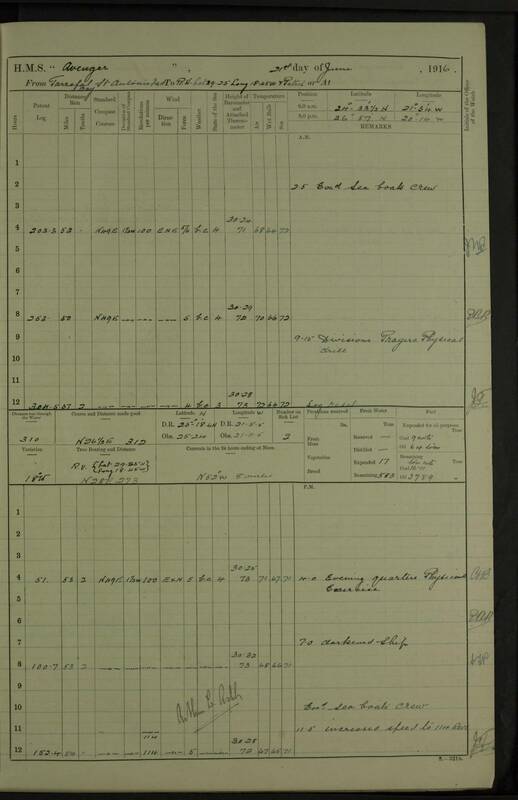 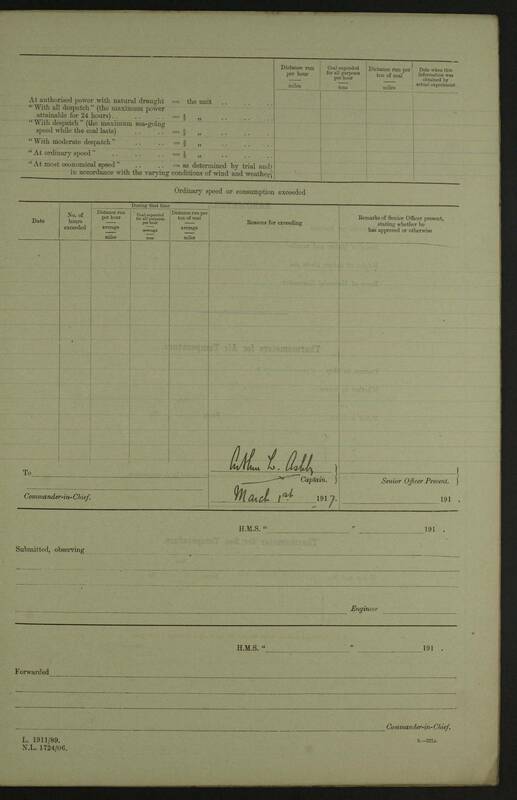 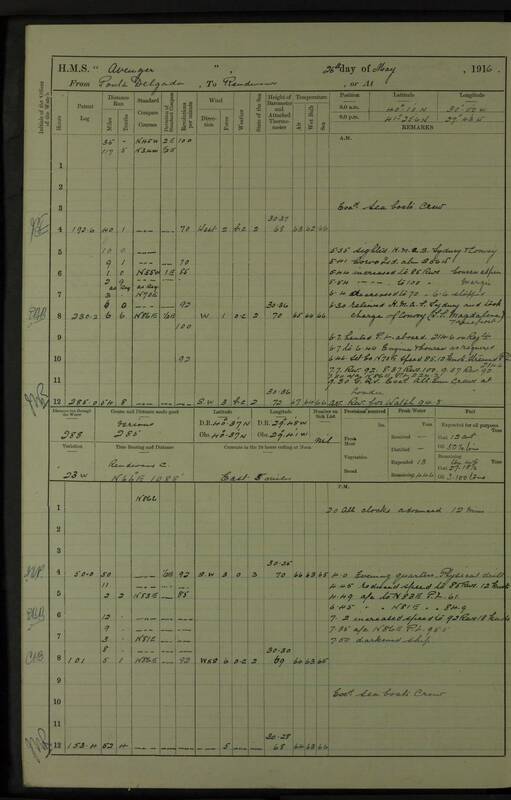 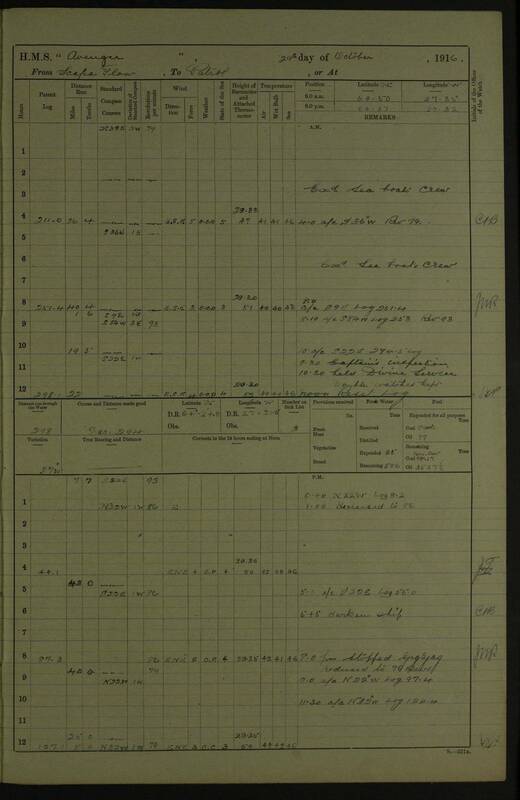 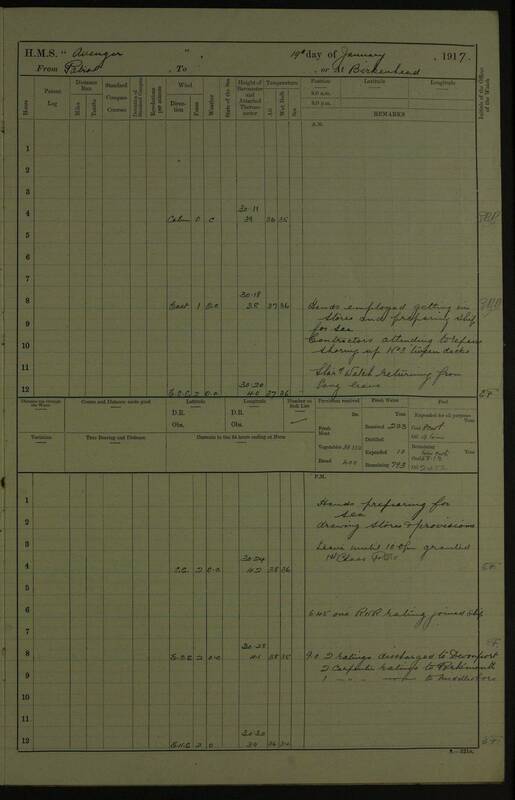 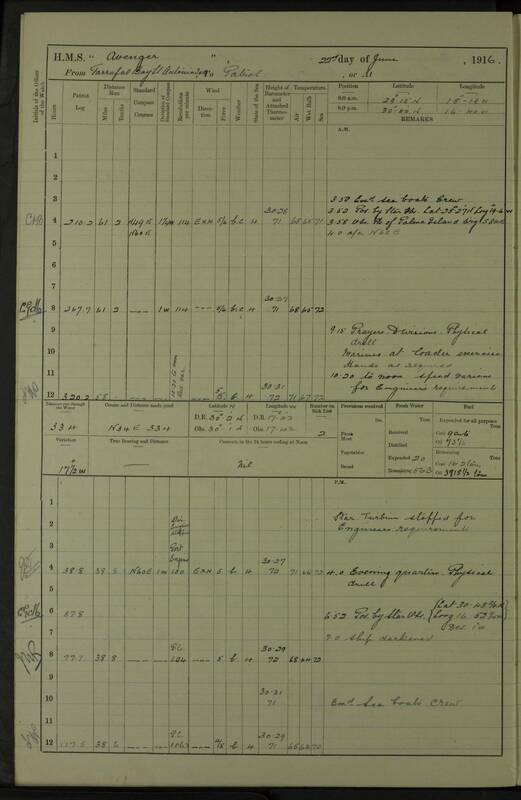 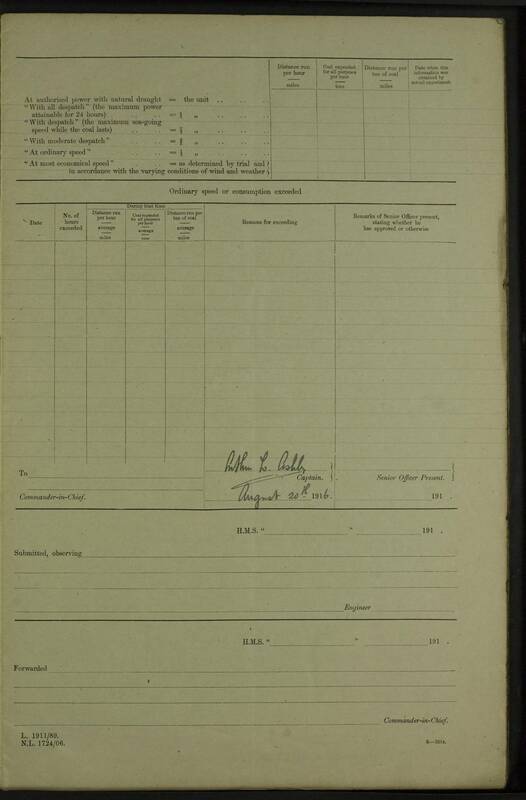 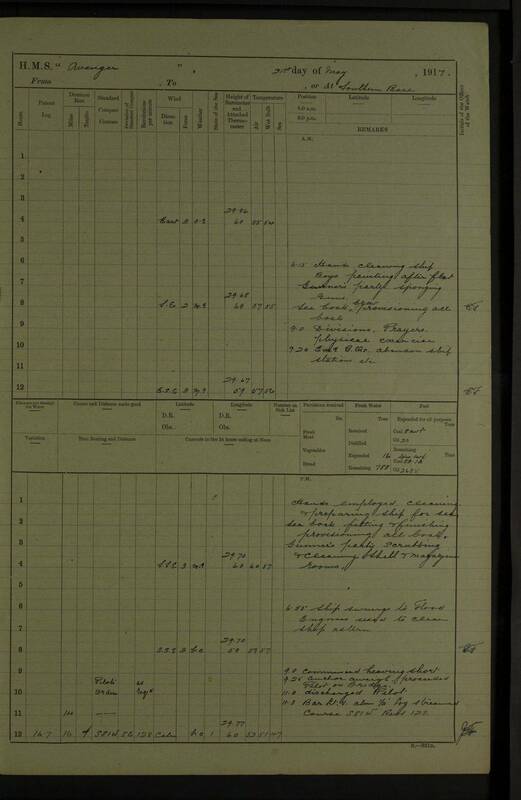 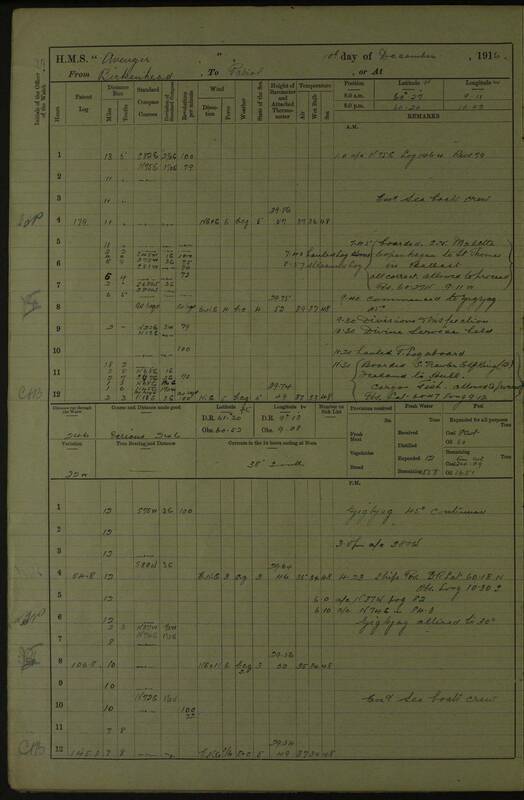 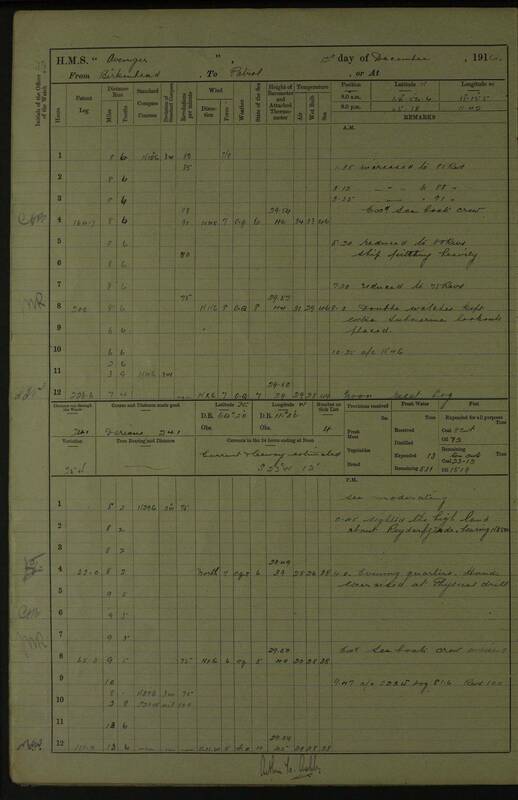 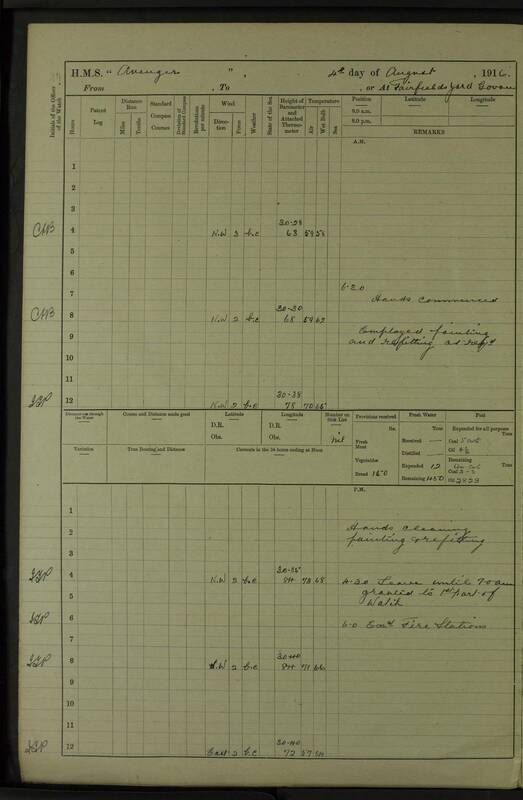 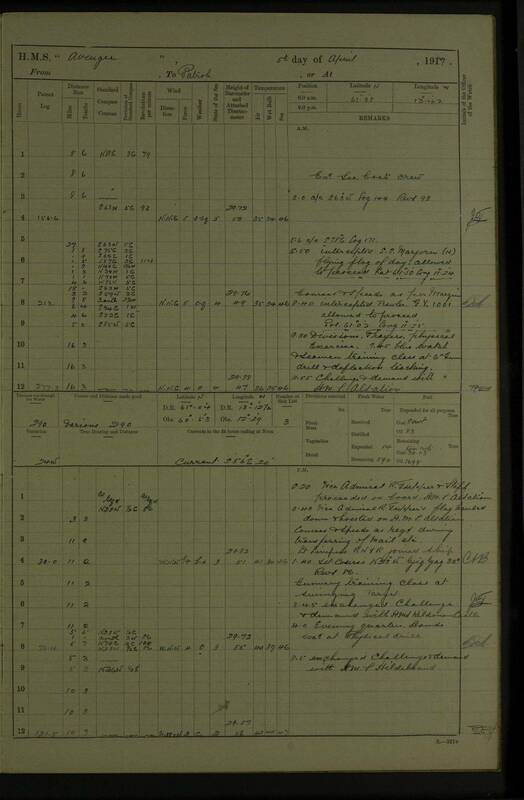 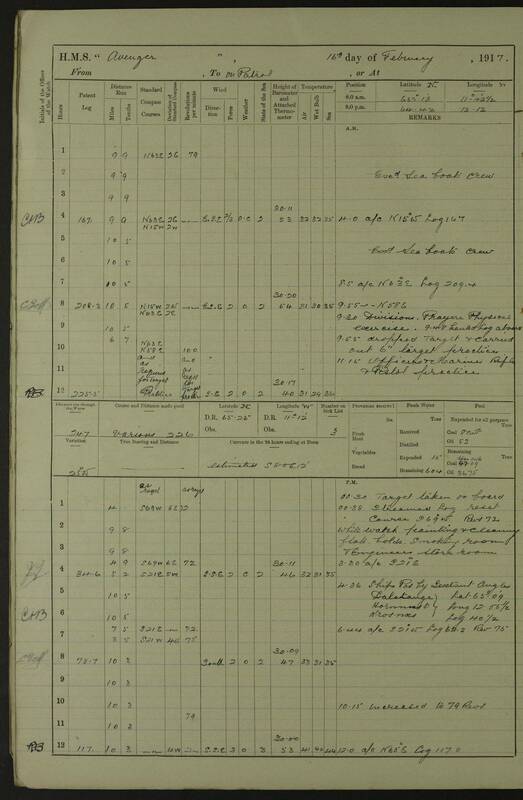 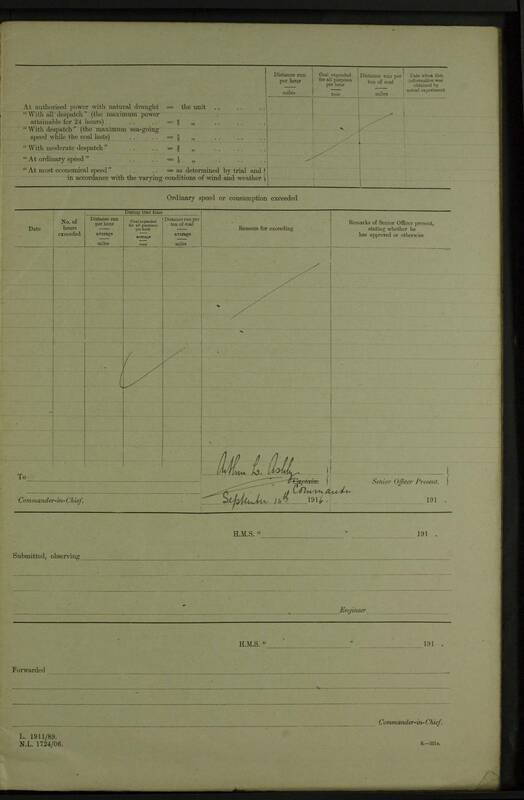 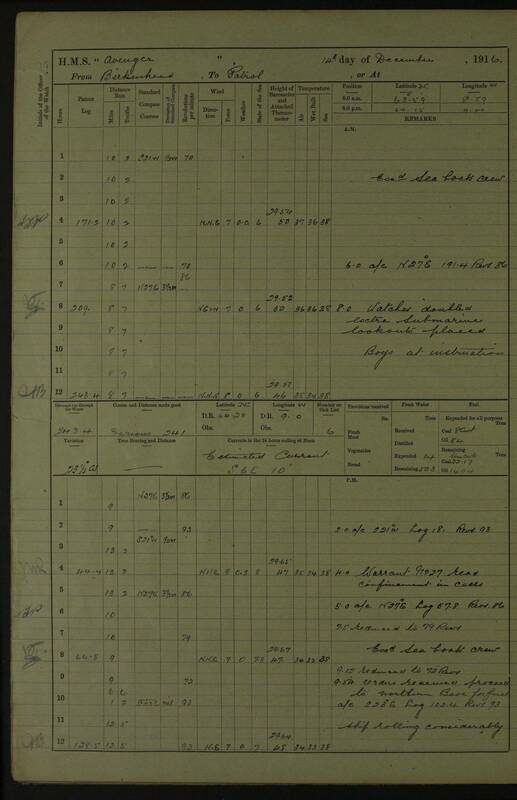 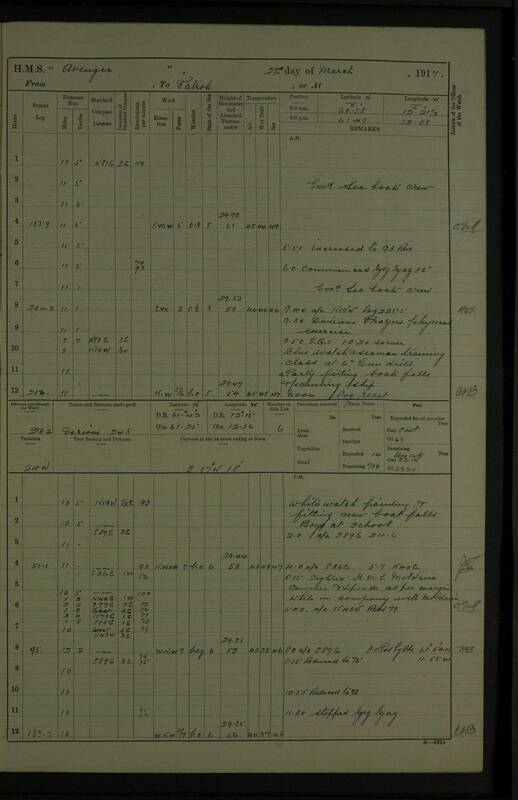 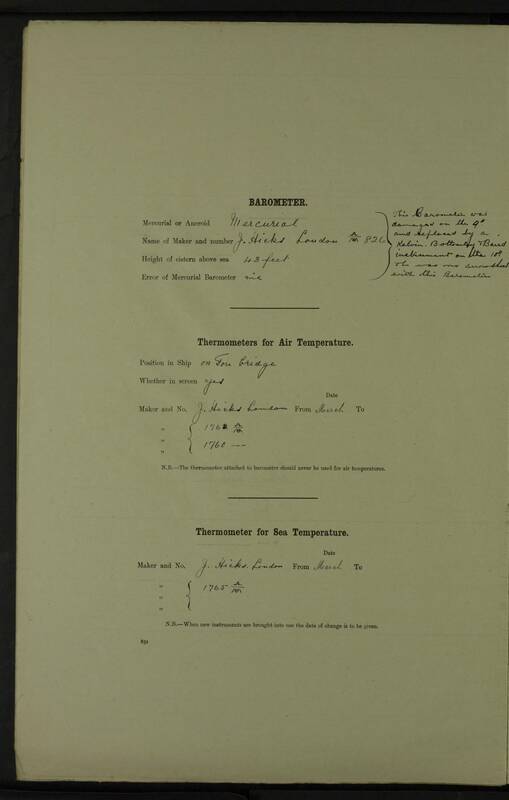 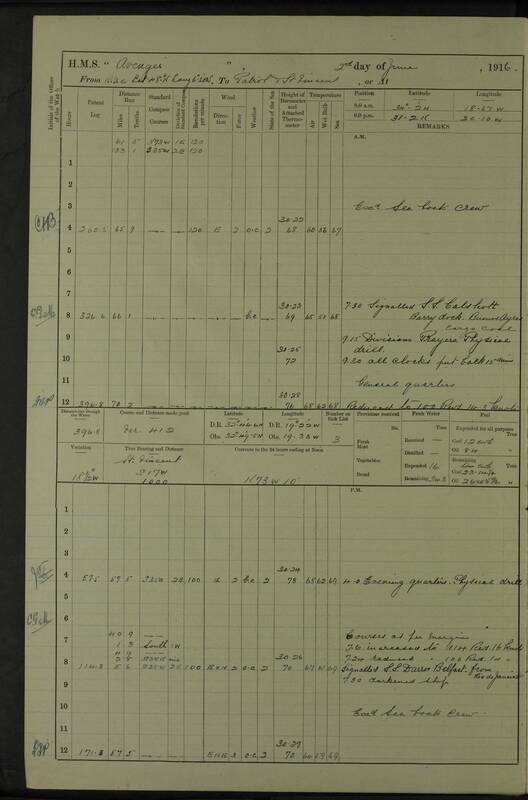 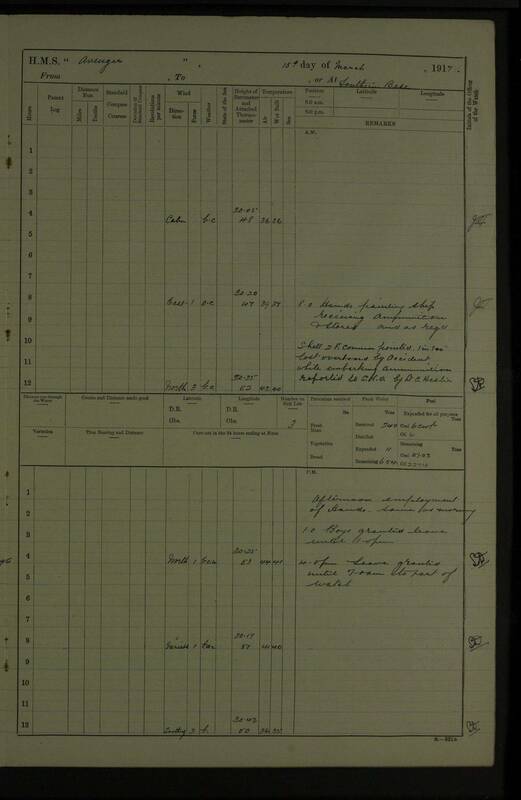 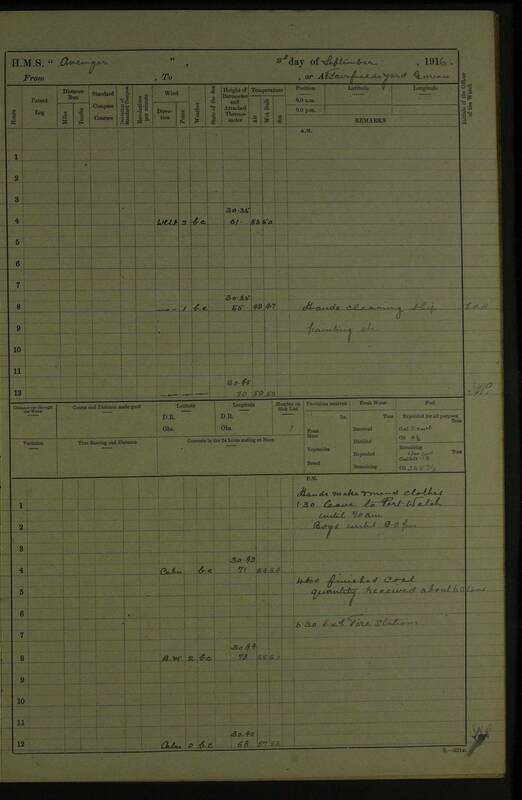 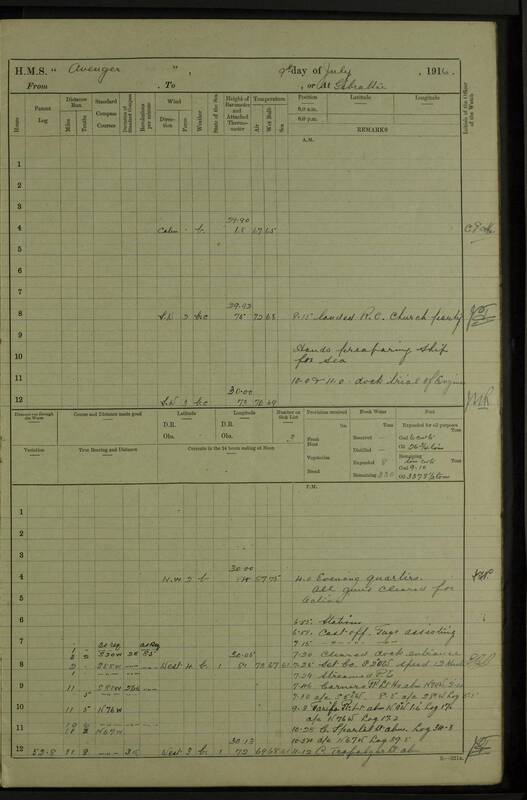 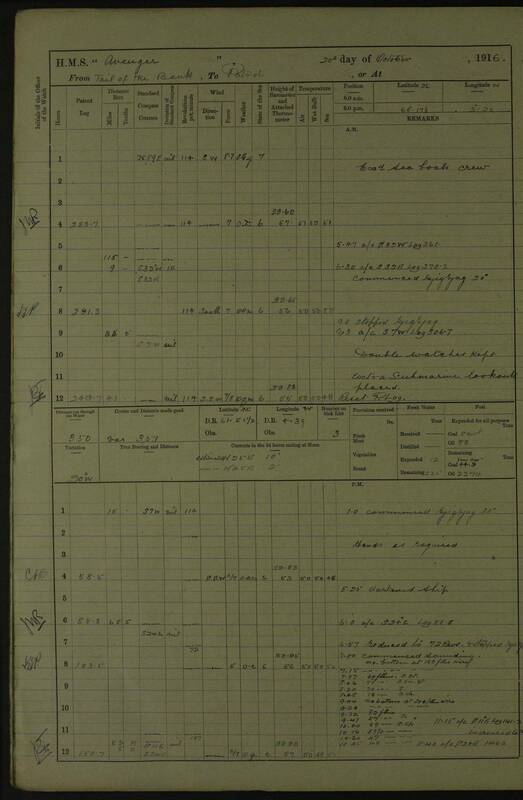 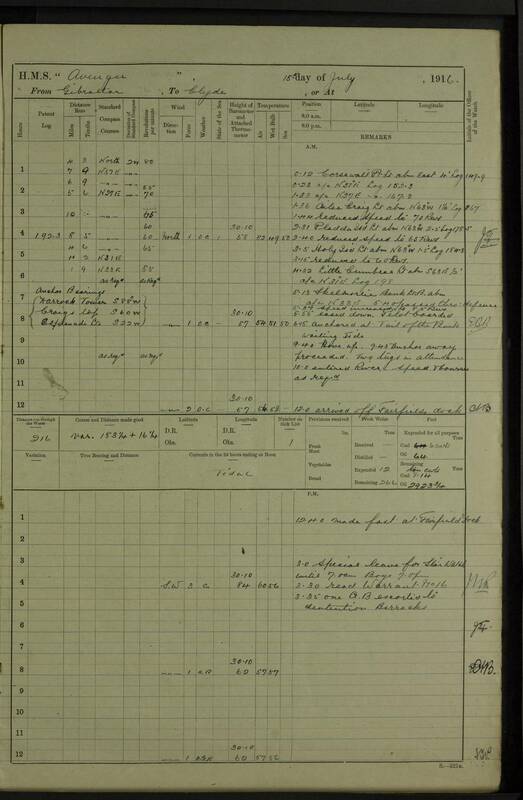 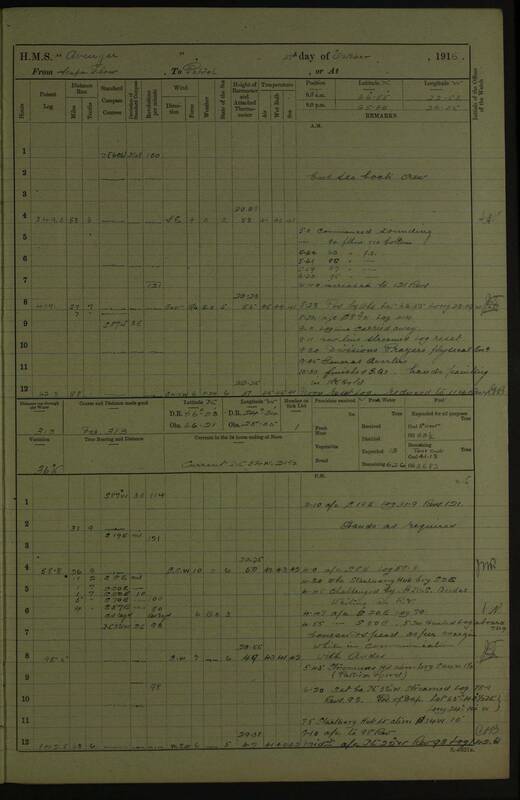 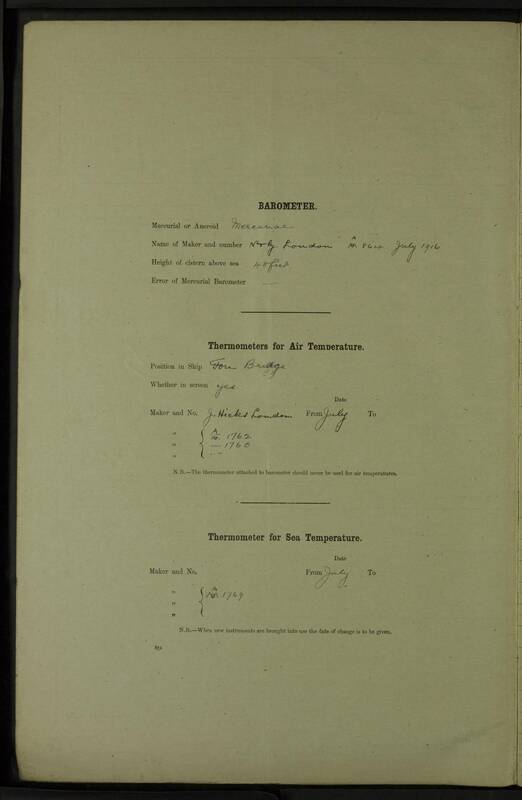 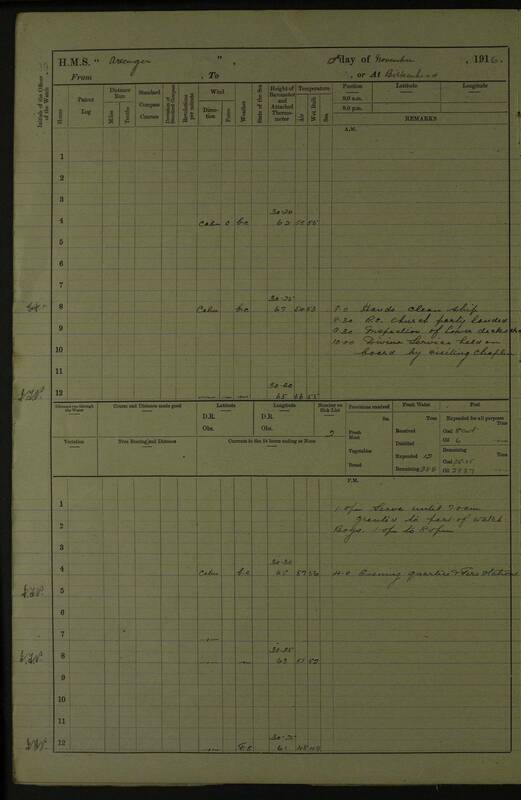 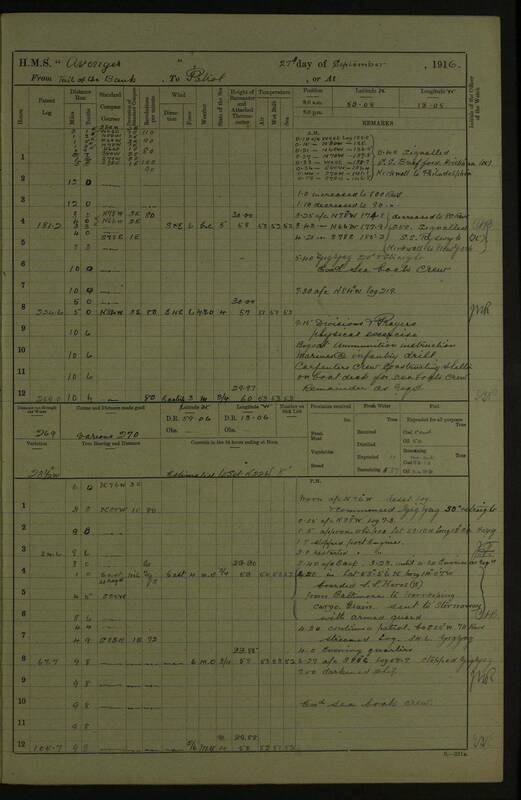 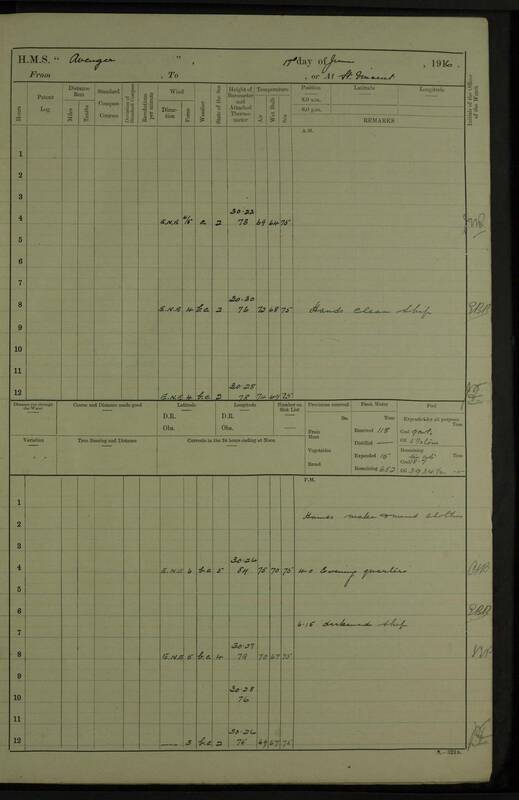 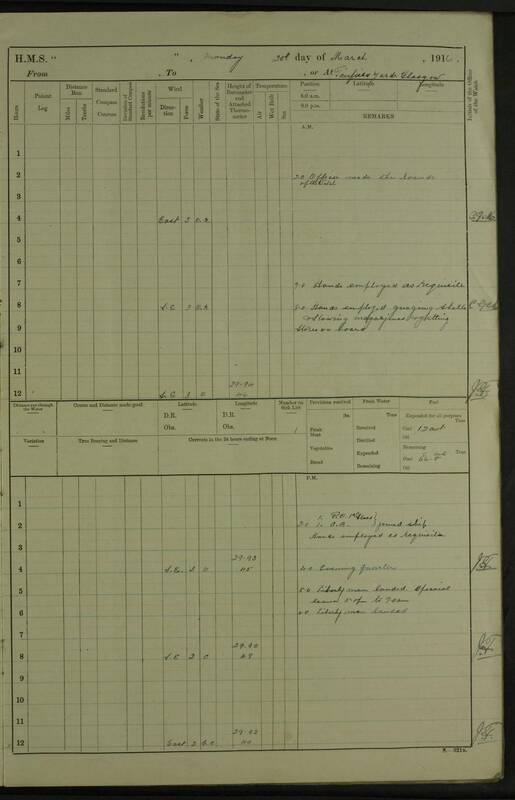 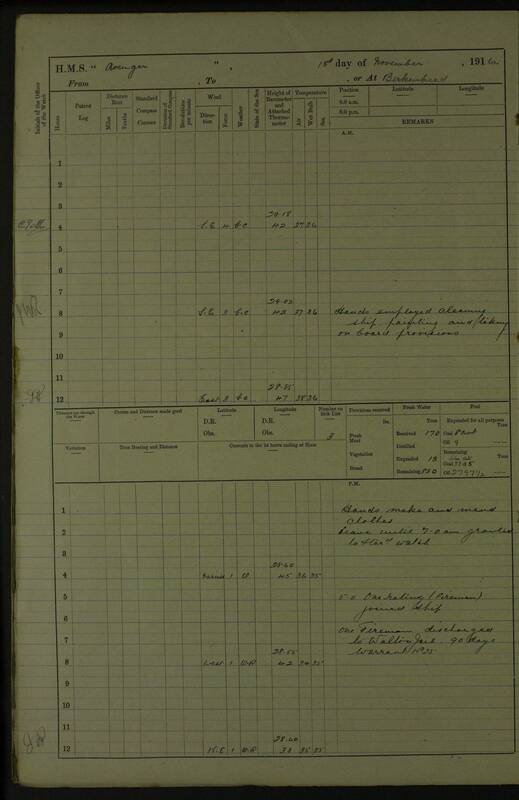 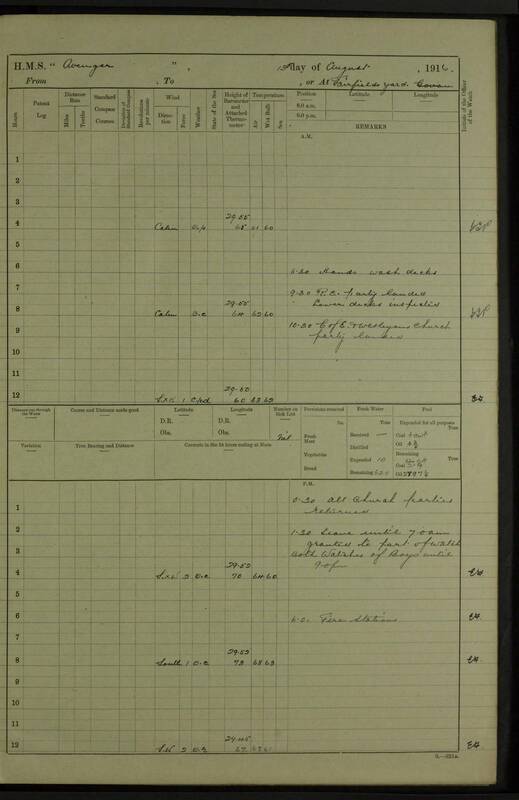 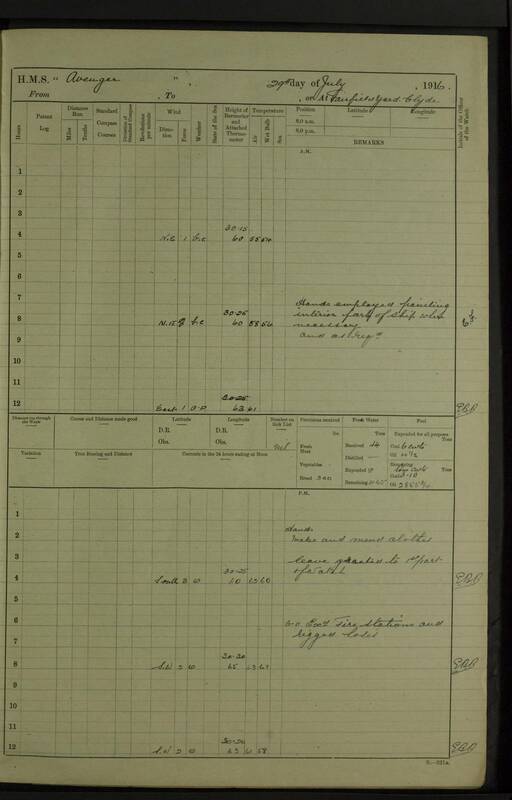 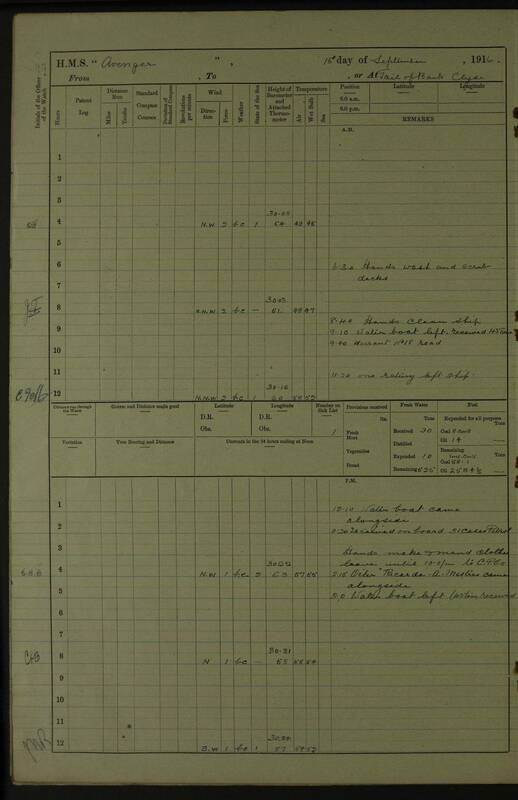 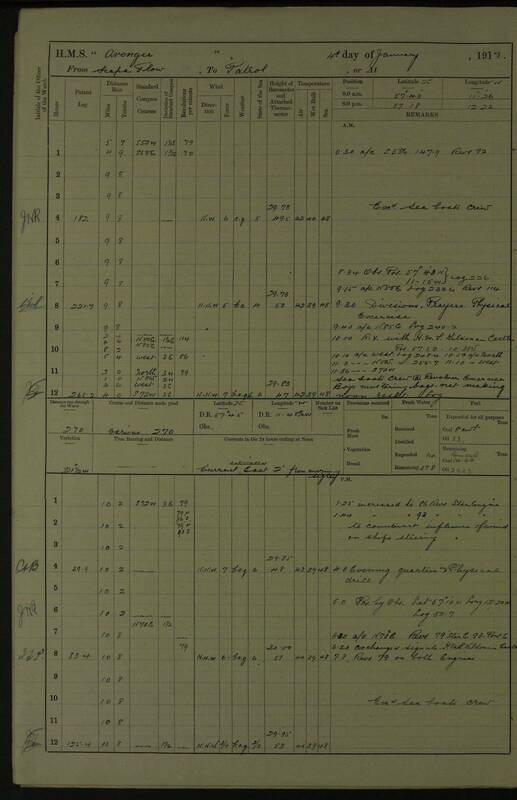 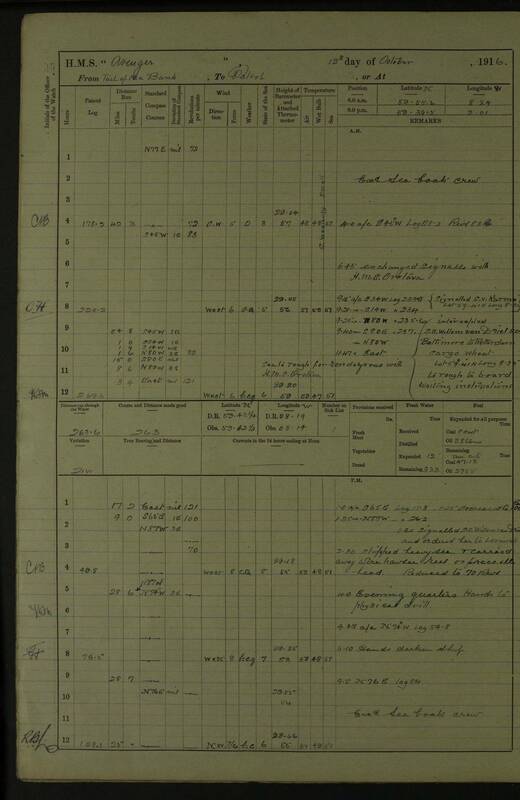 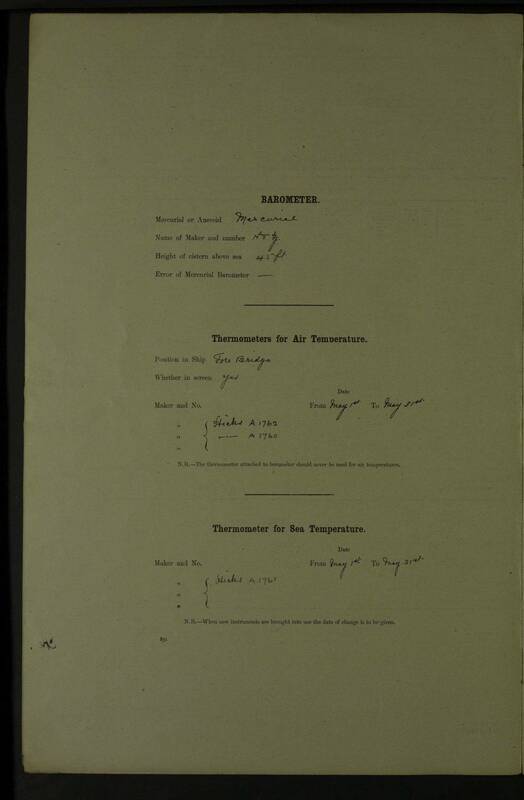 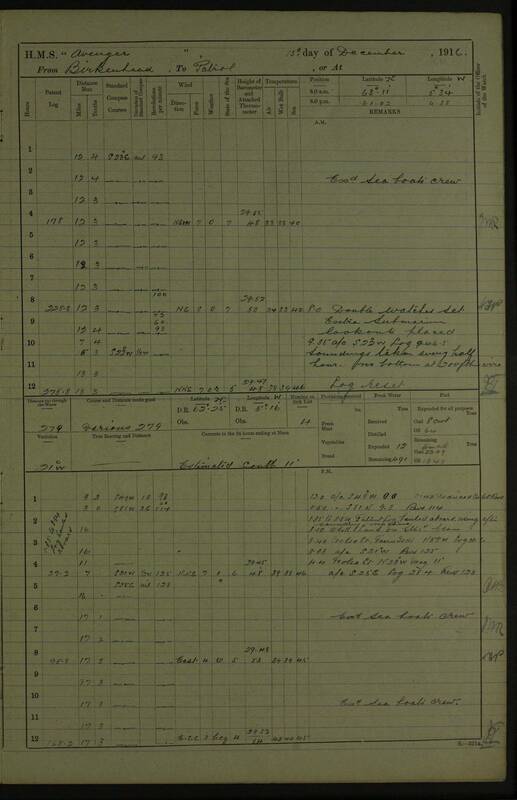 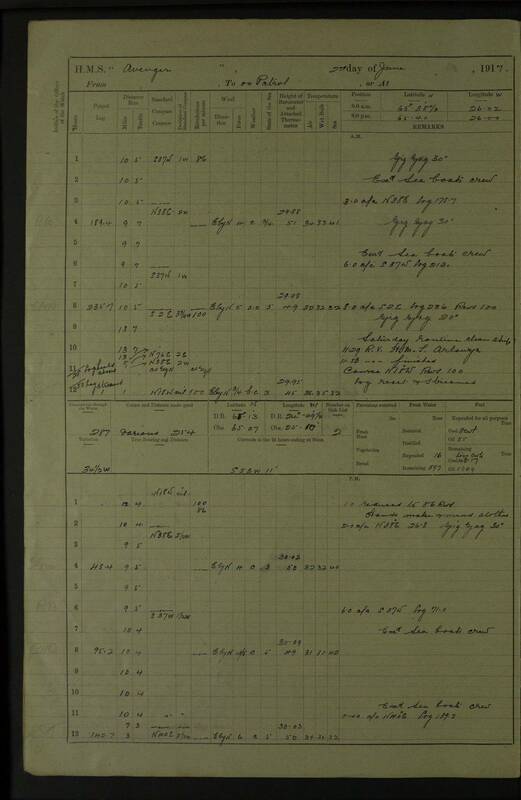 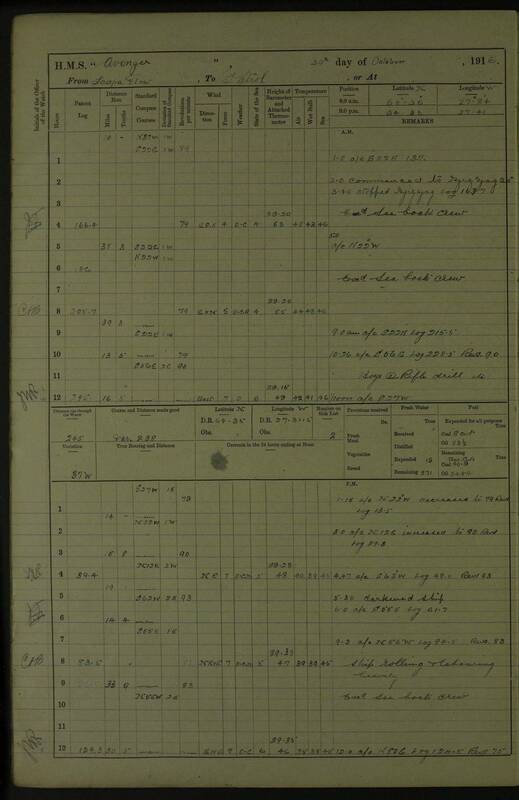 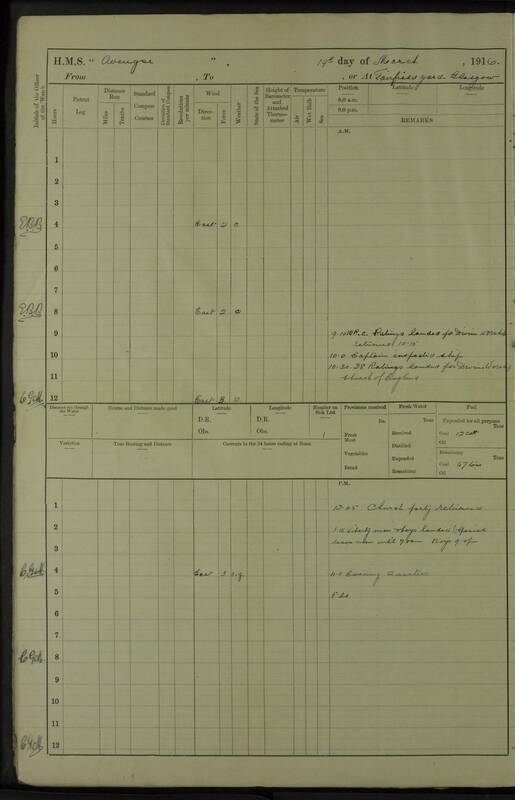 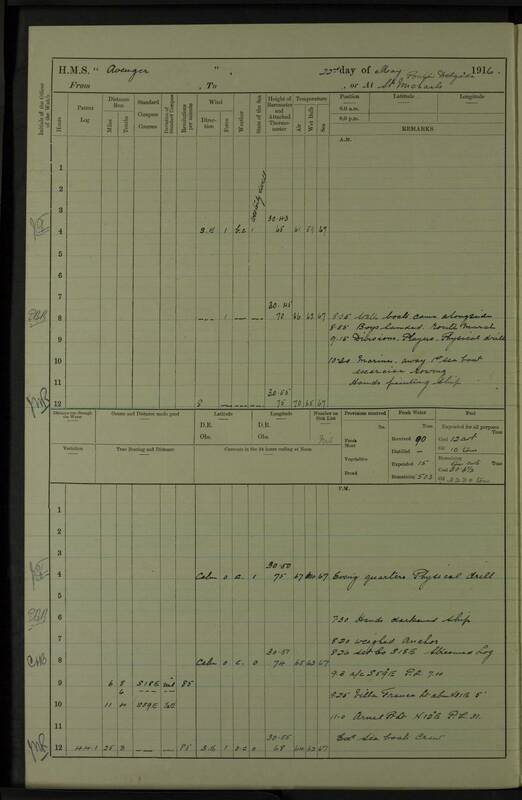 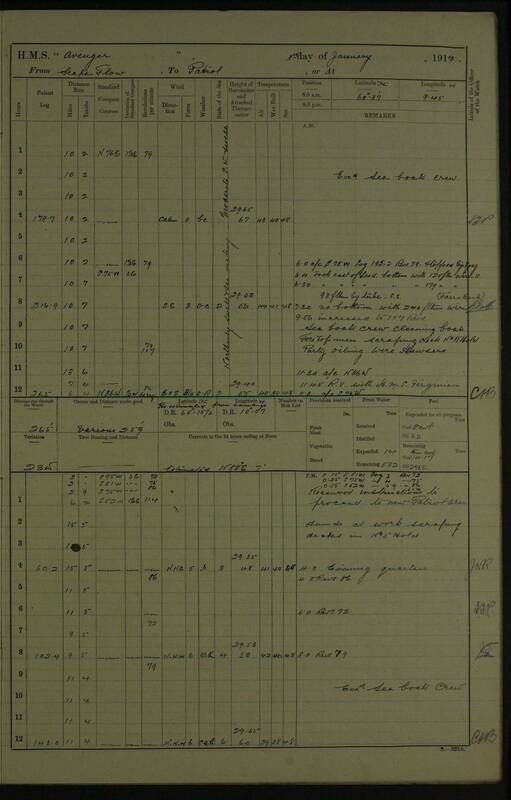 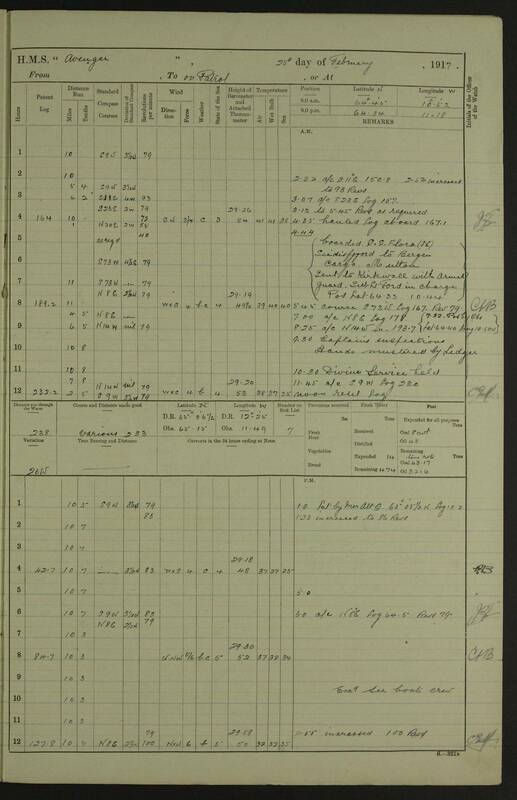 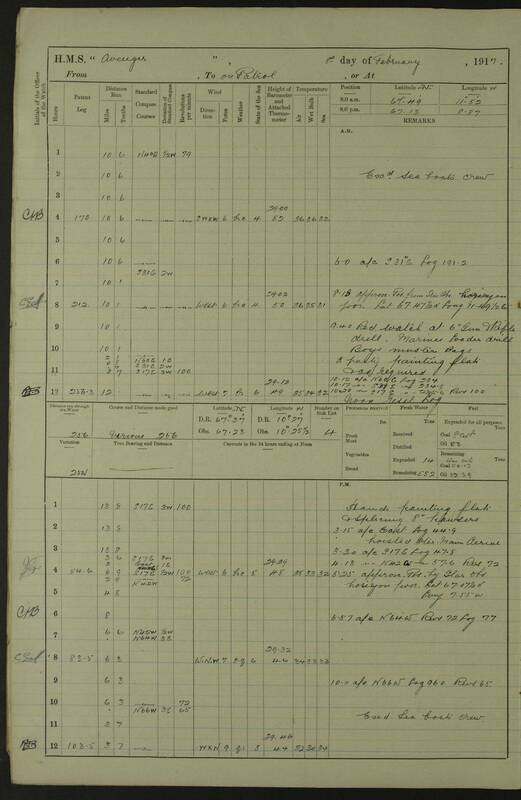 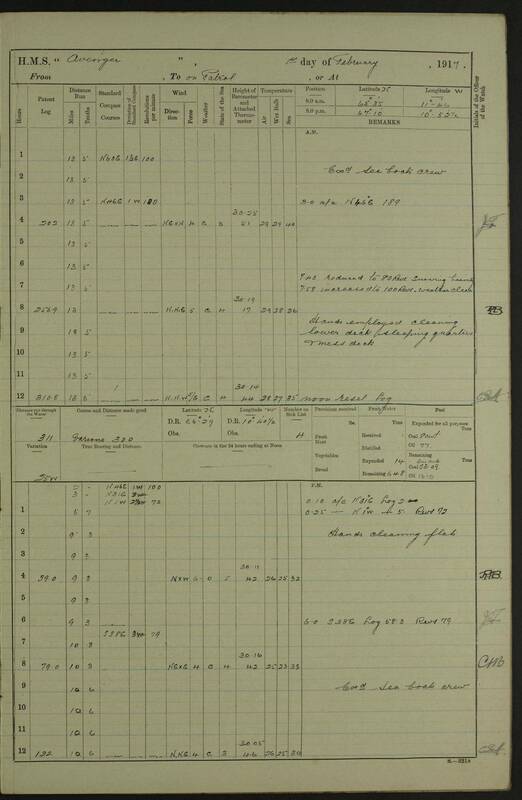 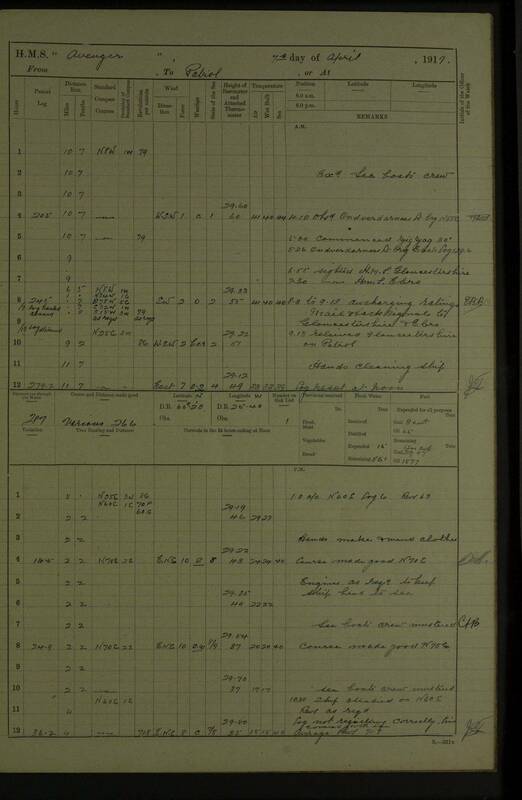 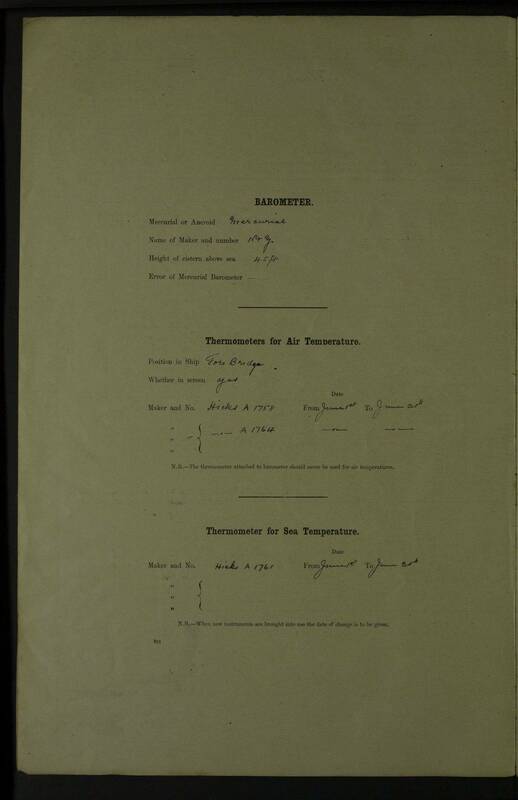 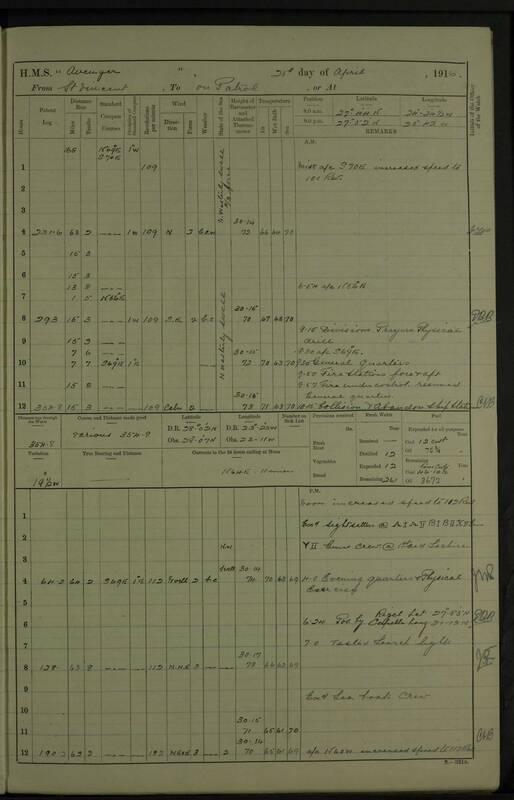 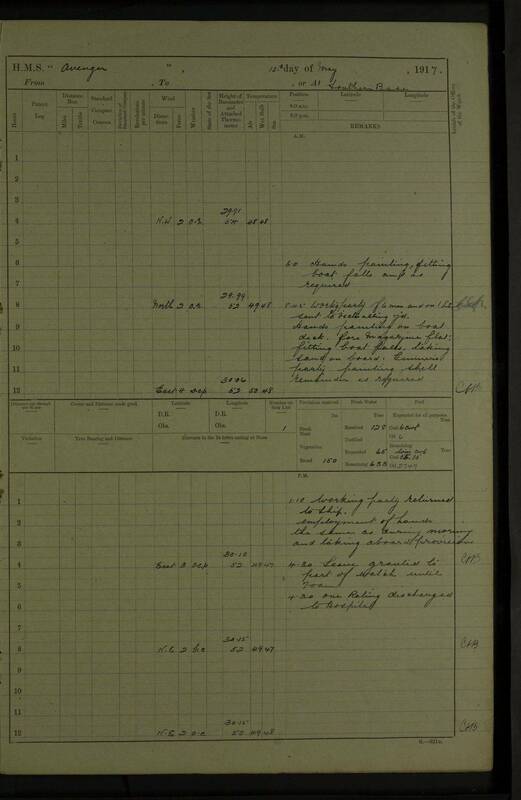 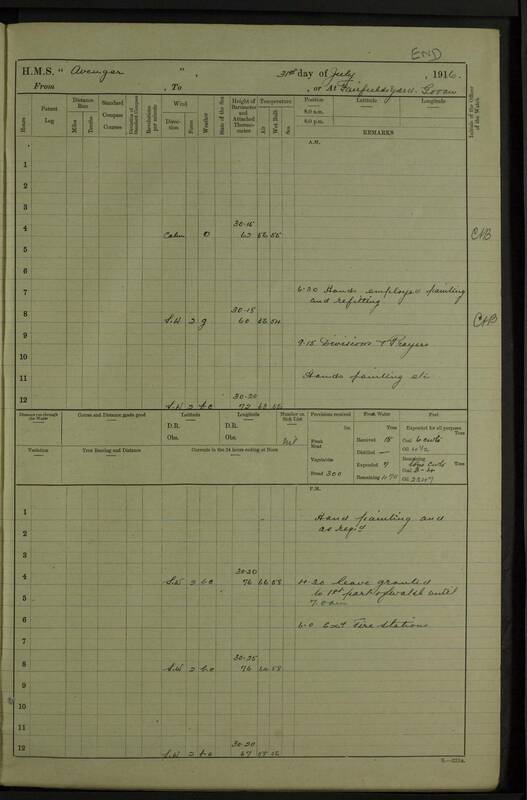 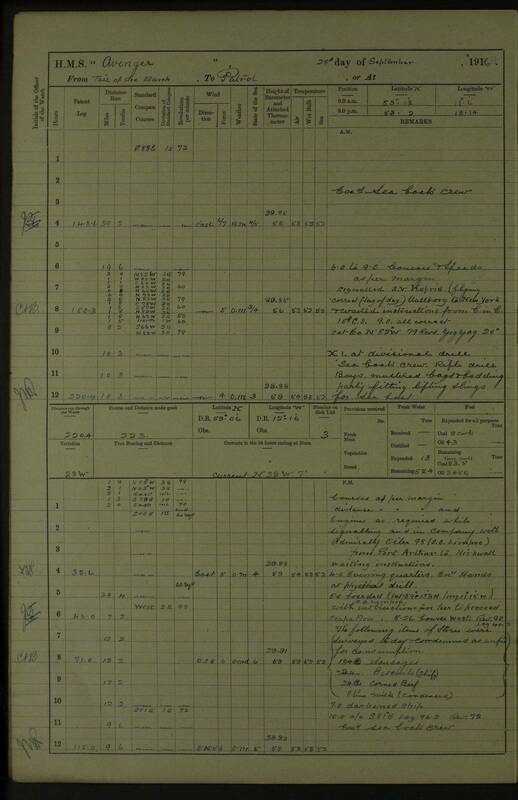 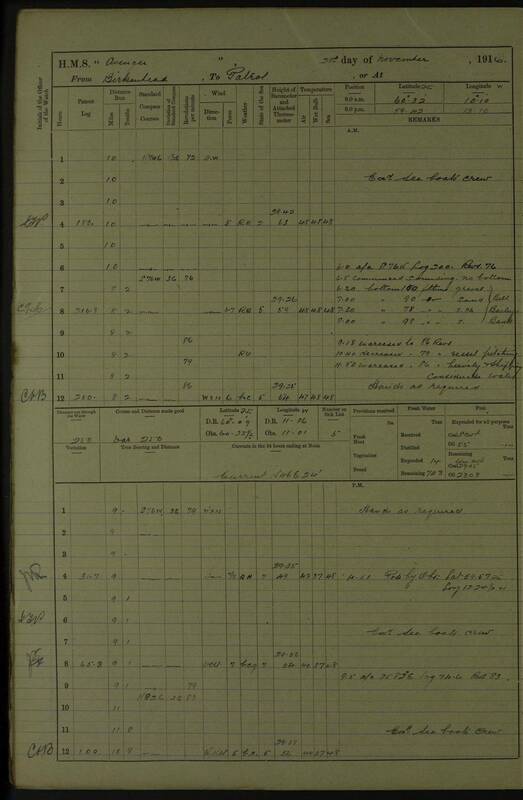 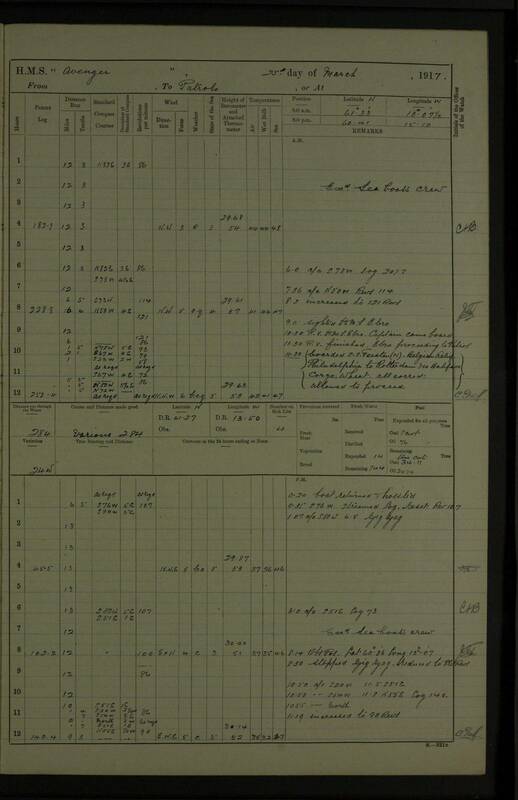 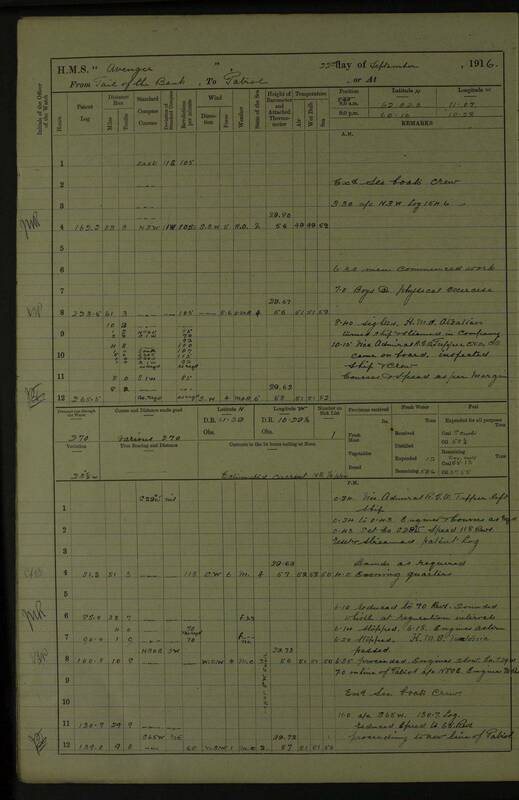 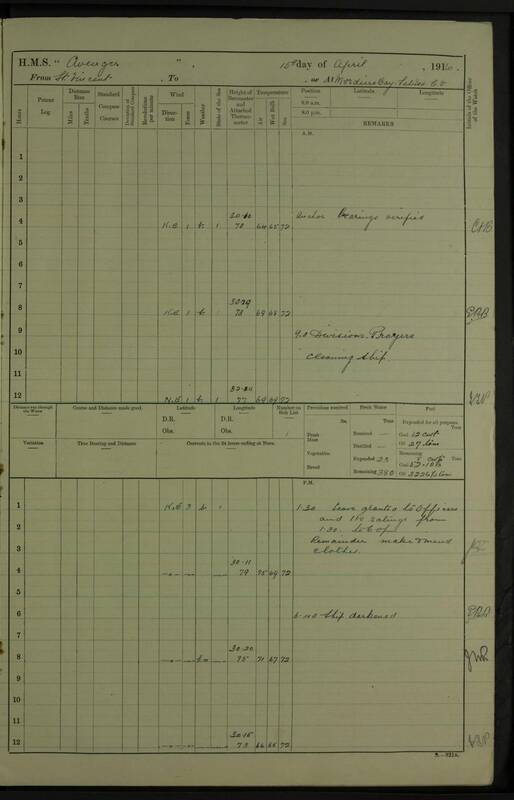 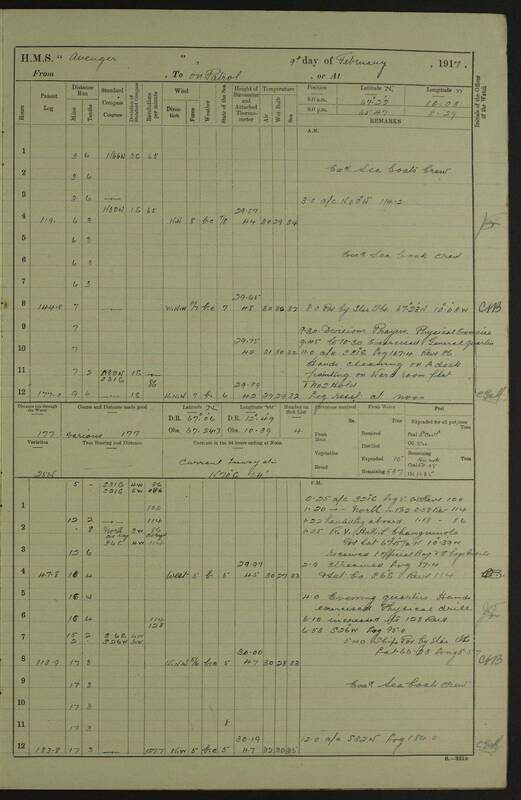 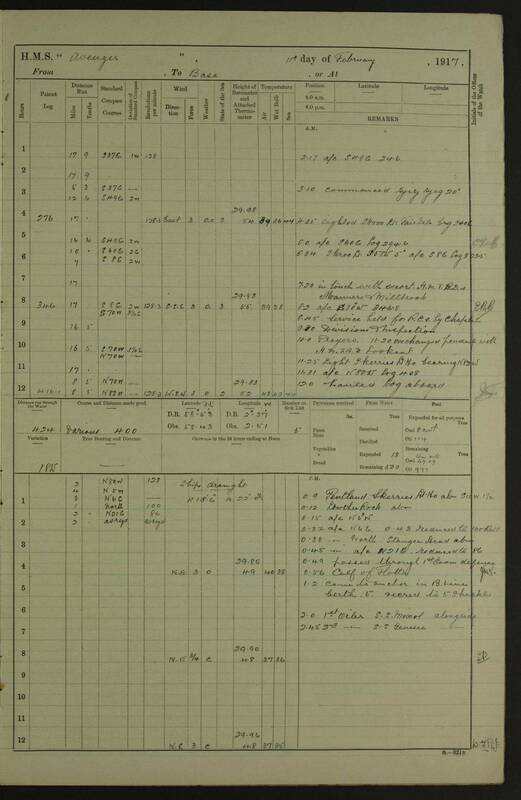 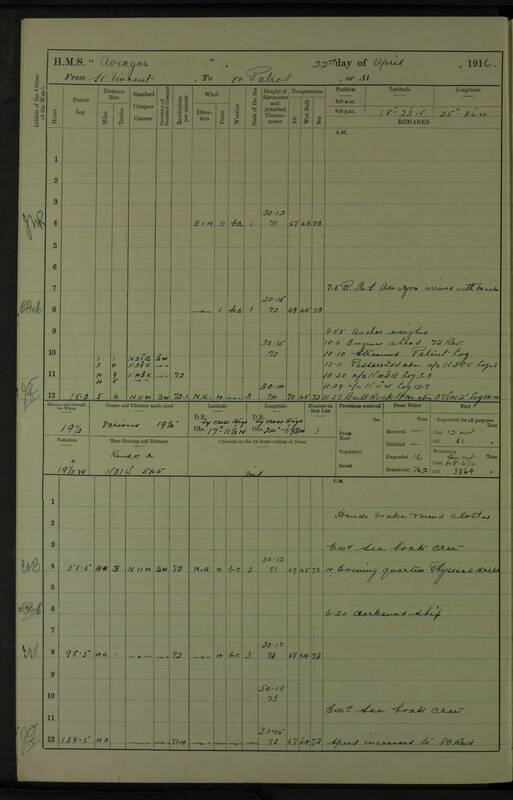 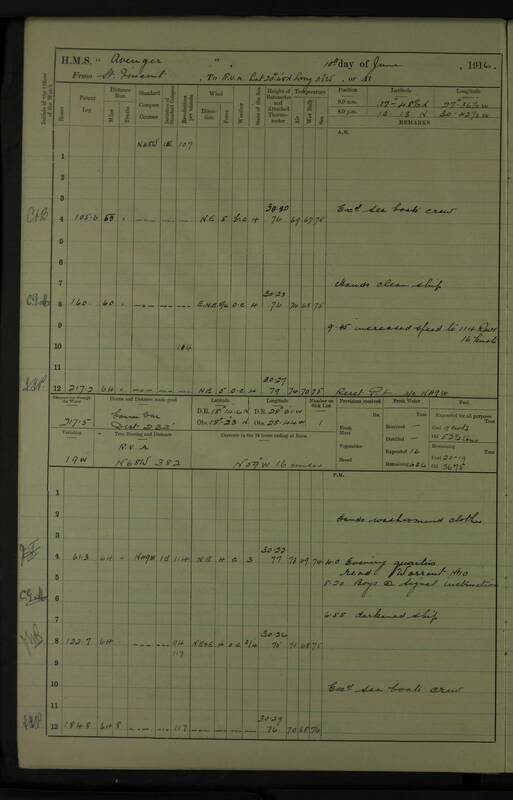 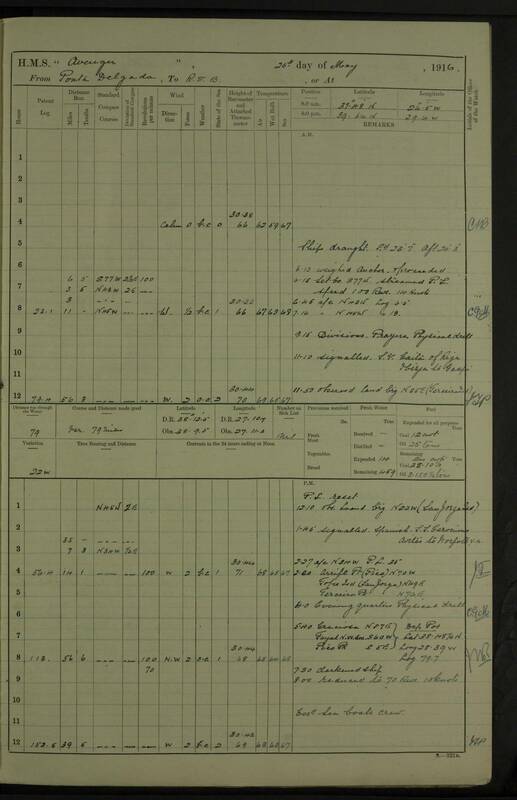 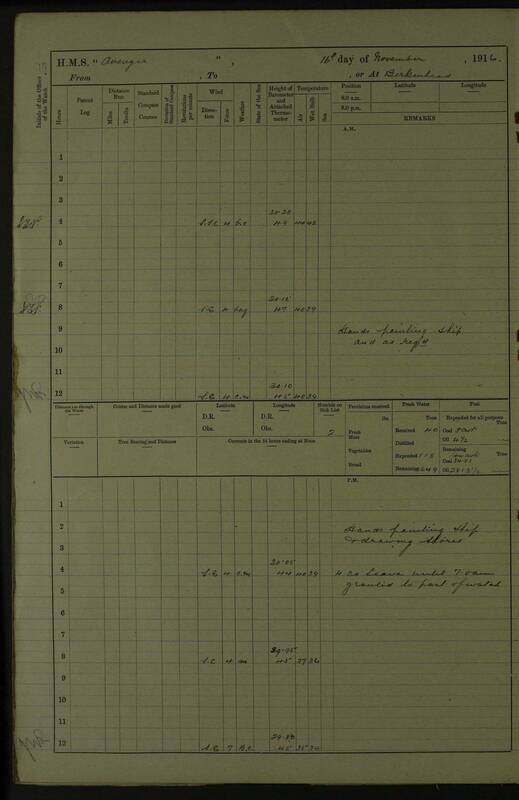 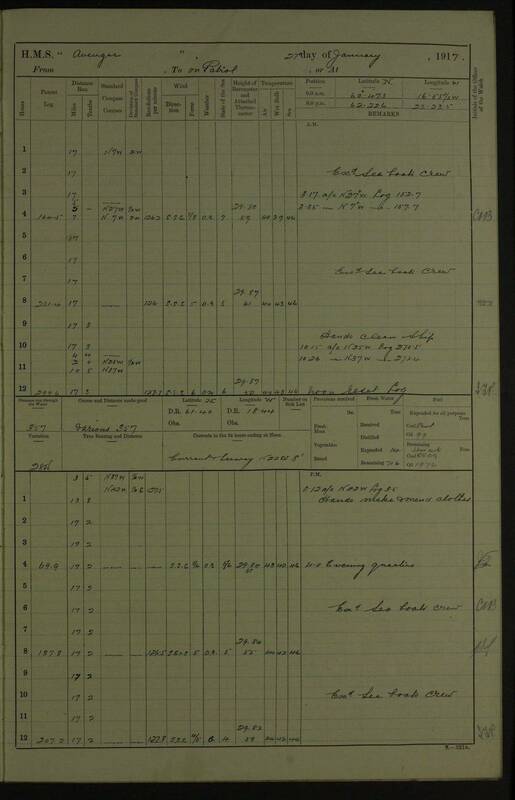 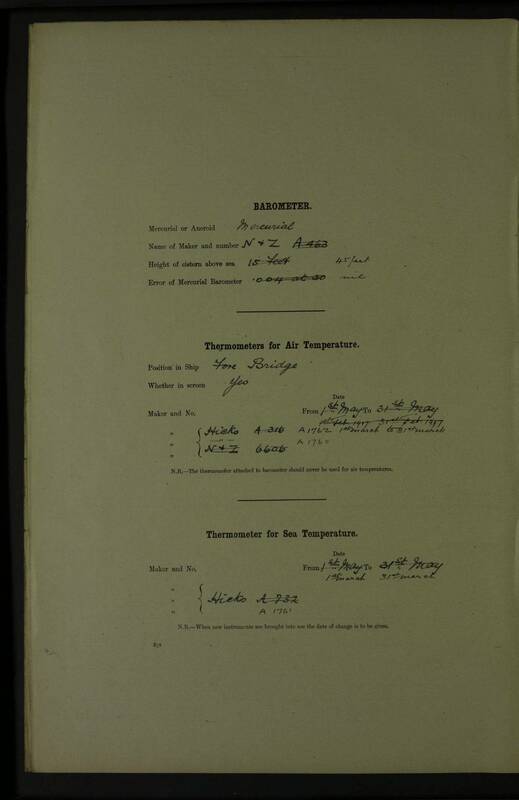 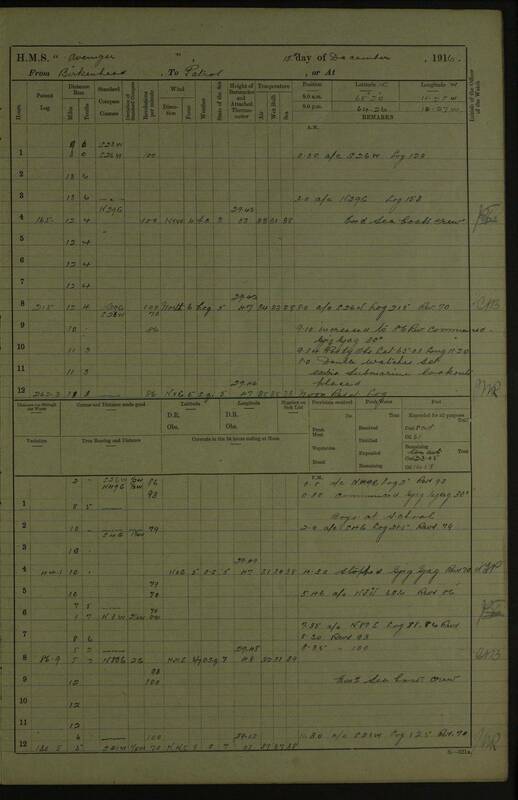 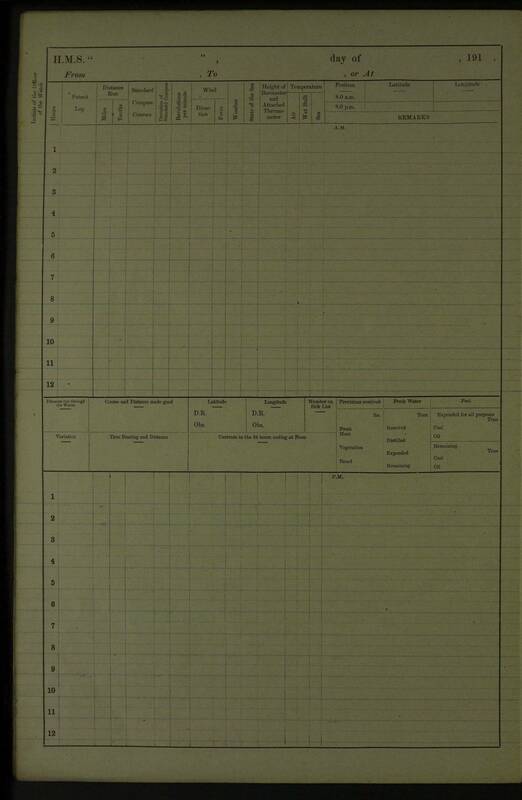 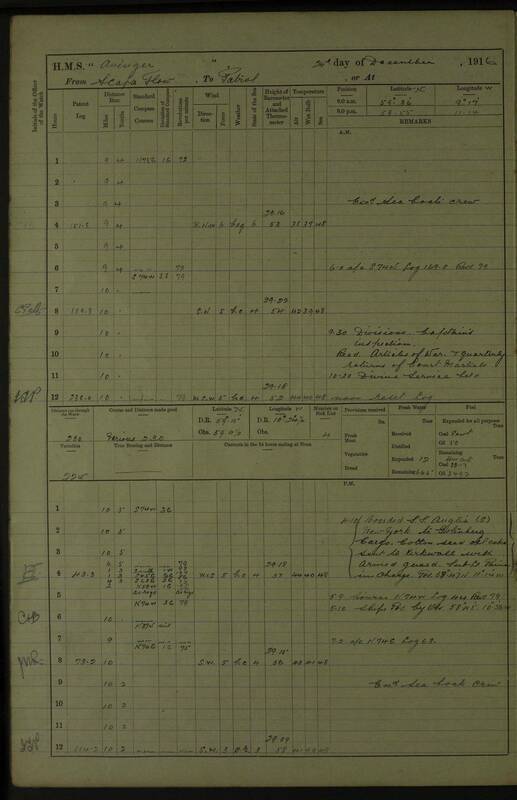 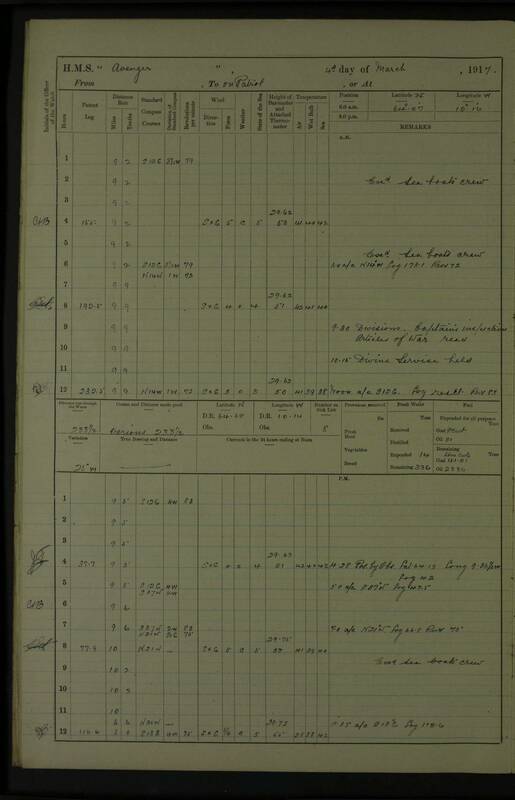 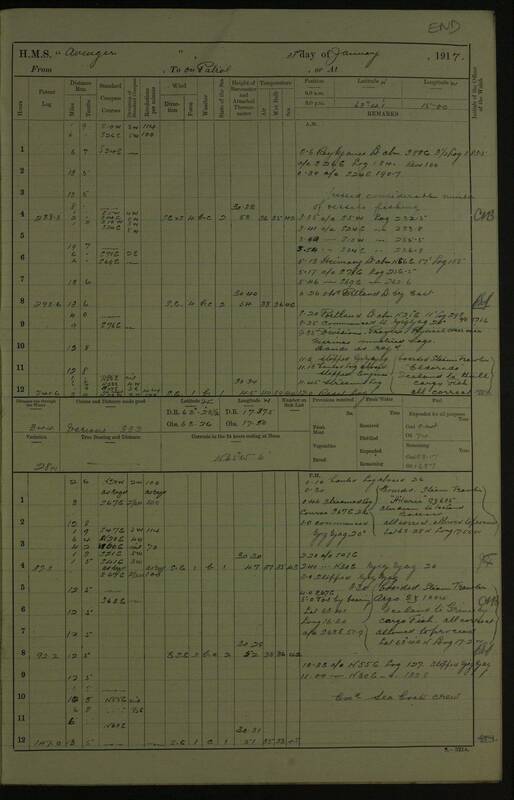 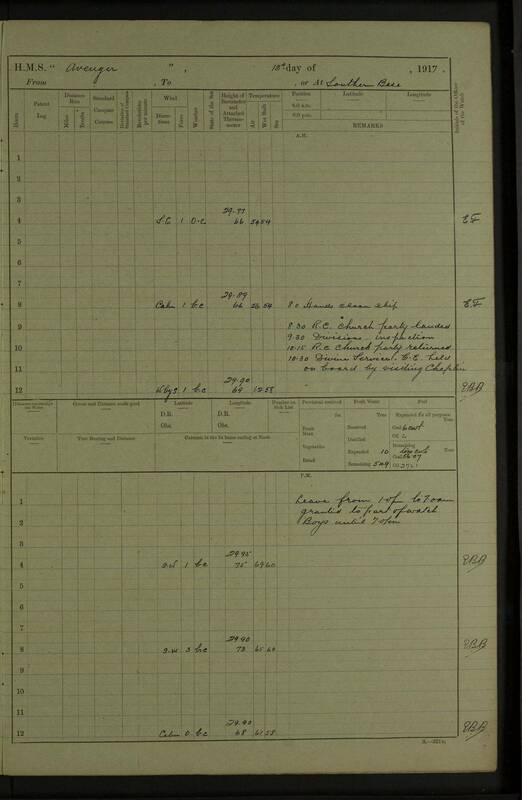 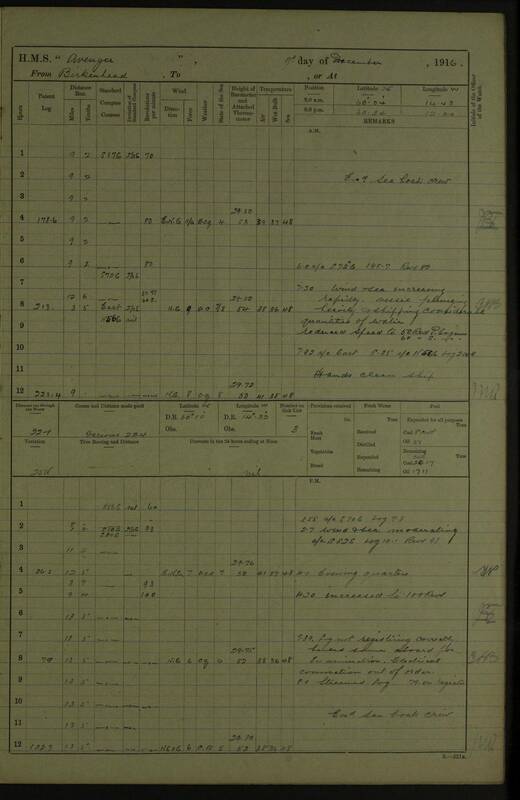 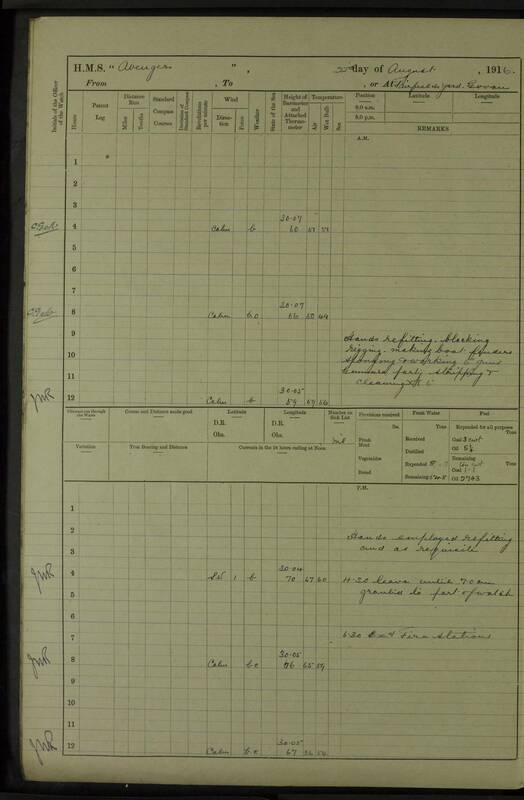 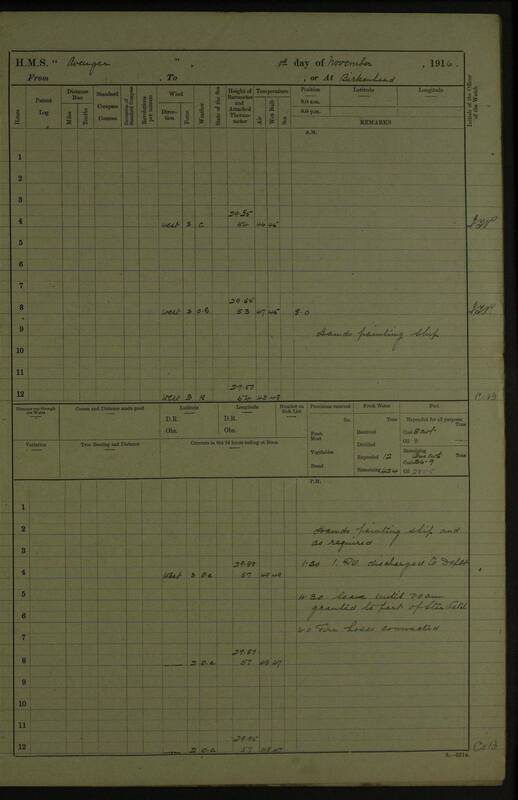 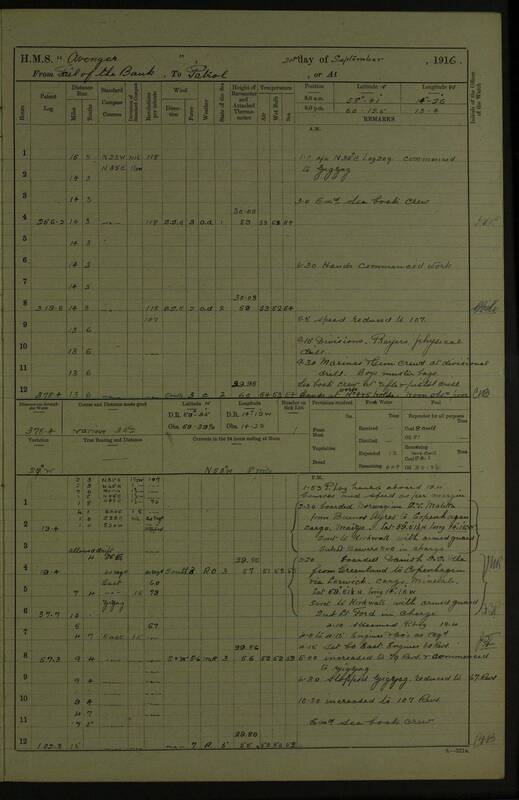 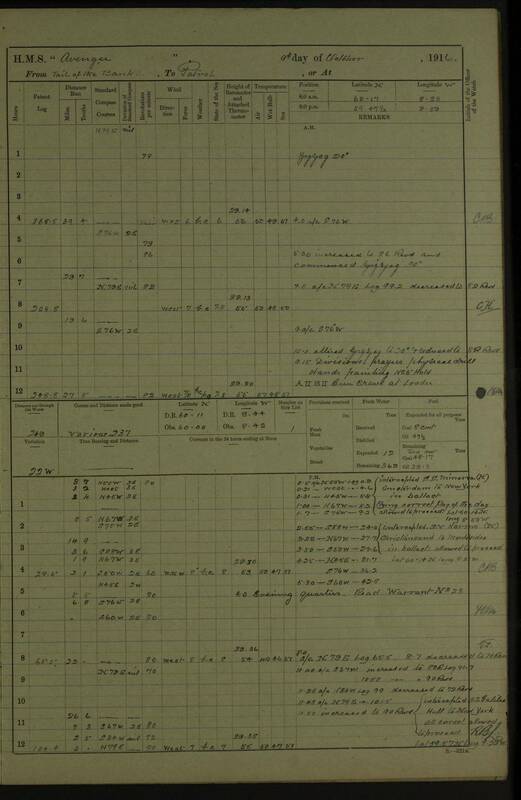 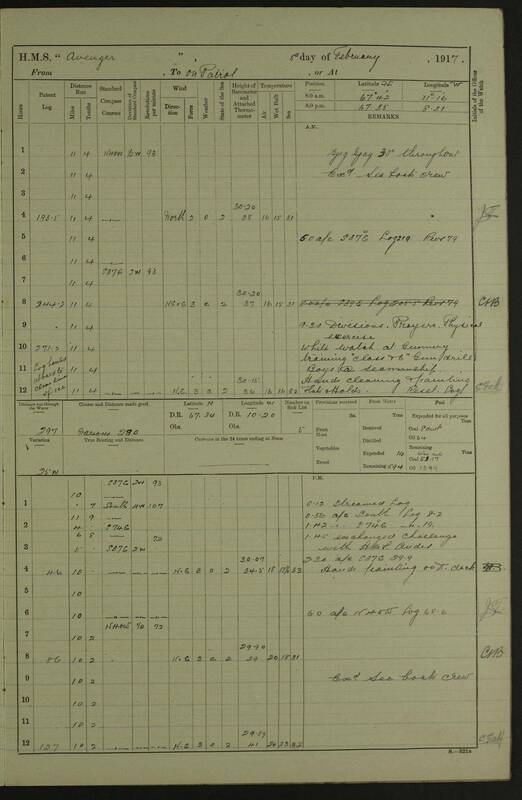 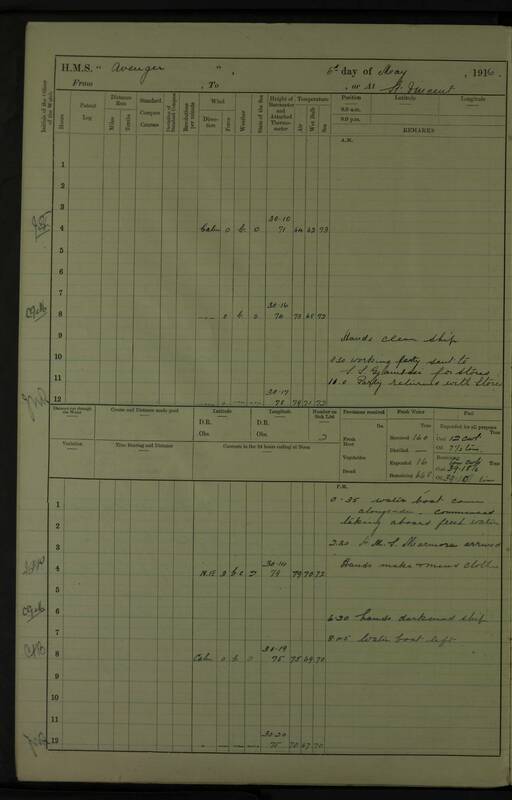 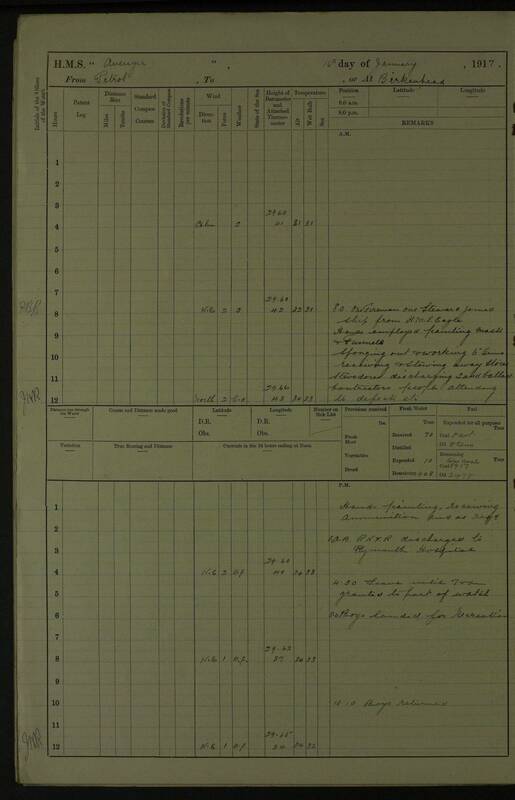 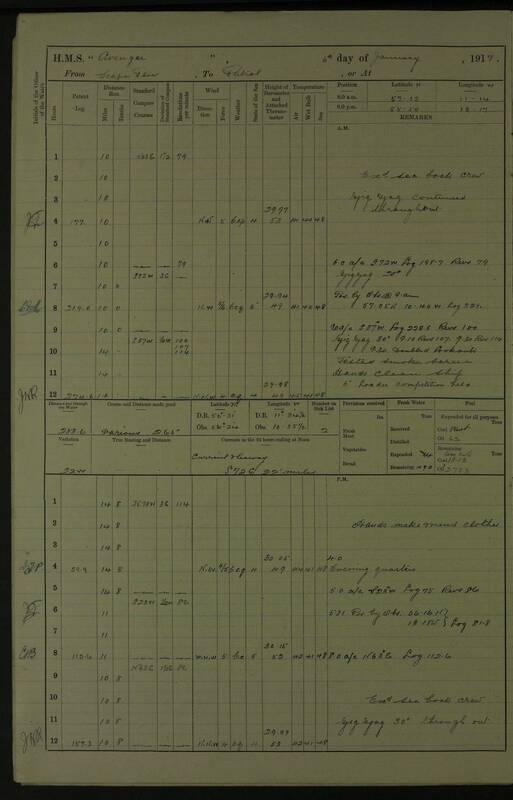 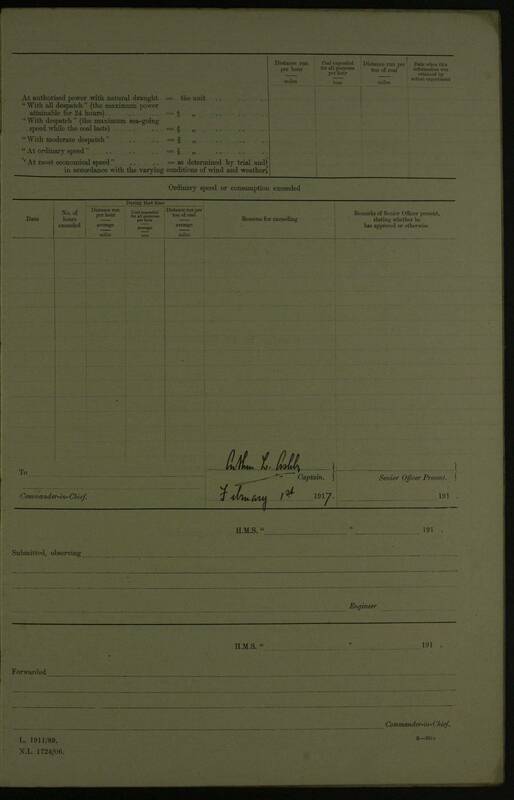 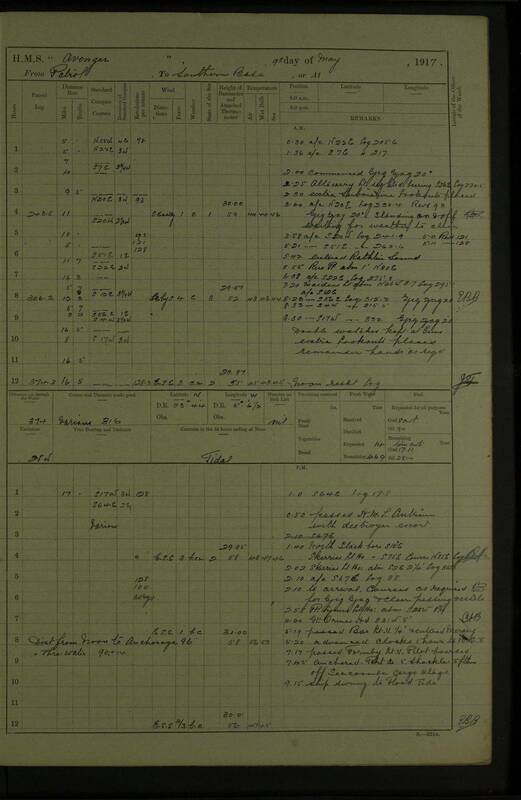 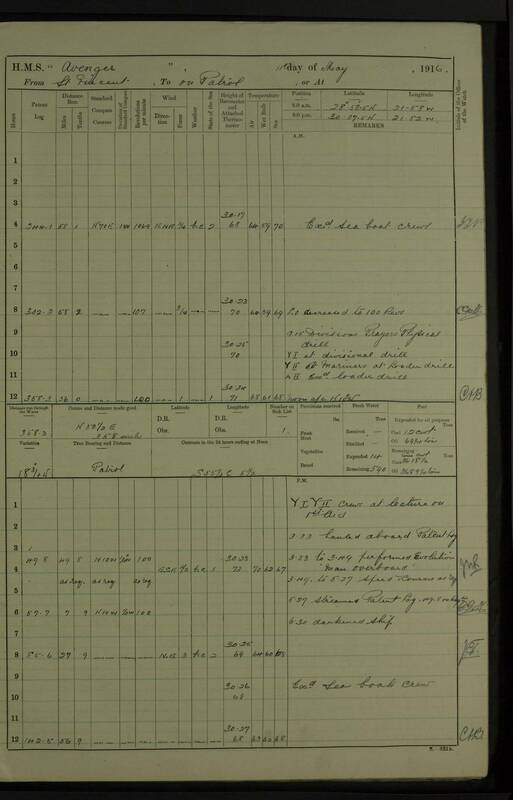 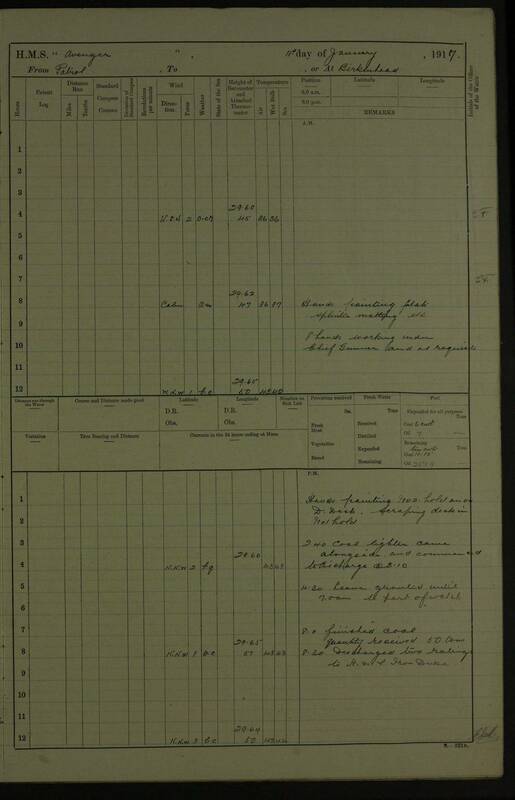 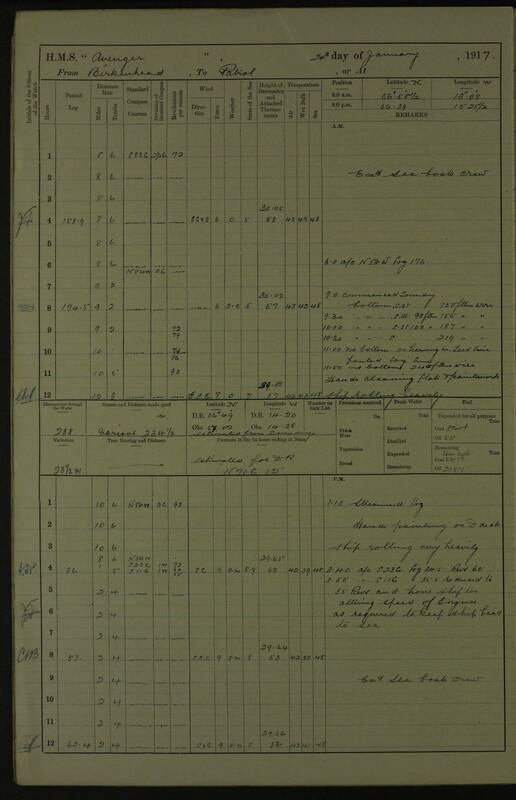 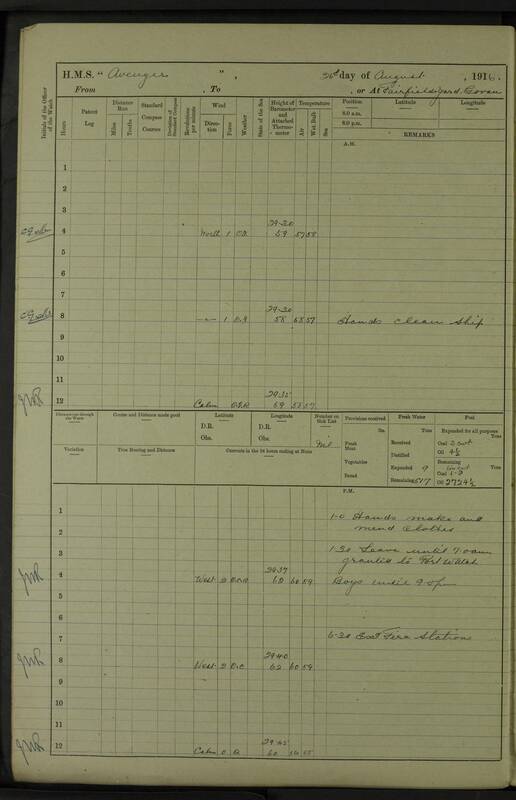 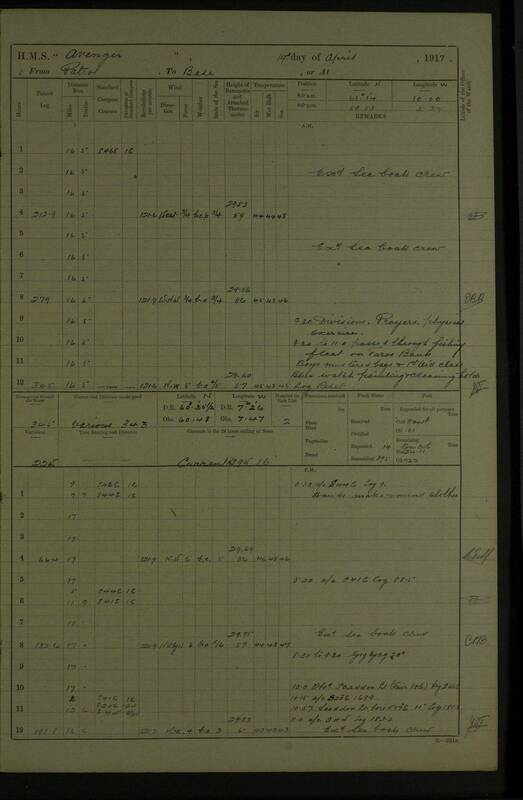 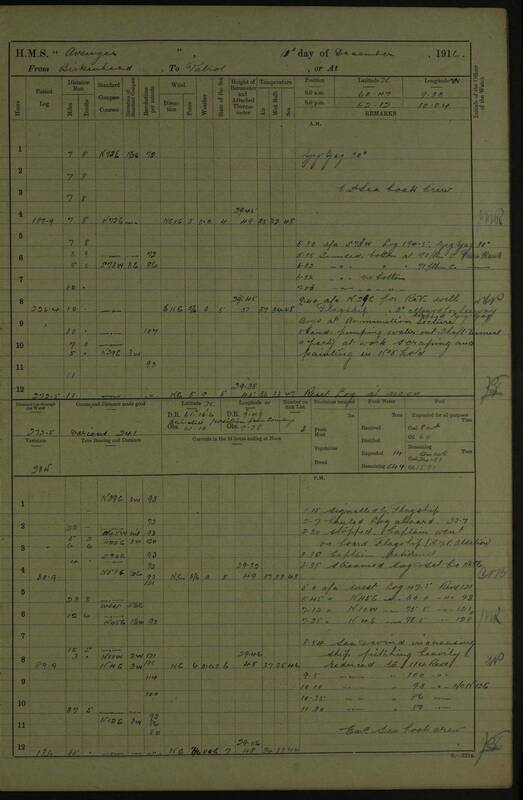 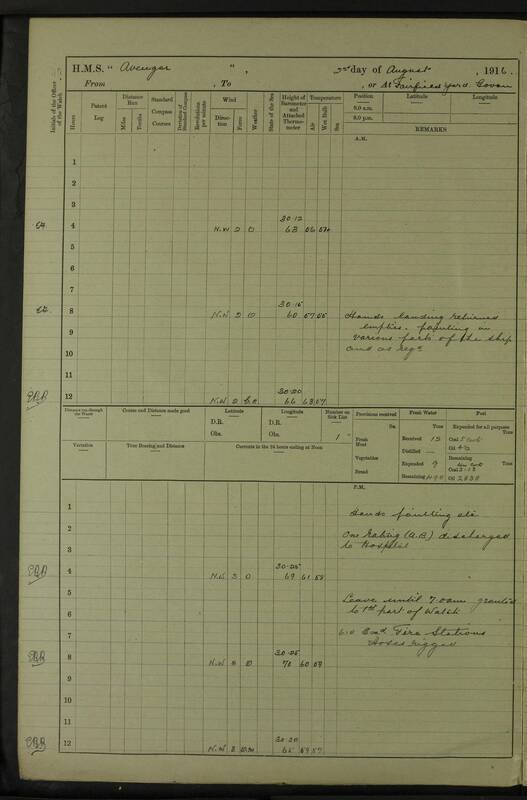 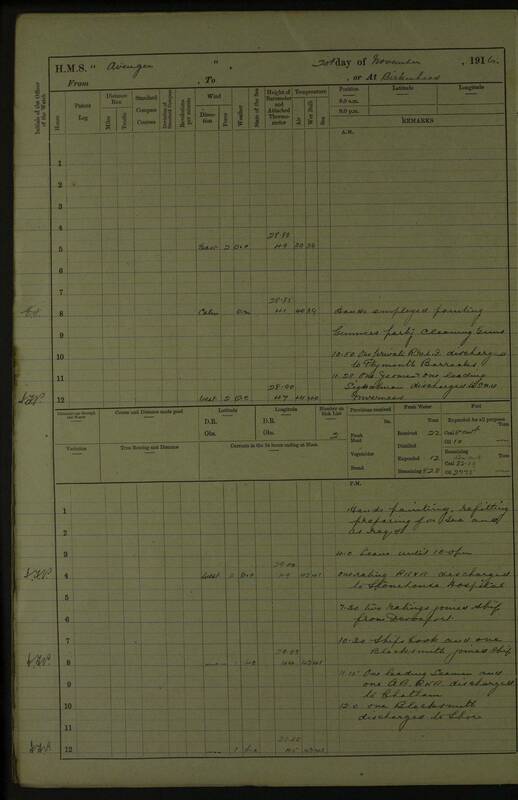 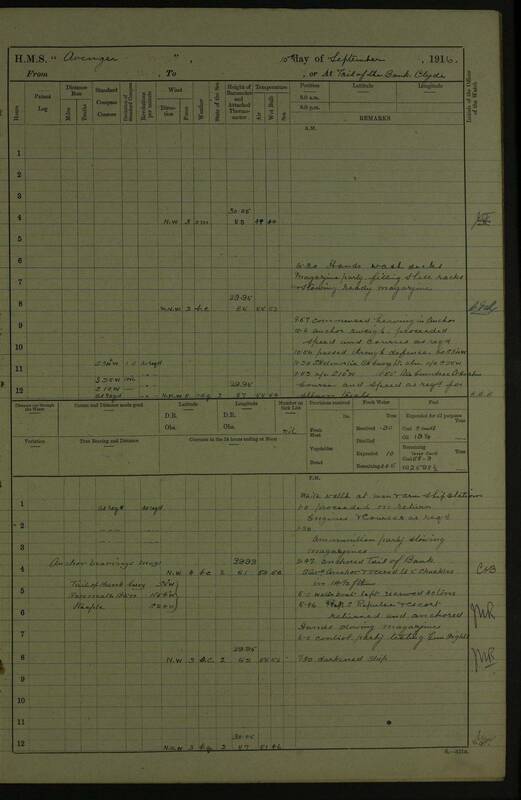 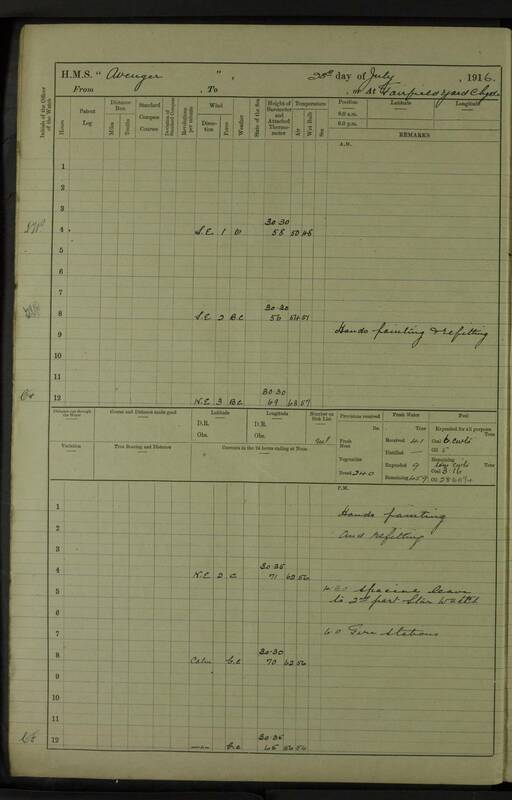 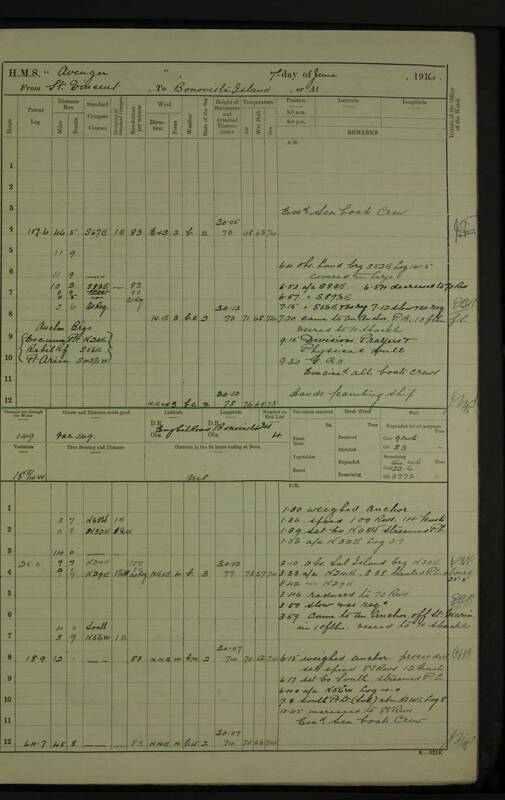 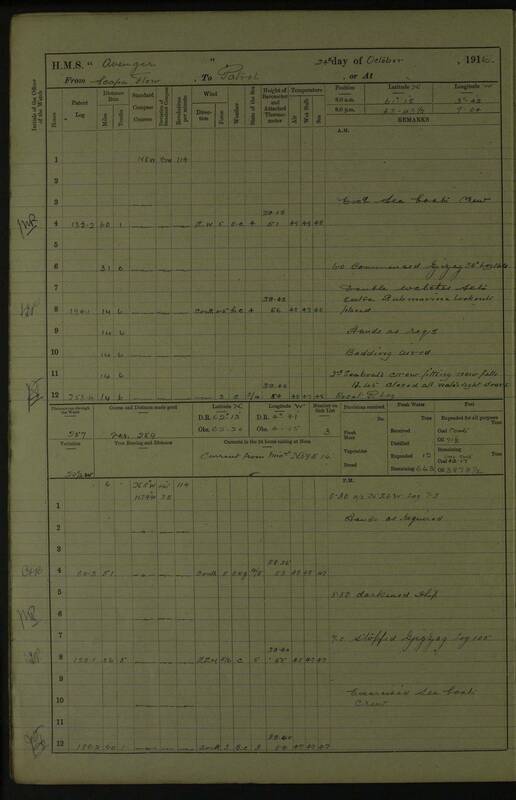 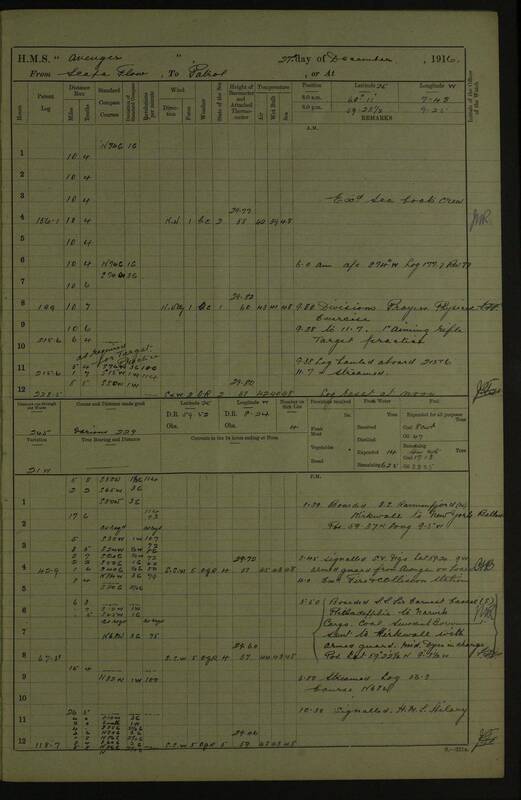 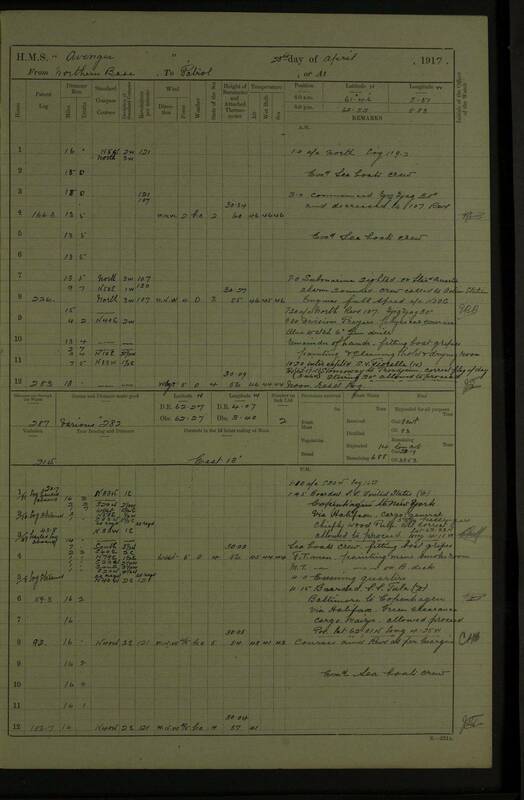 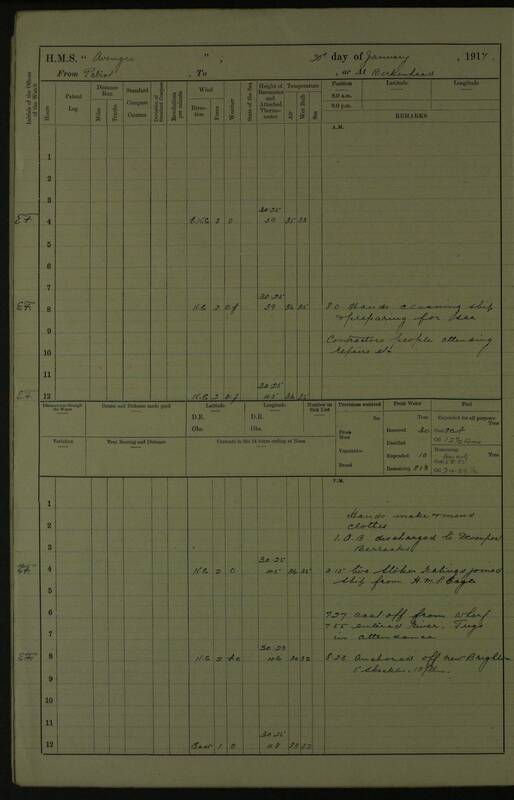 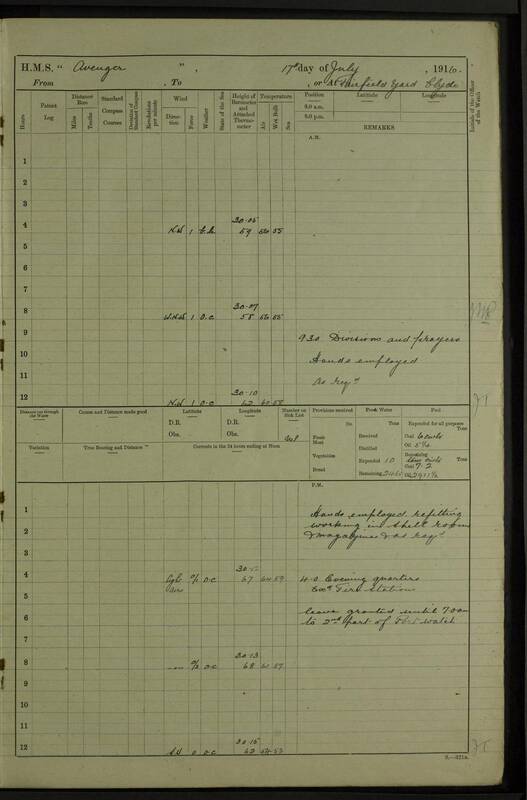 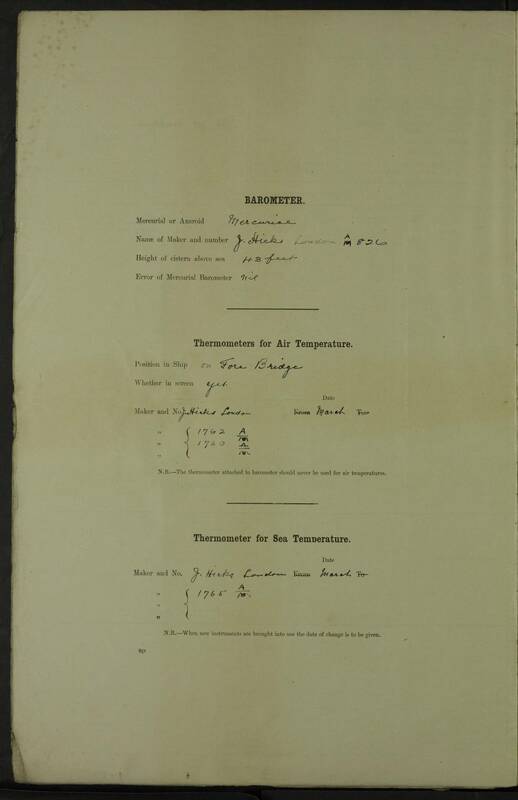 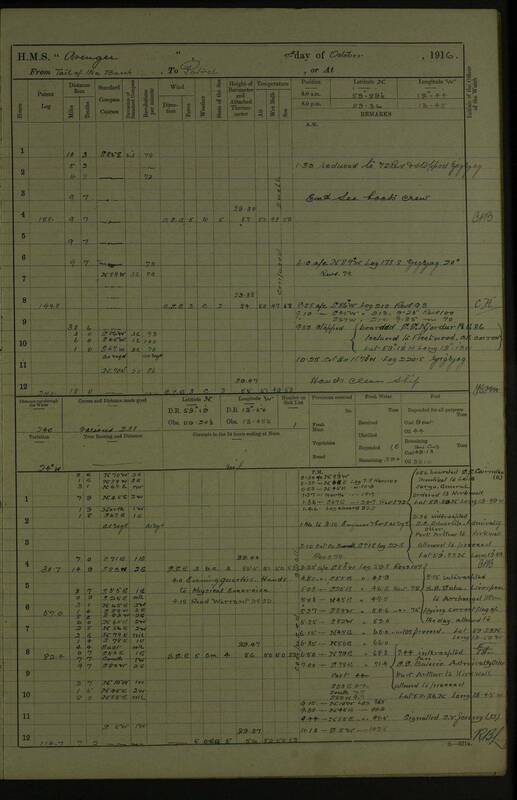 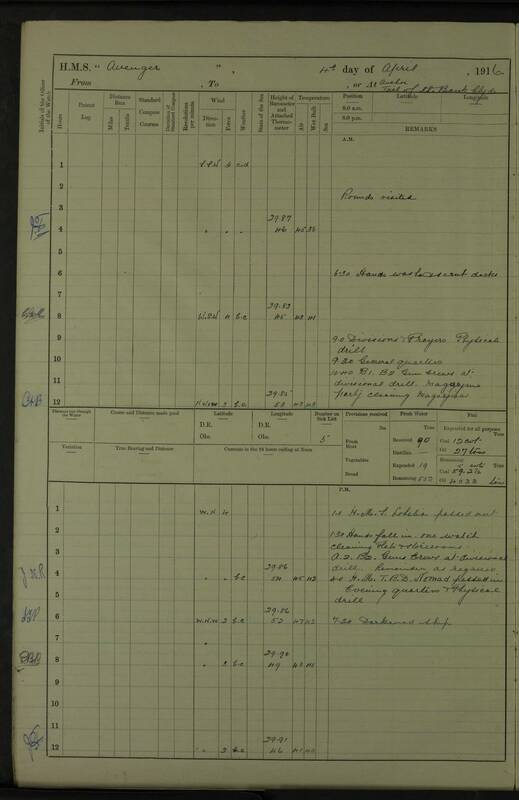 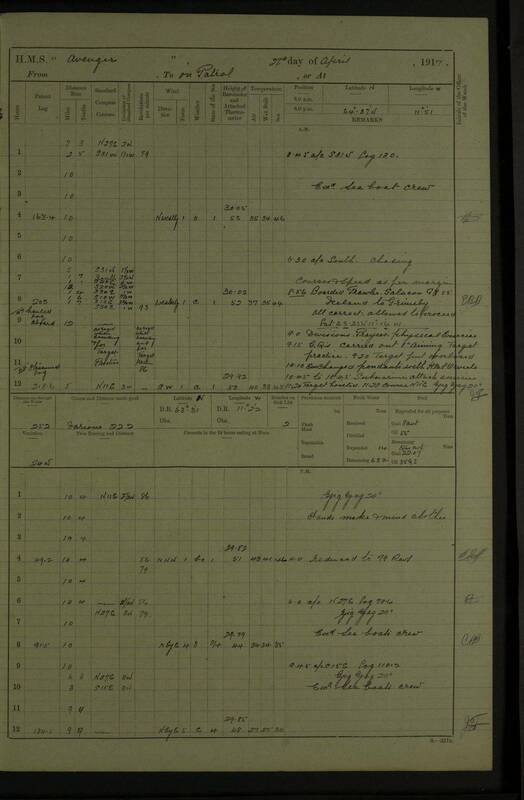 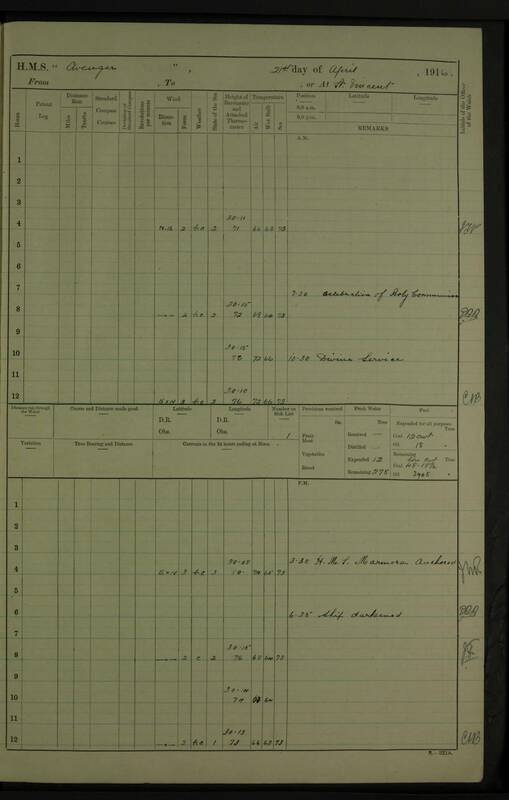 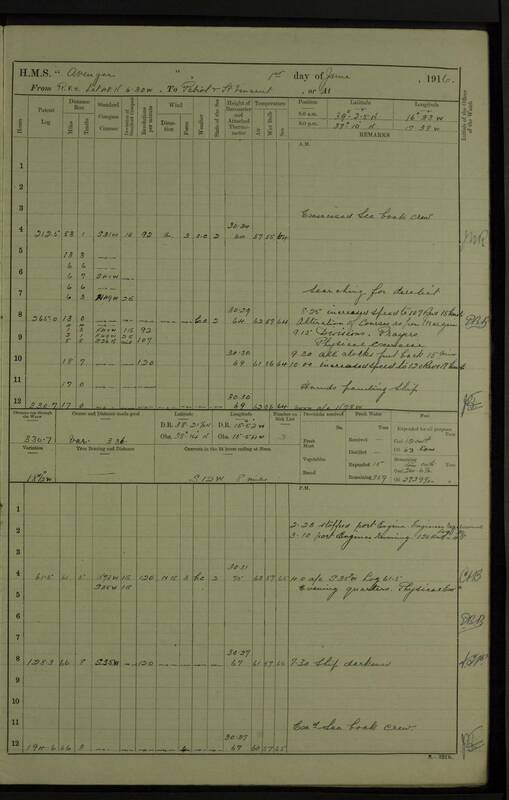 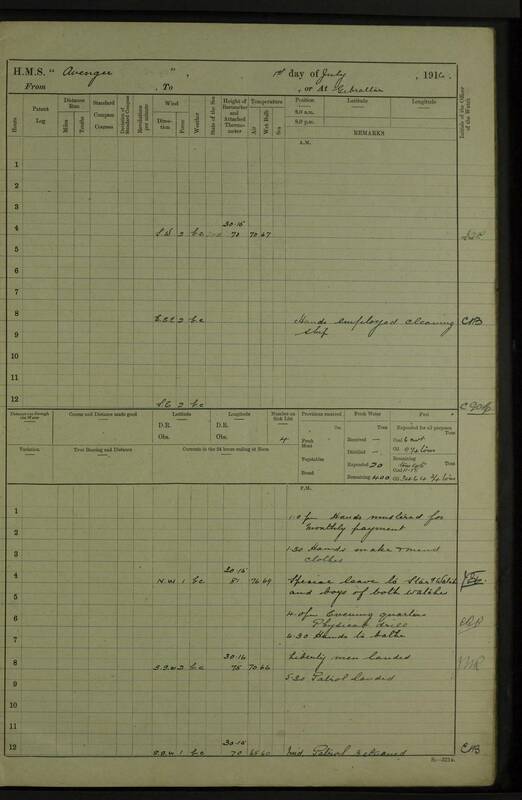 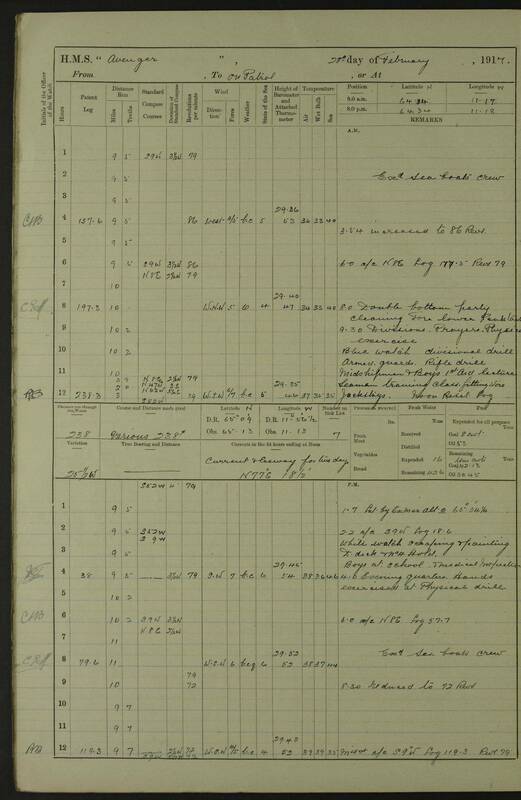 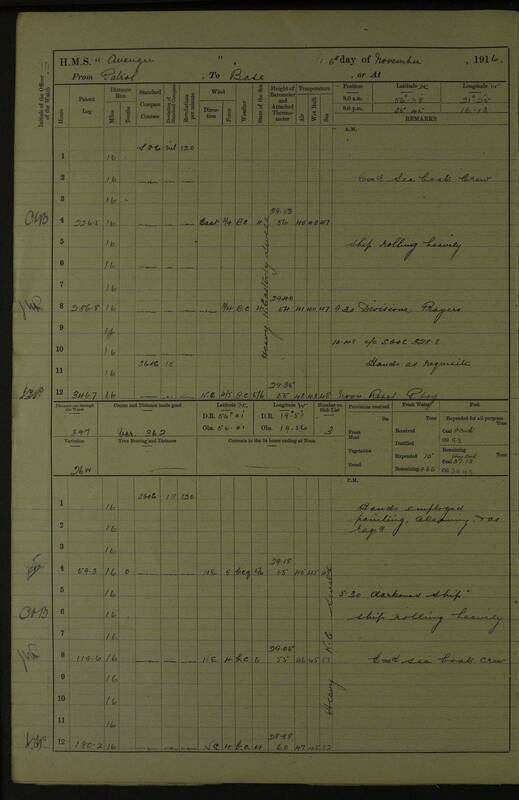 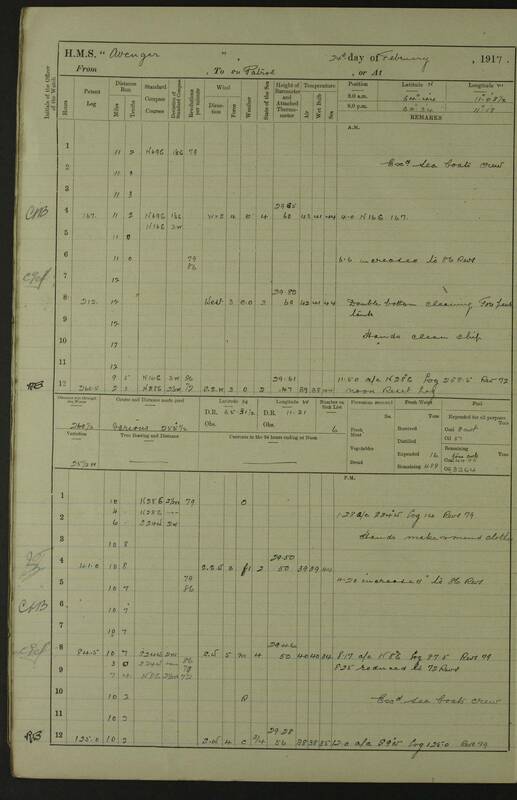 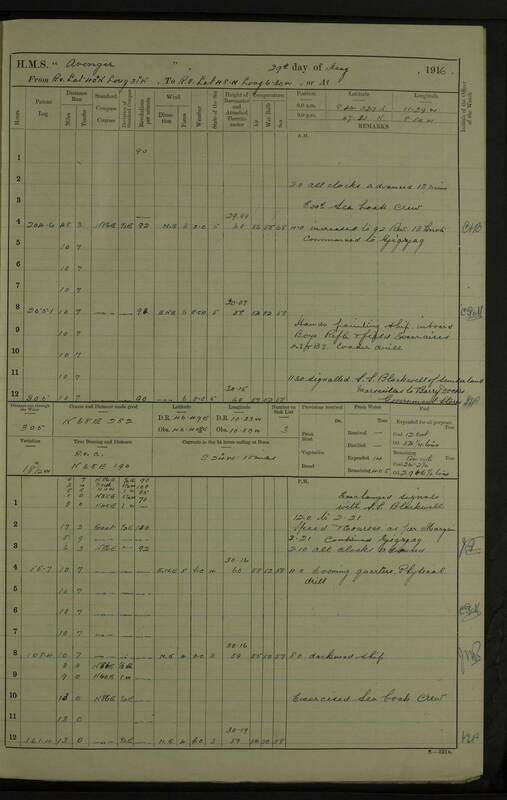 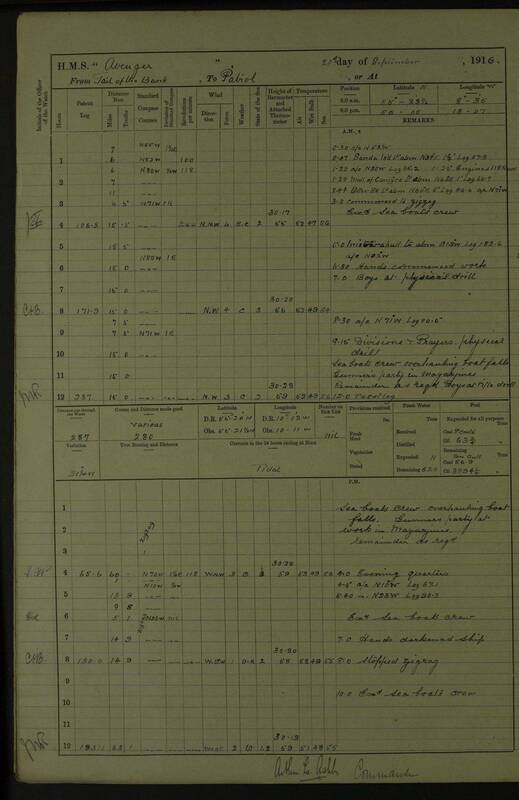 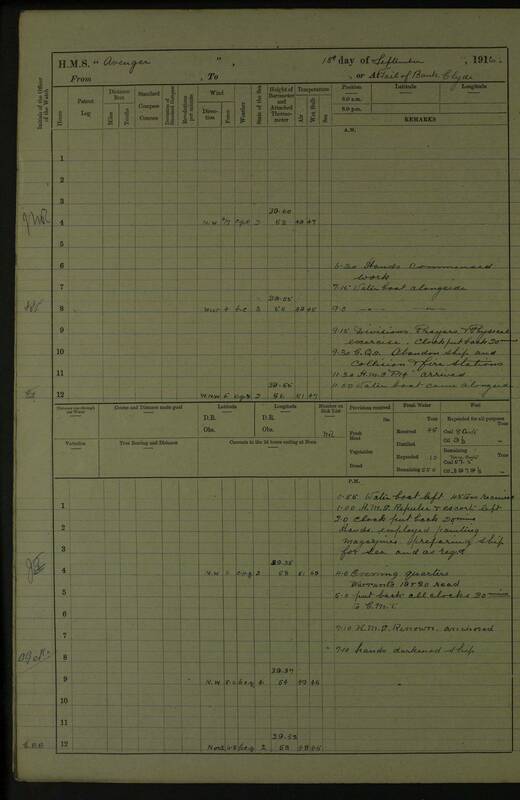 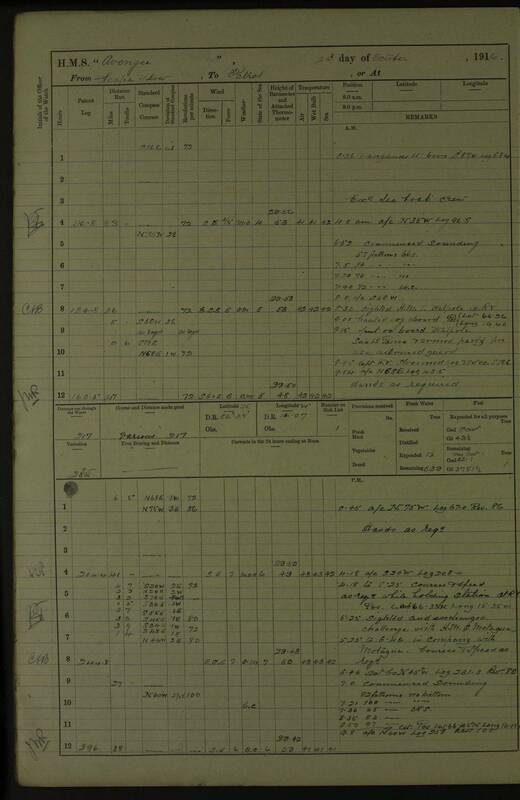 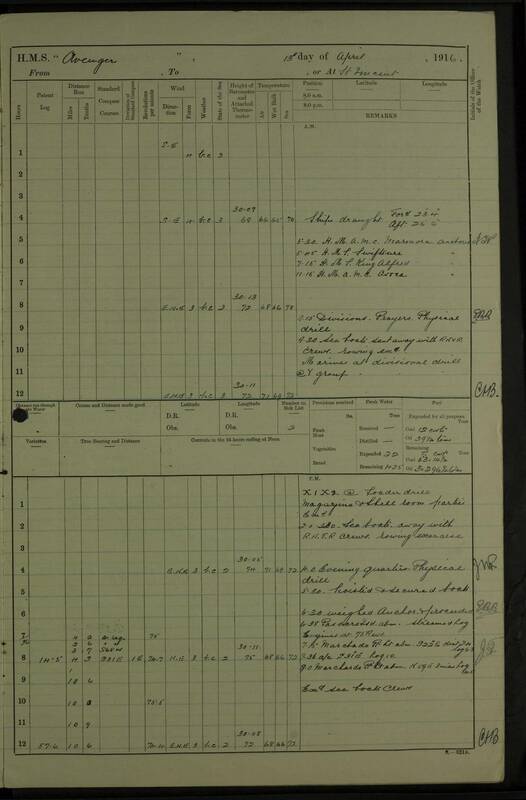 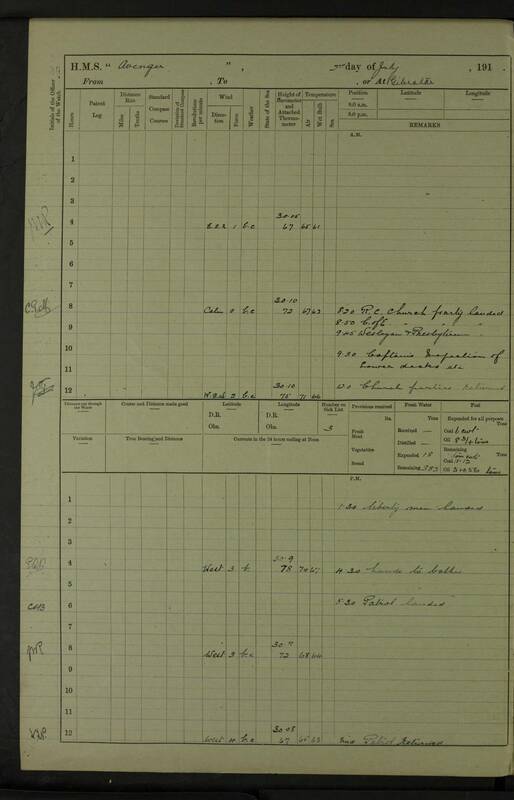 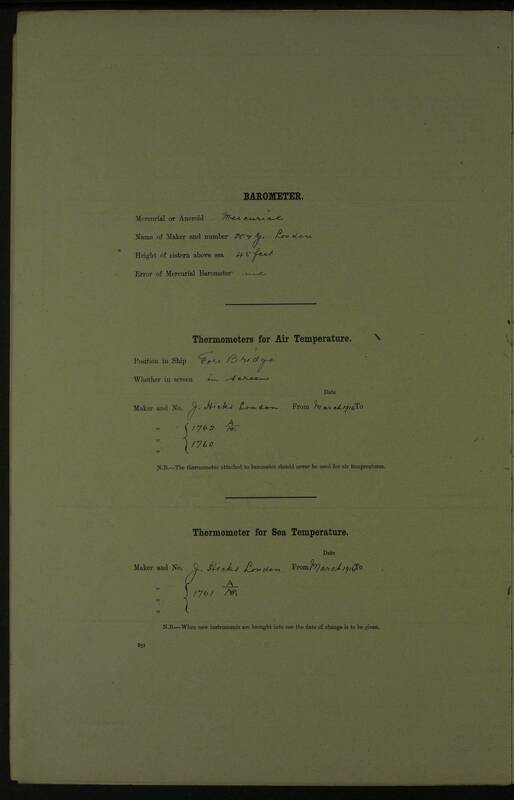 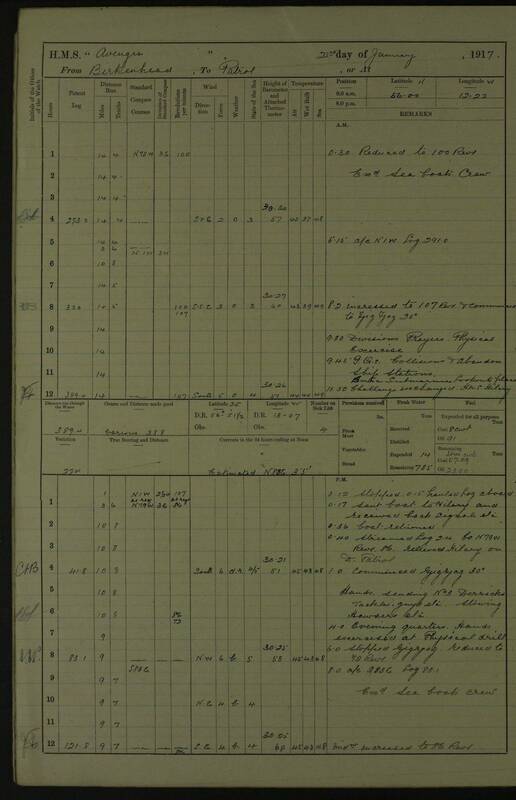 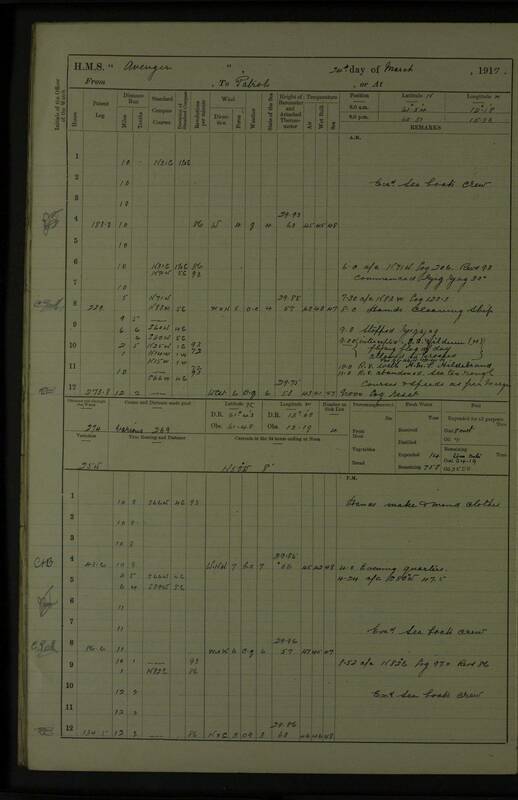 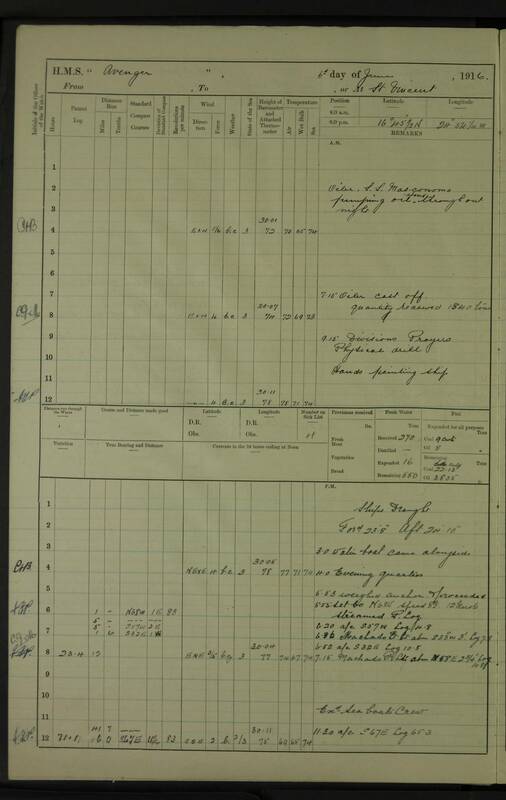 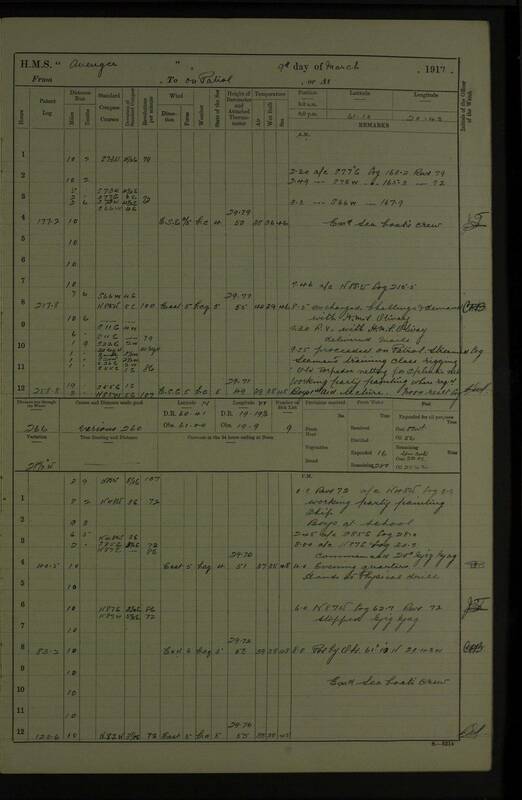 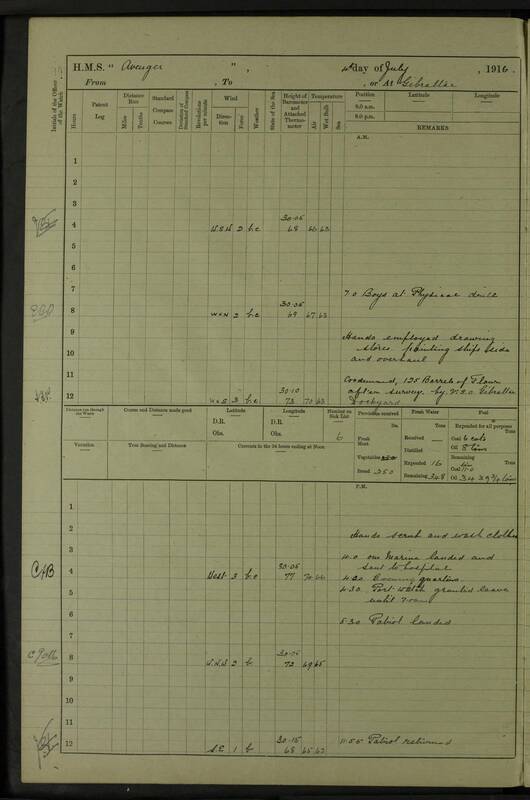 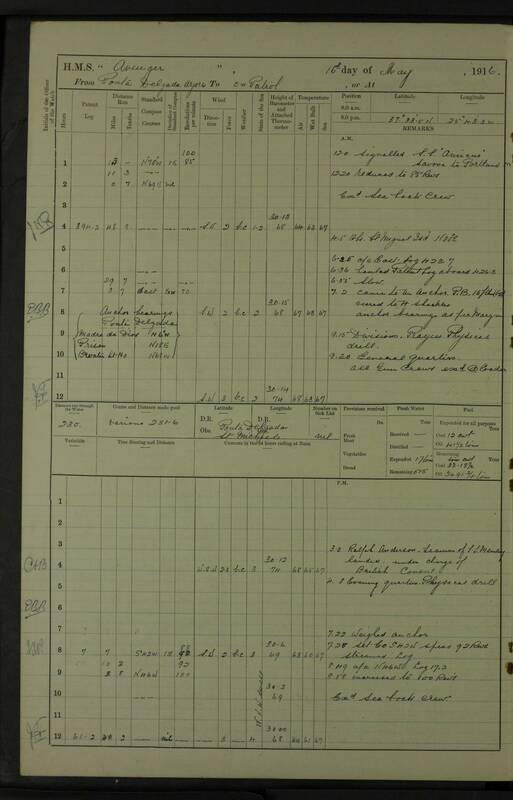 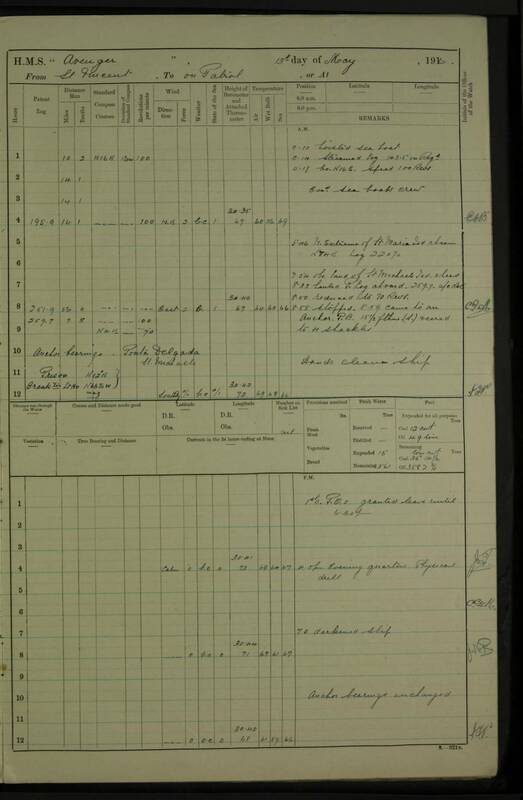 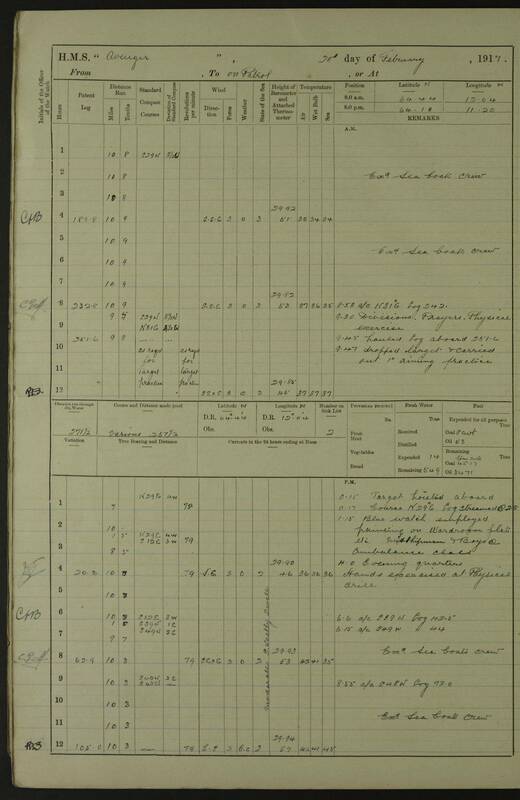 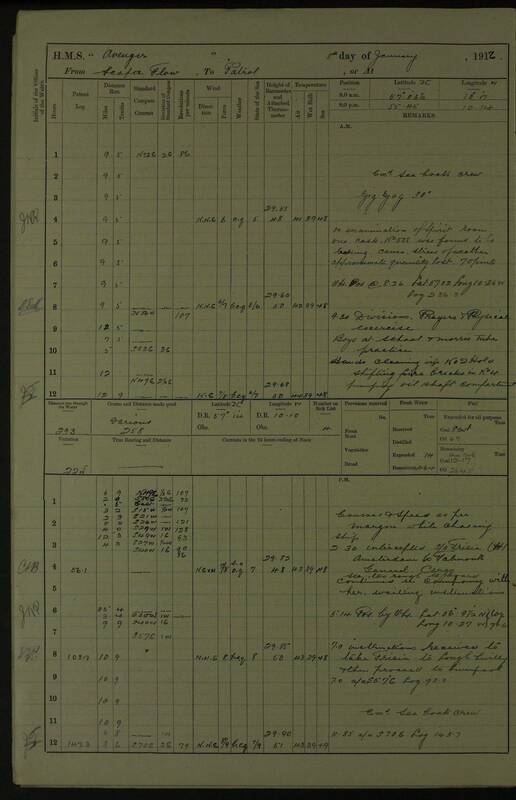 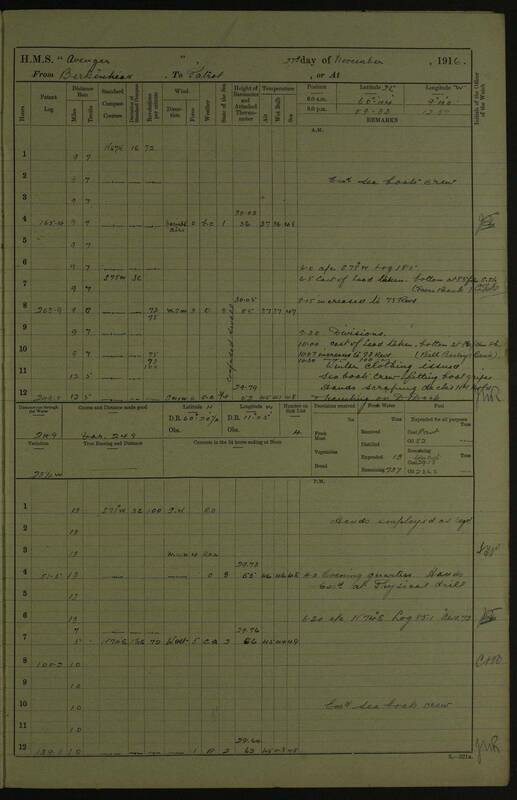 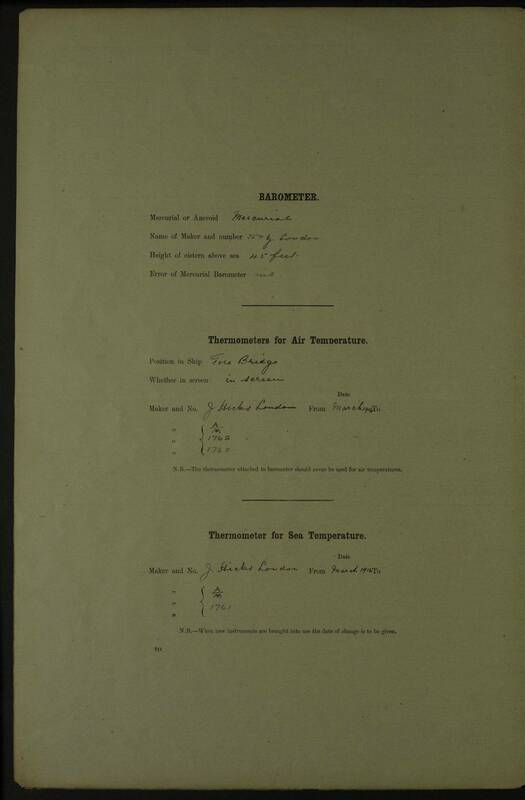 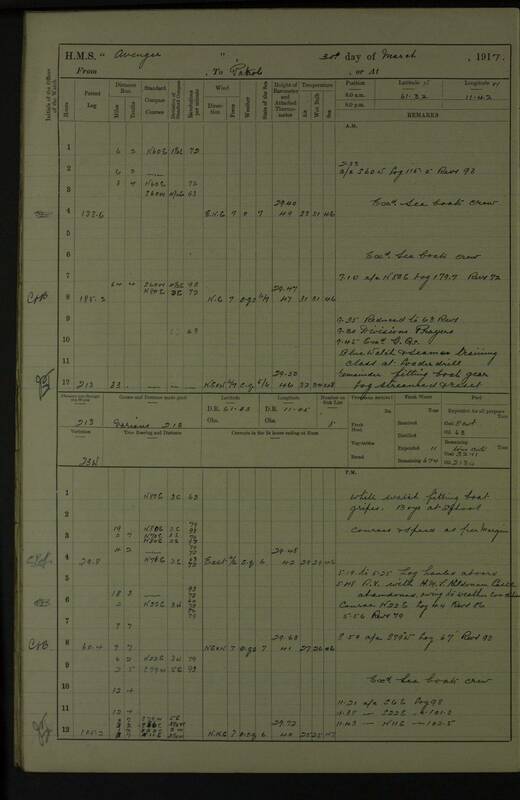 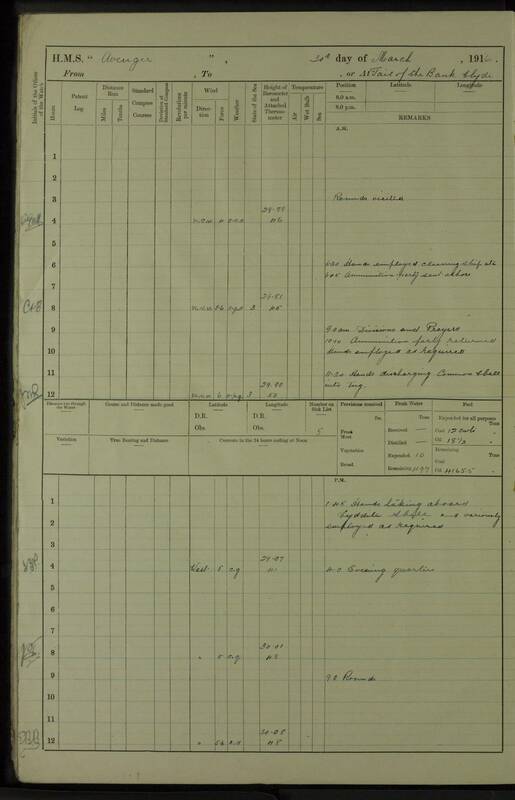 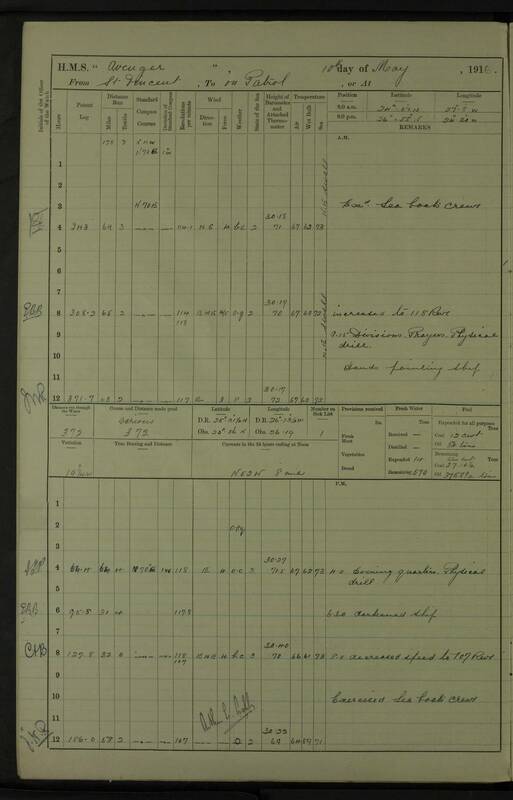 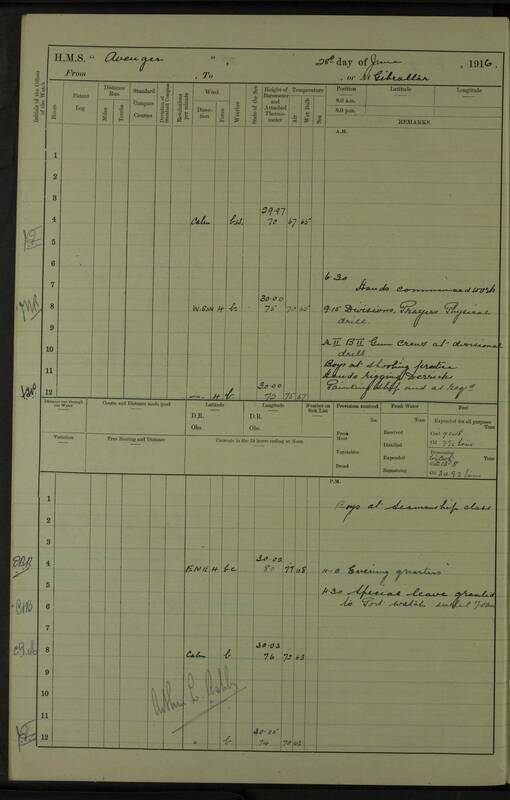 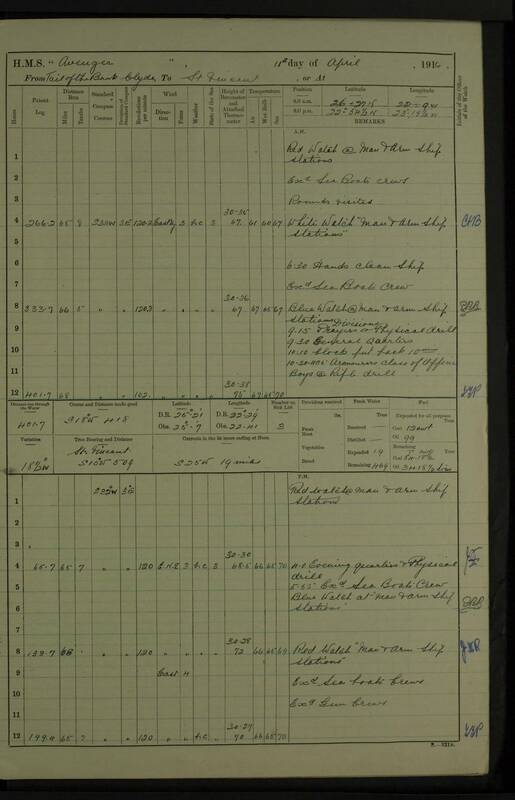 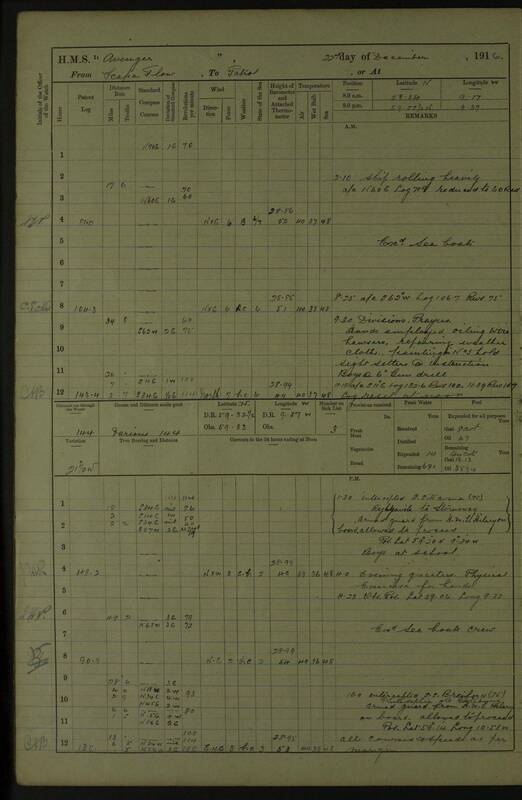 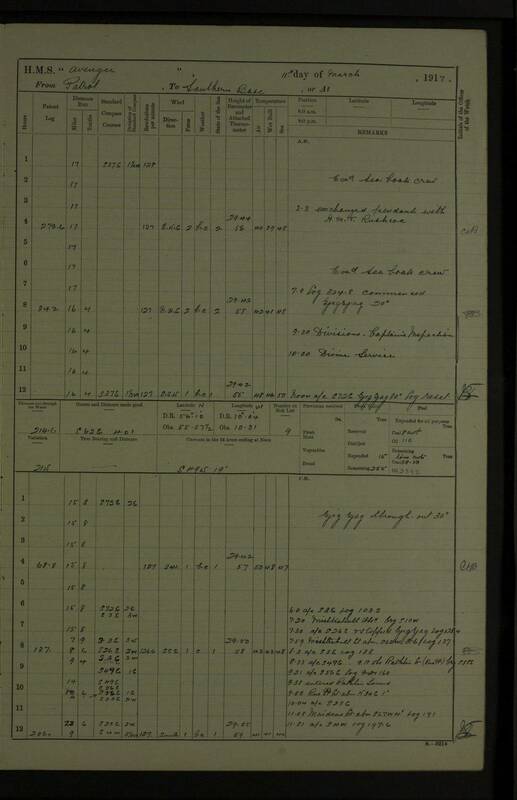 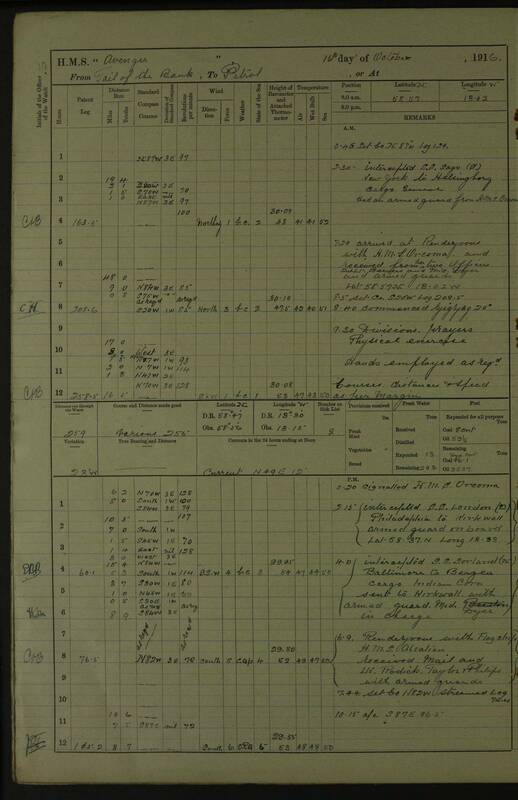 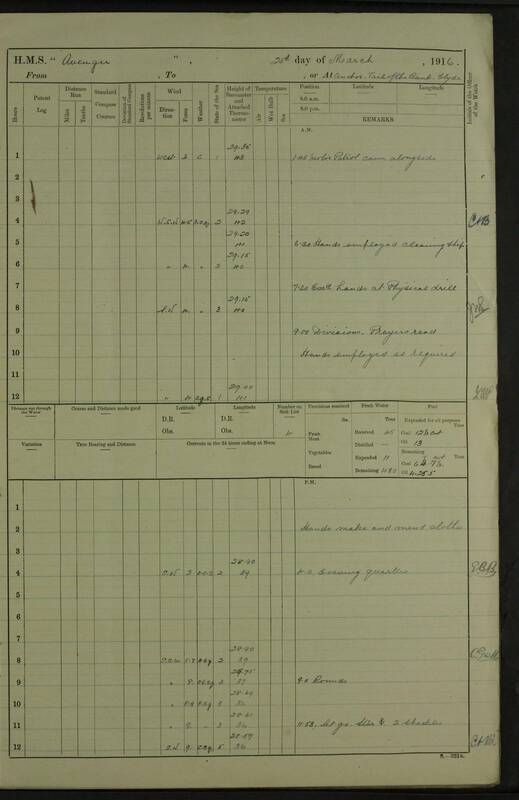 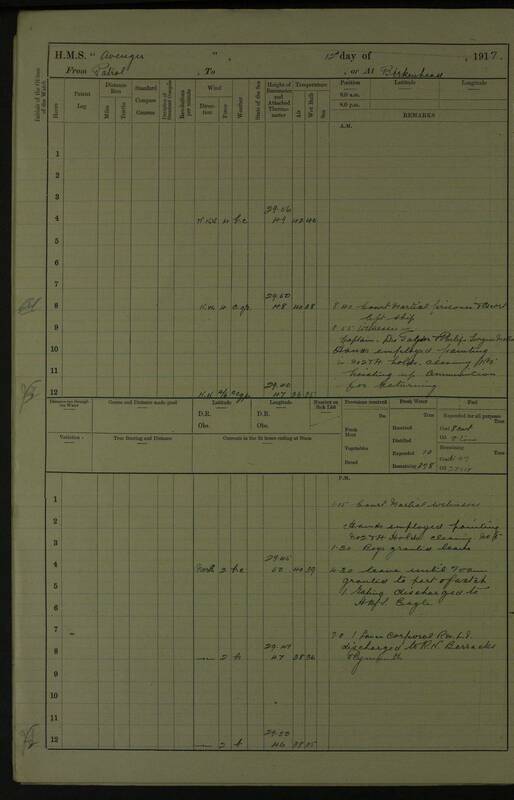 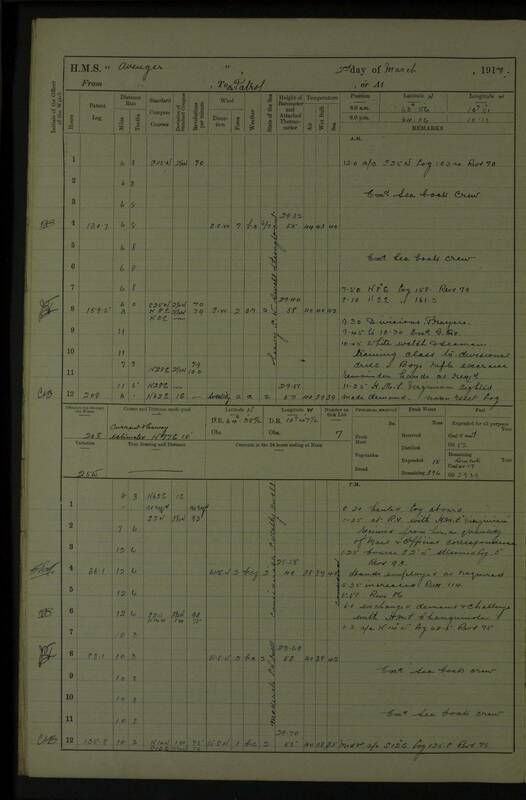 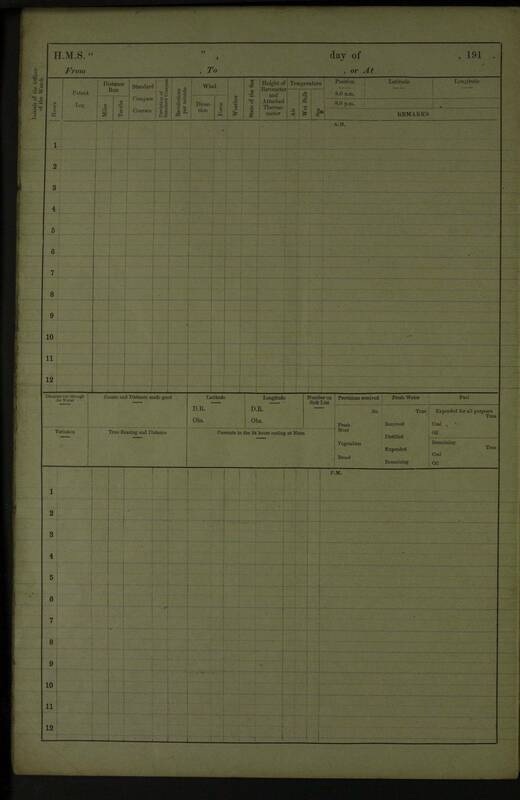 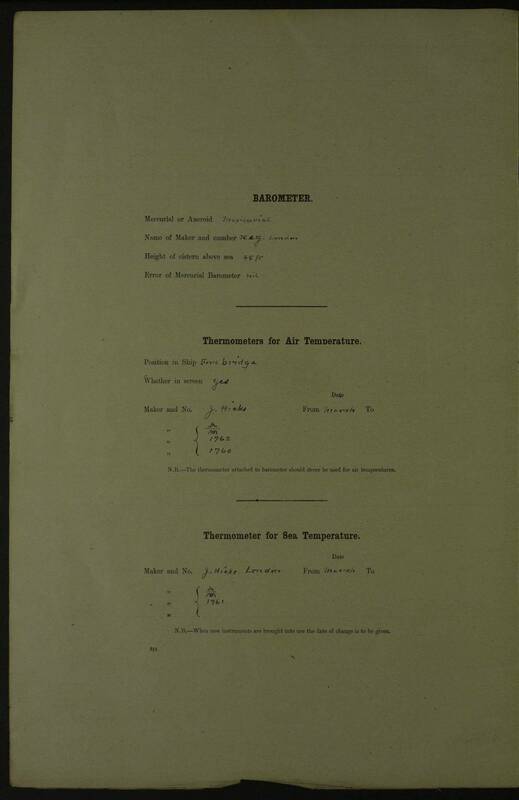 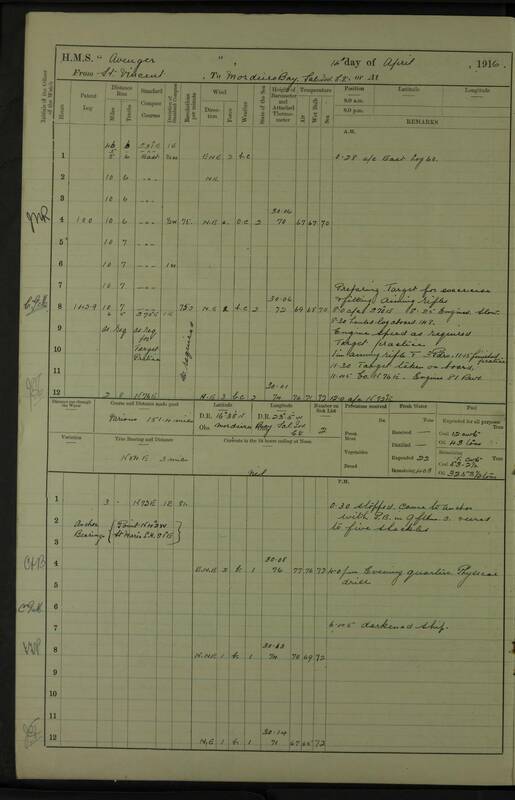 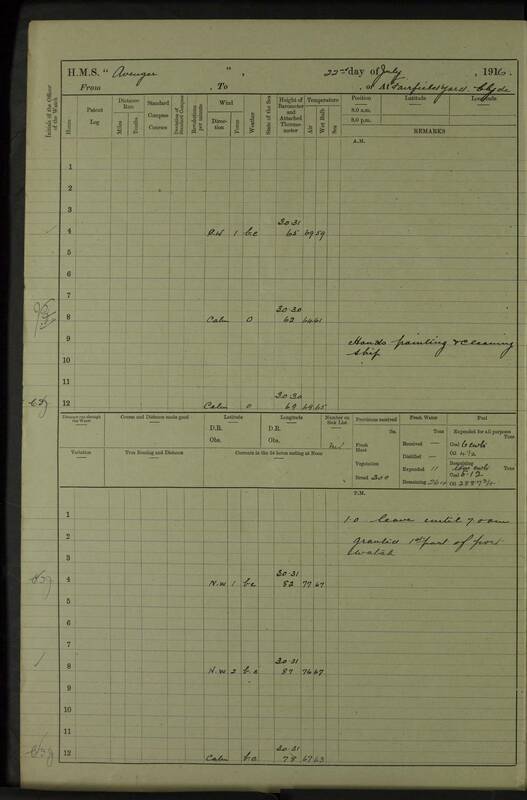 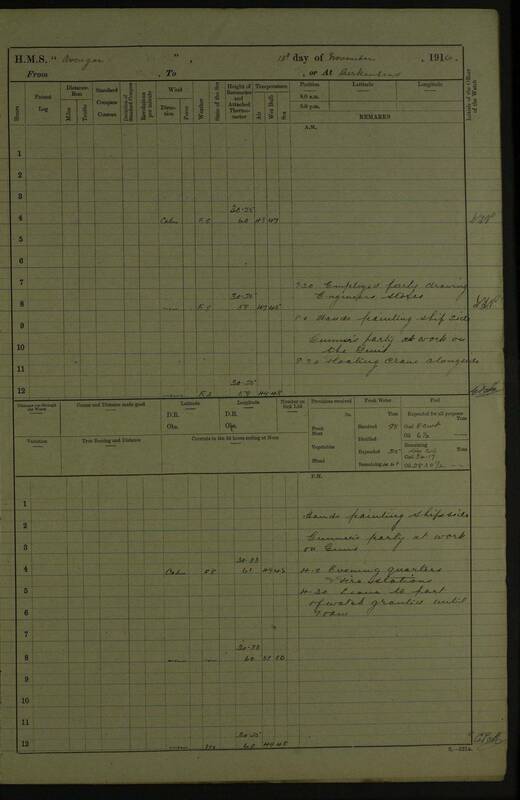 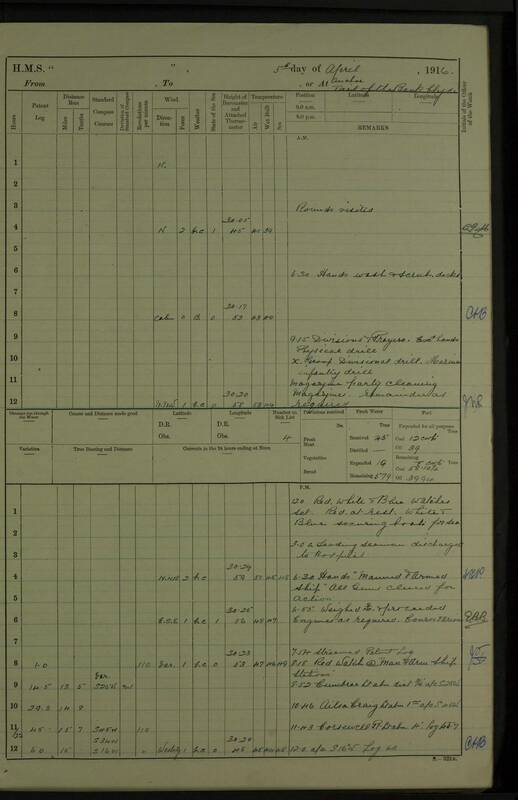 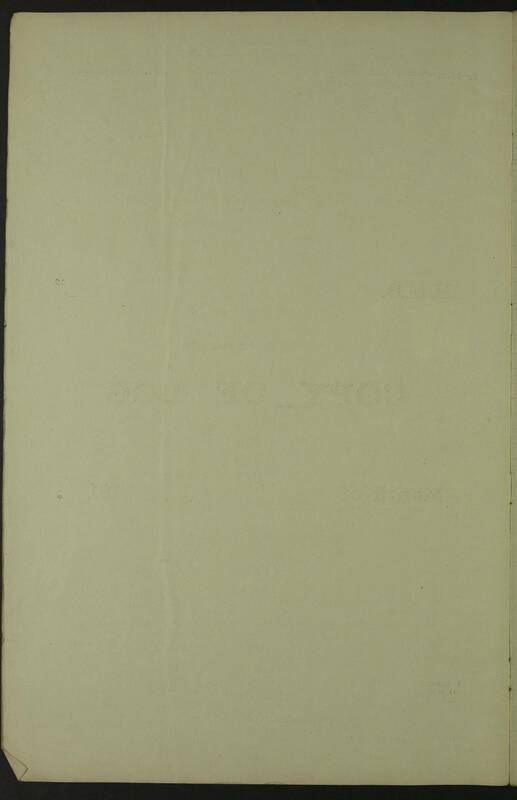 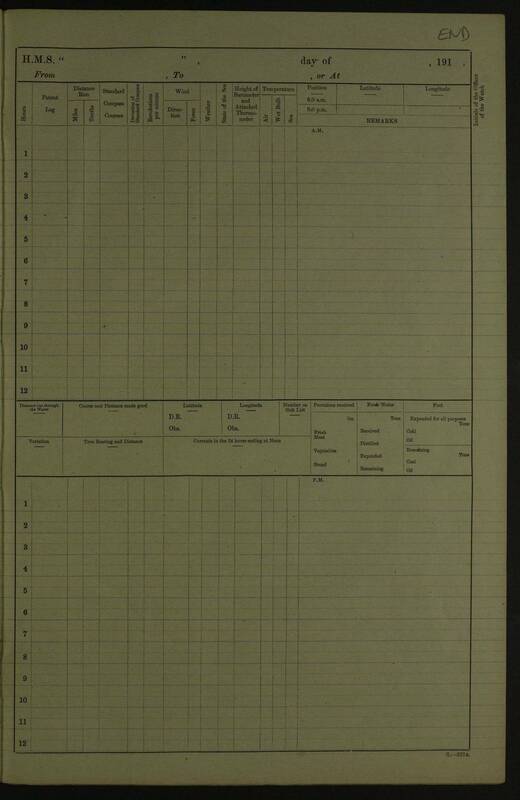 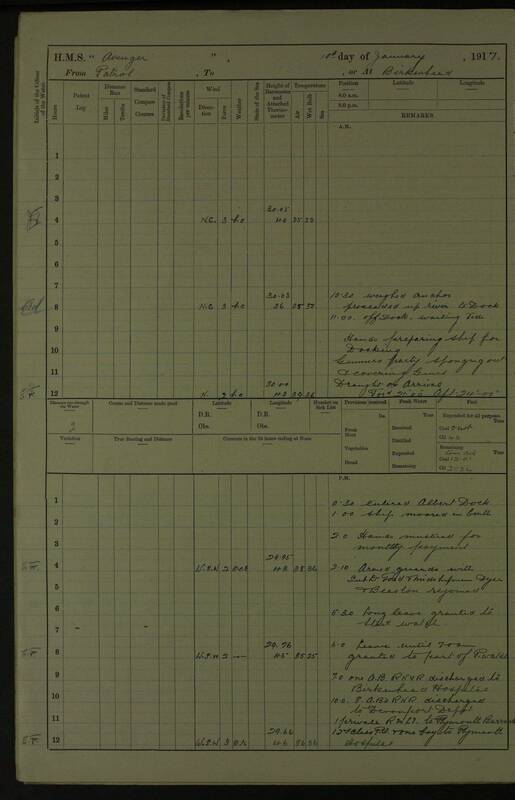 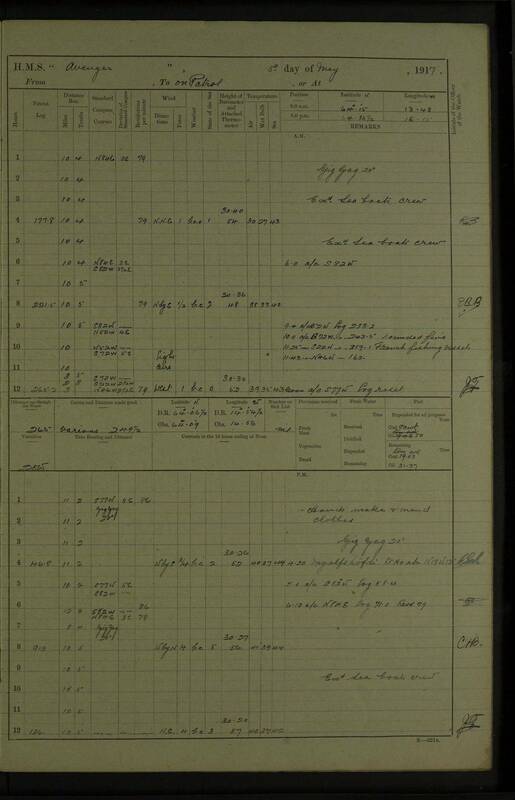 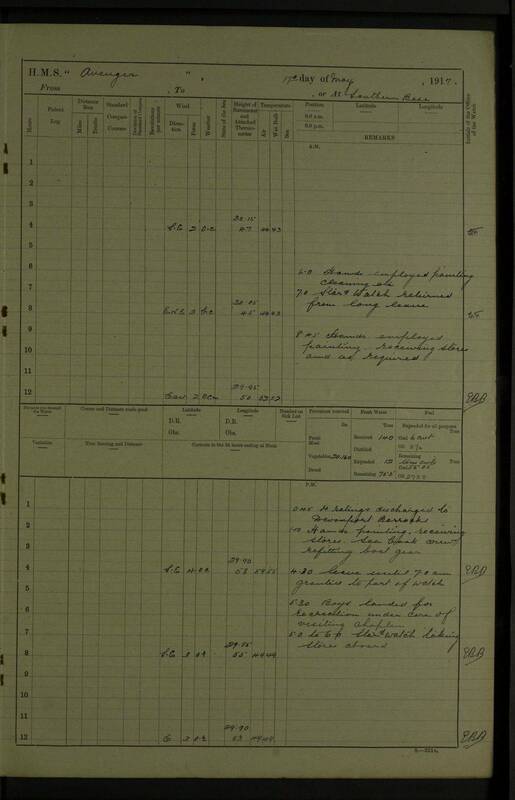 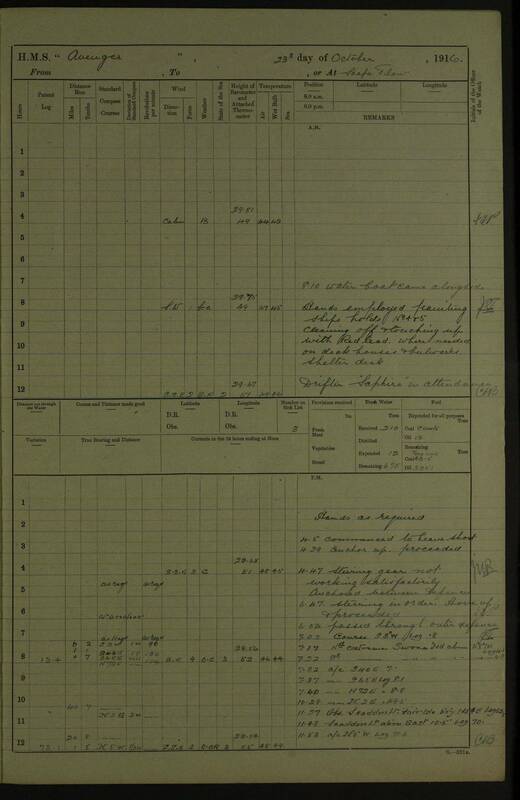 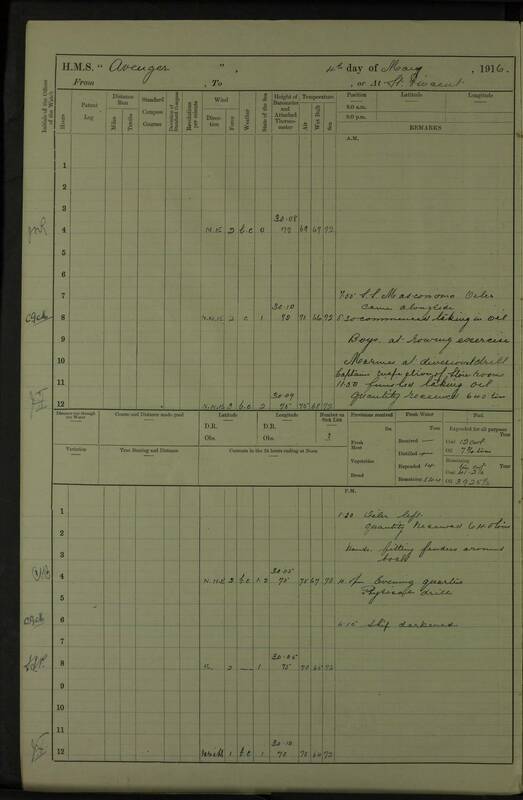 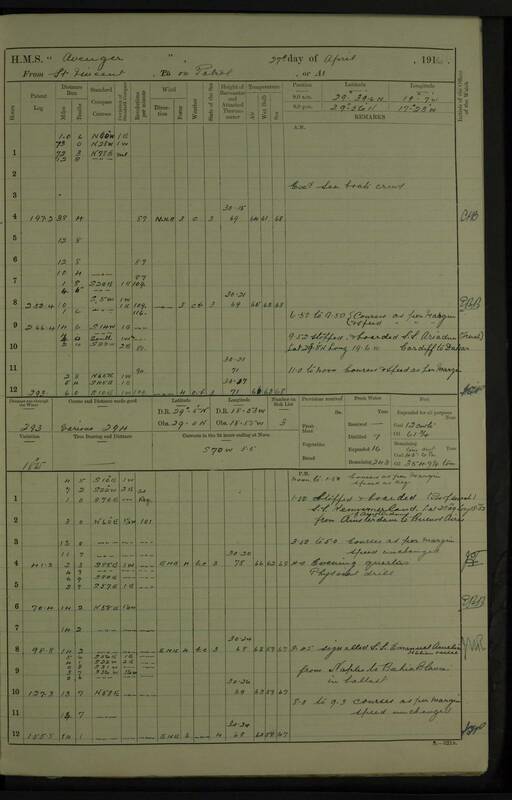 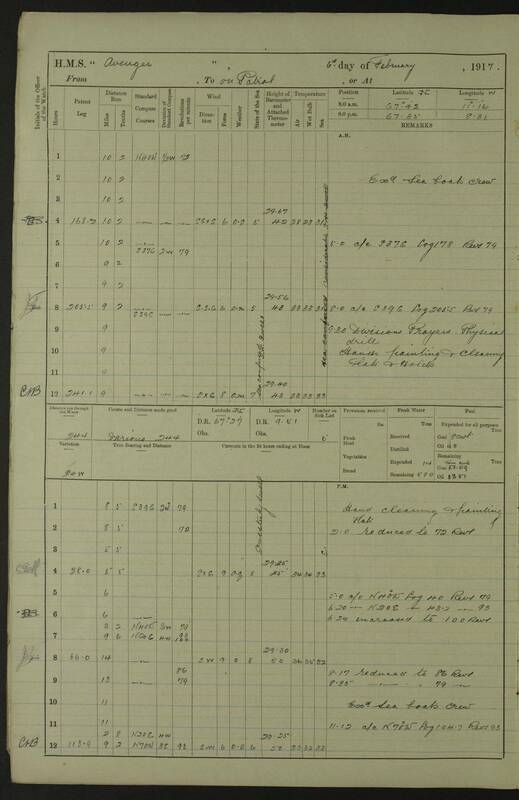 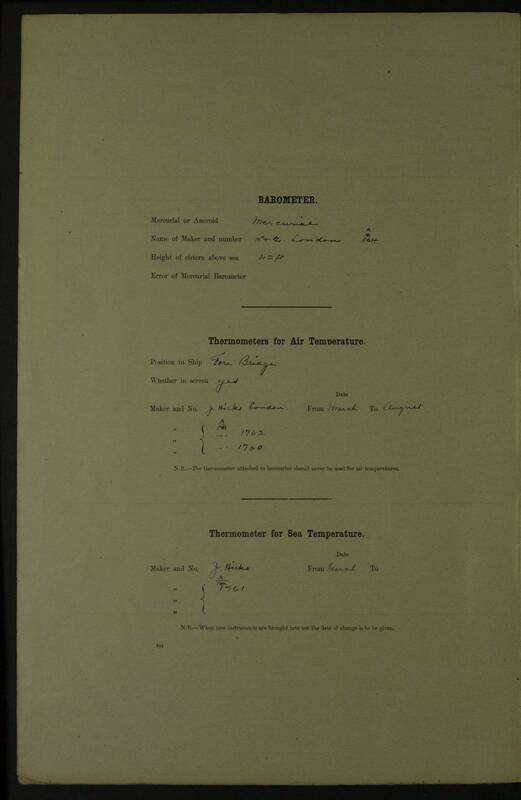 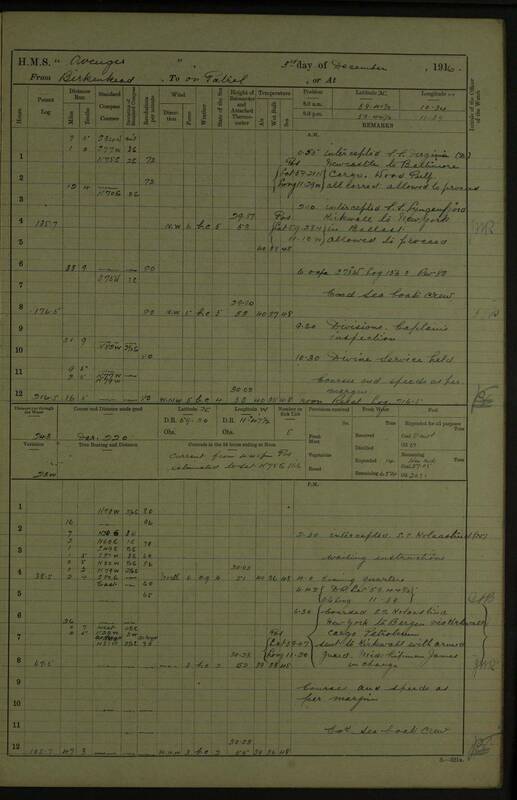 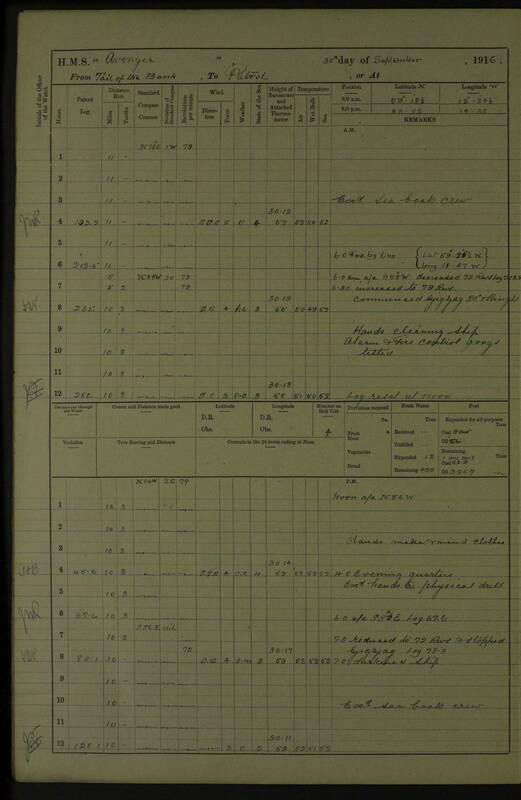 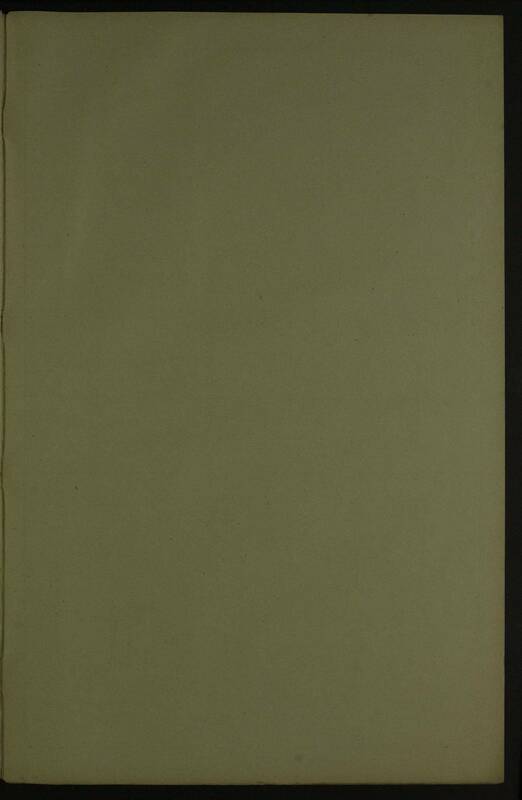 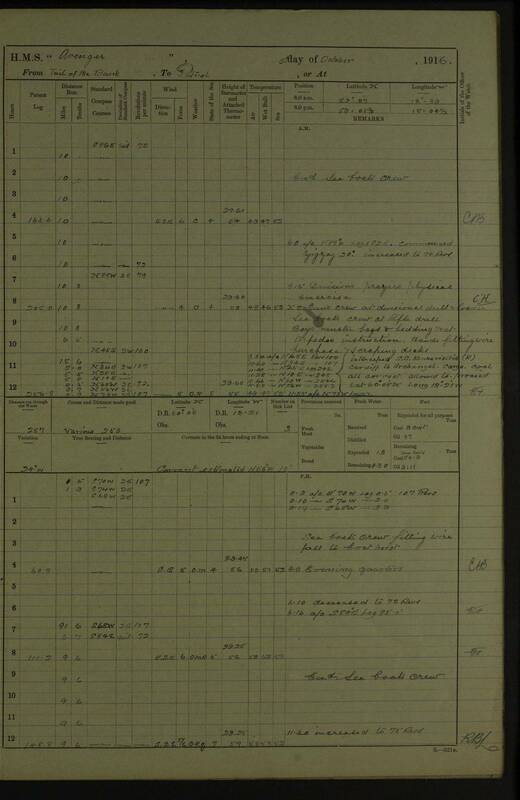 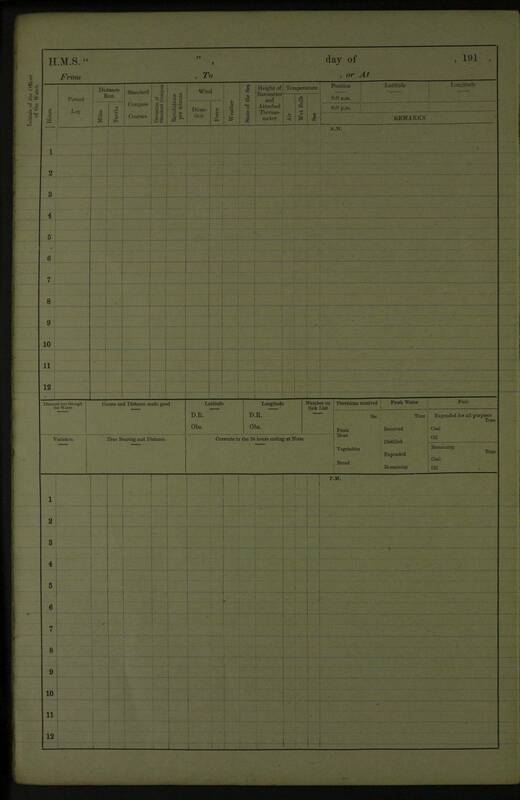 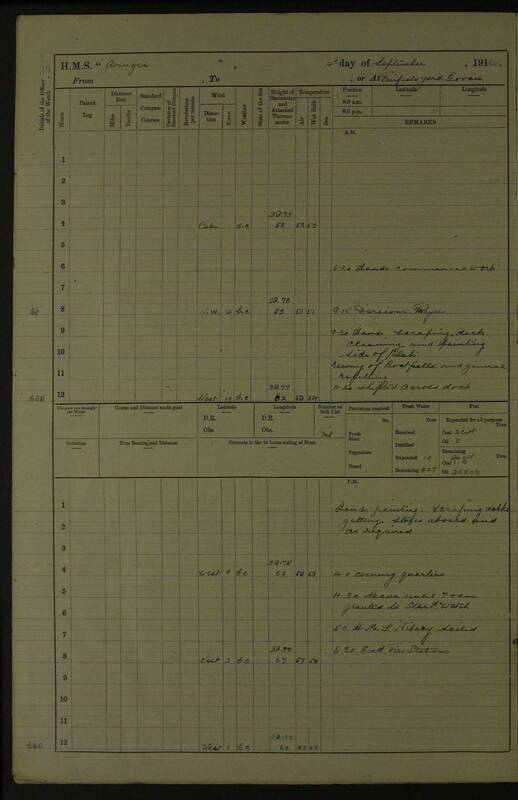 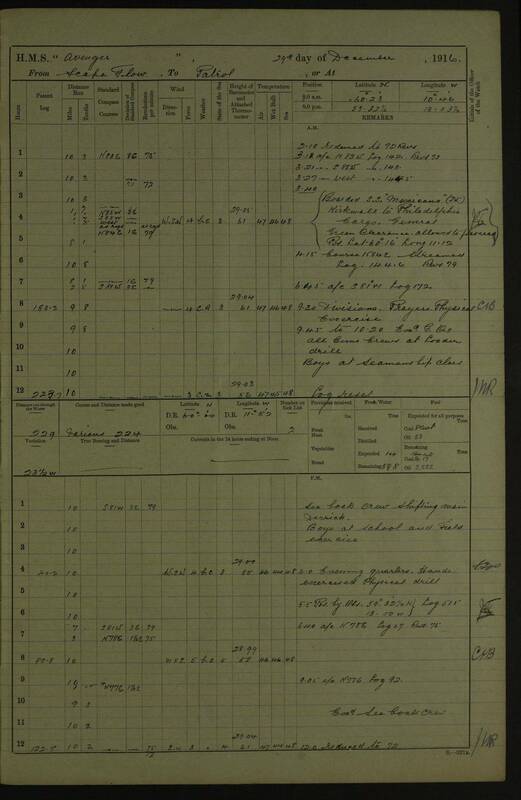 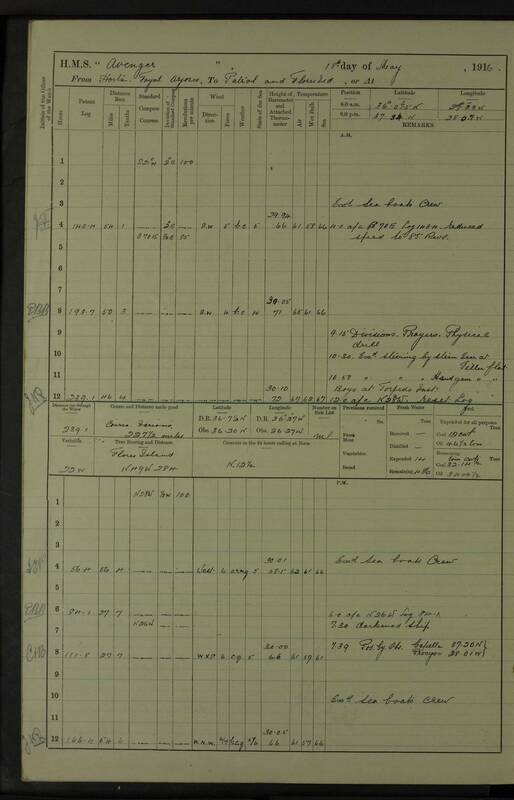 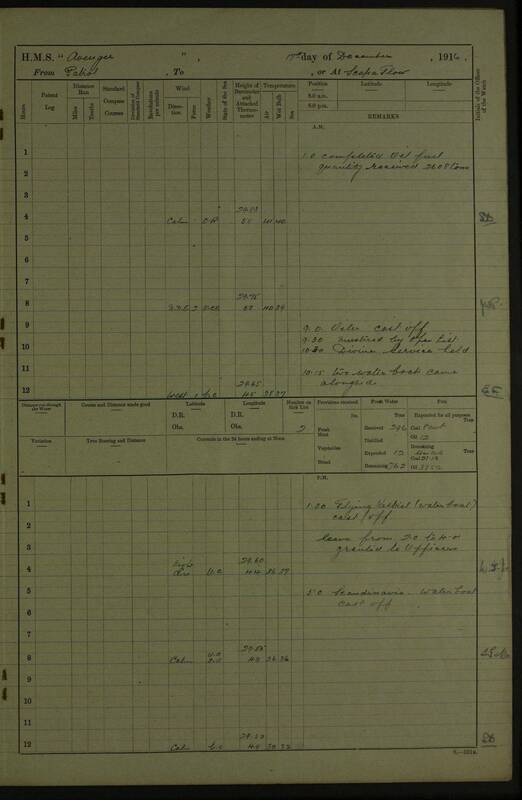 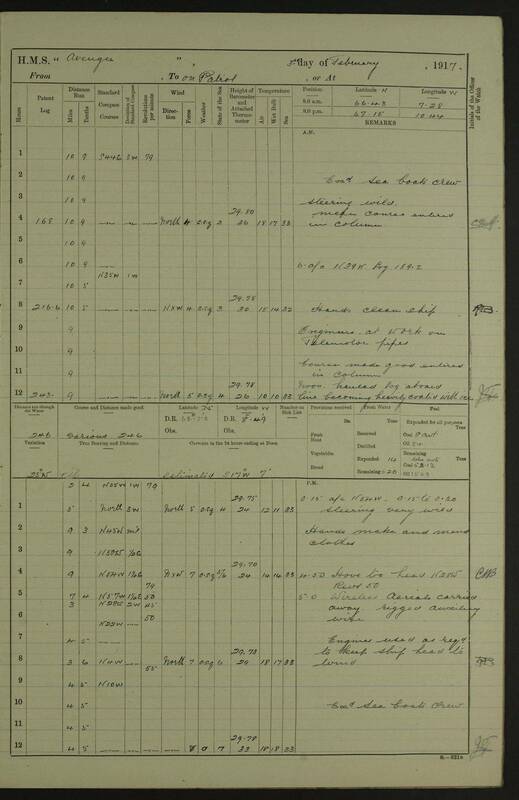 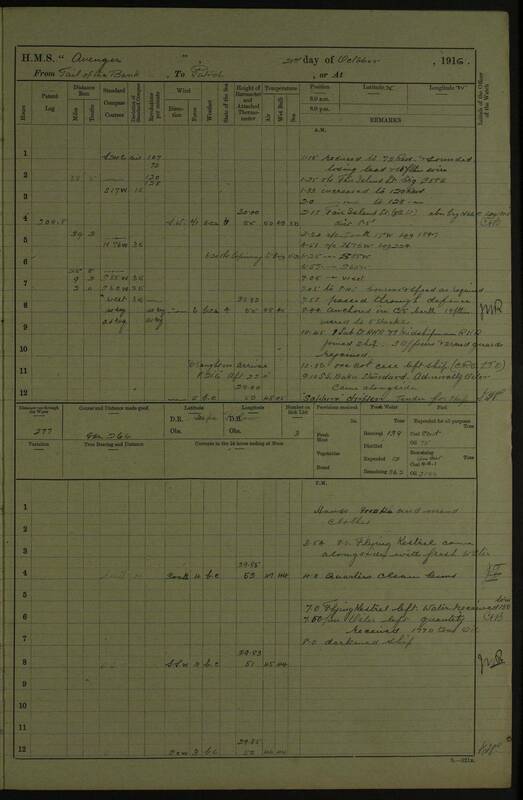 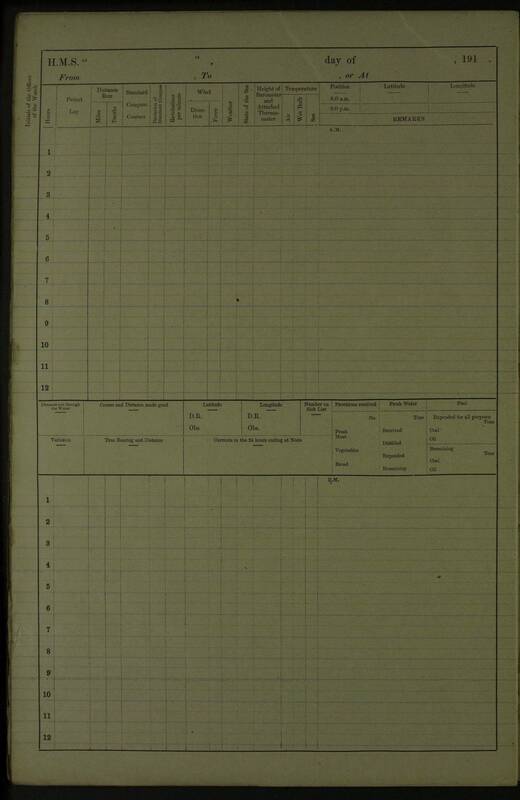 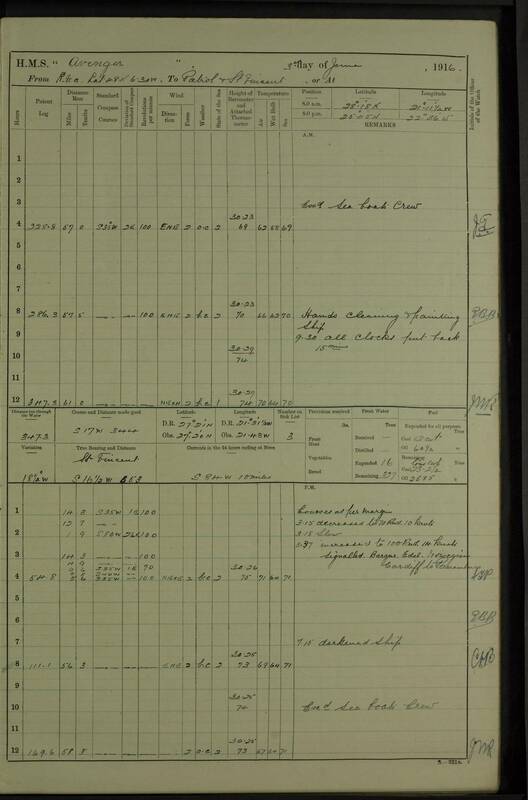 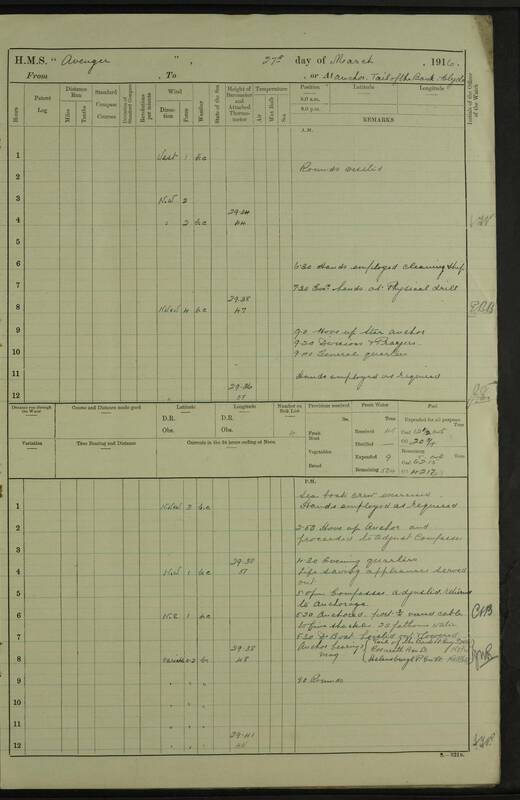 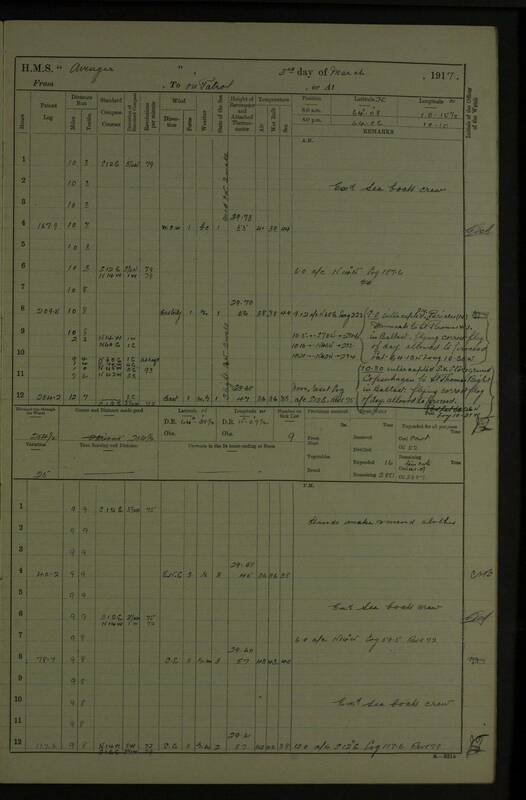 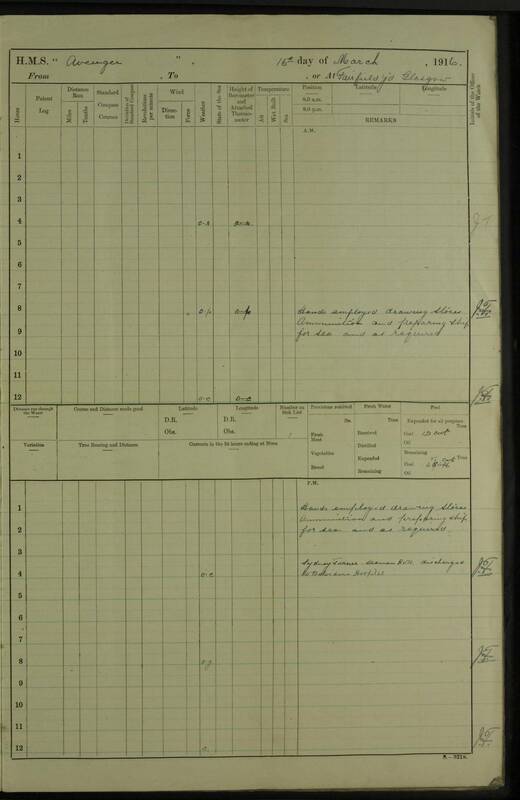 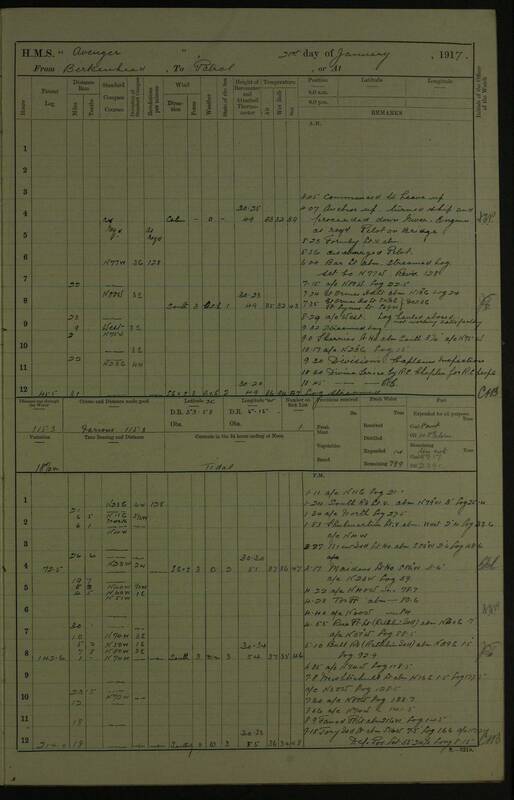 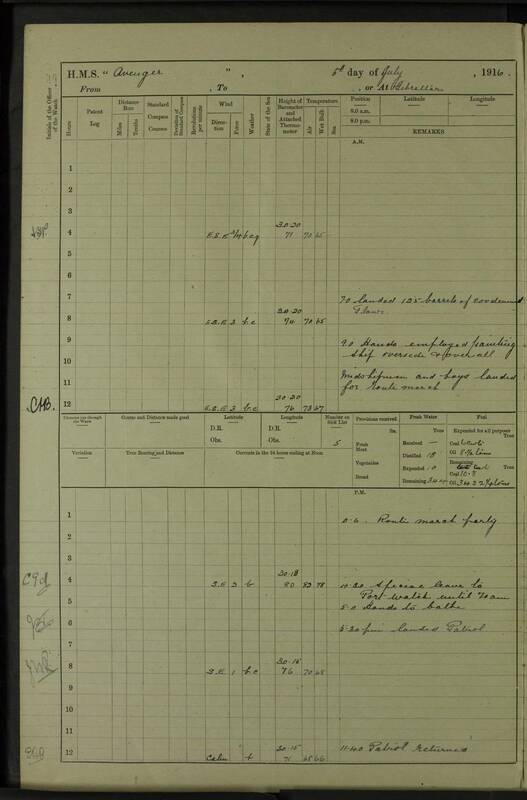 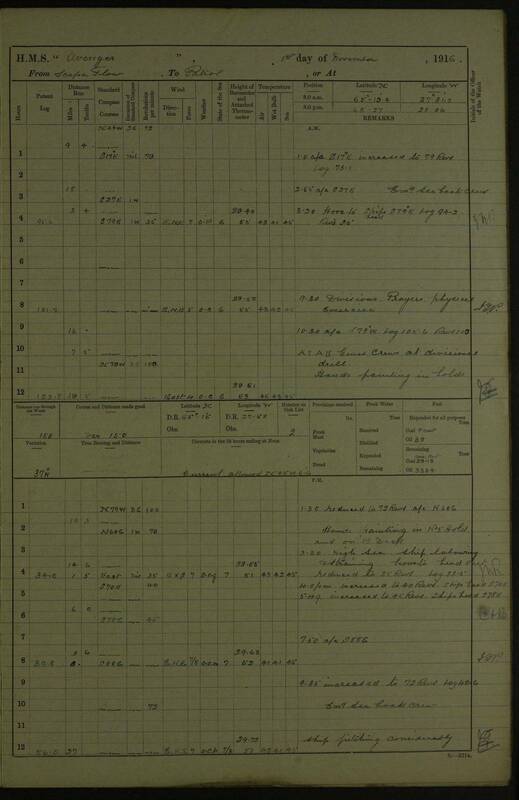 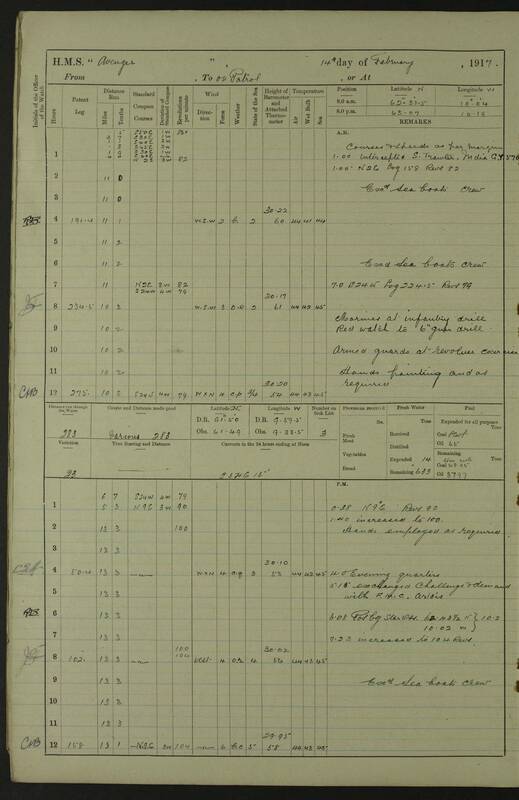 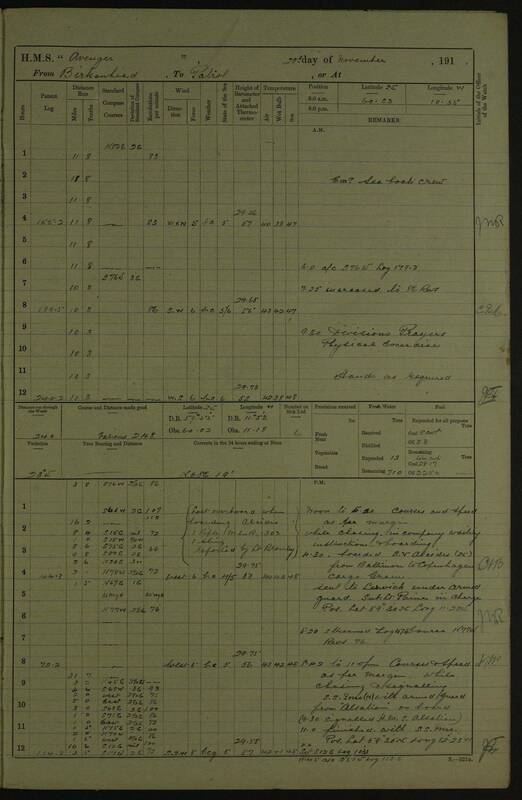 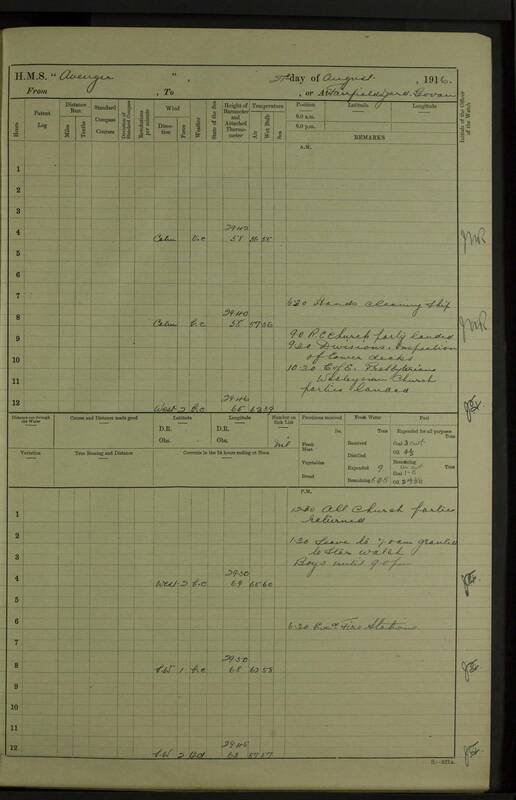 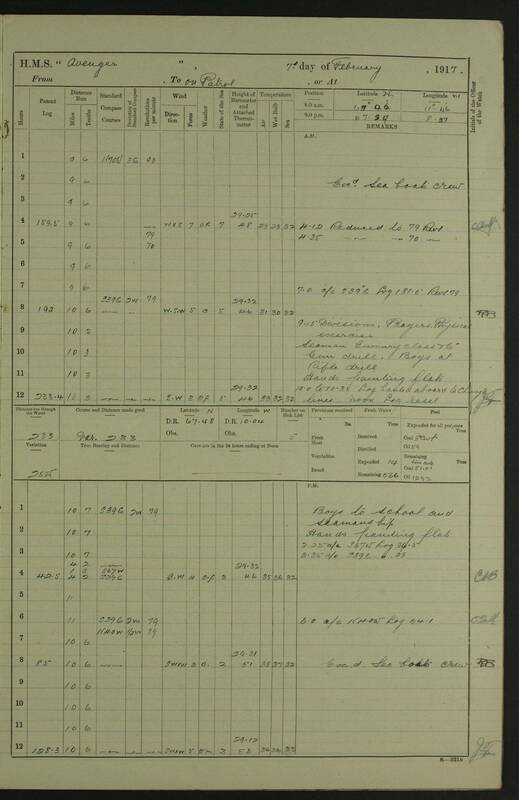 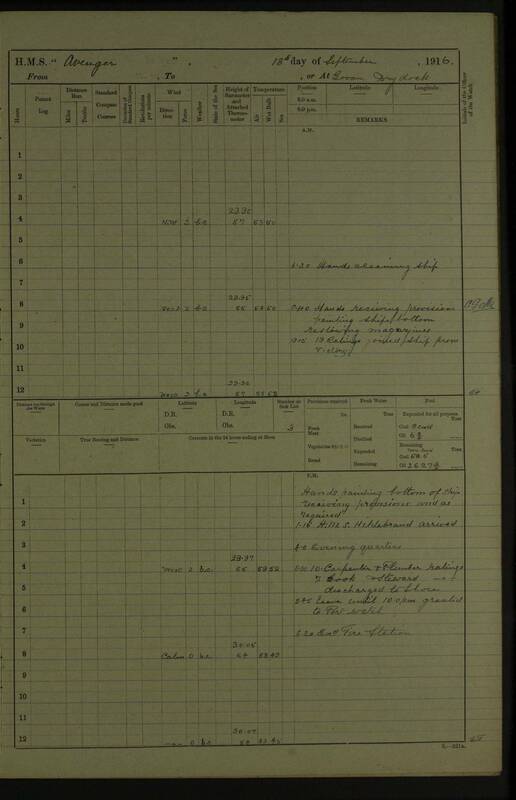 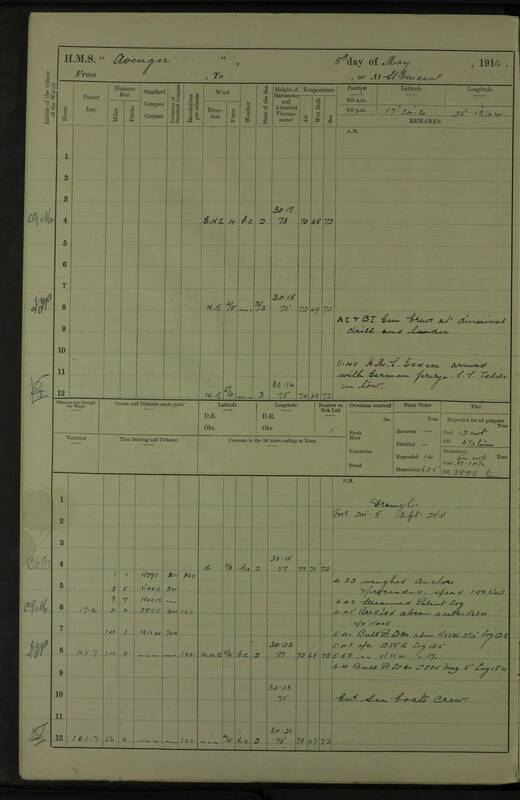 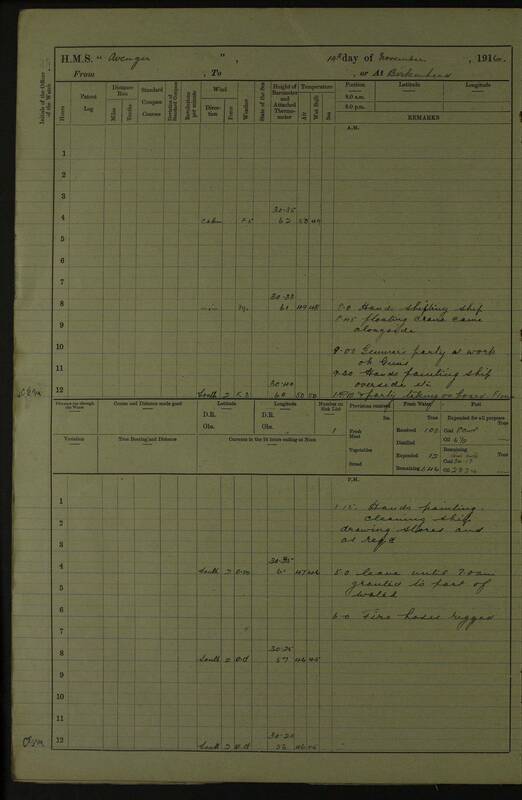 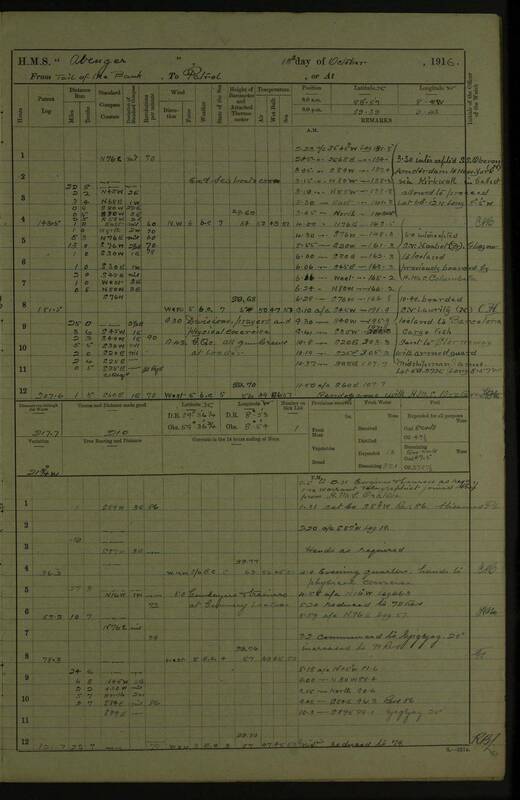 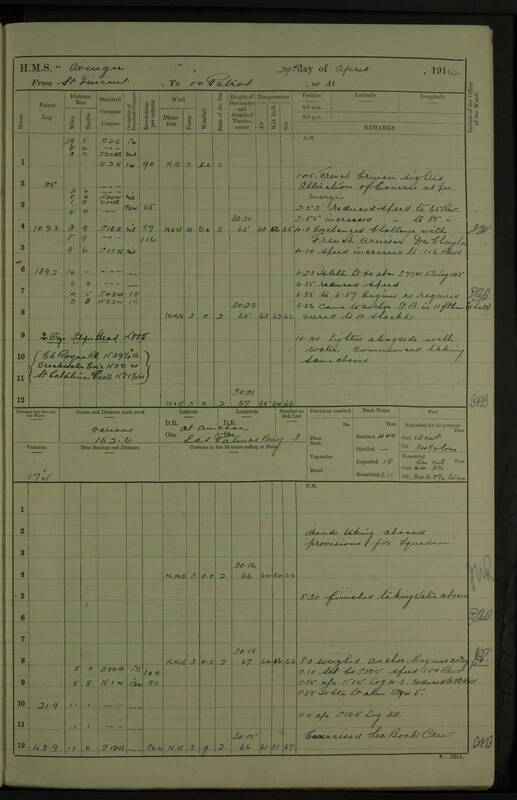 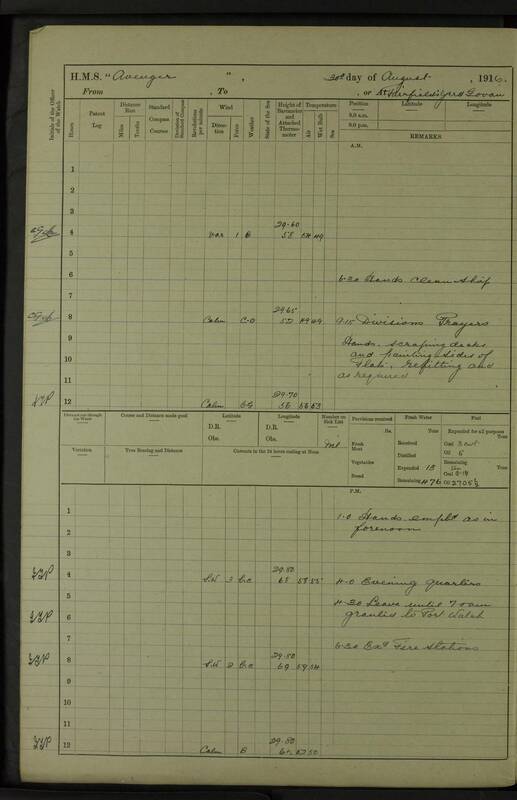 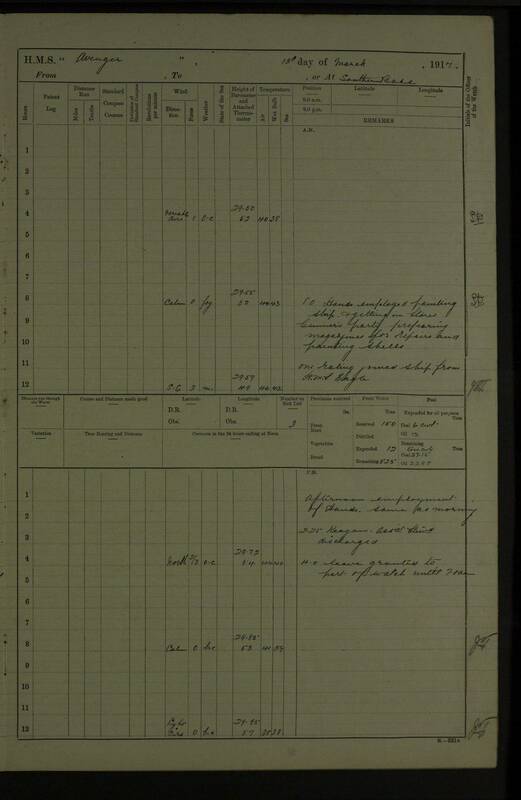 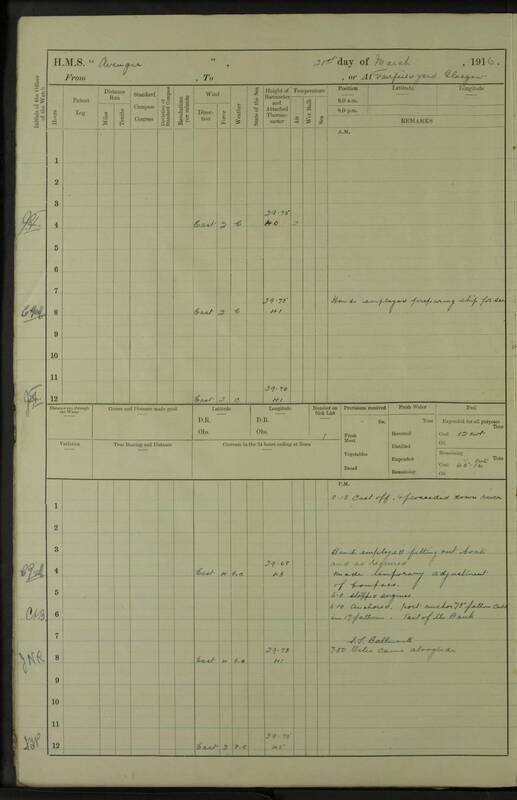 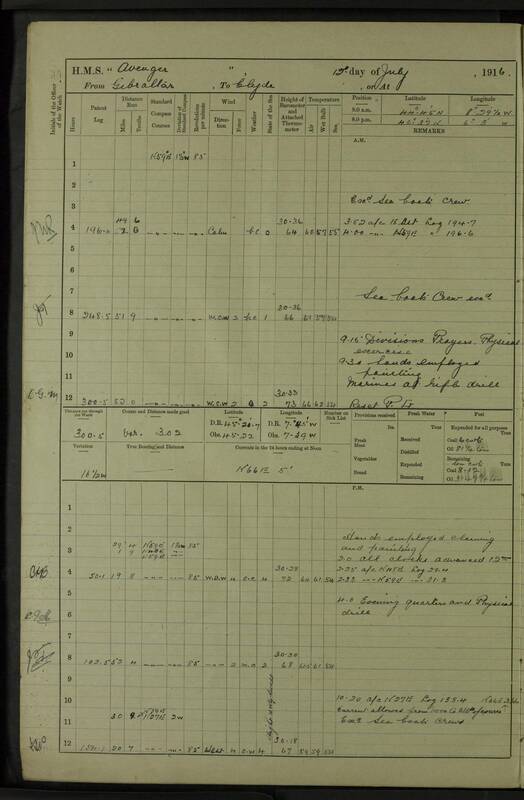 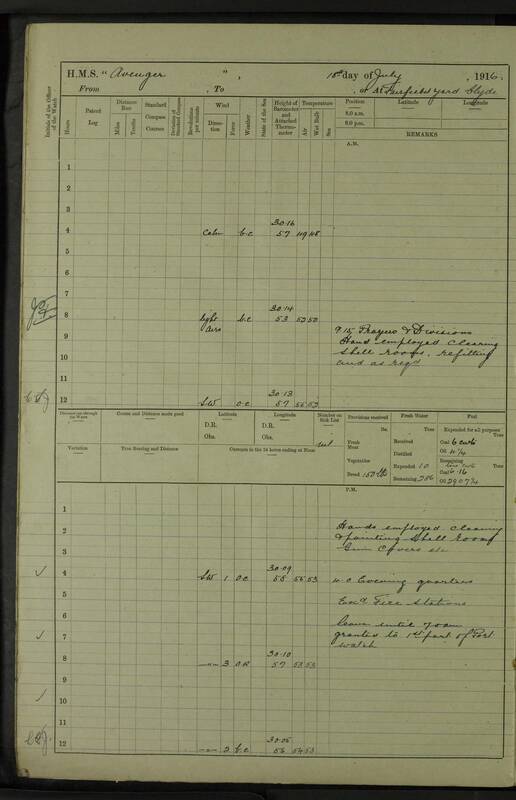 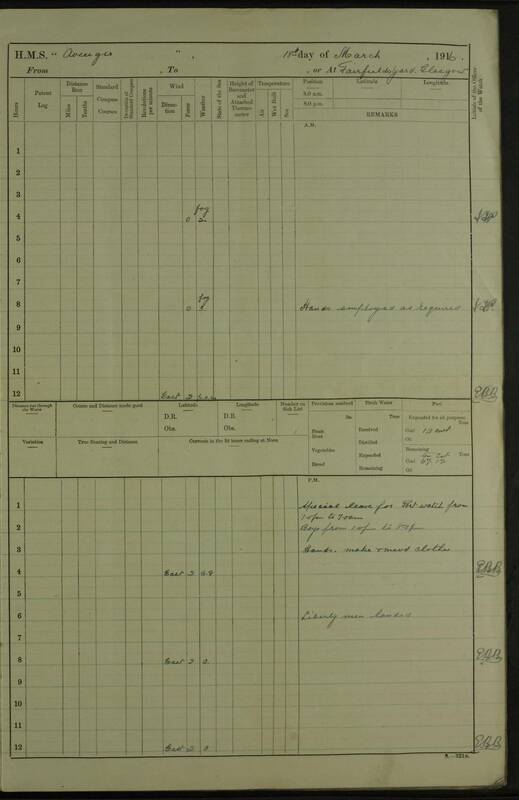 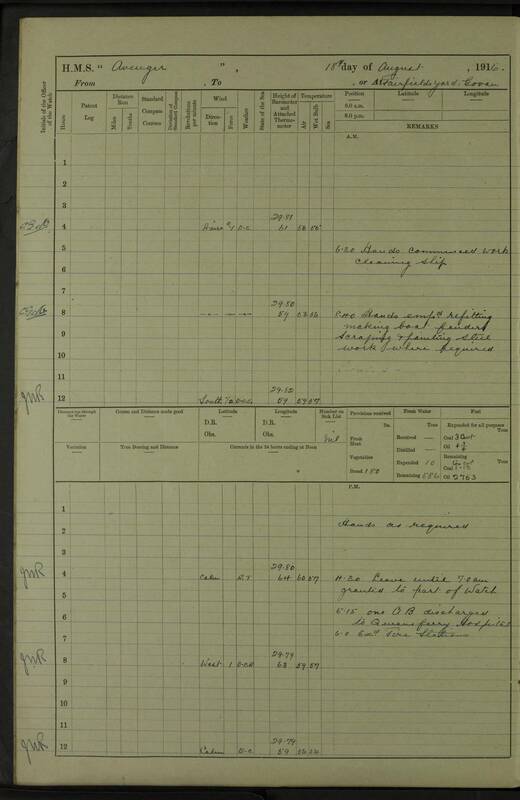 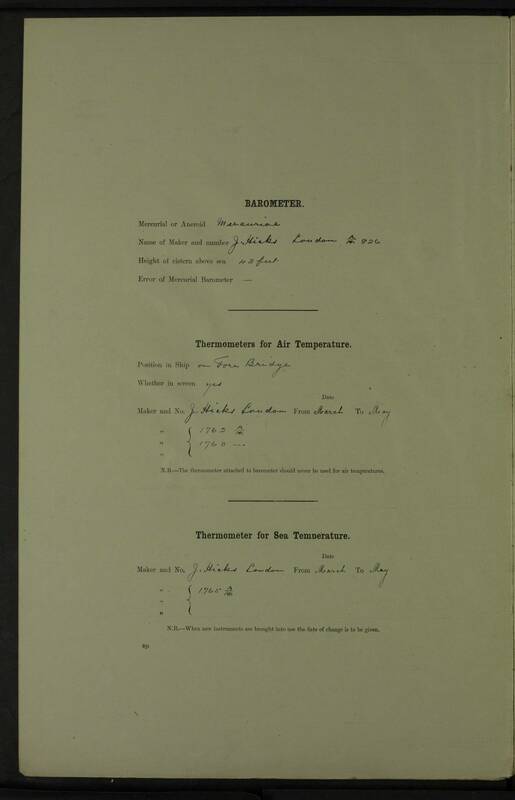 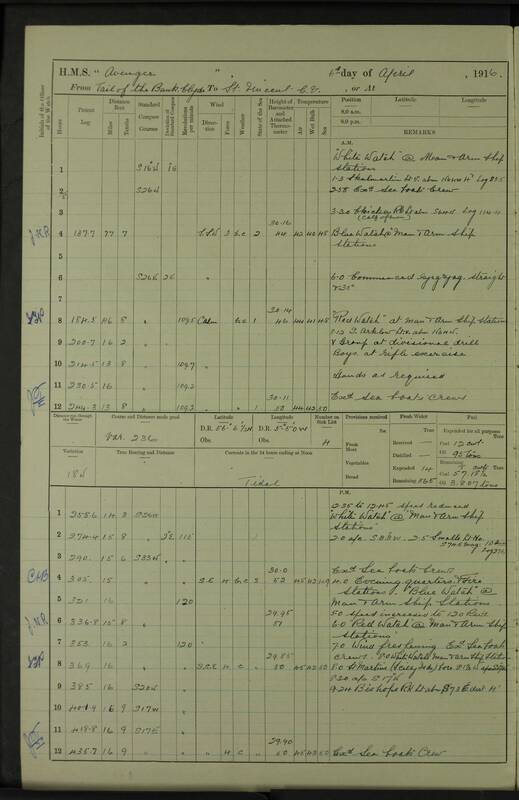 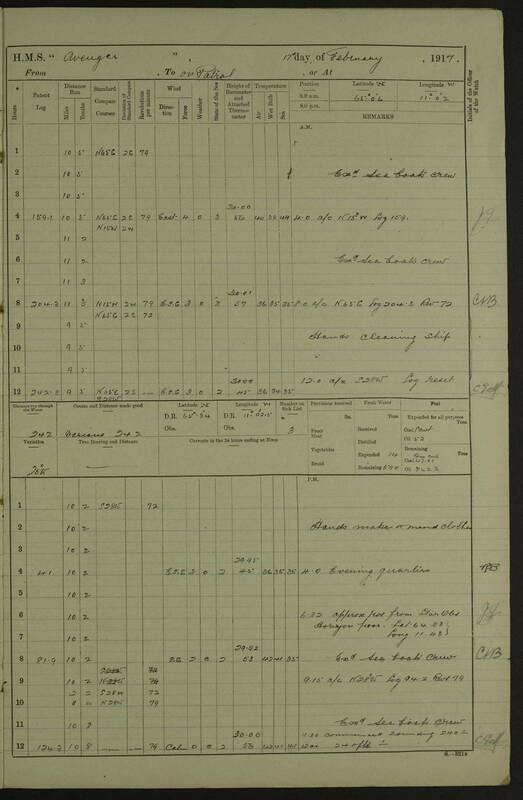 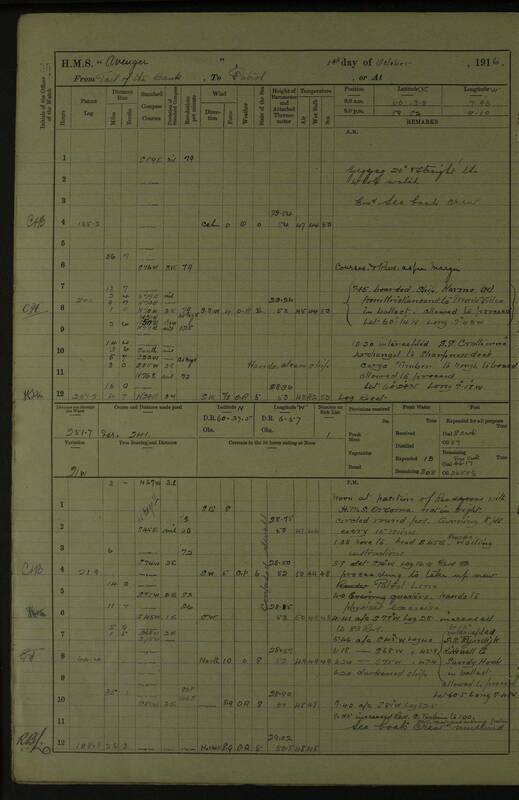 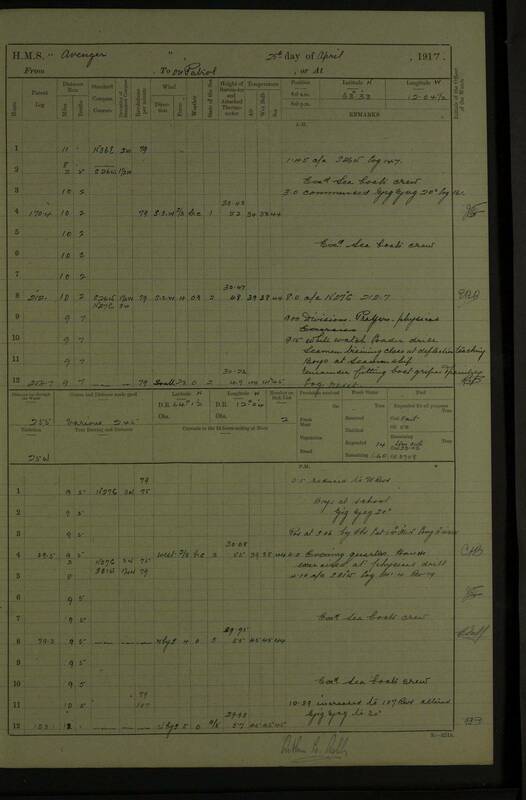 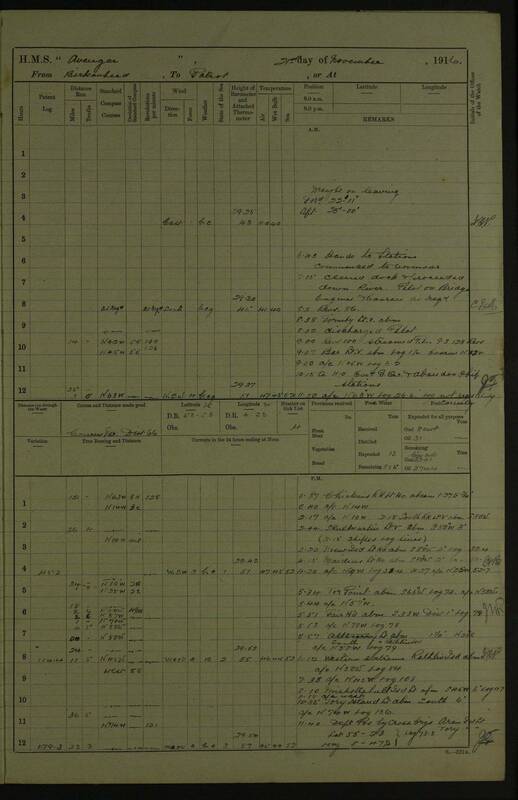 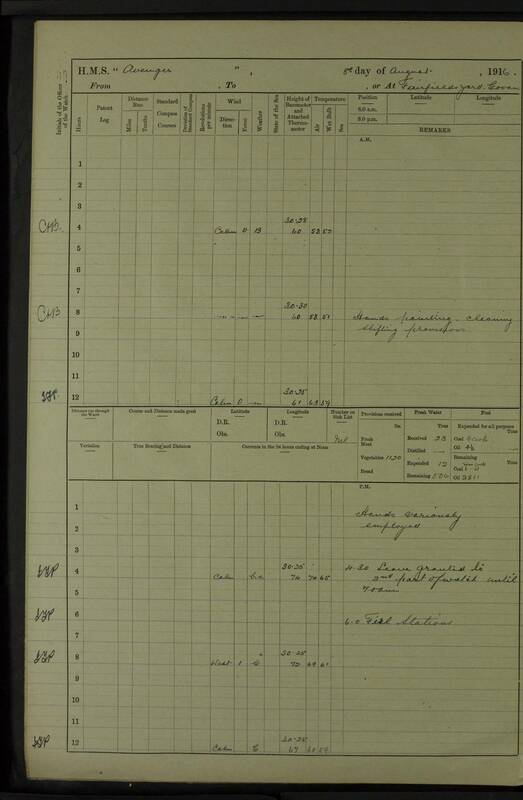 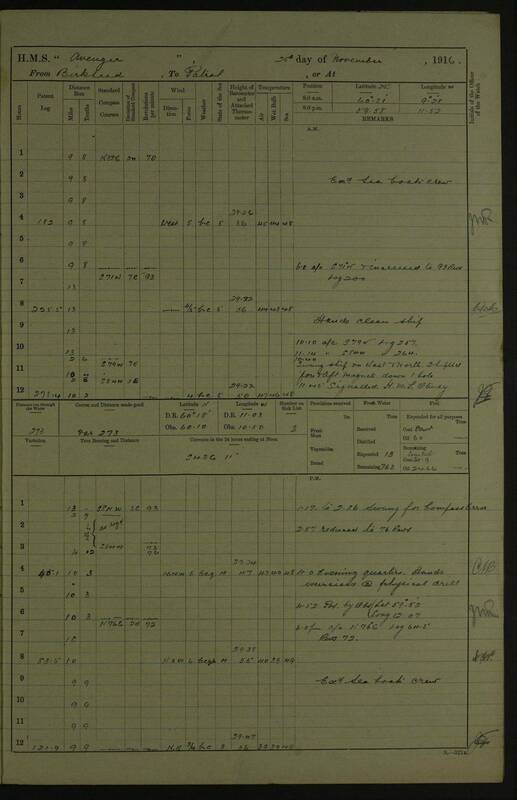 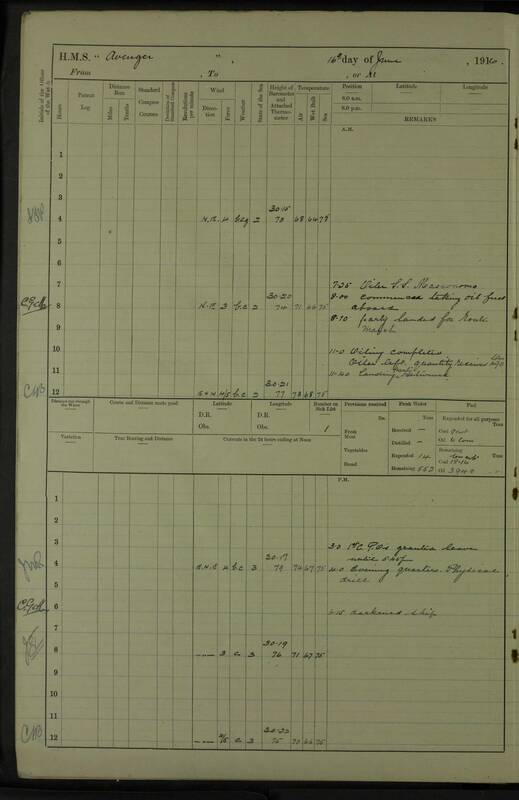 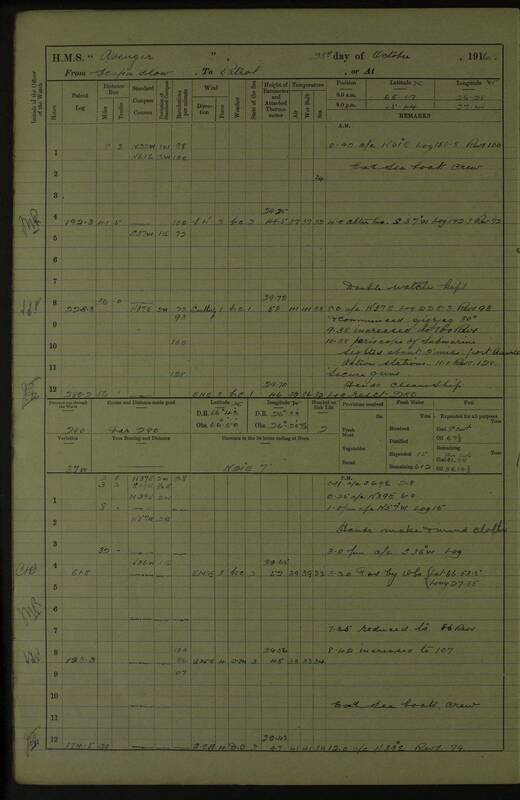 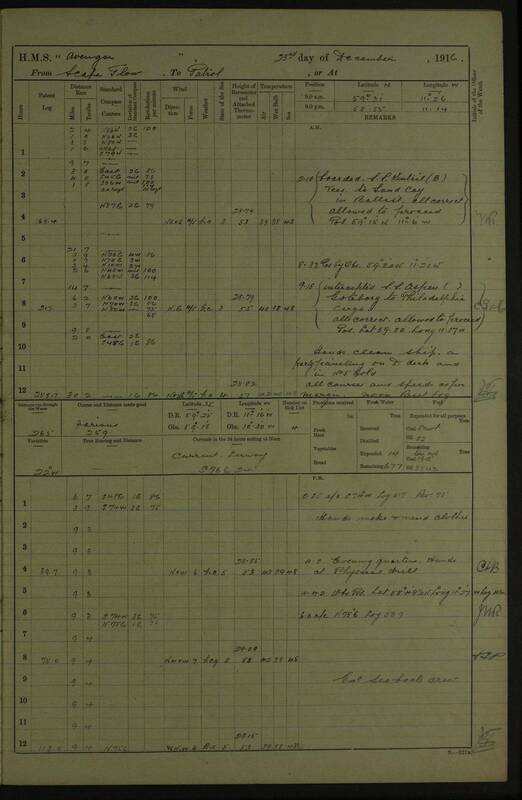 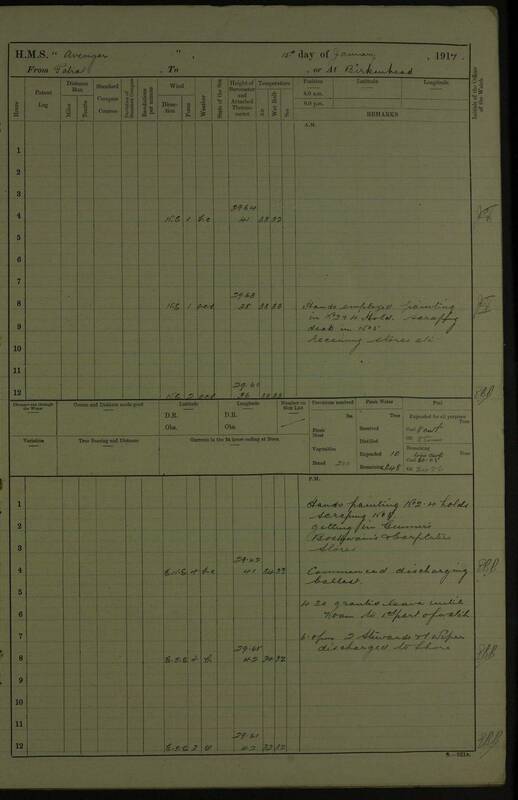 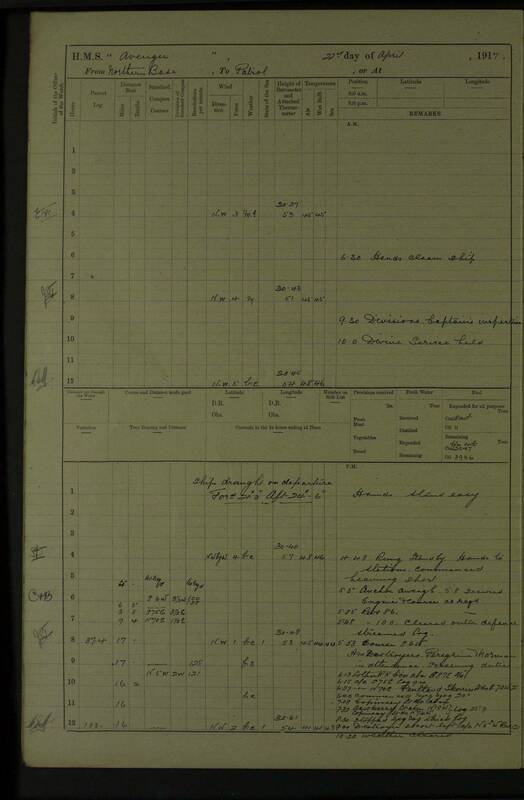 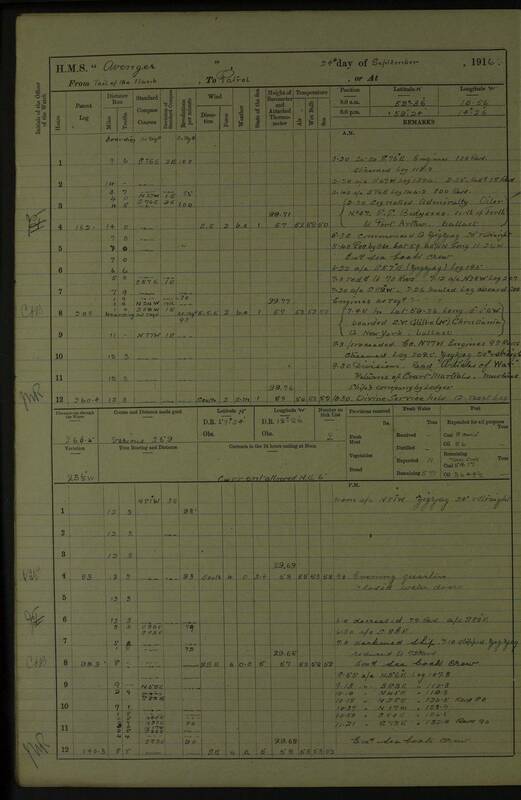 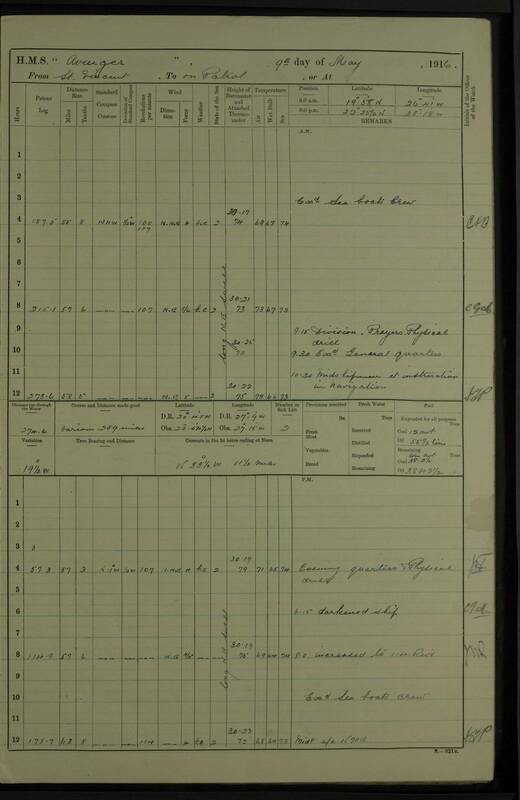 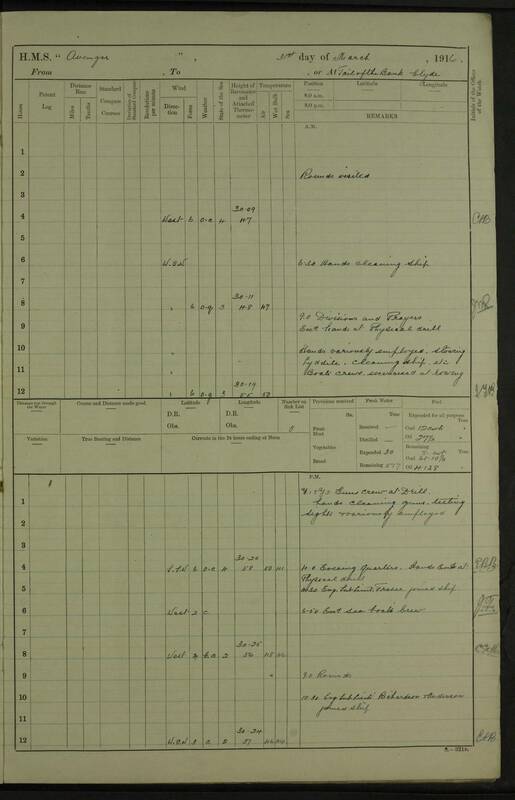 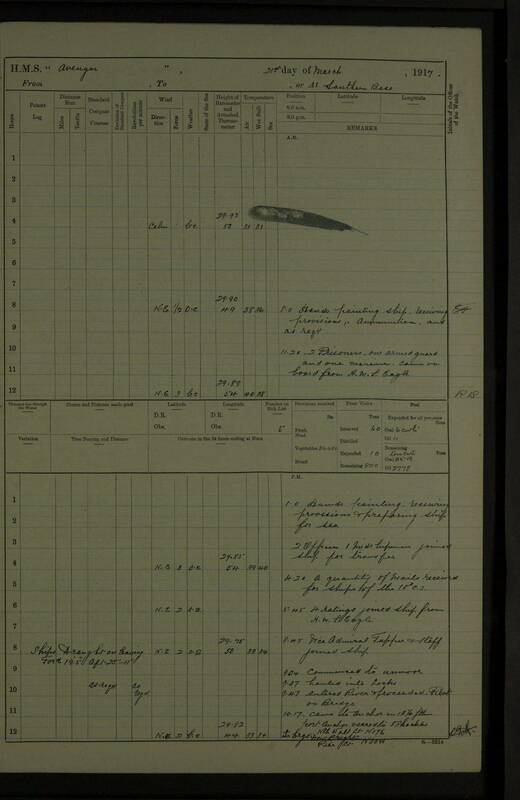 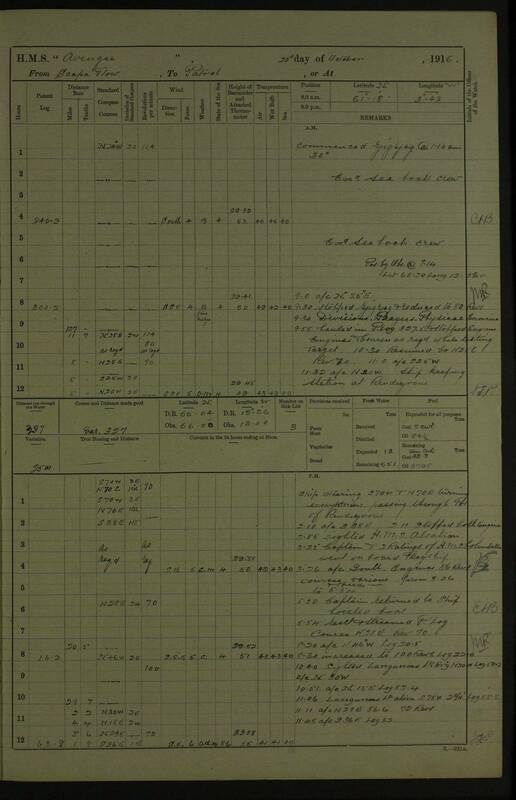 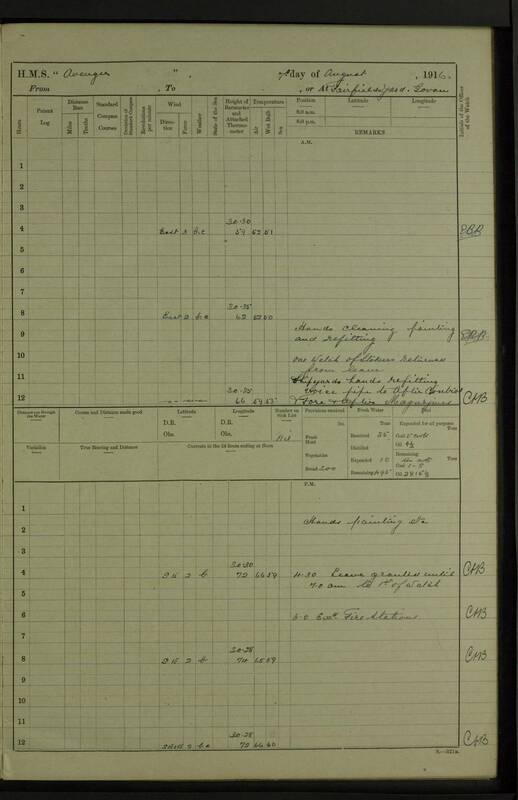 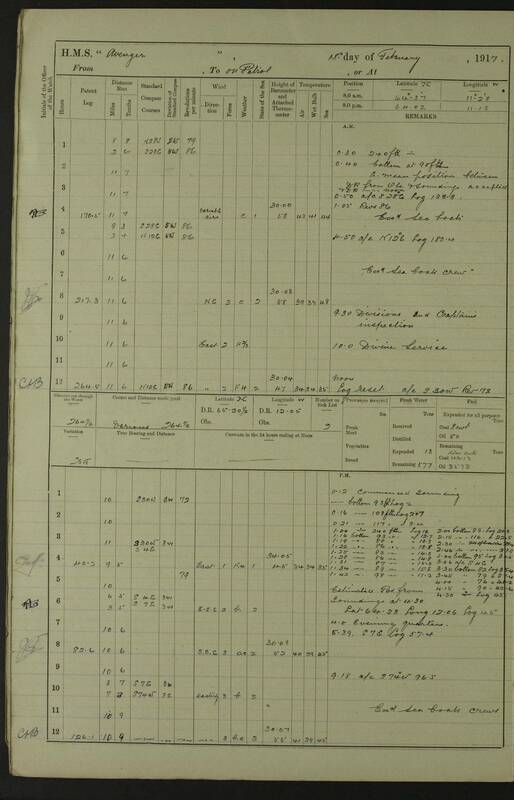 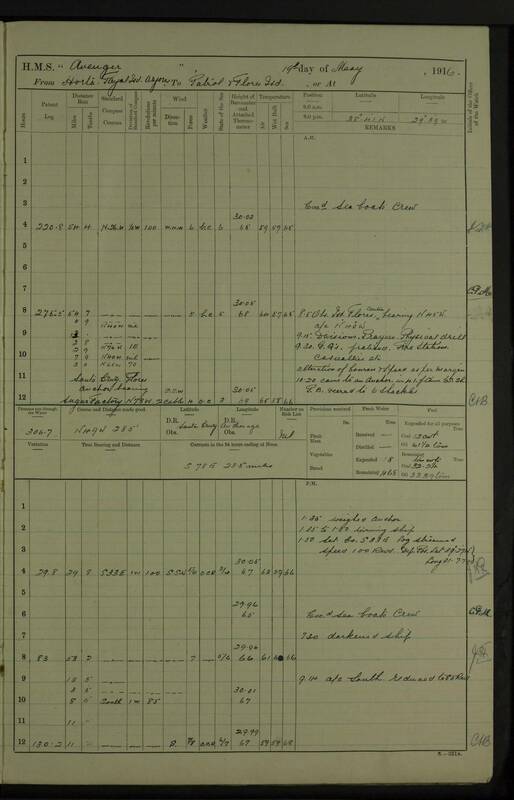 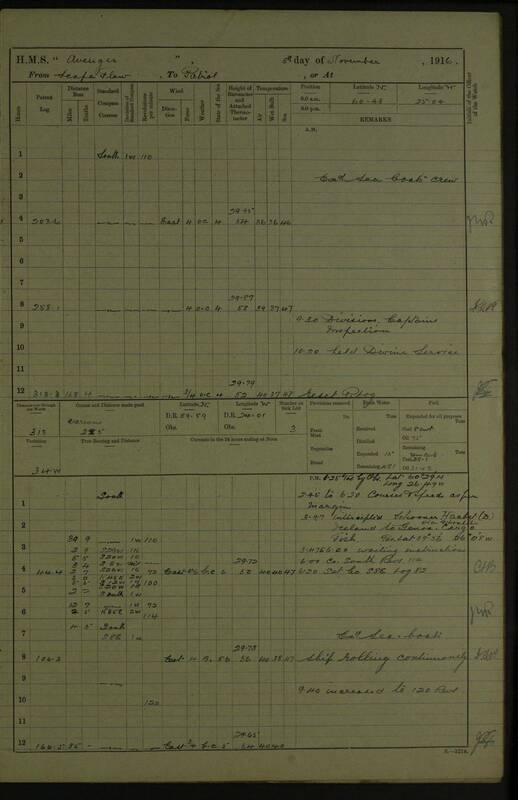 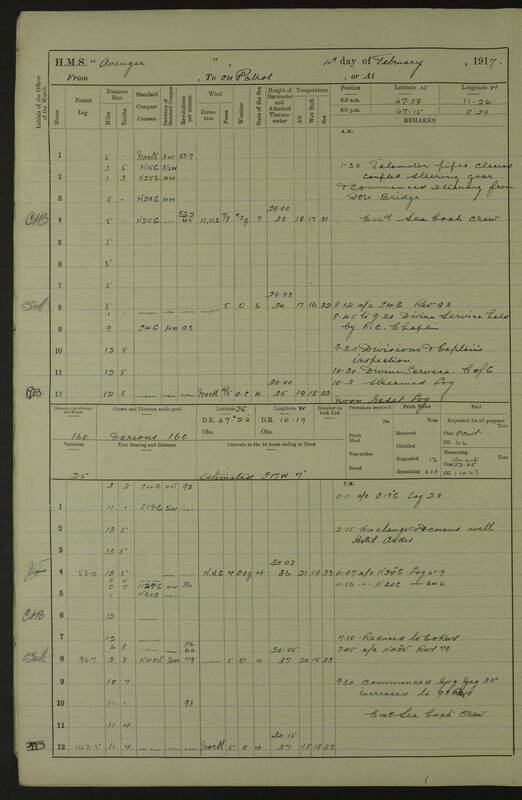 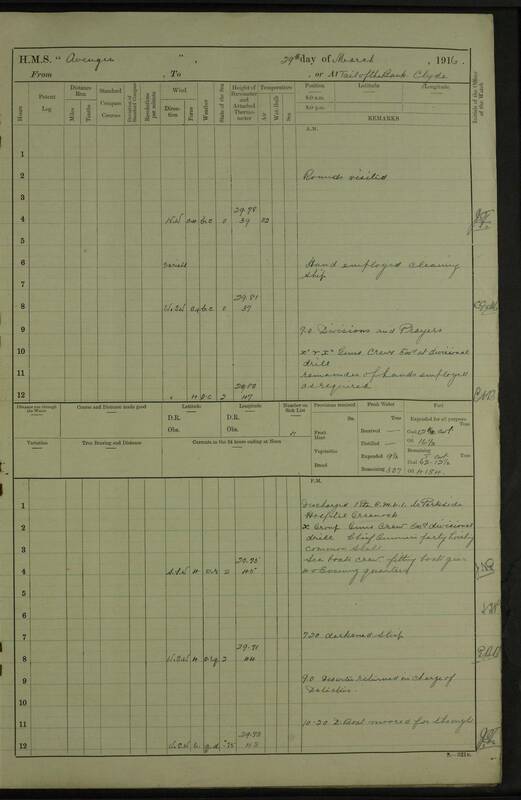 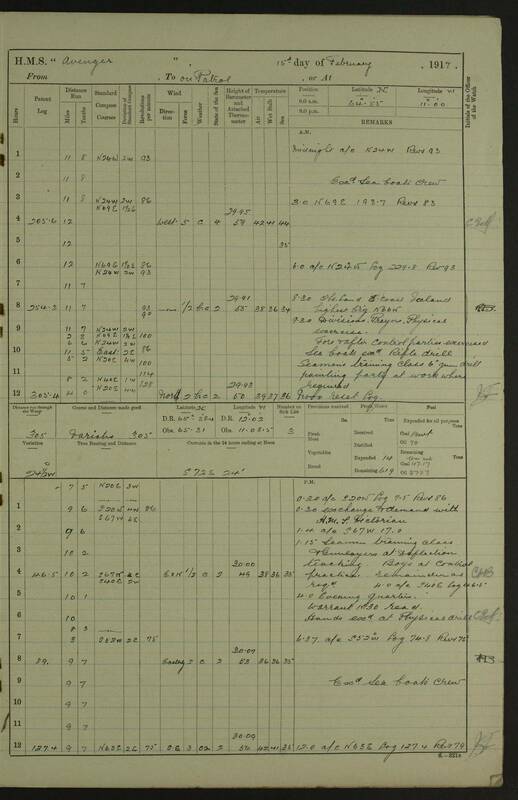 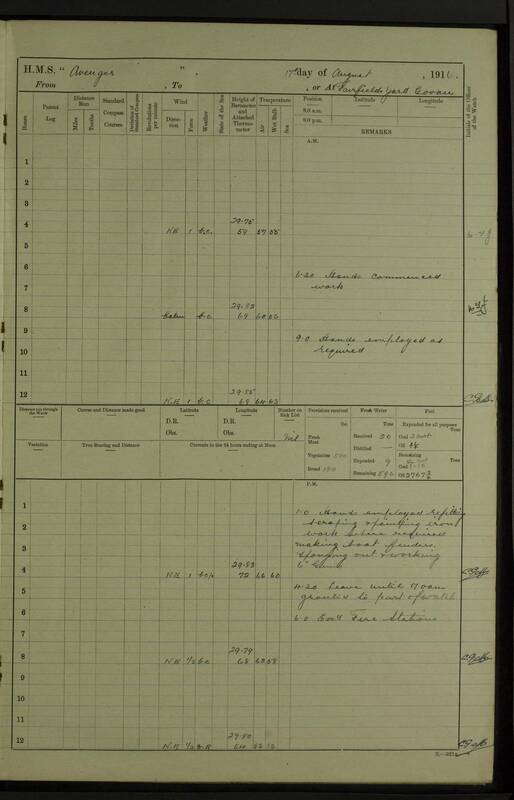 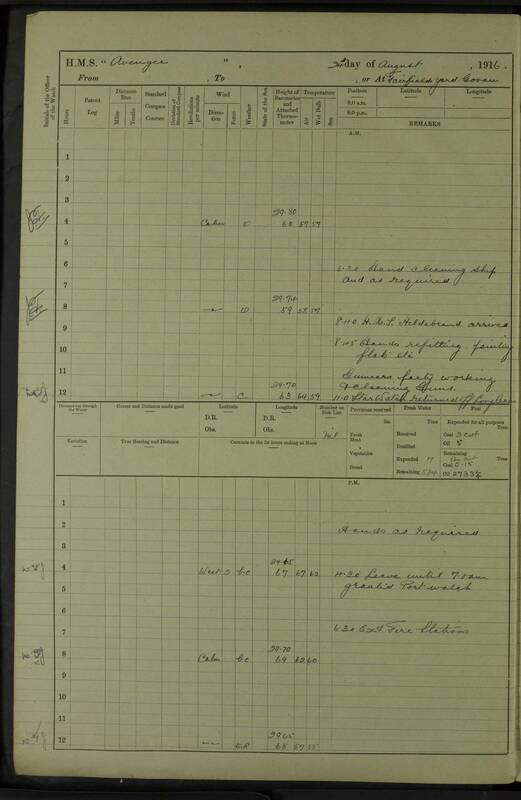 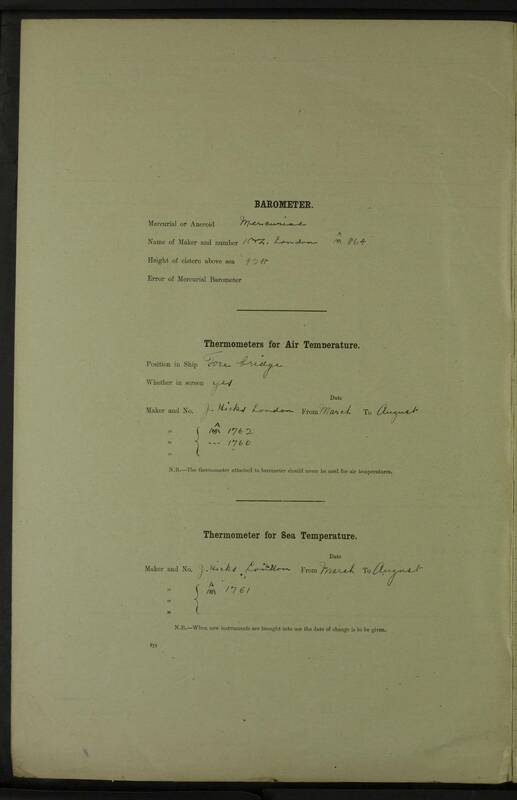 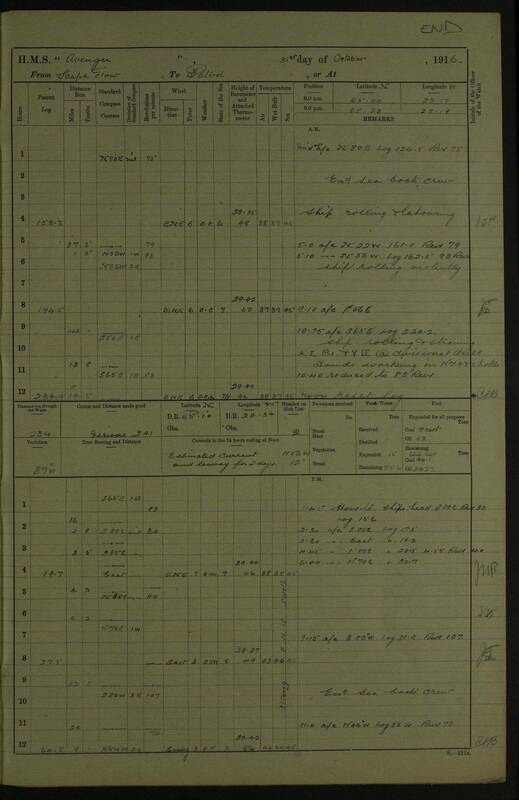 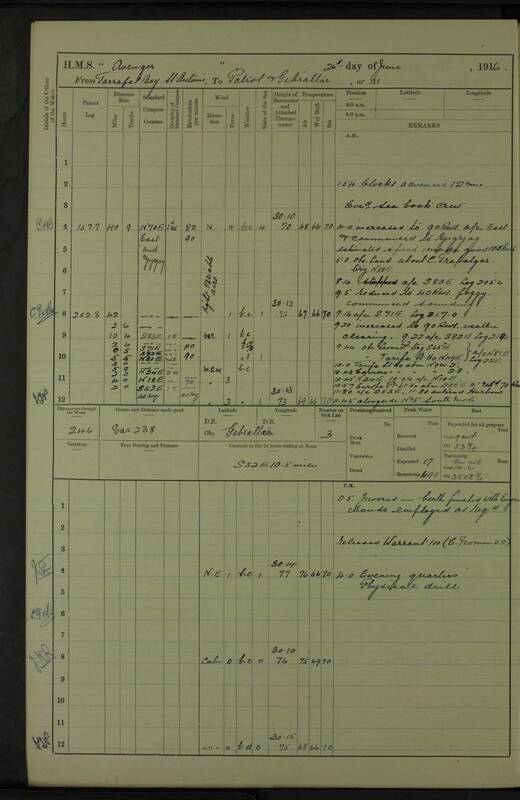 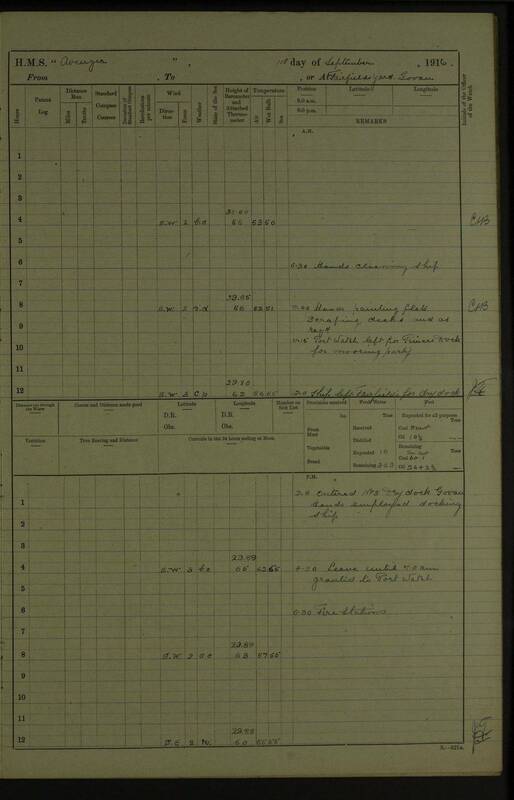 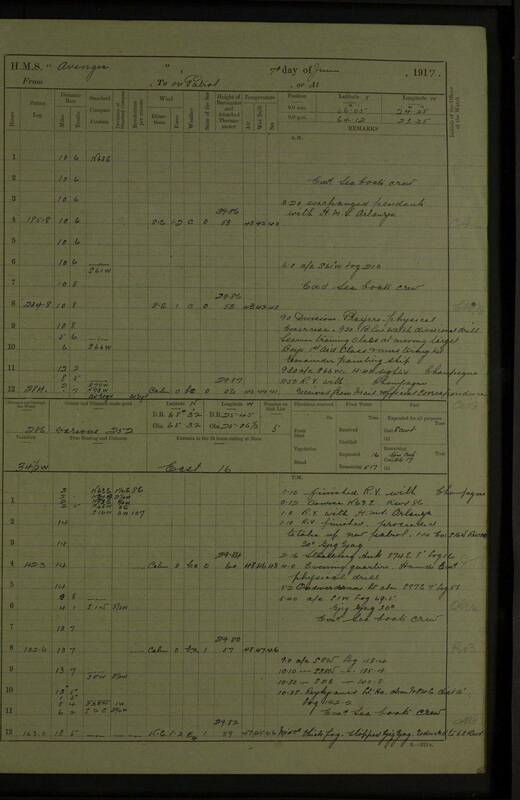 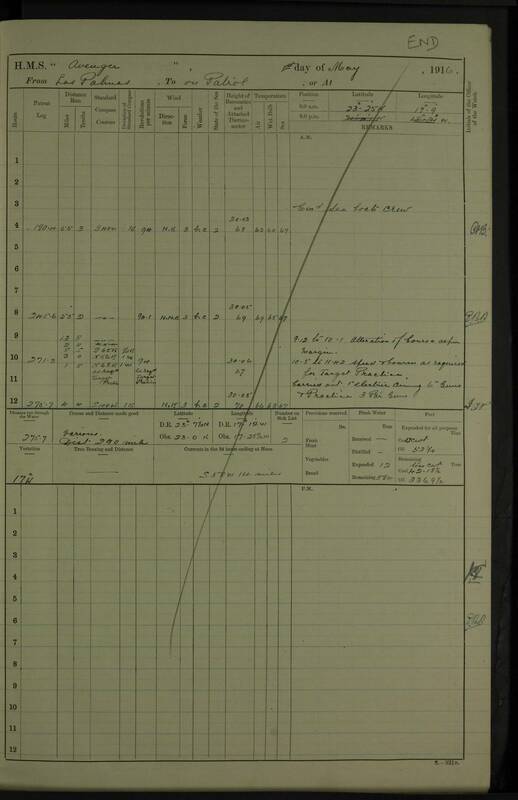 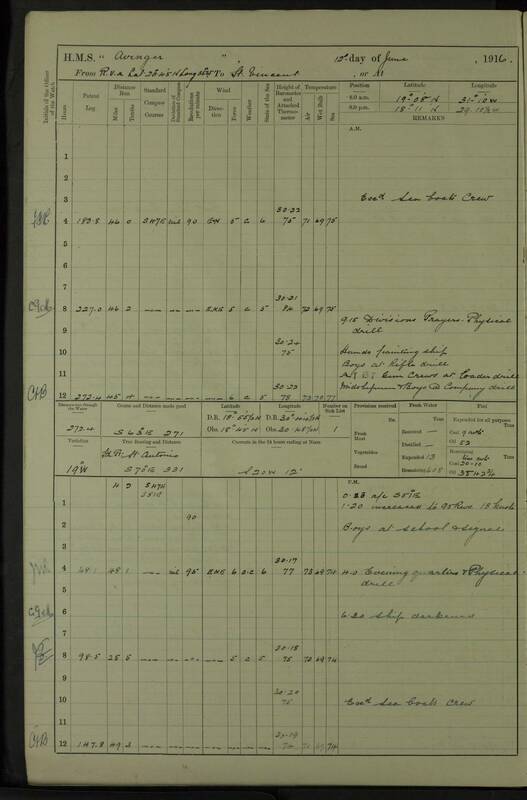 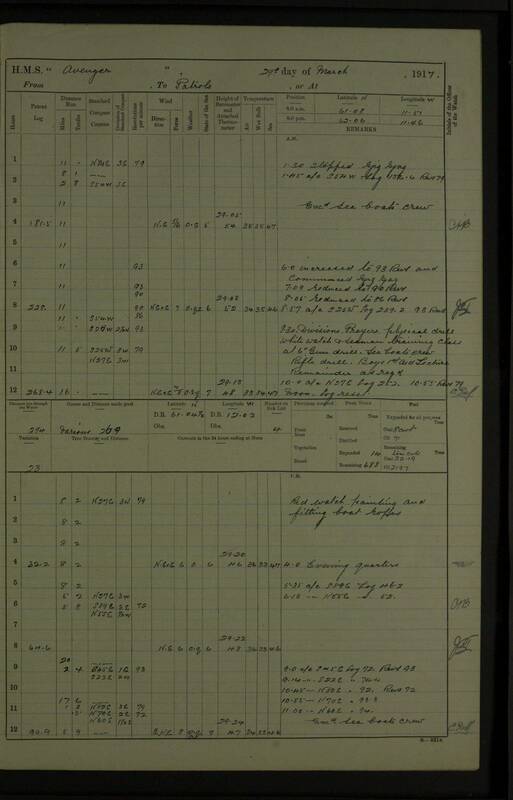 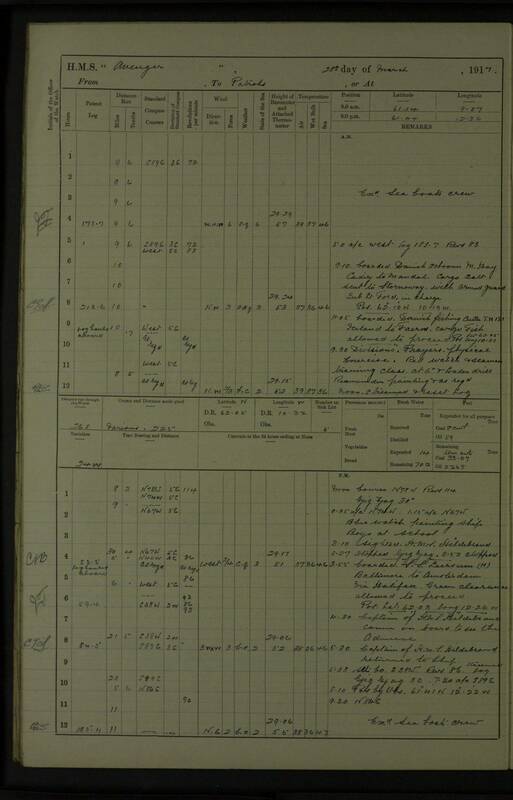 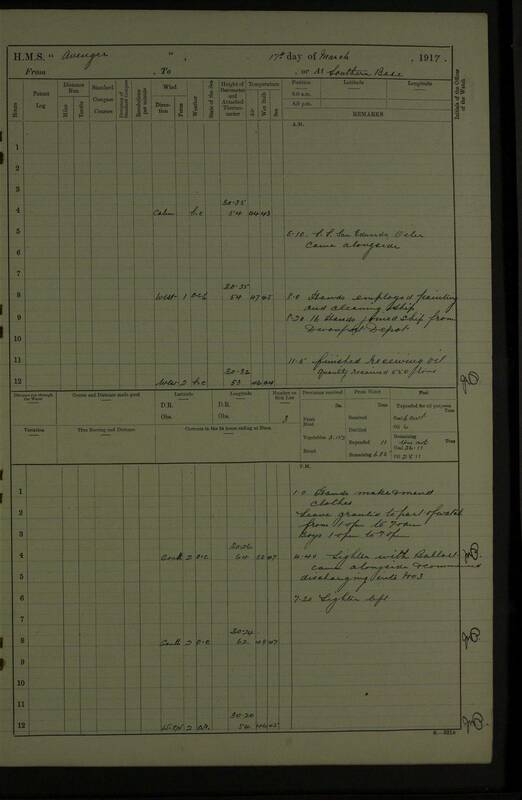 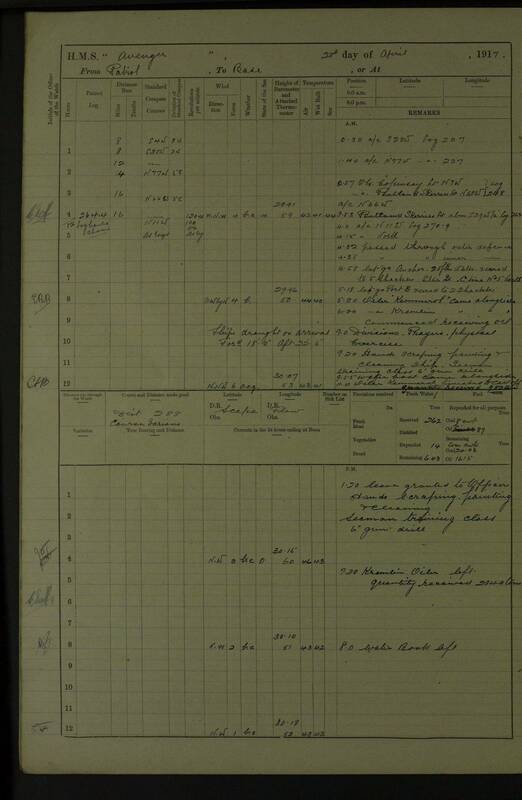 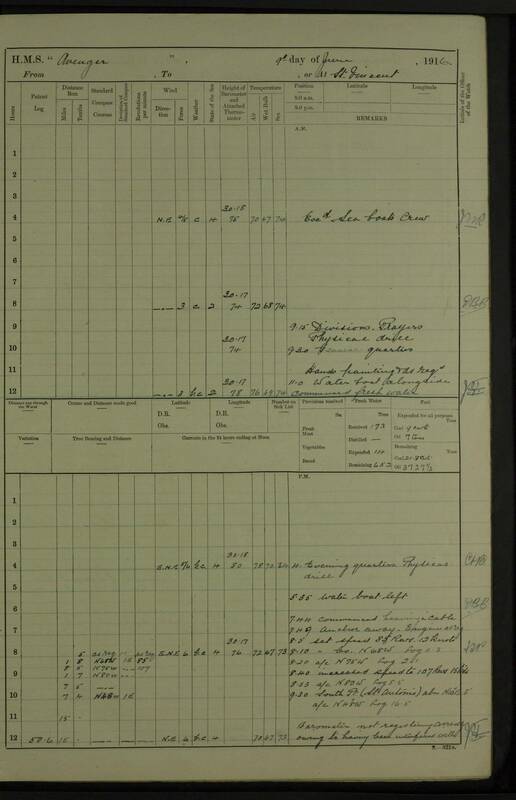 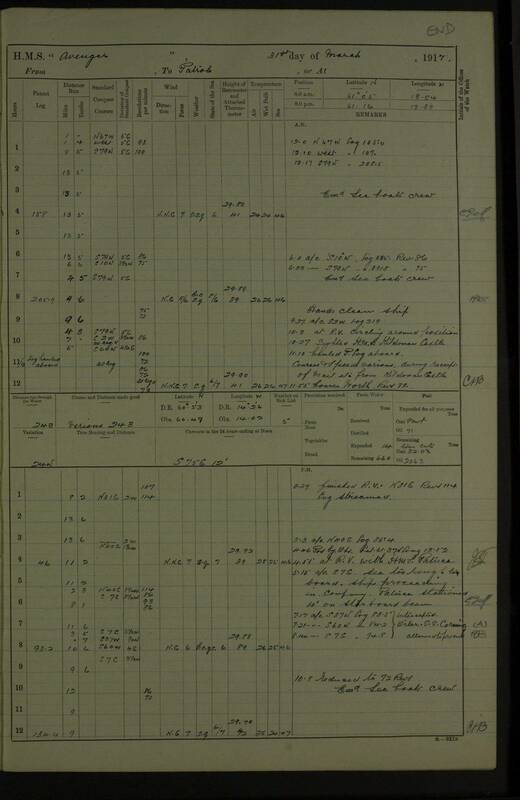 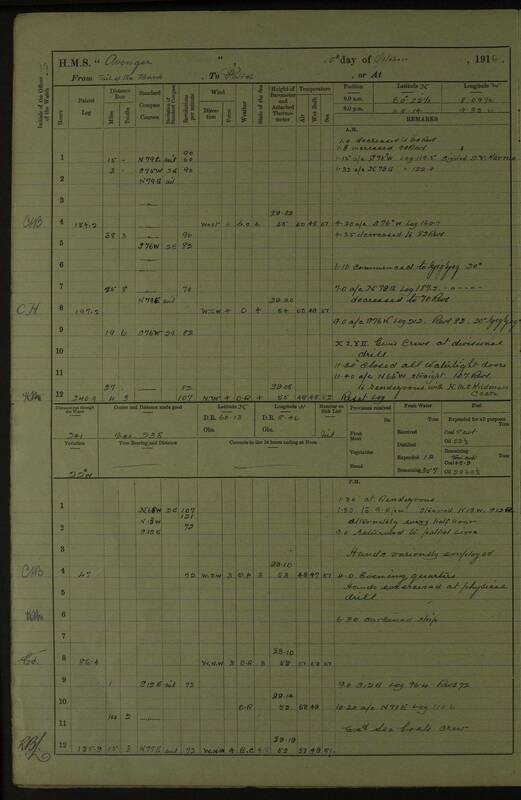 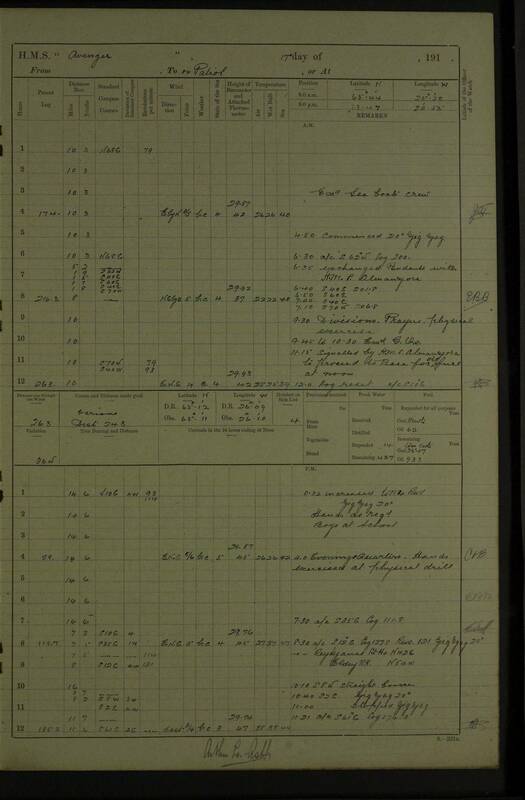 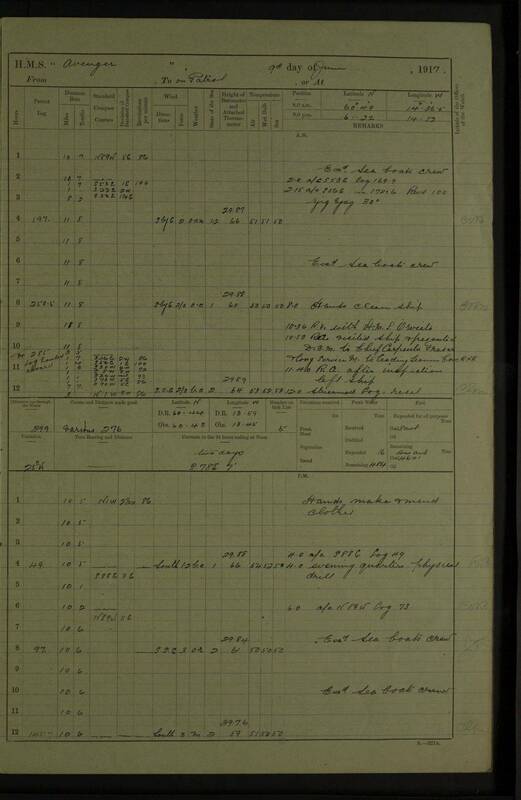 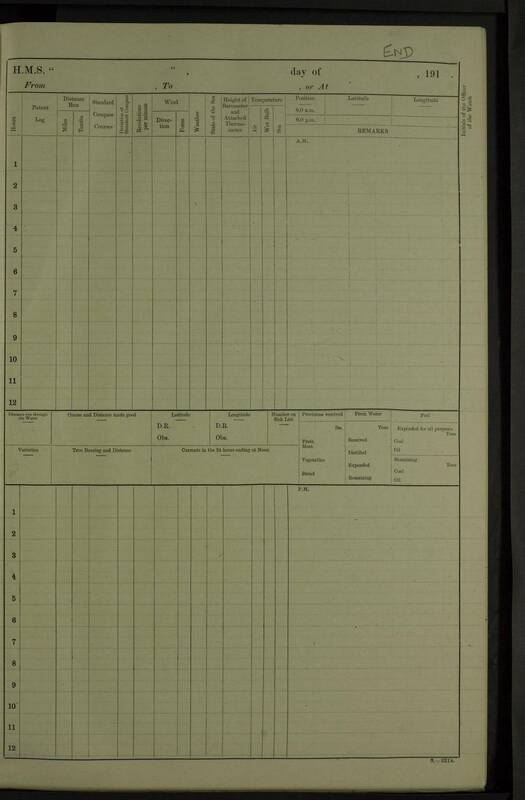 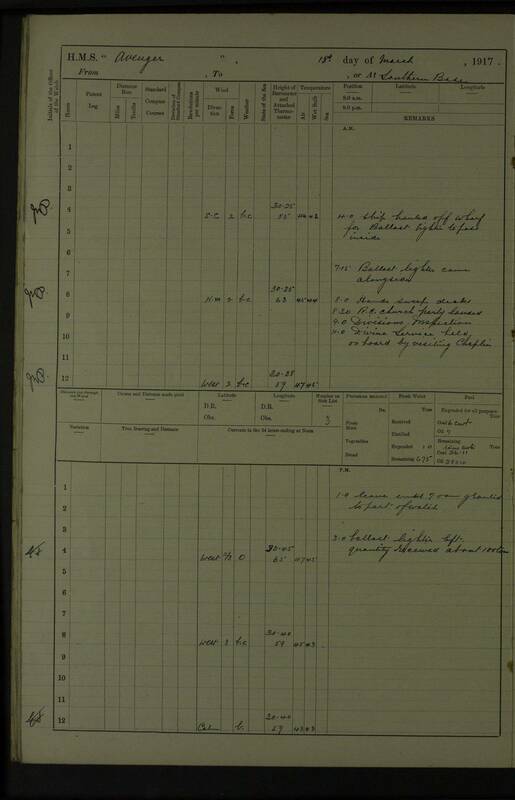 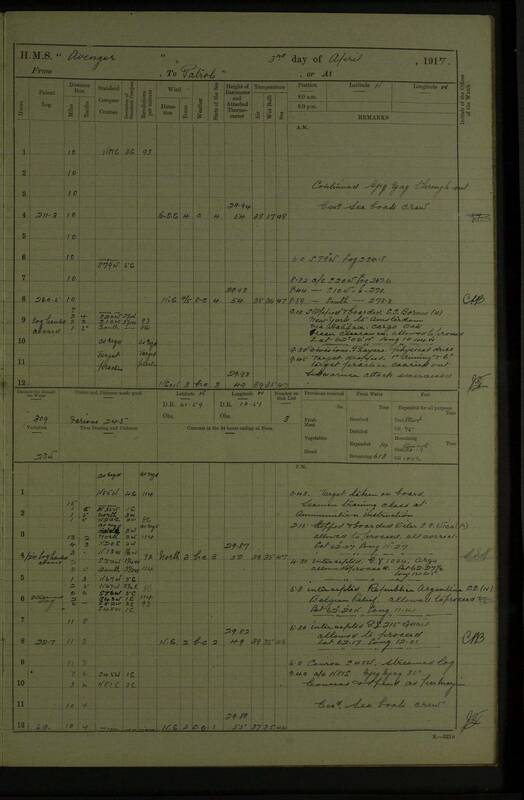 6.30pm a/c S41E log63.5; steering erratic owing to unsteadiness of after compass, being affected by tiller. 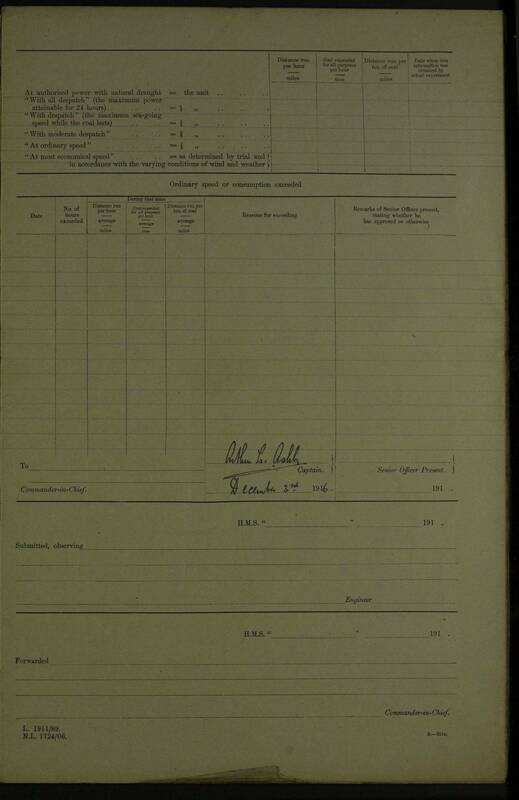 9.40am Arrived off Bar Lt. v.
Hands employed painting, receiving stores, etc. 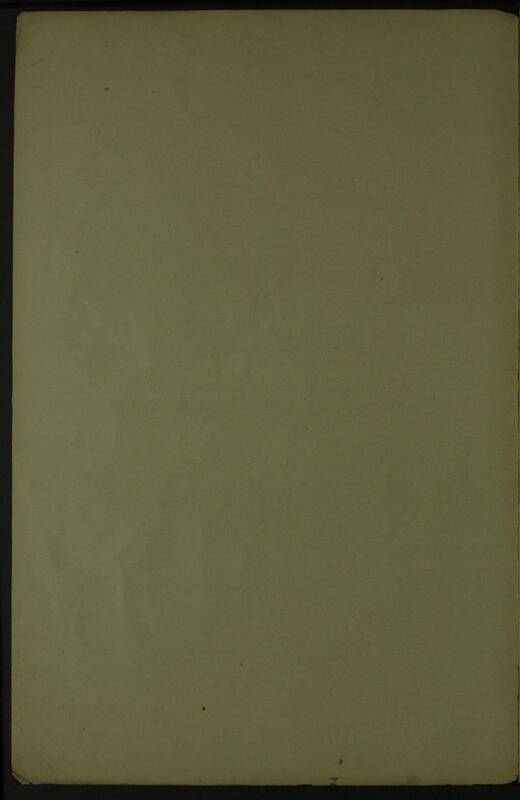 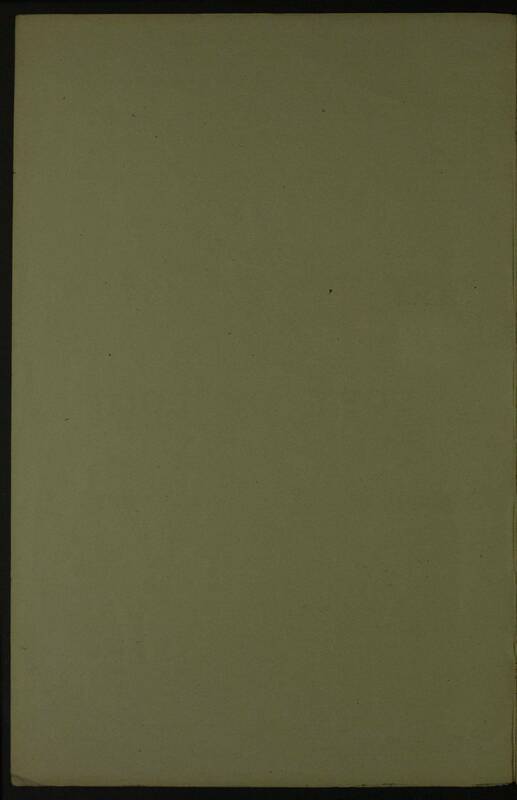 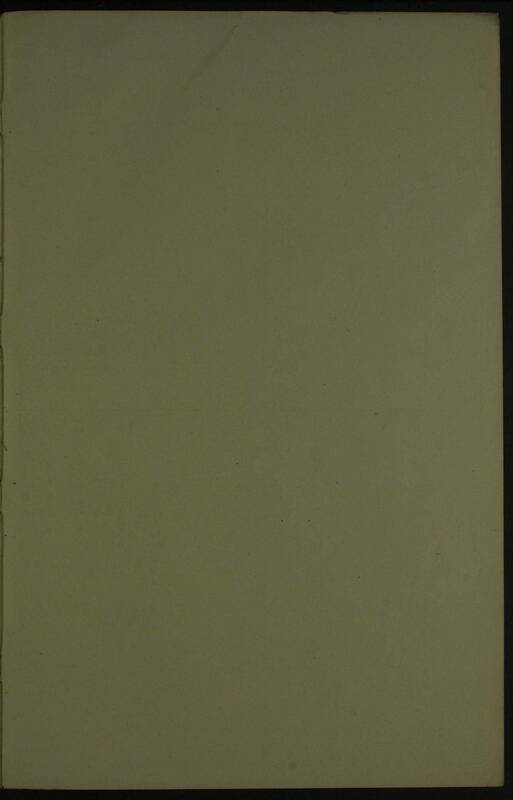 Hands employed painting ship, receiving stores, provisions, etc. 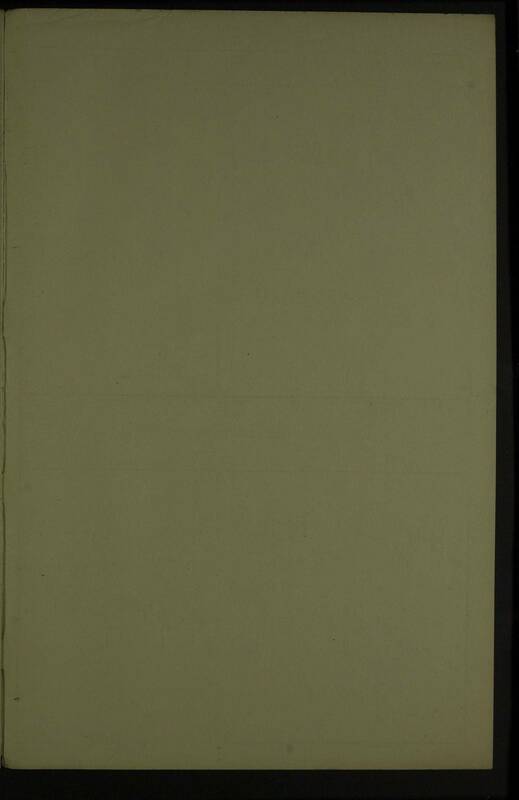 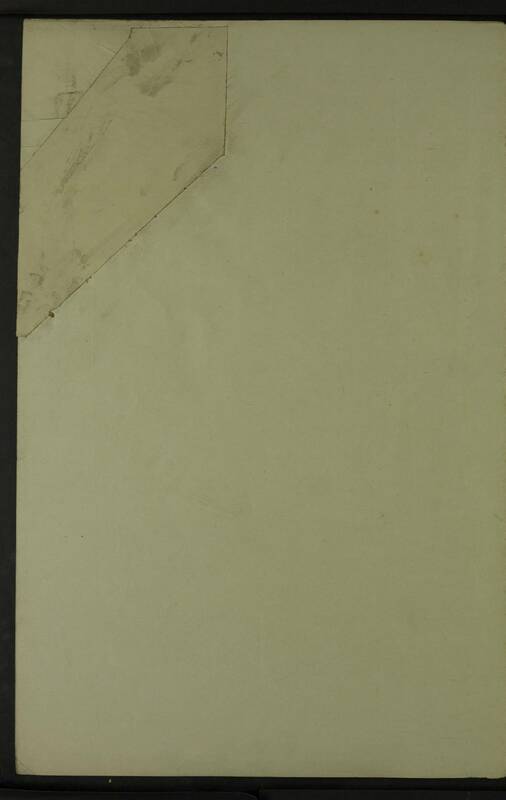 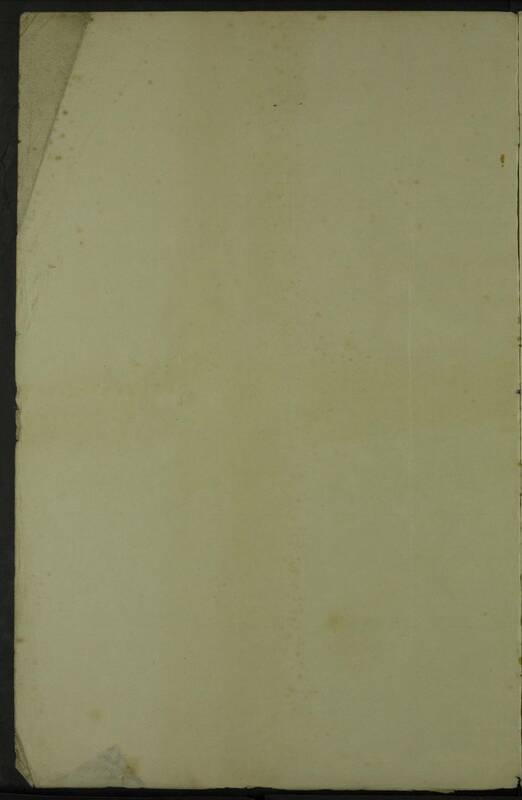 4.20pm A quantity of mails received for ship of the 10th c.s. 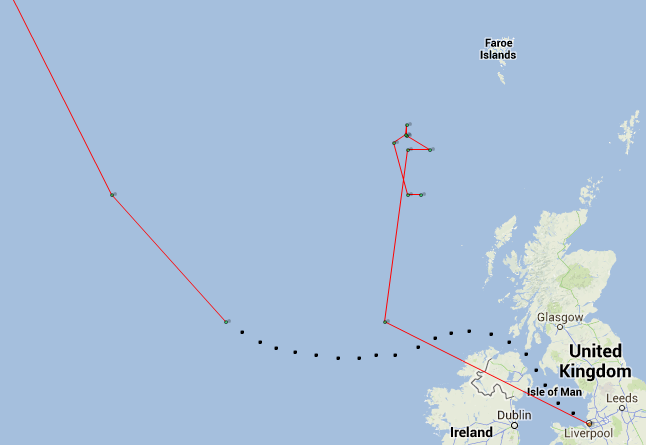 3.0am Commenced zigzag 20° log 161. 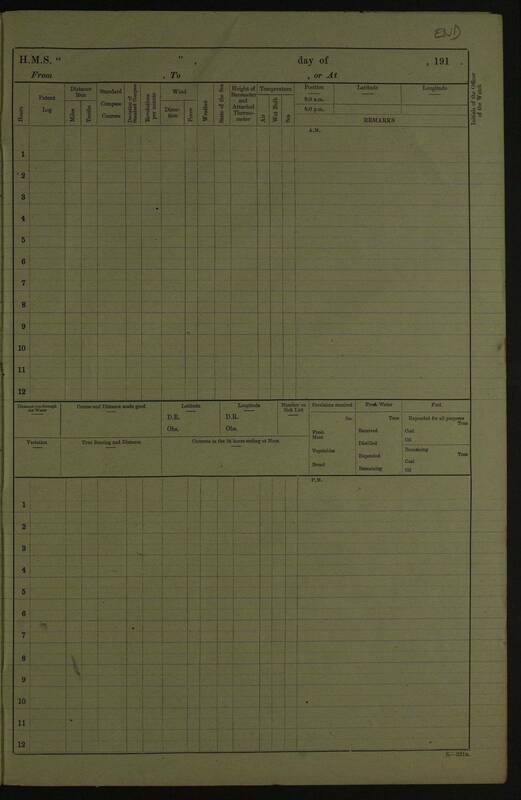 9.40 to 11.0pm Log not registering correctly. 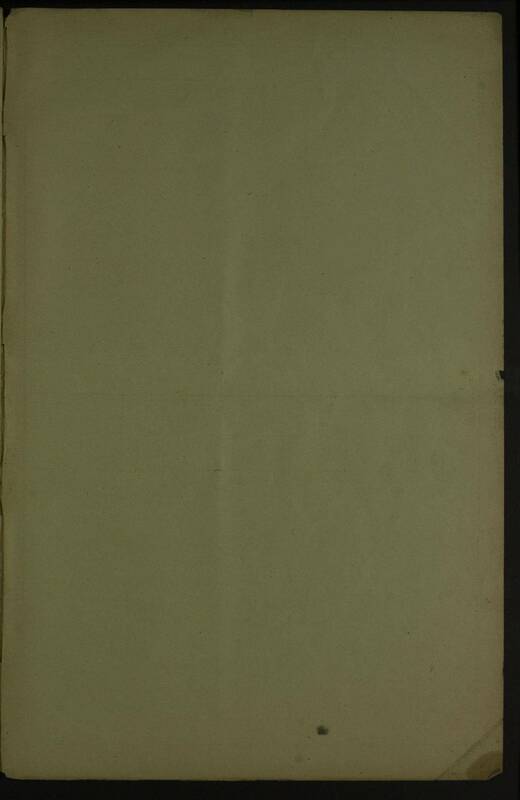 5.45pm R.V. 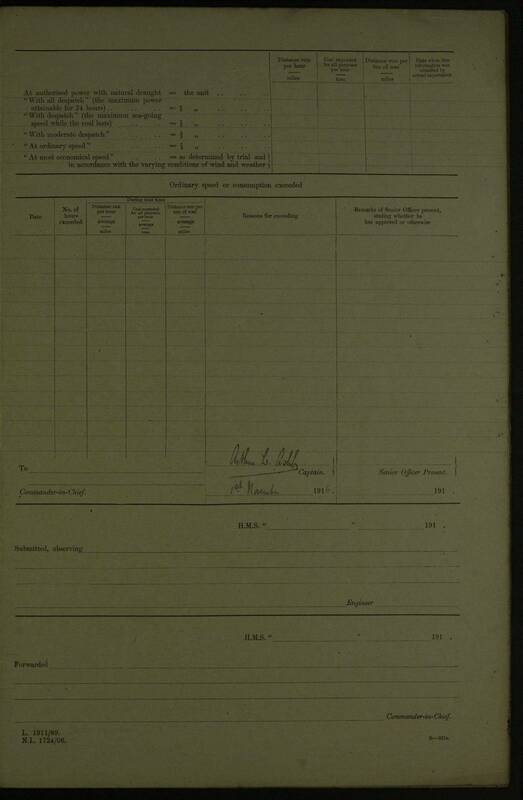 with HMS “Armadale Castle” and delivered mails, etc. 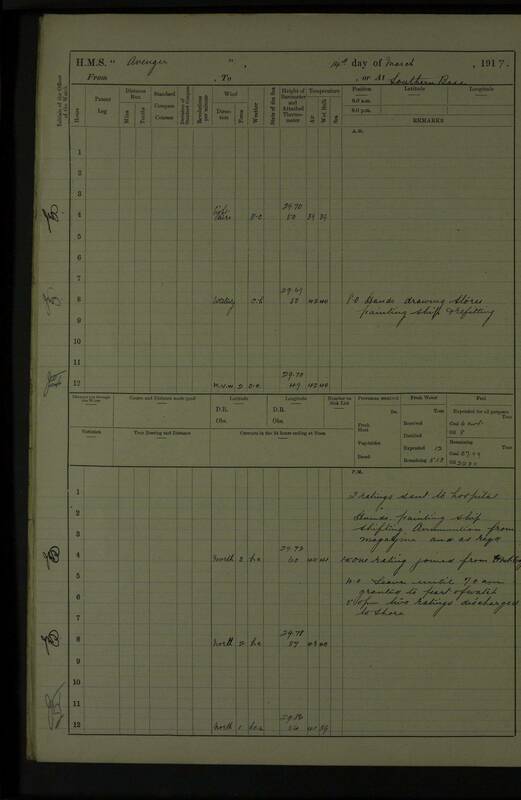 9.15pm R.V. 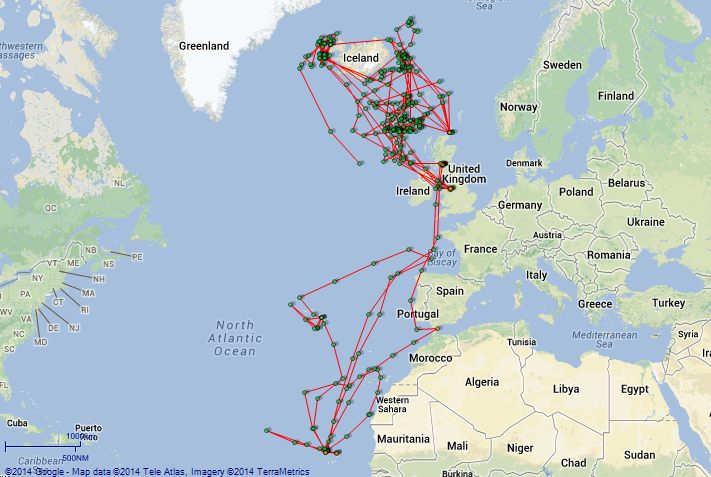 with HMS “Arlanza” and delivered mails, etc. 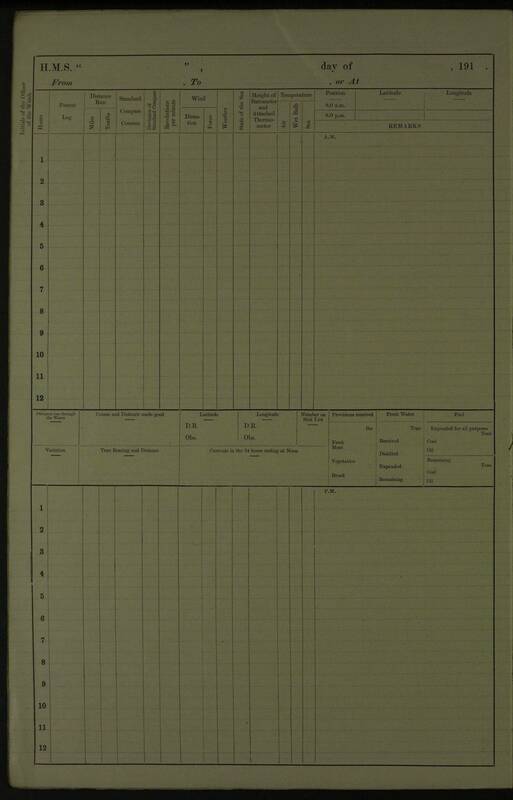 9.15 to 10.10am Ex.d G. Q.
Pos Lat 66 04N Long 24 25W. 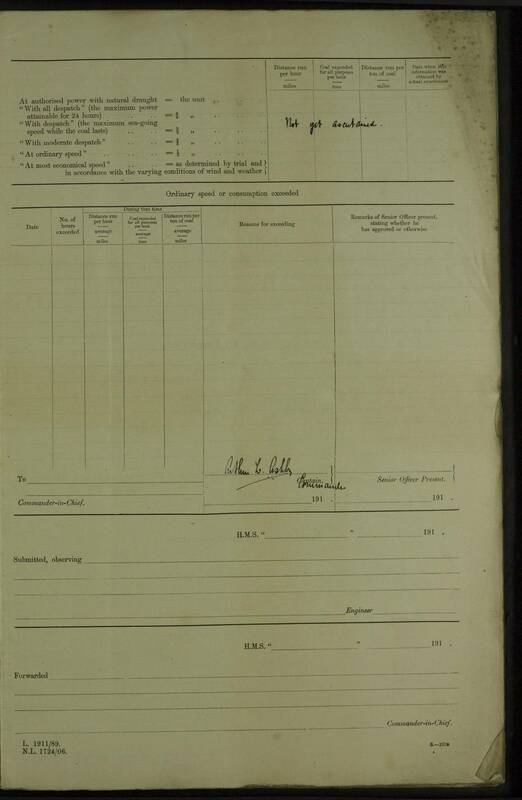 - Overbalanced whilst working in a boat at davits and was drowned before he could be rescued. 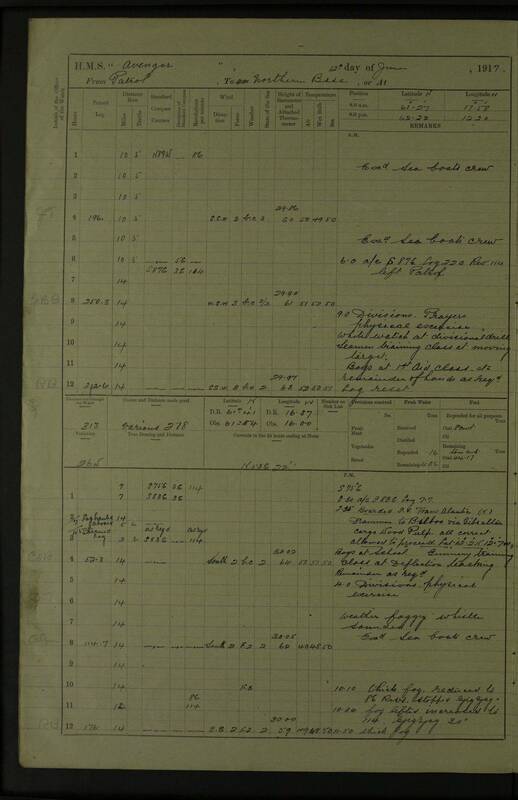 Body not recovered. 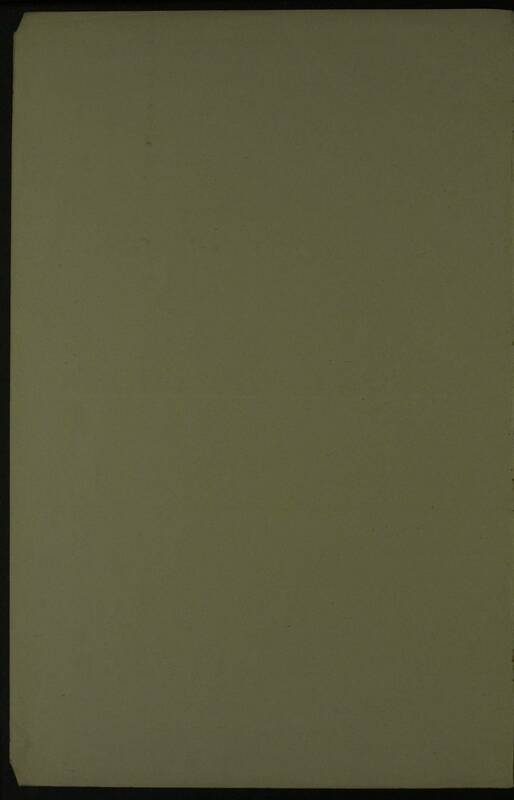 White watch cleaning paint work Sea boats crew overhauling boat gear.